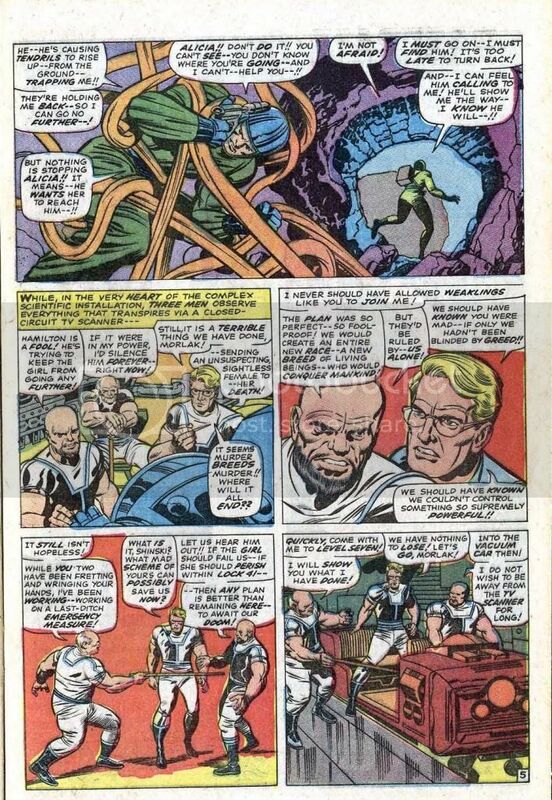 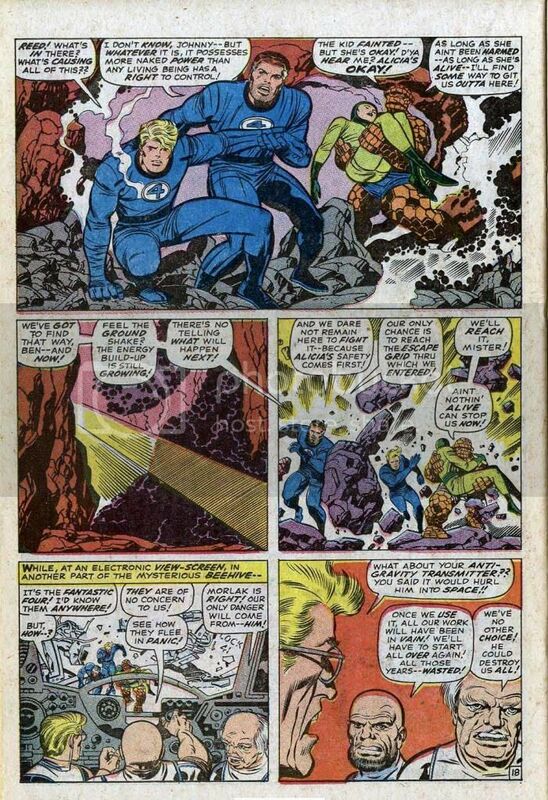 Fantastic Four #167 – Adam is born as HIM. 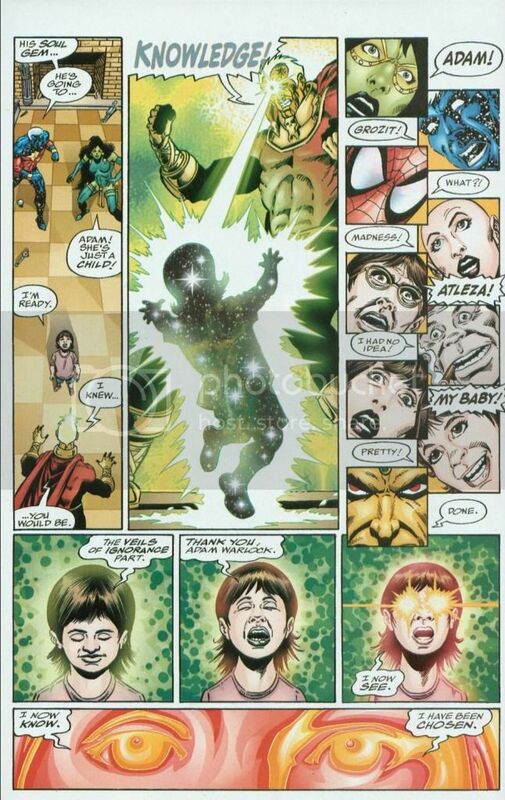 A powerful being, with a childlike mind. 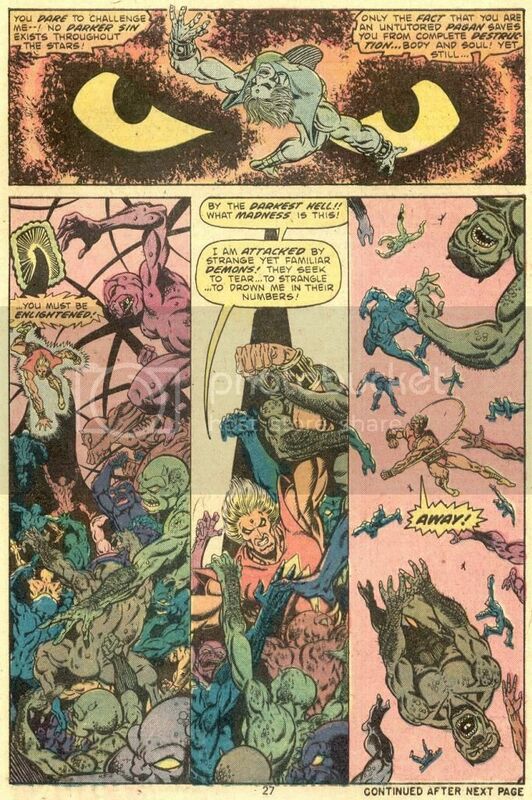 Marvel Premiere #1 - Adam's power level decreased since he left his regenerative cocoon prematurely to help the High Evolutionary. 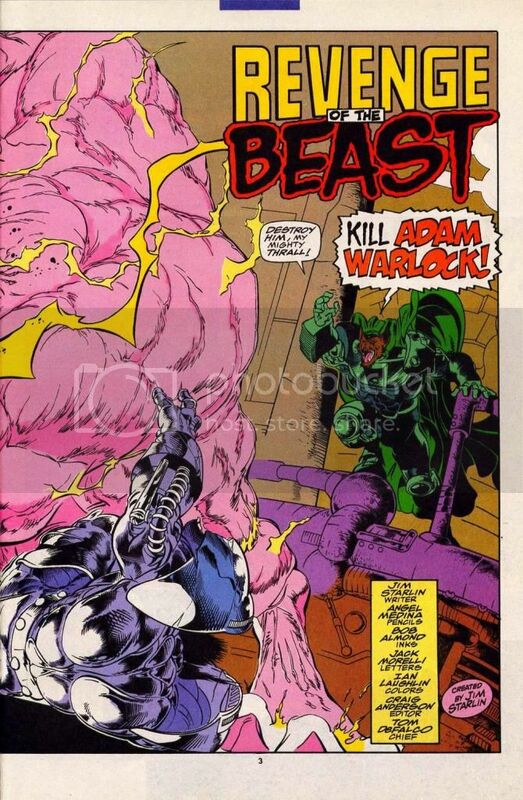 Arguably, Warlock's weakest incarnation in both strength and power. 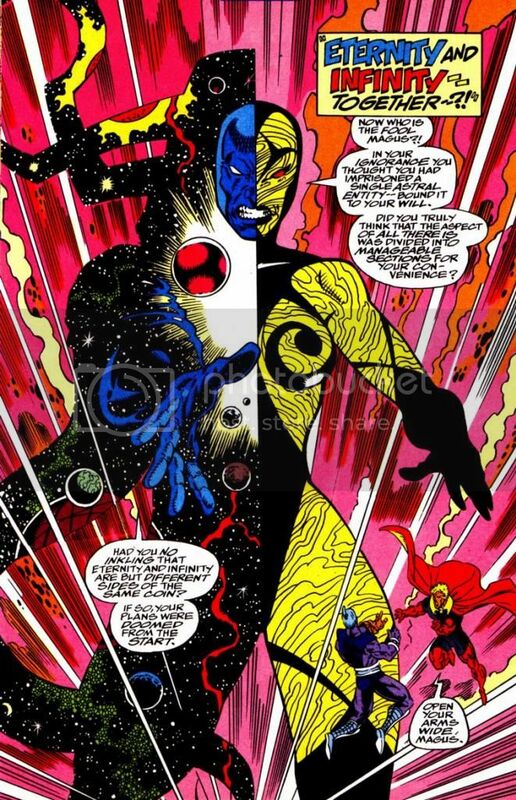 Refers to himself as a mortal and a man, instead of the godlike being he was before. 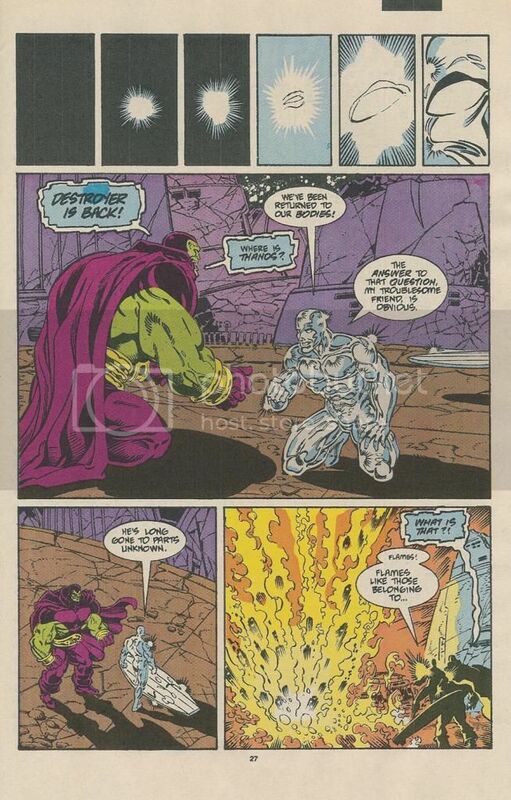 Incredible Hulk #168 - Becomes explicitly more powerful after resurrecting himself for the first time. 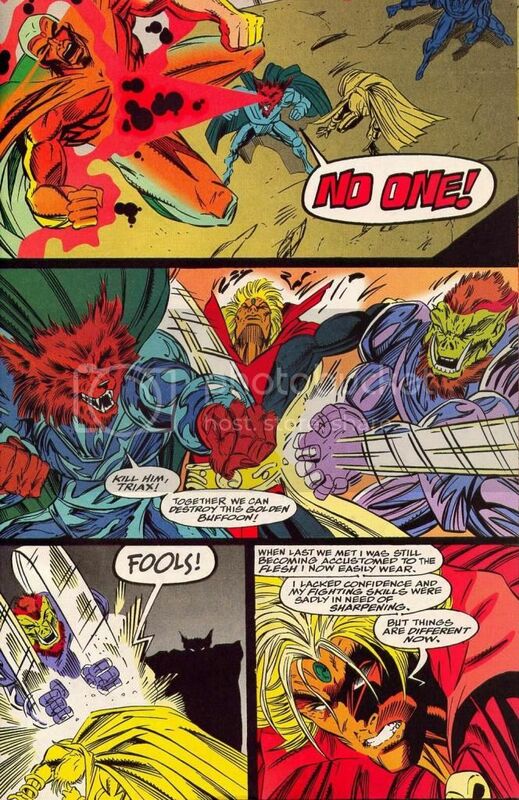 Man-Beast notes that Warlock was never that powerful before. 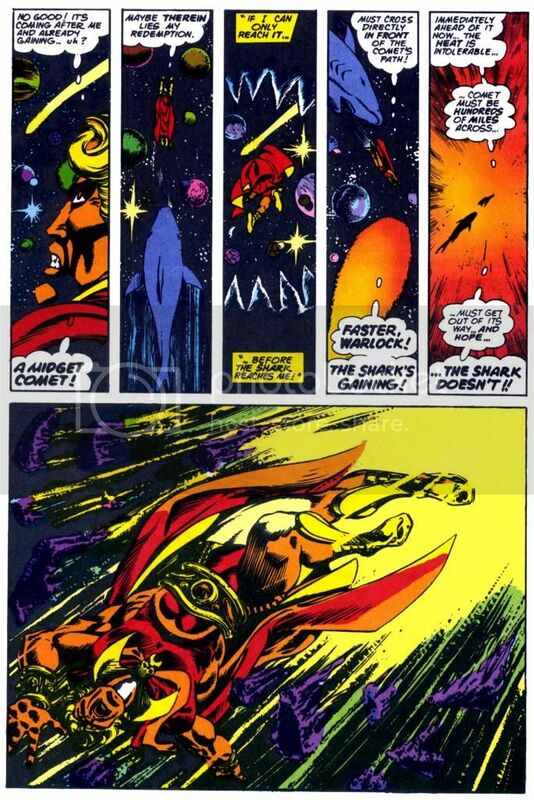 Warlock: "Before I was a man. 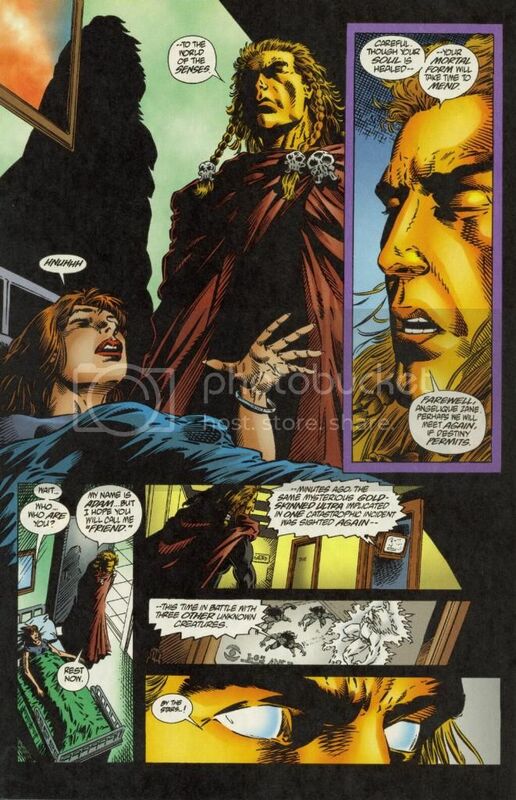 Now I am far more than a man." 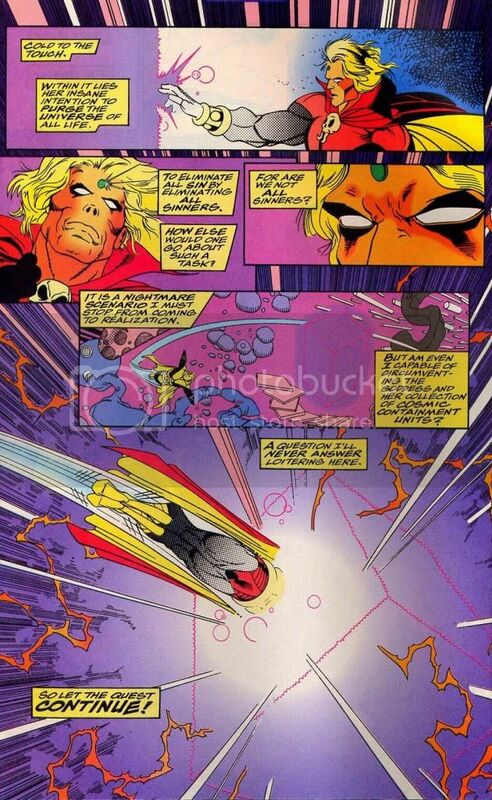 Also learns to tap into far more power of the soul gem. 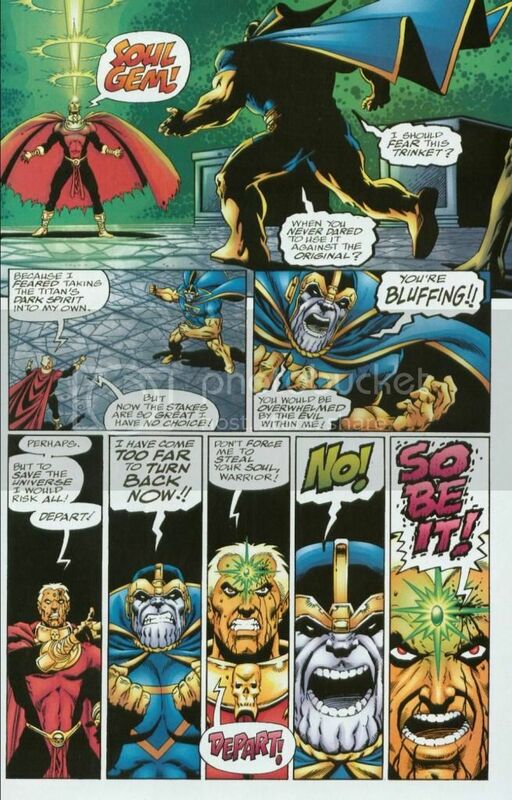 Infinity Gauntlet #1 - Creates a new, stronger body for himself after resurrection. 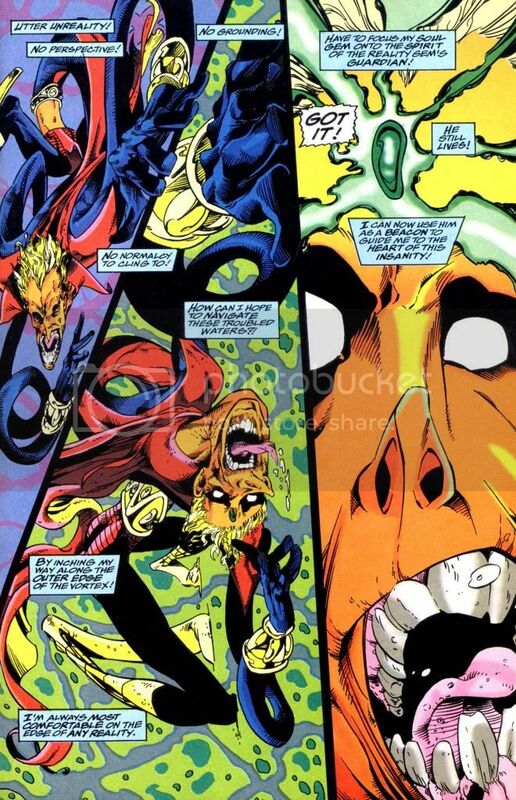 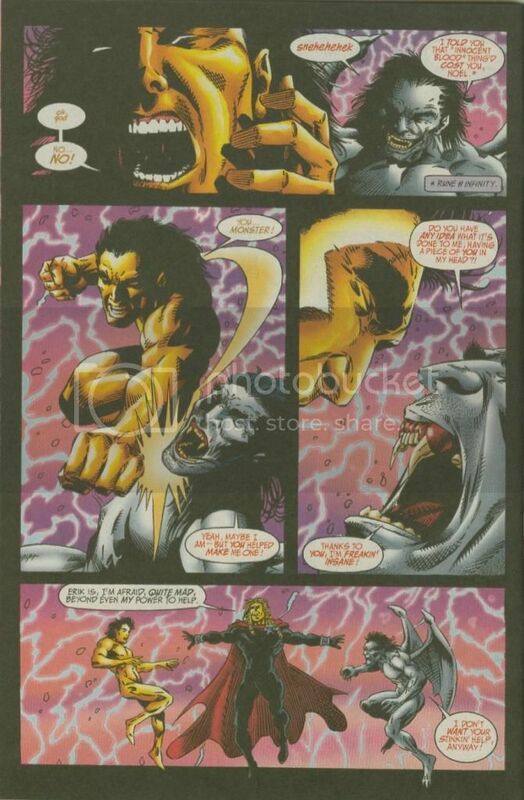 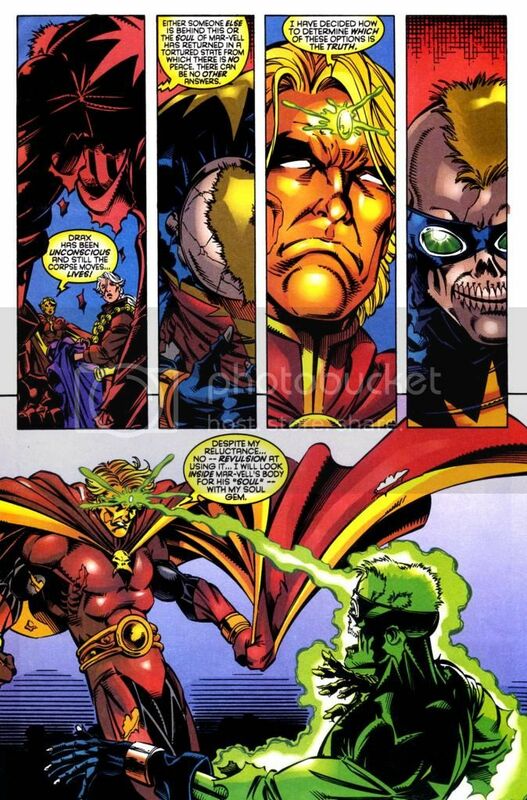 Ultraverse Unlimited #1/Warlock v2 #1 - Becomes more adept at and gains new abilities of soul manipulation, even without the soul gem. 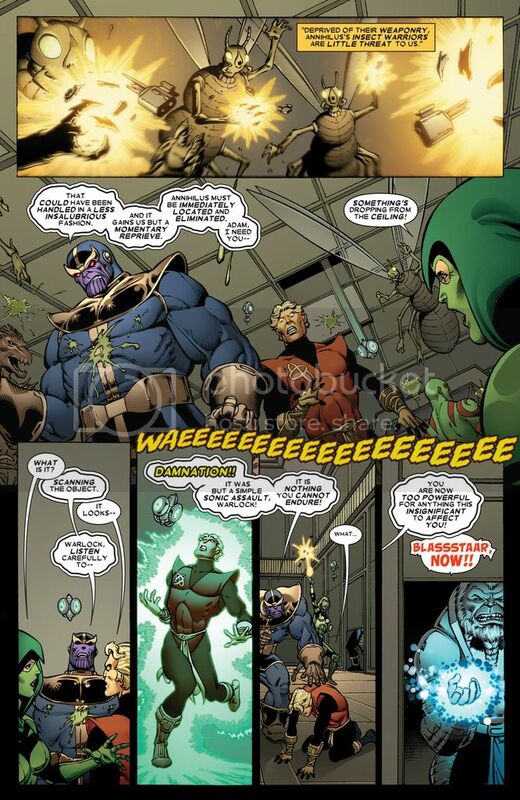 Also is noted to be physically stronger than ever by Gamora and Pip. 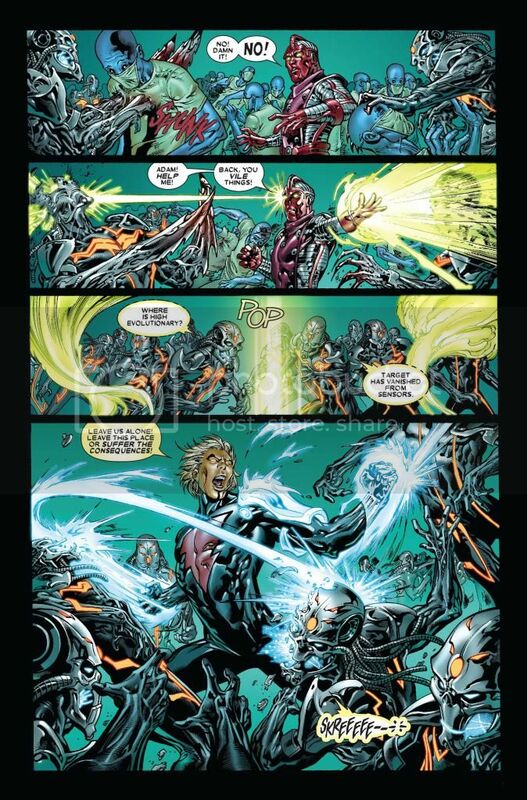 Annihilation: Conquest #1 - Gains the ability to control quantum magic. 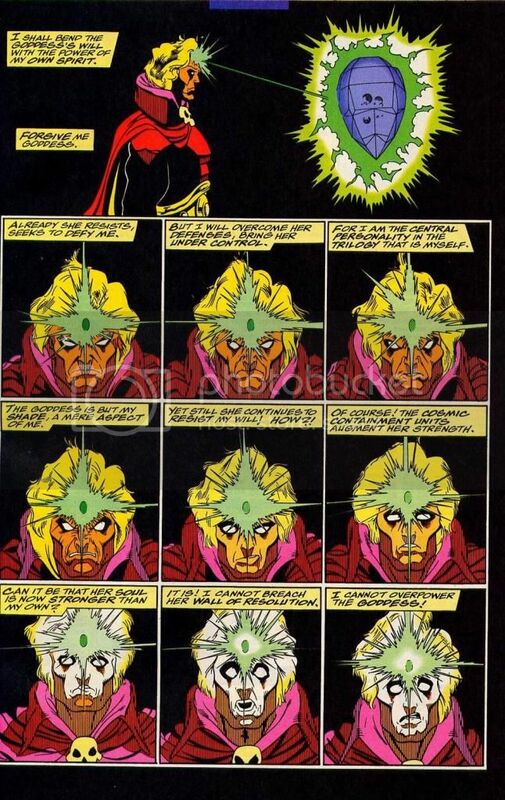 Also becomes more adept energy manipulation and shows further abilities to control soul and faith energy. 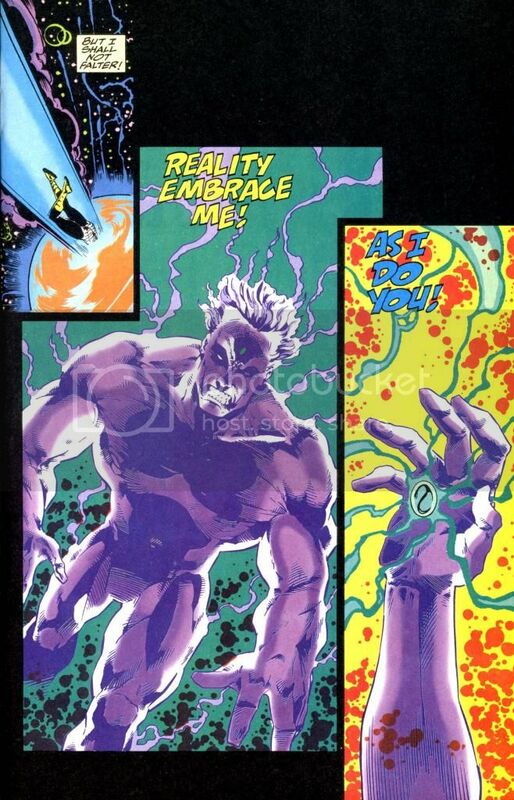 Ininity Revelation GN - Becomes more adept at energy manipulation after resurrecting himself without a cocoon. 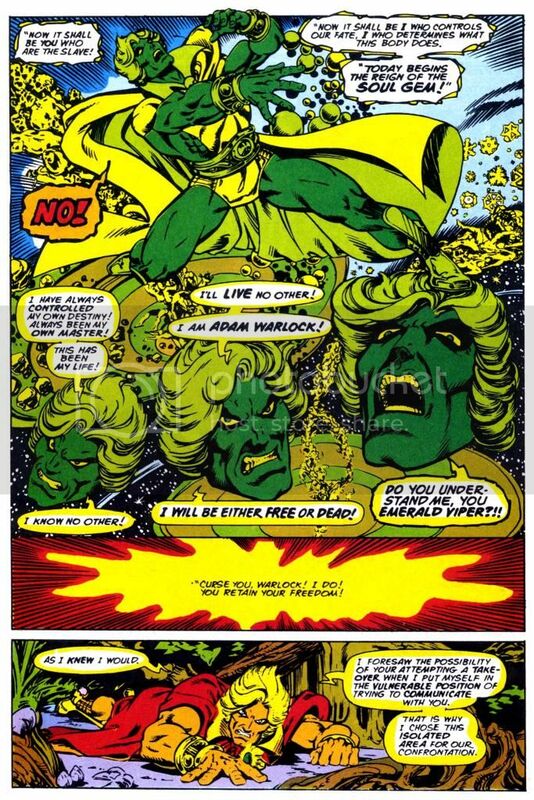 Warlock v1 #9 - In the future, after spending years in his regenerative cocoon, gains enormous power as the future Magus. 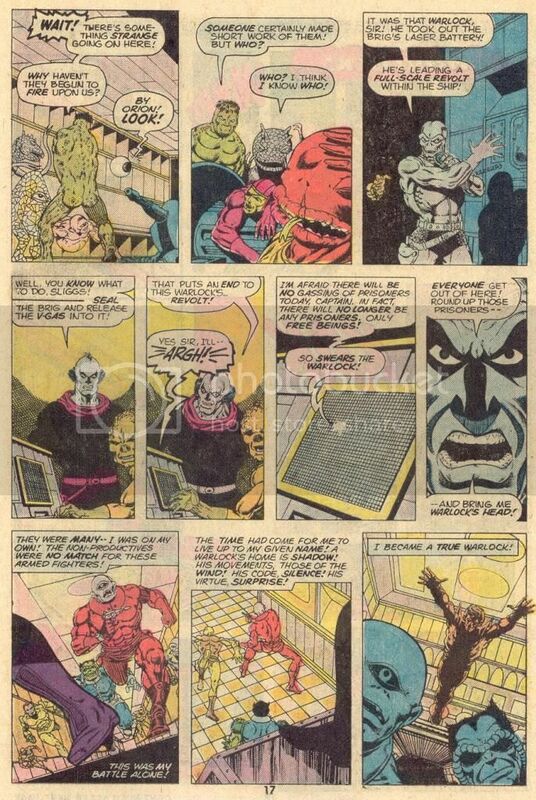 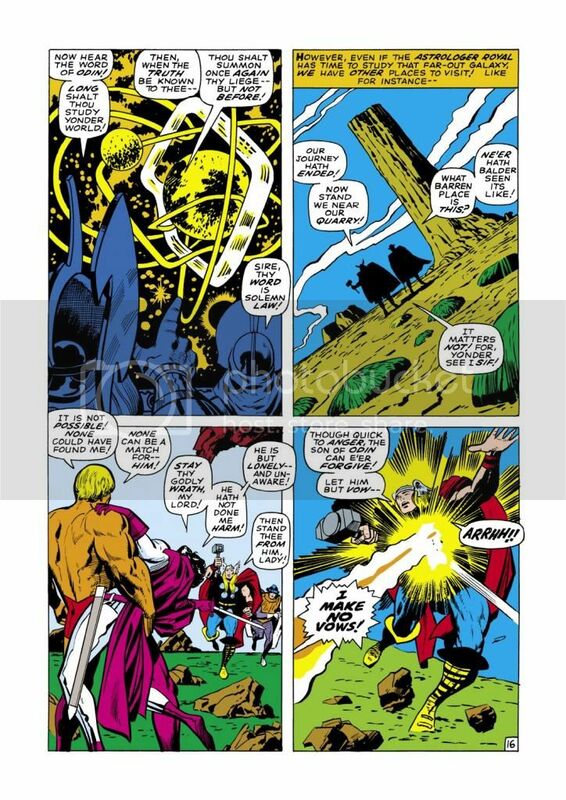 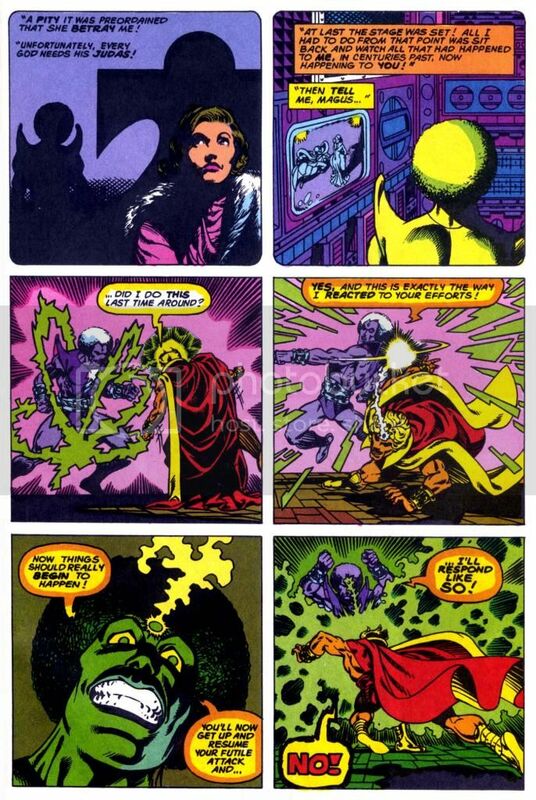 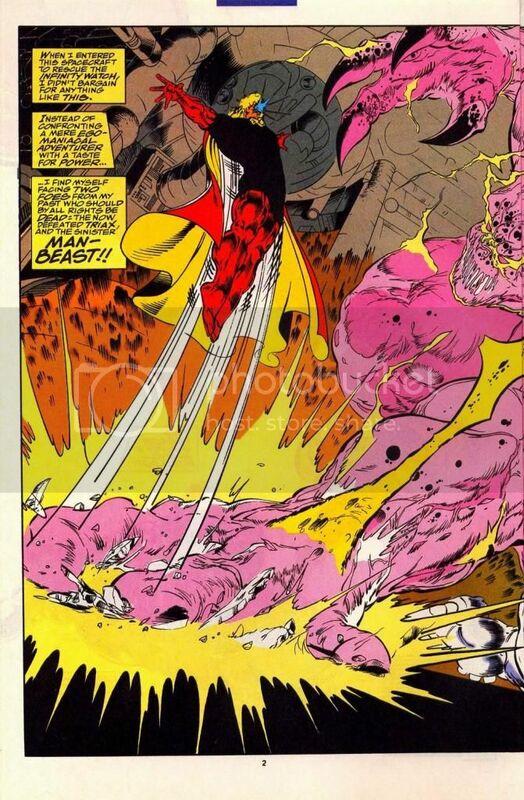 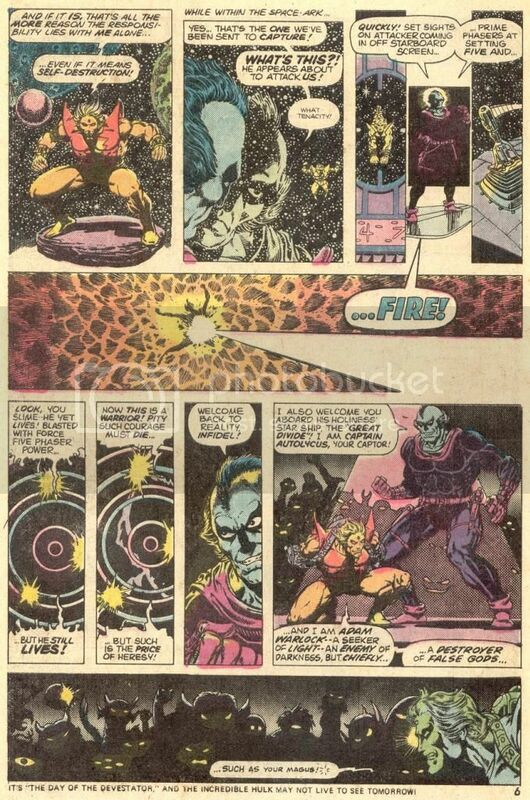 The Magus states that these are the same powers that Adam had forsaken when he left the cocoon prematurely to help the High Evolutionary back in Marvel Premiere #1. 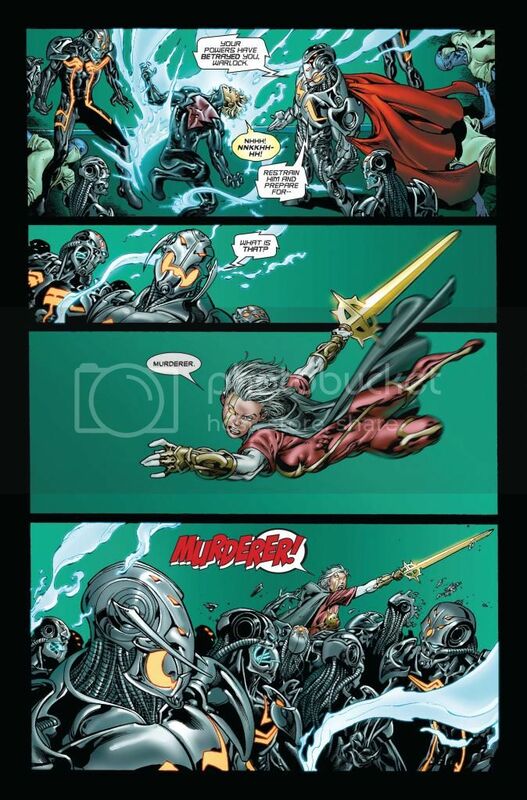 There are some showings of power of future Magus in this thread. 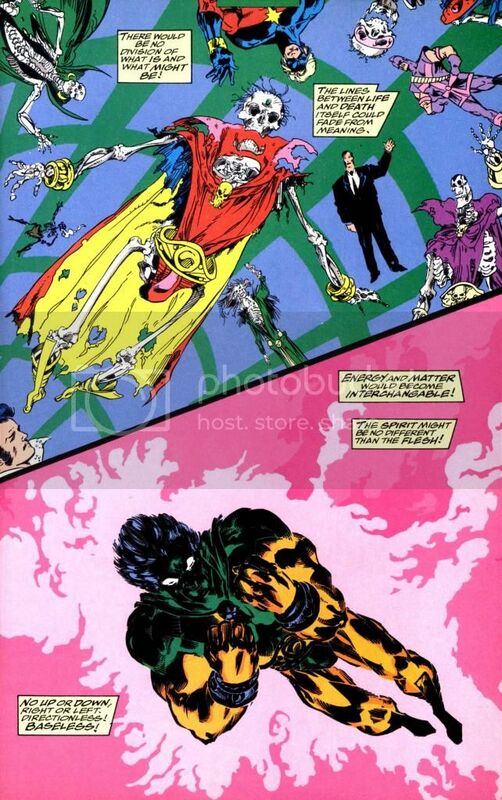 That version of Warlock is specifically noted to be the future Magus. 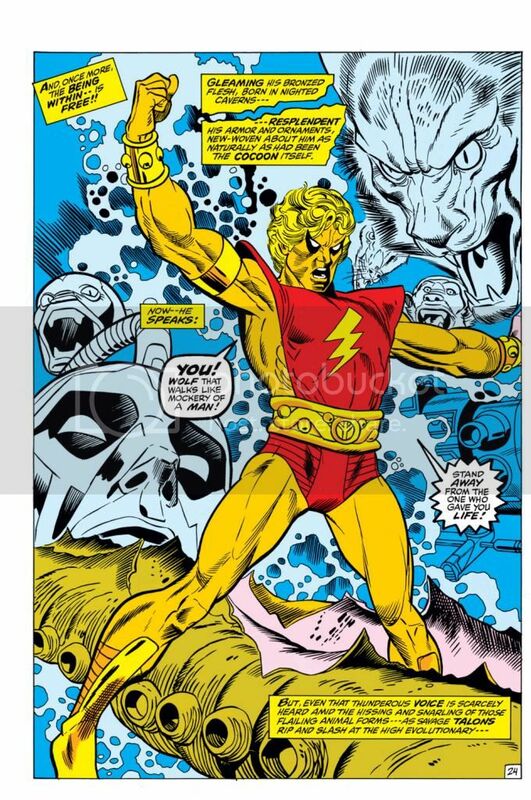 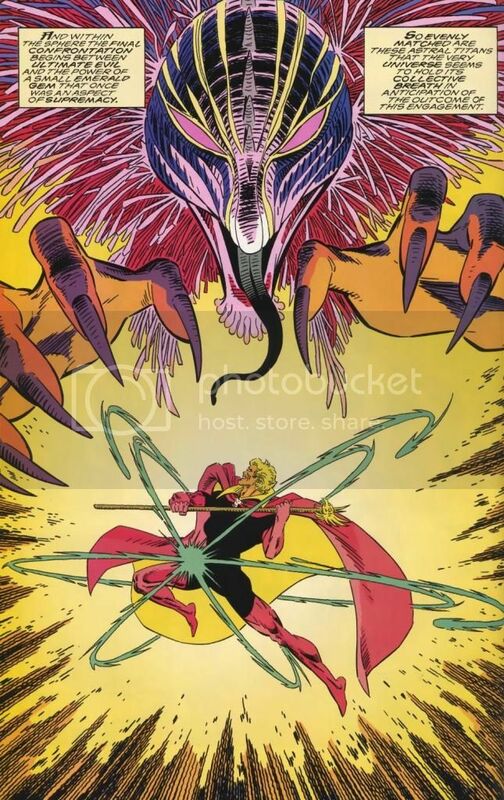 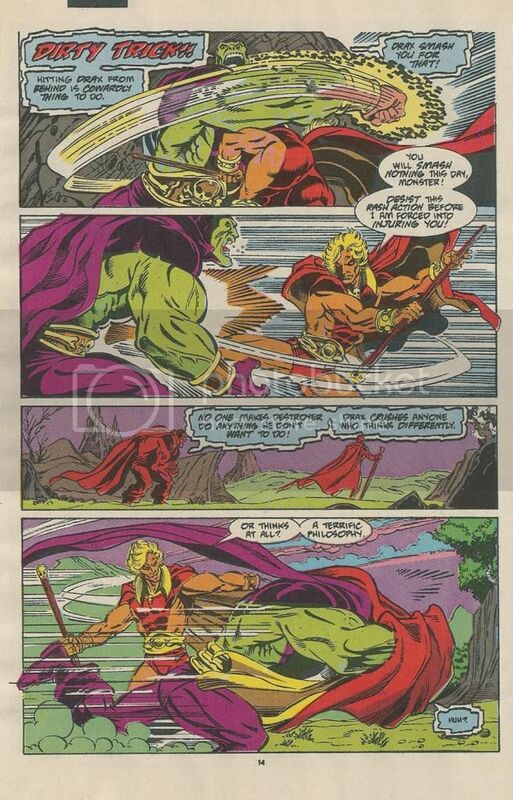 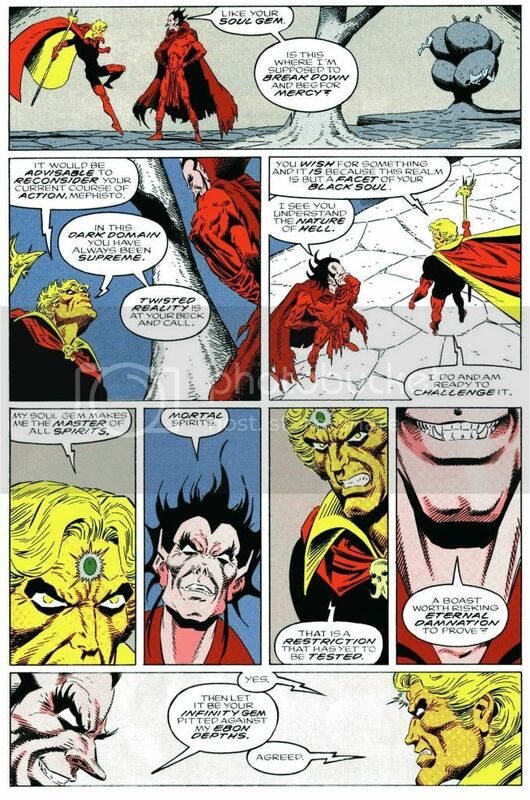 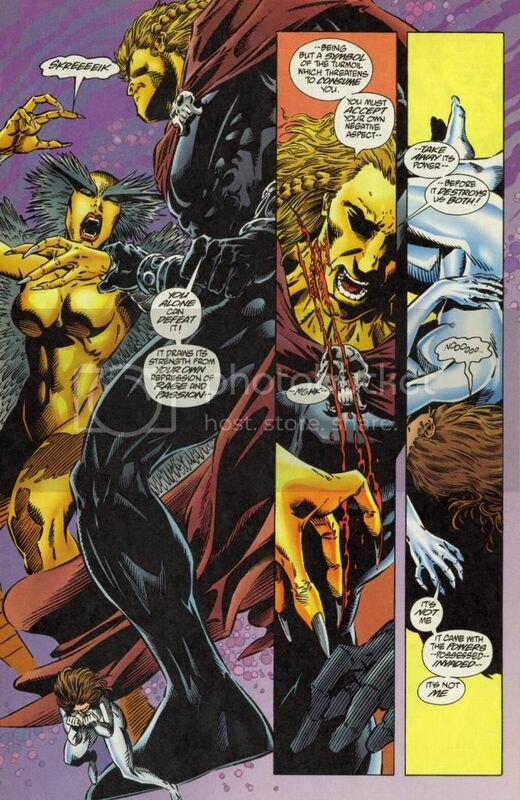 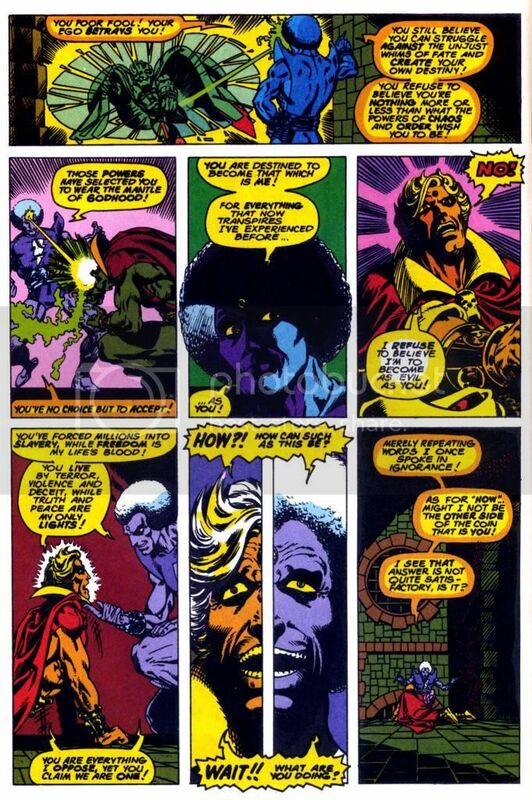 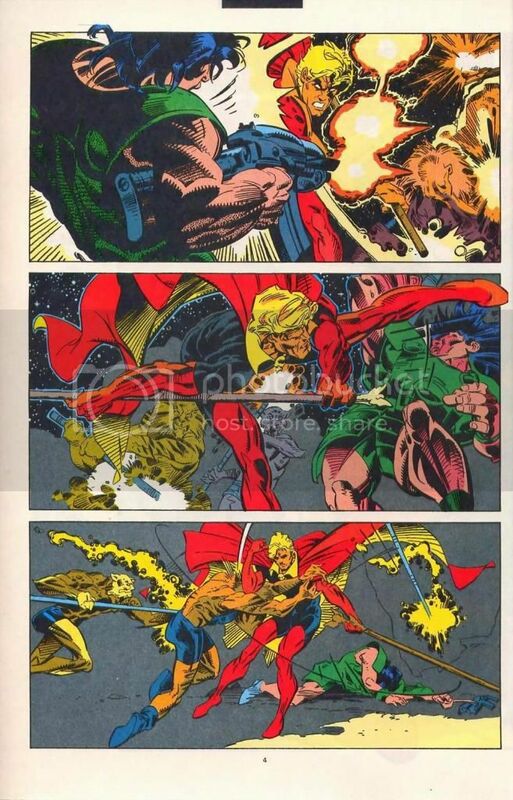 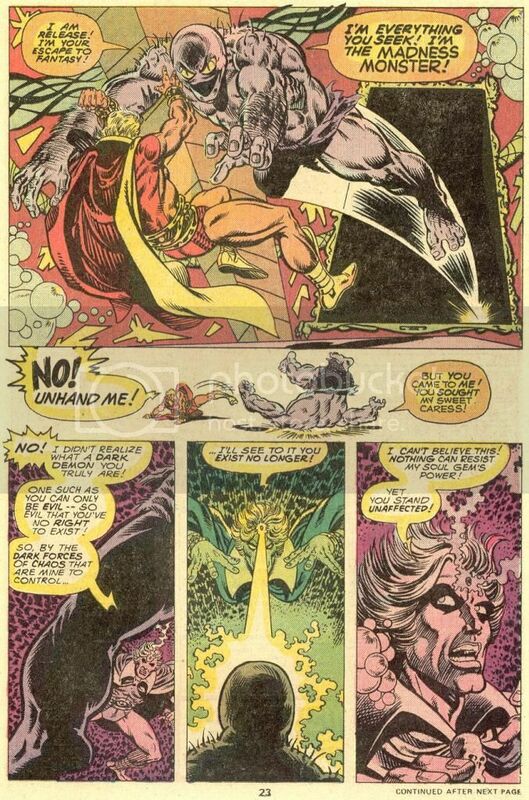 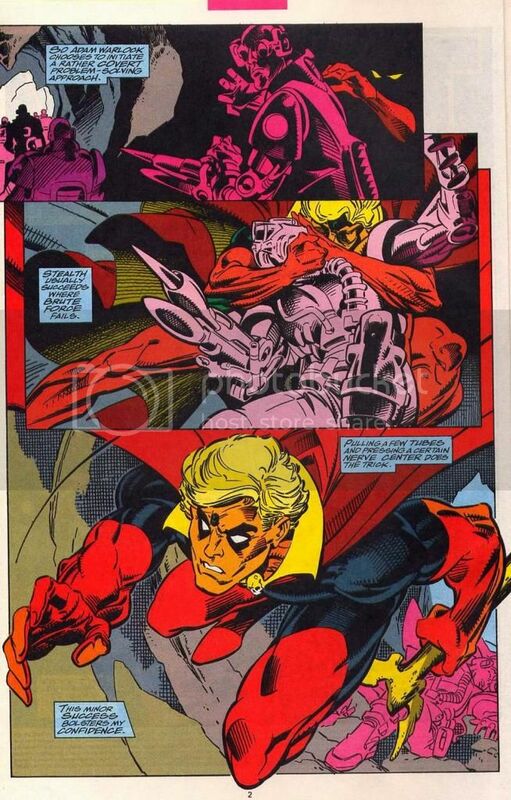 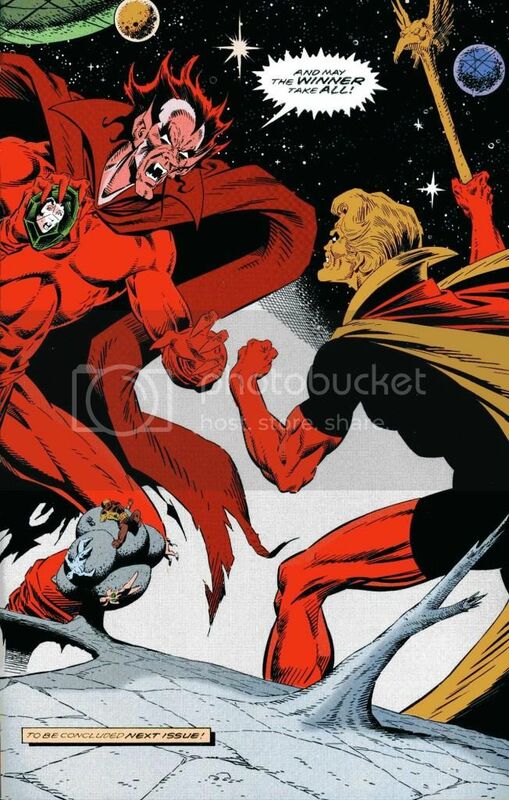 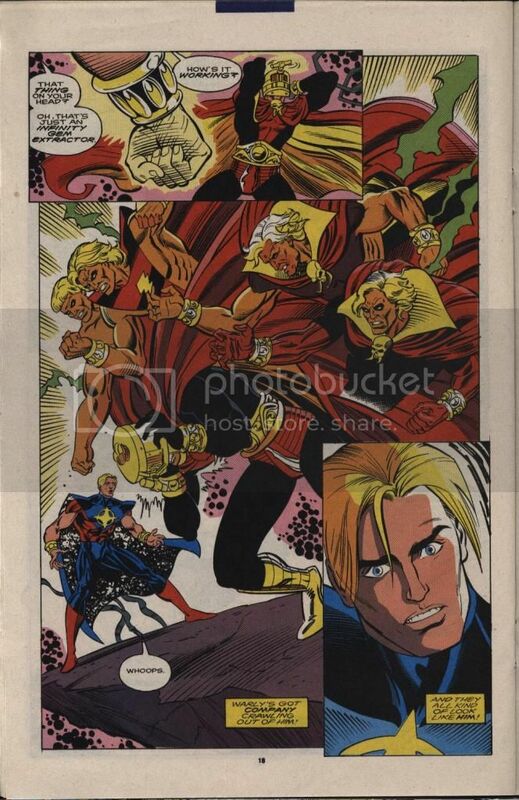 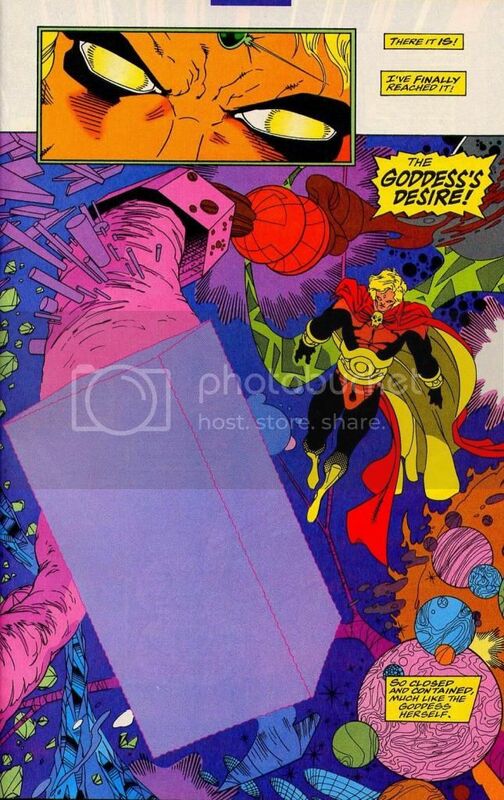 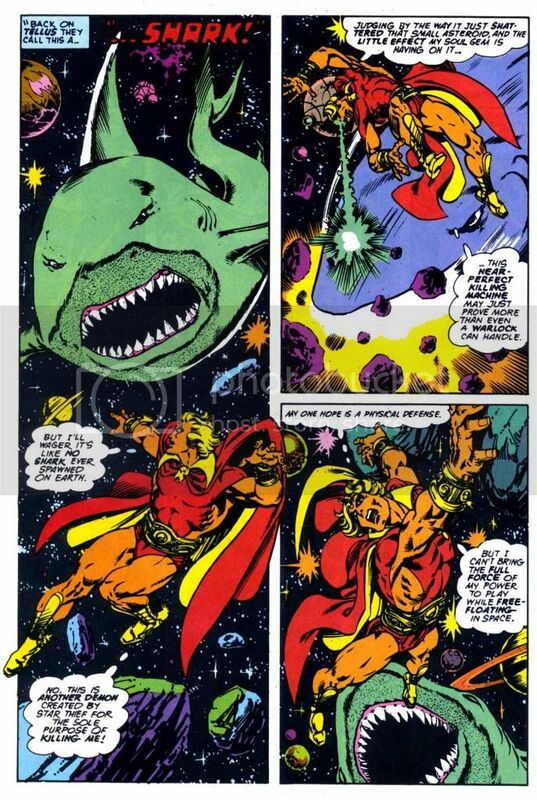 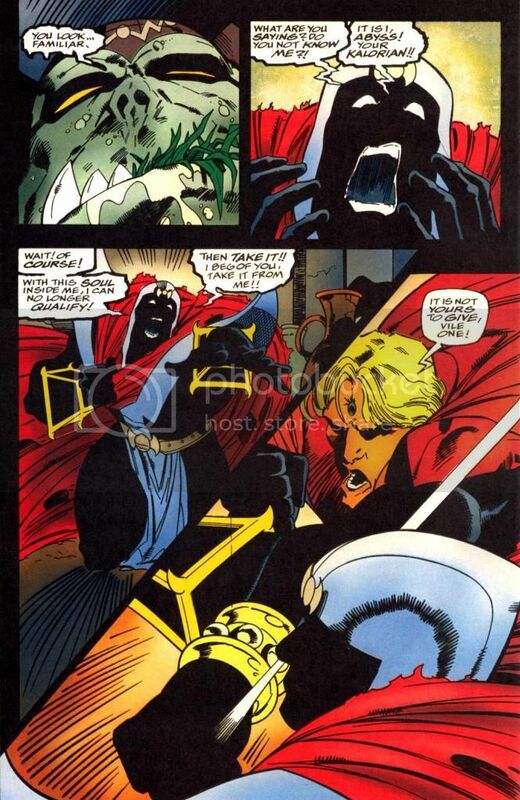 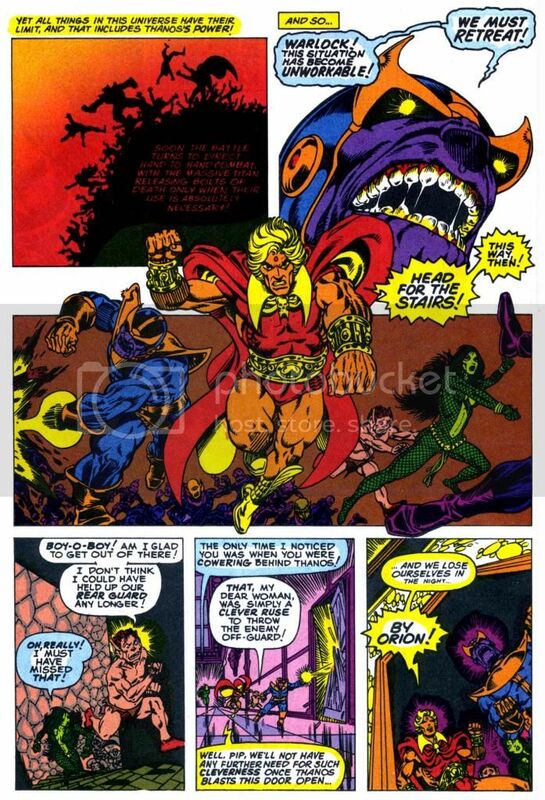 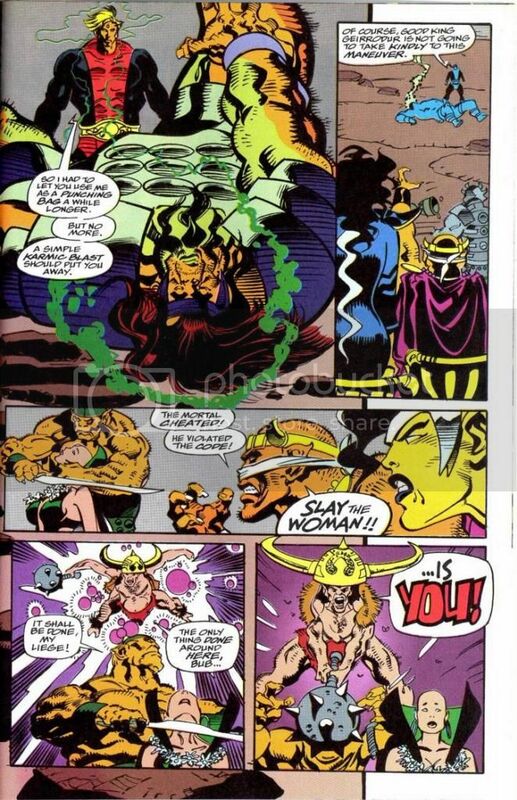 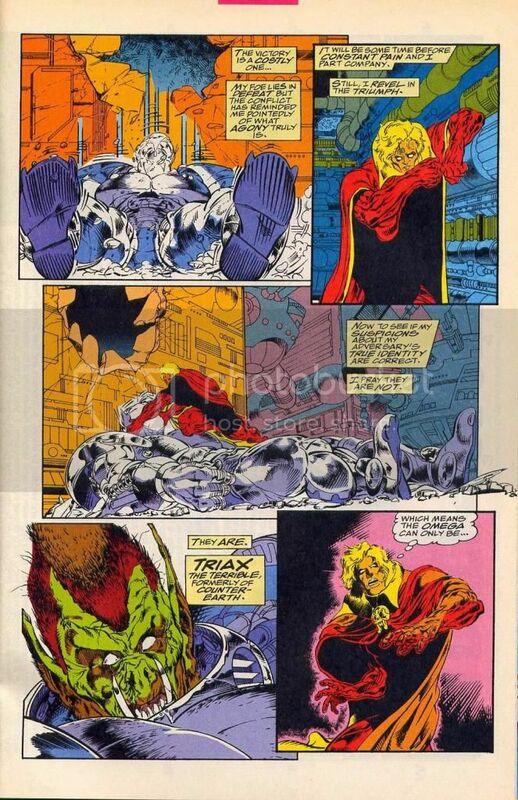 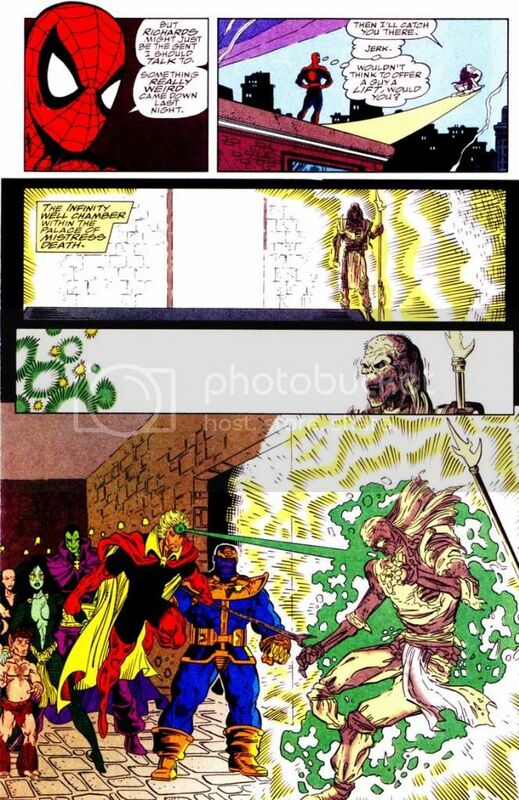 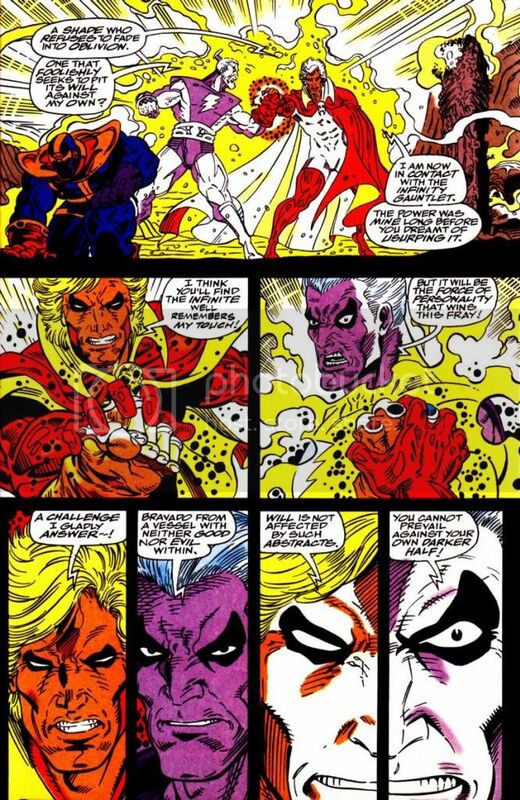 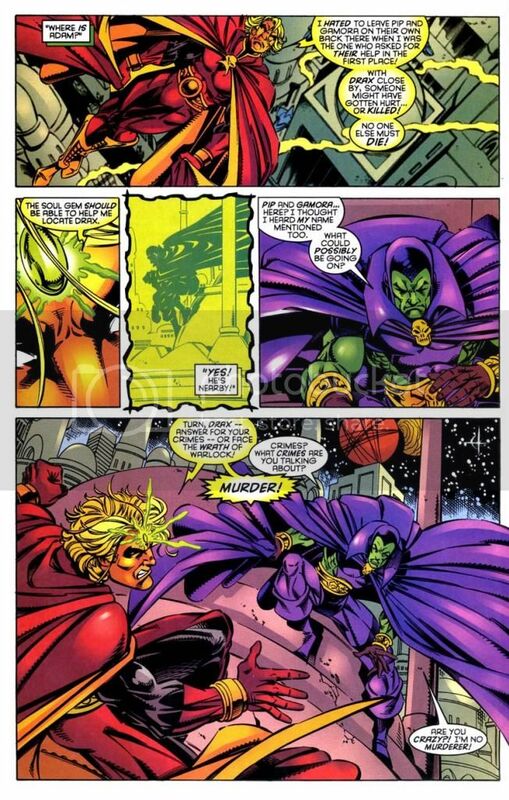 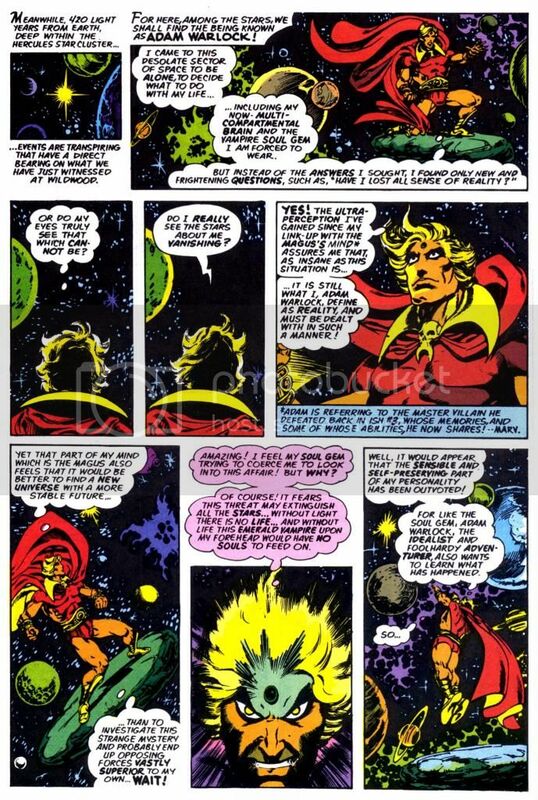 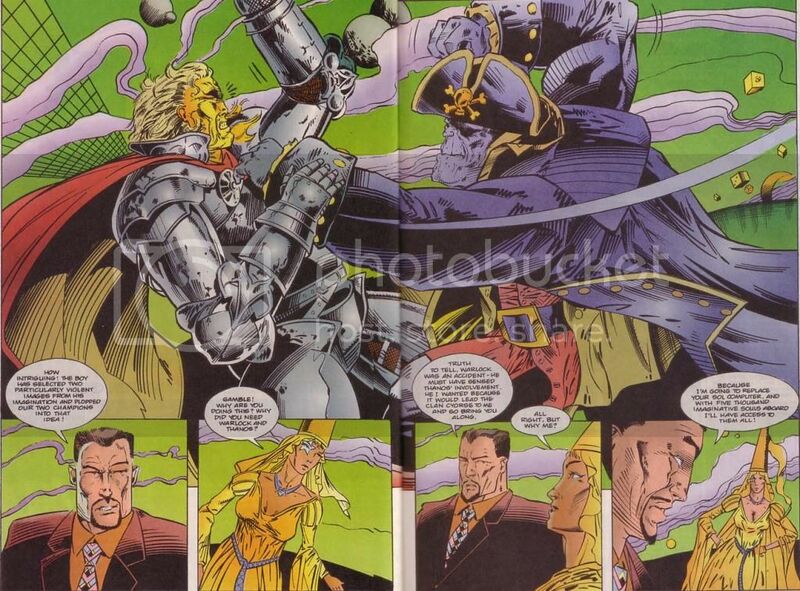 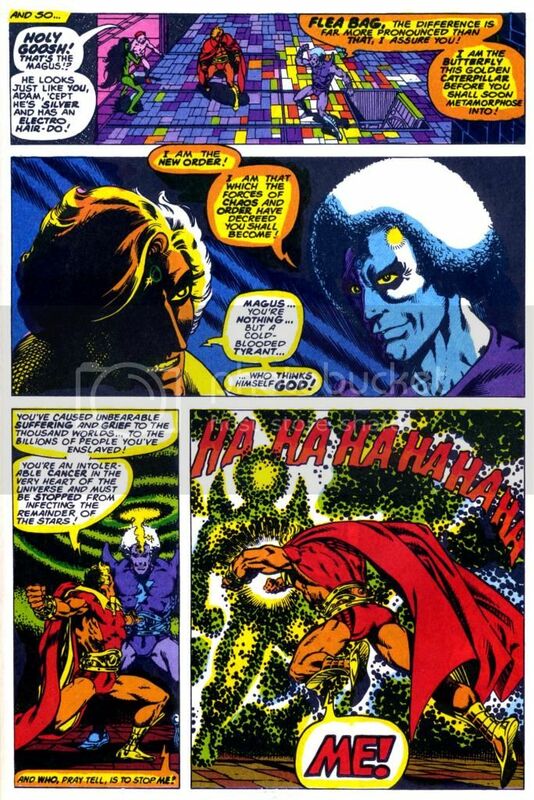 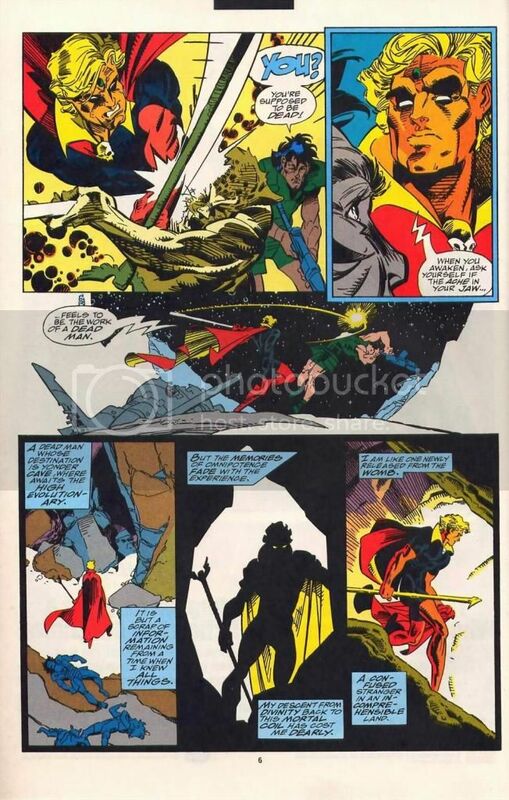 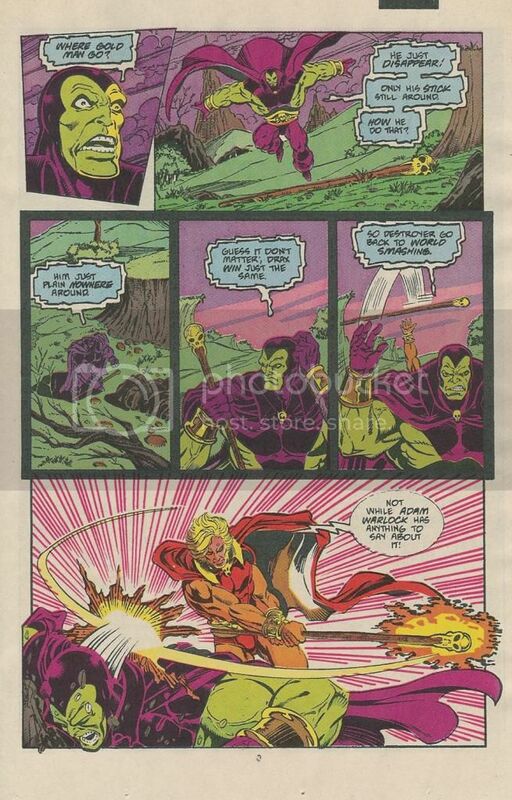 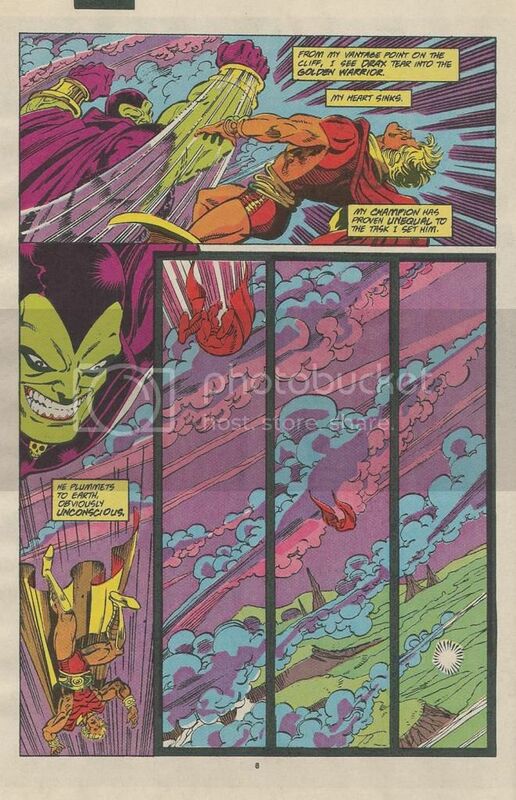 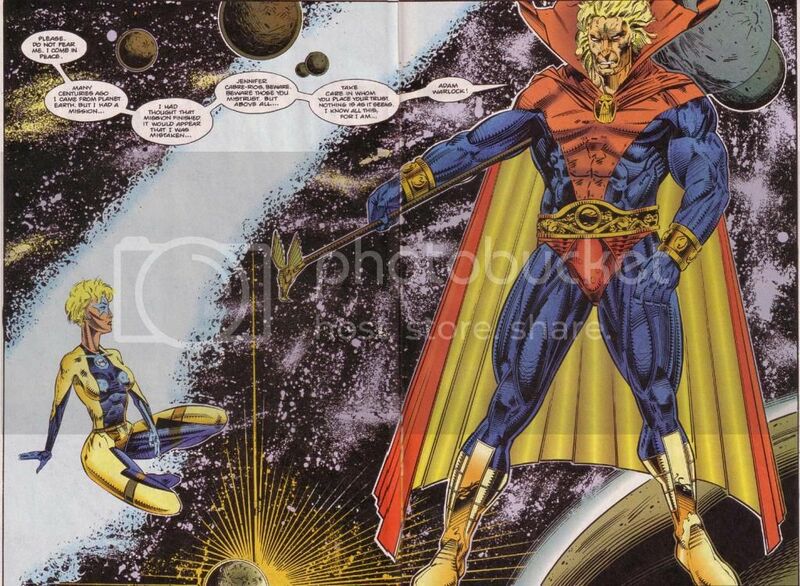 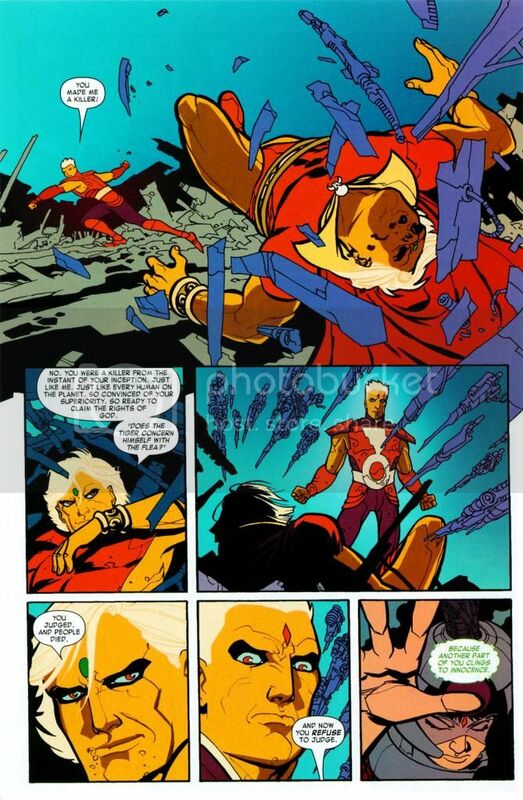 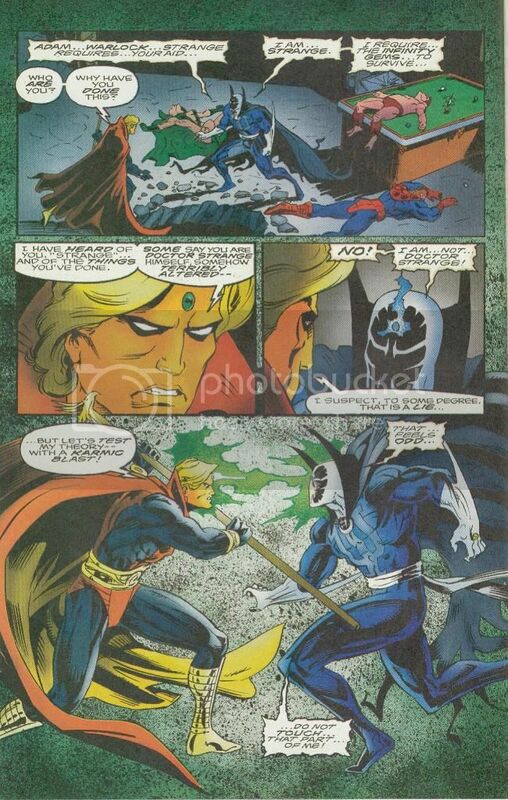 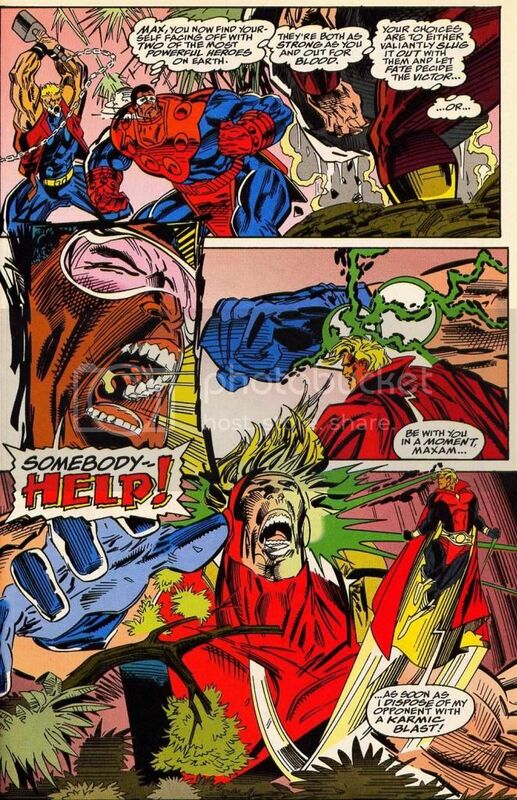 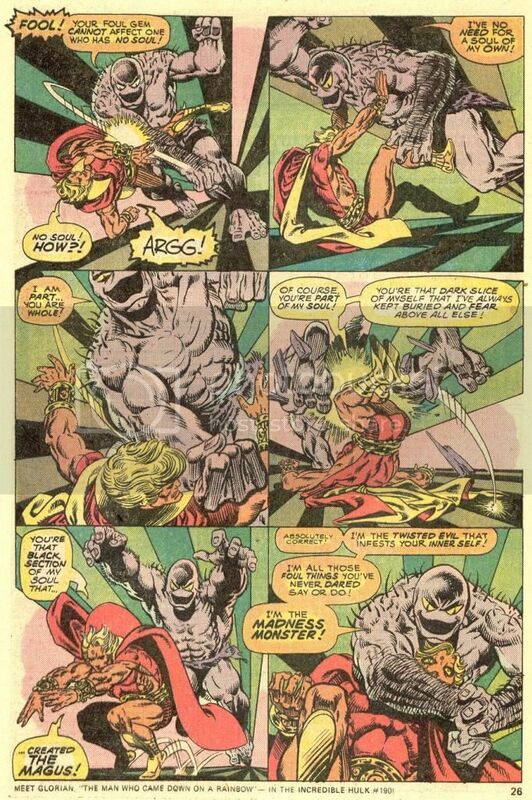 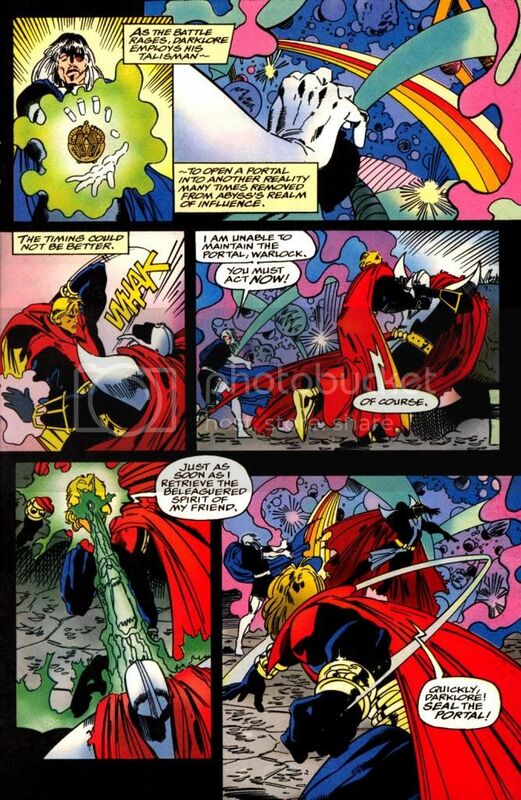 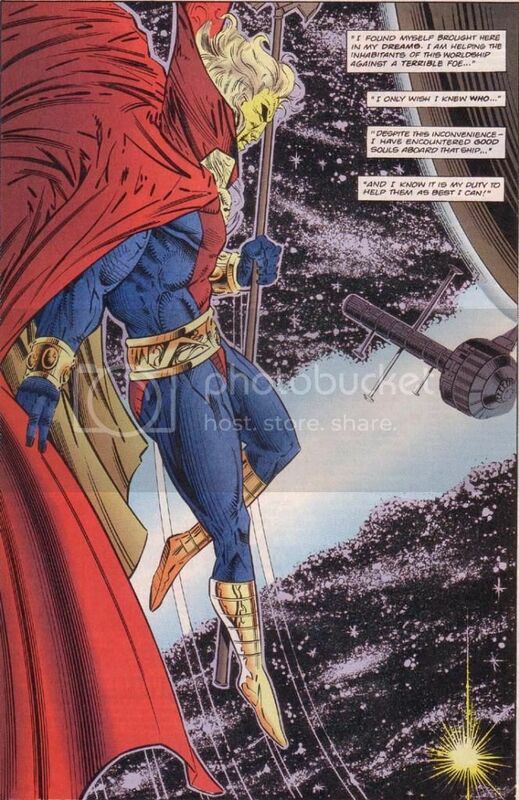 All other versions of Magus (present non-future) are Adam Warlock turned evil or his evil side given form. 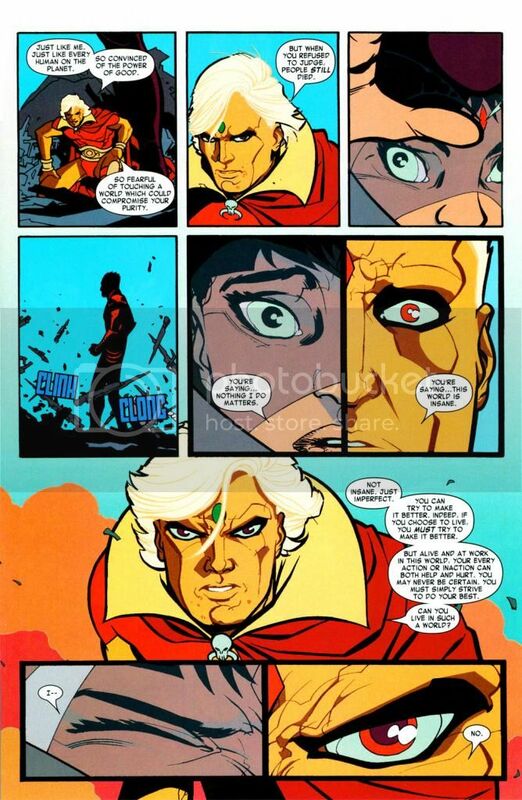 - When Adam first gained the gem, it was simply for him to channel his own cosmic power better. 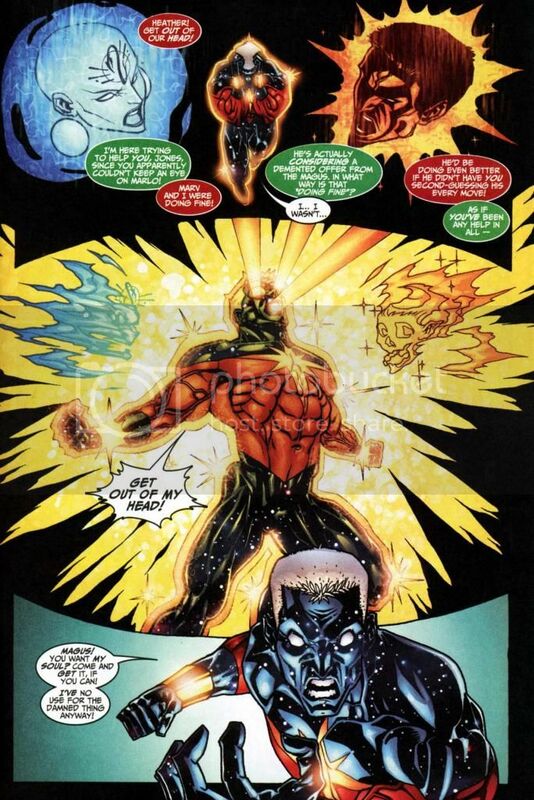 Later, it gave him additional abilities. 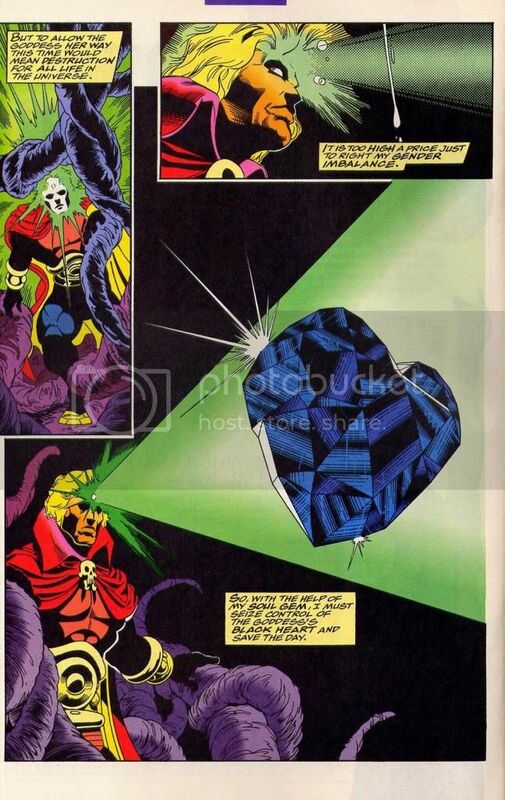 - In some showings, it is impossible to tell, whether the gem was or was not used to complete a certain task. 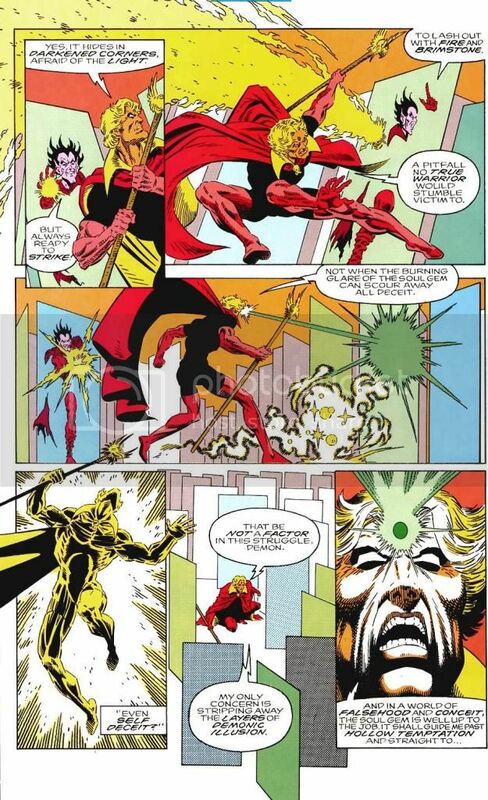 - In some showings, the gem and Adam’s personal powers are used in unison to complete a task. 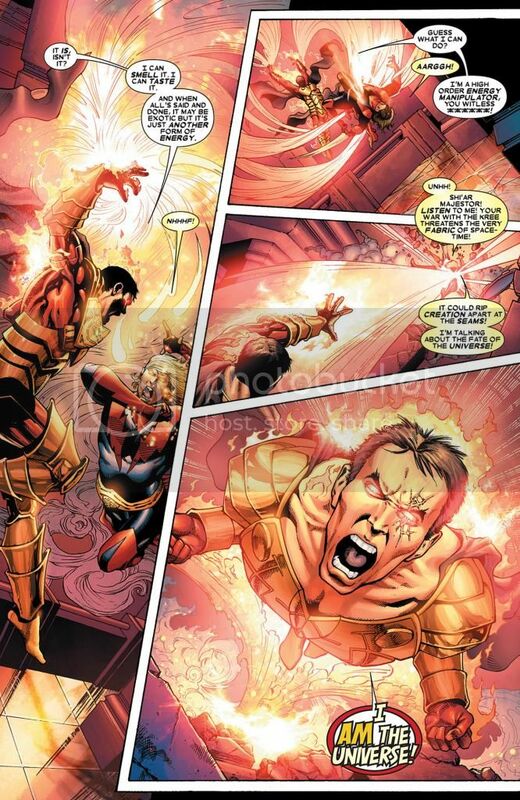 - Adam retained a large number of abilities that the gem gave him after losing the gem. 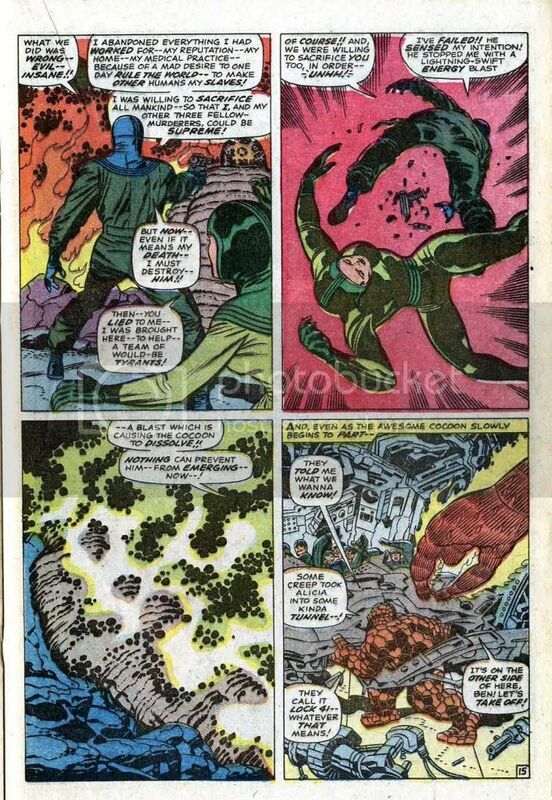 As Him, he was created with "power without limit"
Reed Richards: "It possesses more naked power than any living being has right to control." 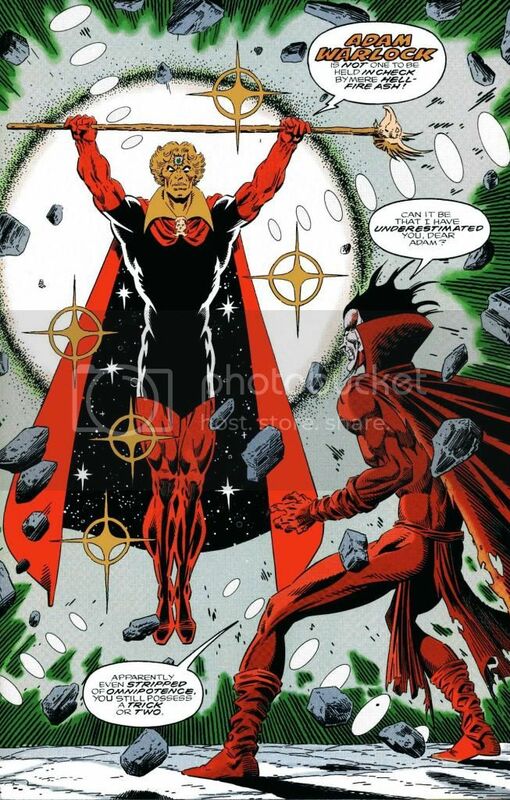 Pluto, the Olympian death god, feared the power of Him. 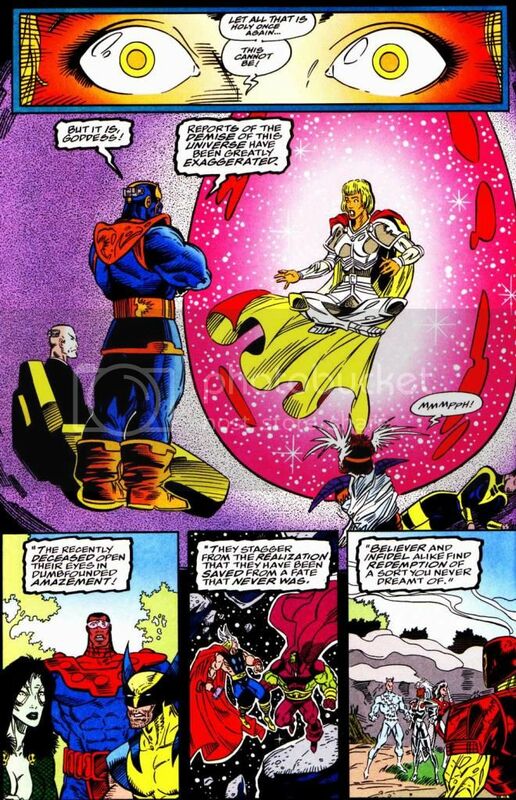 Pluto: "I know not the measure of his nameless power." 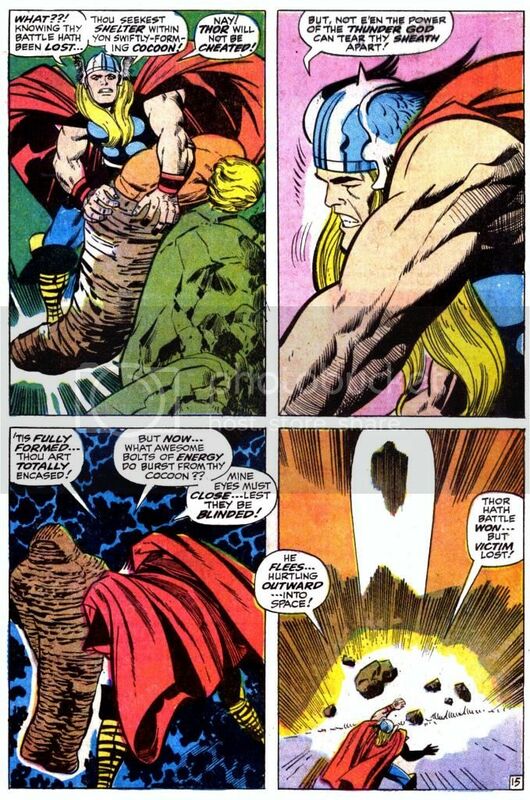 Thor: "There be powers unleashed such as mortals have never know." 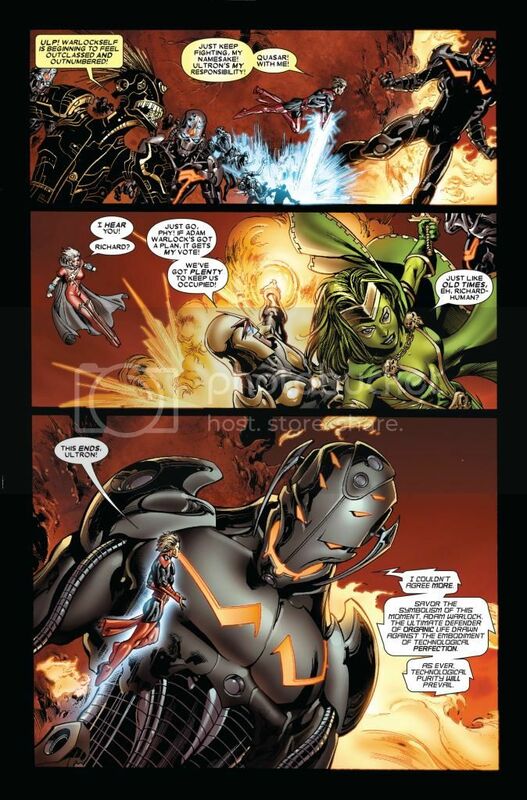 Ultron covets Warlock's body for its power and perfection. 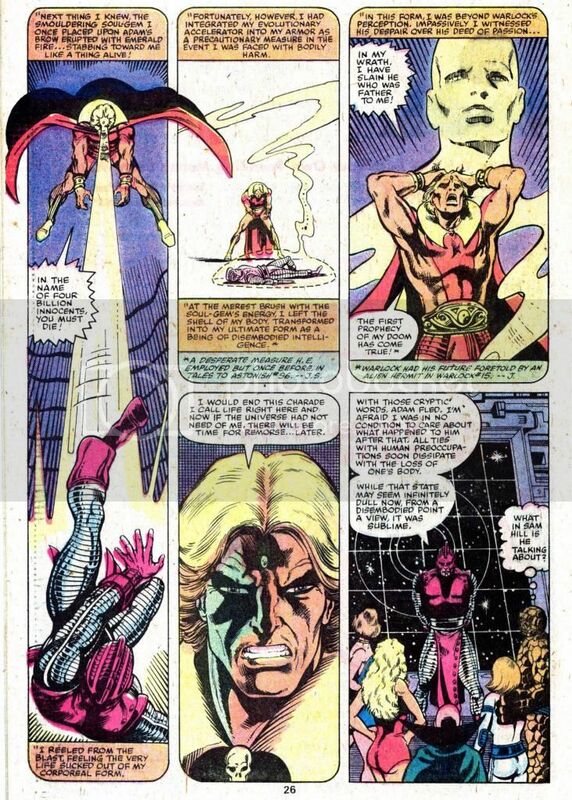 High Evolutionary: "Perfect genetic specimen." 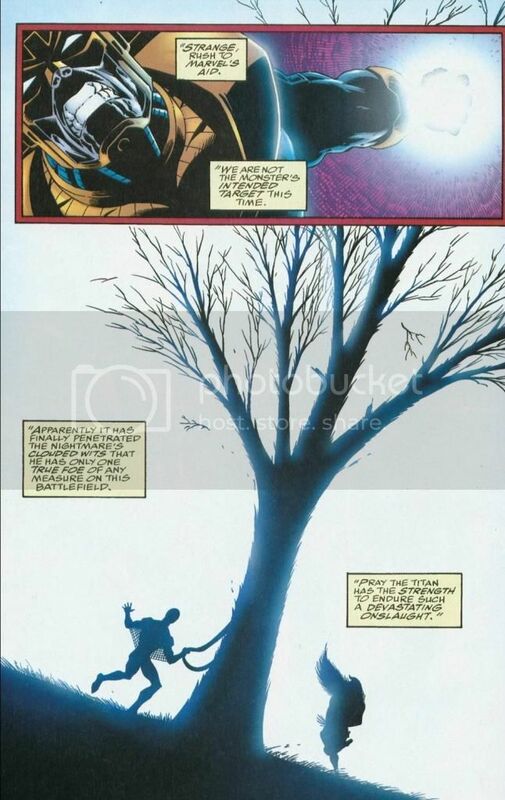 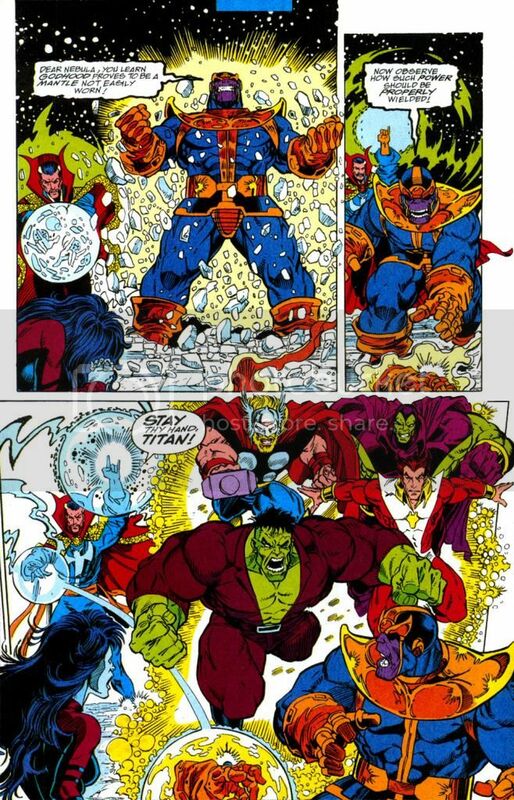 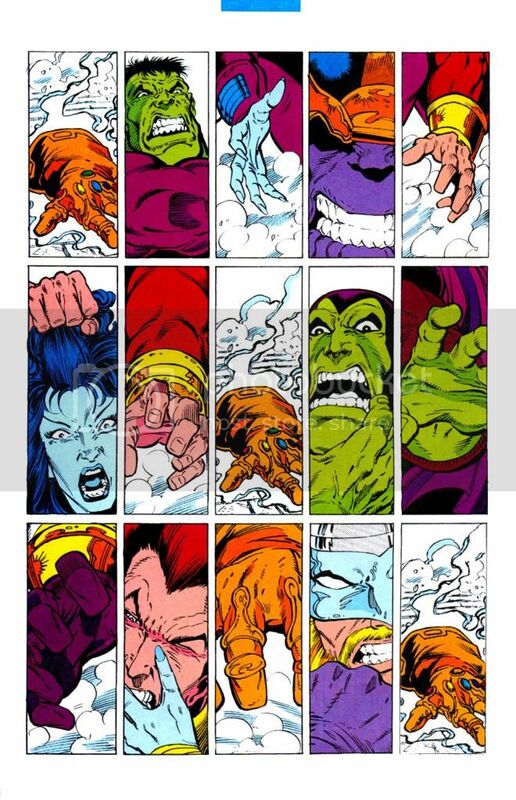 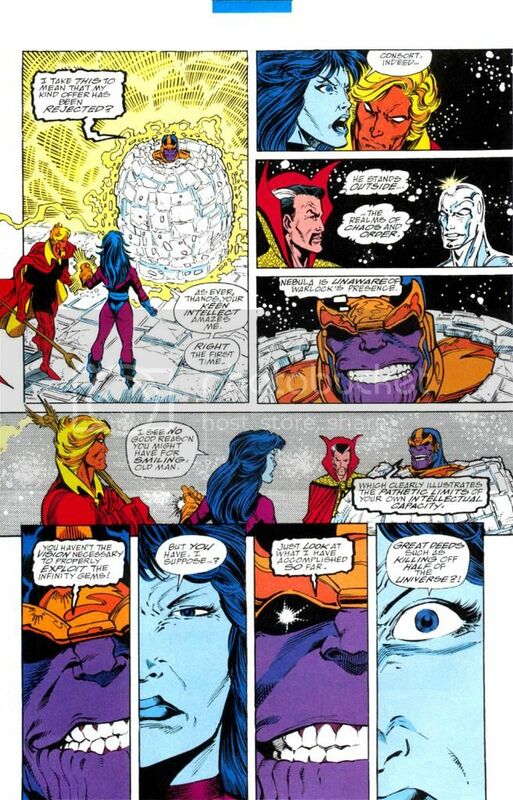 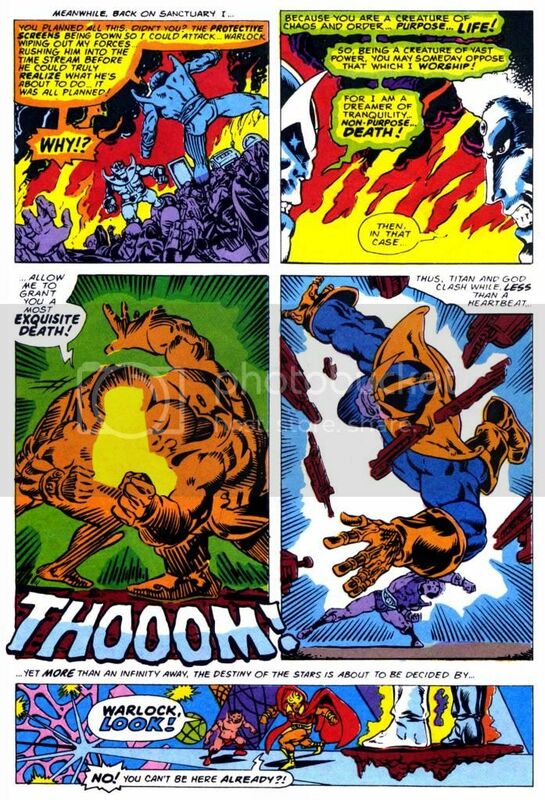 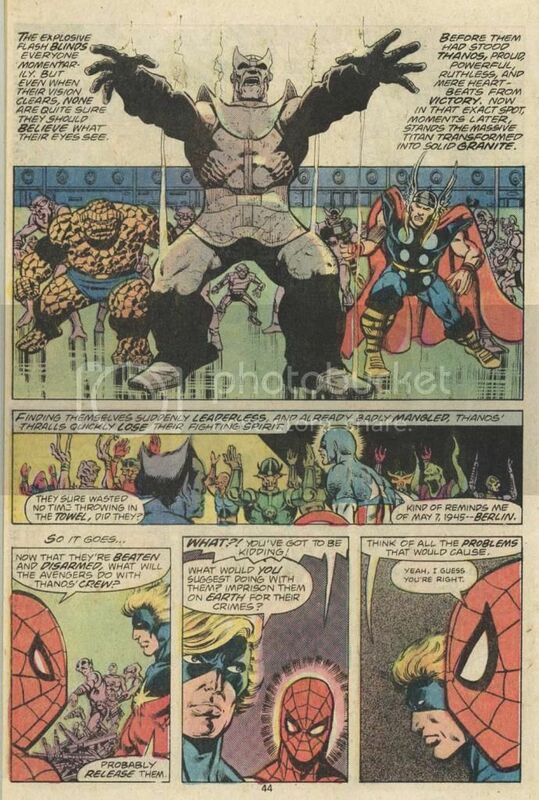 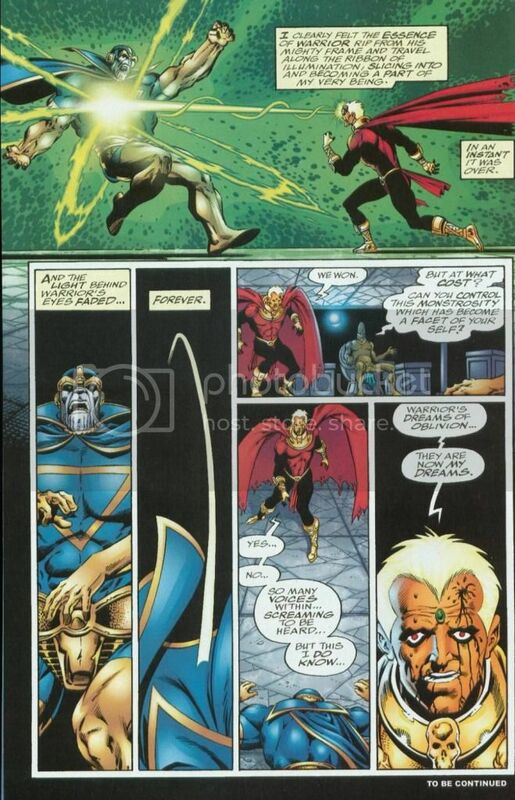 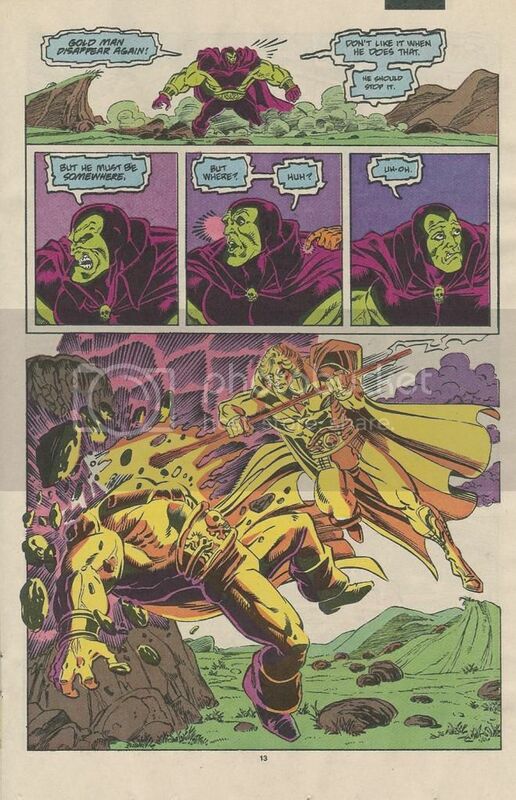 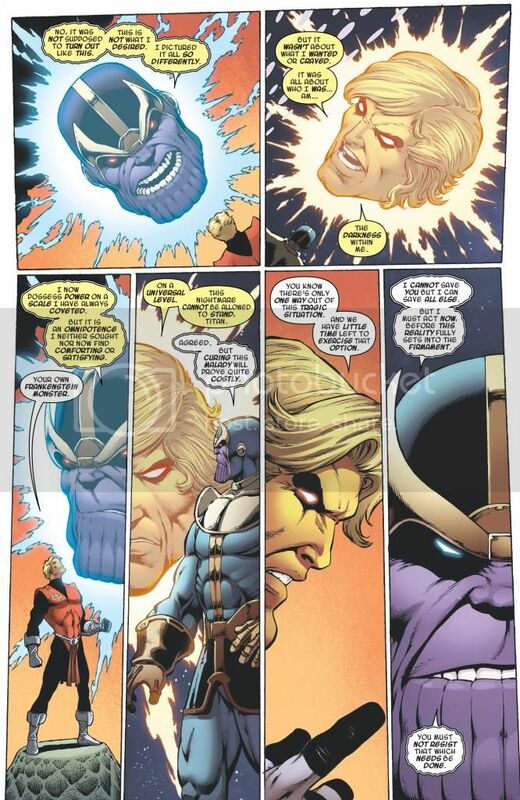 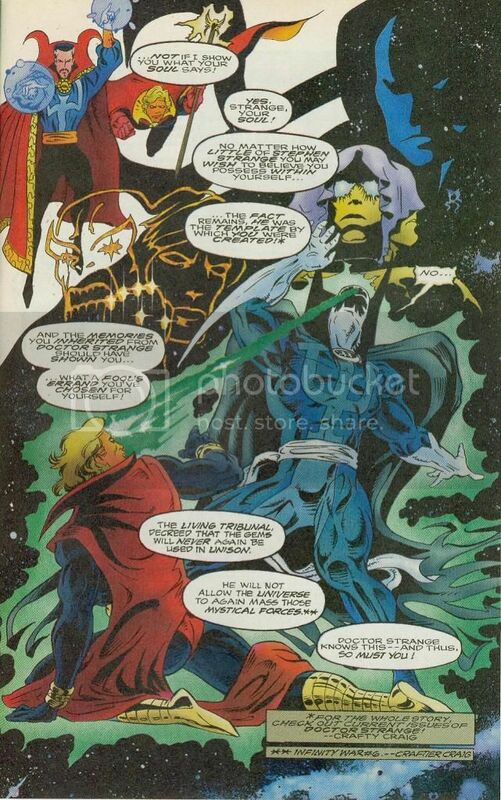 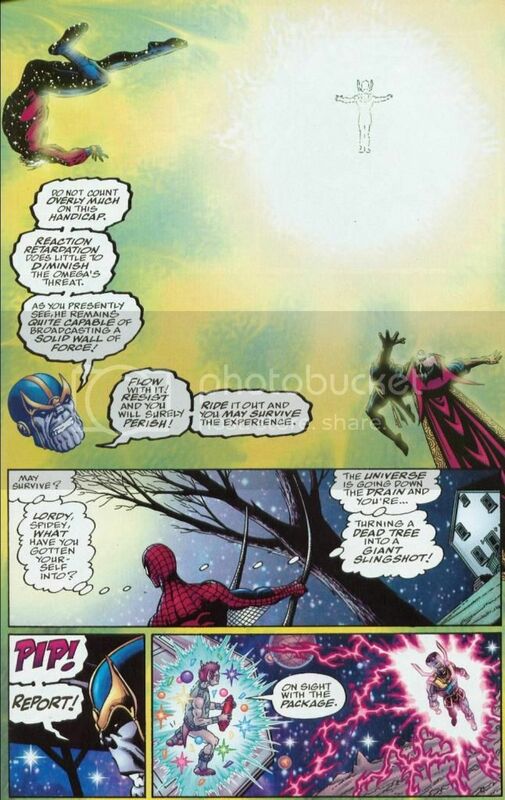 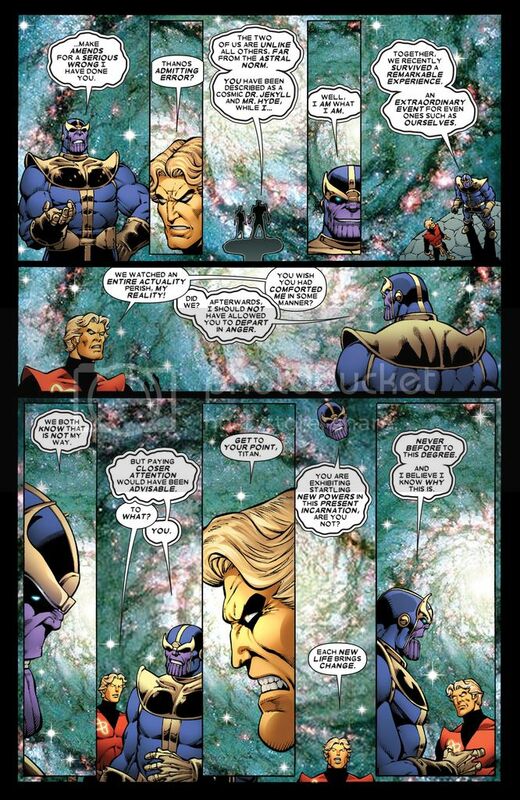 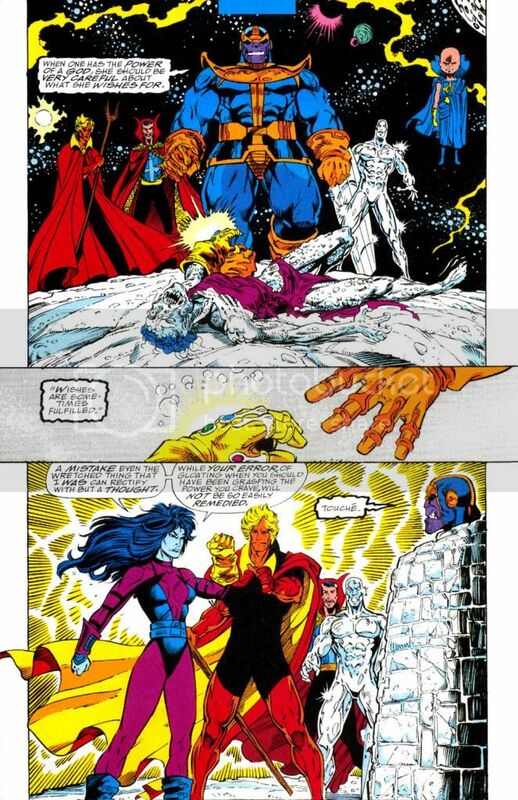 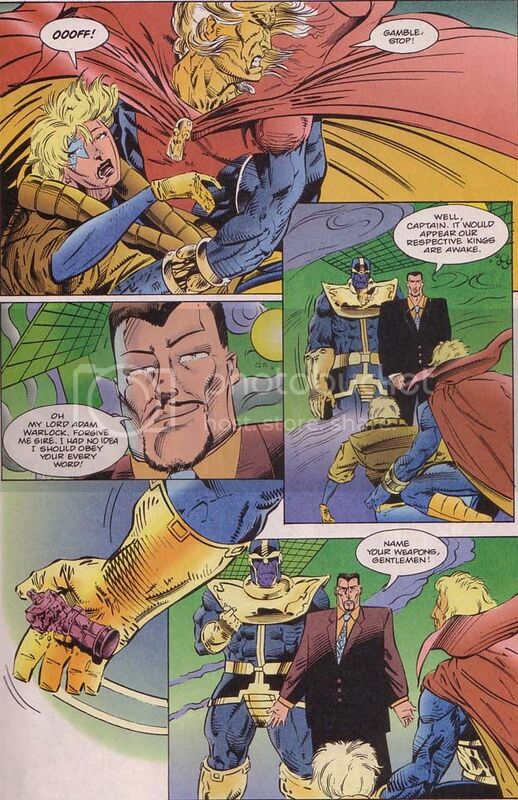 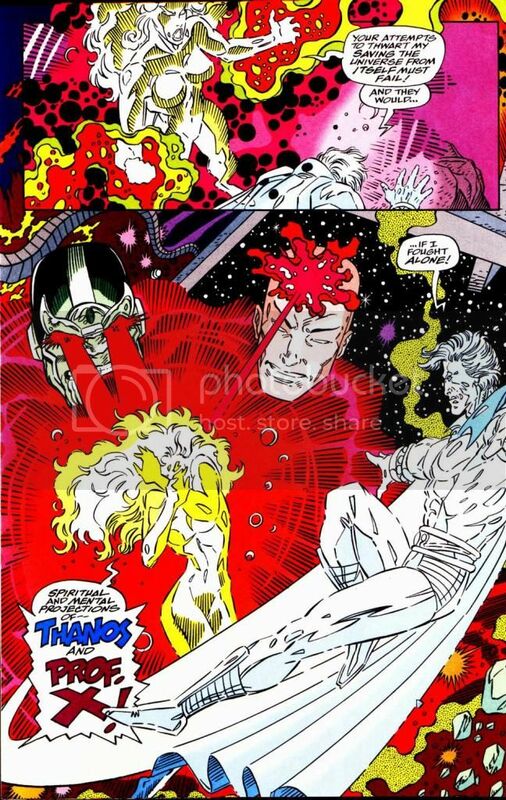 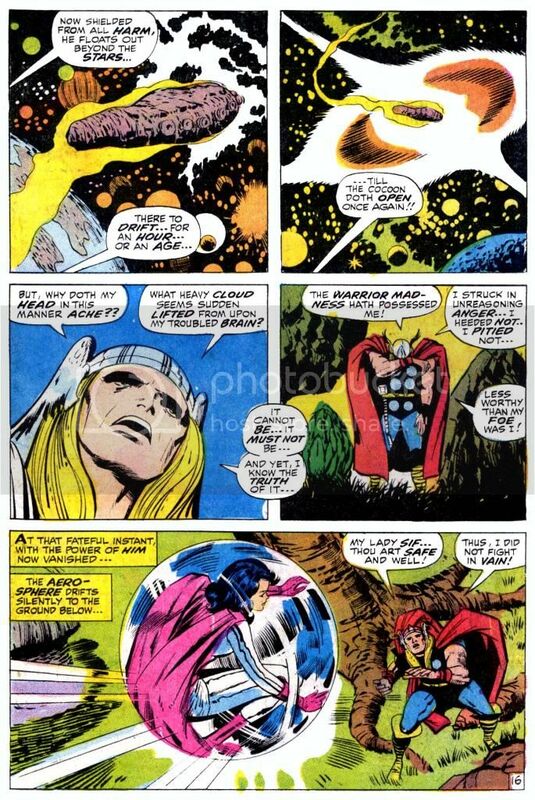 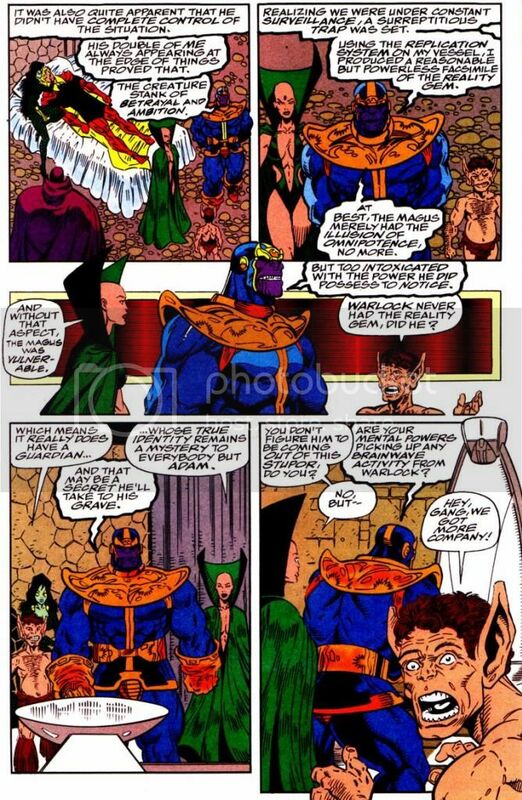 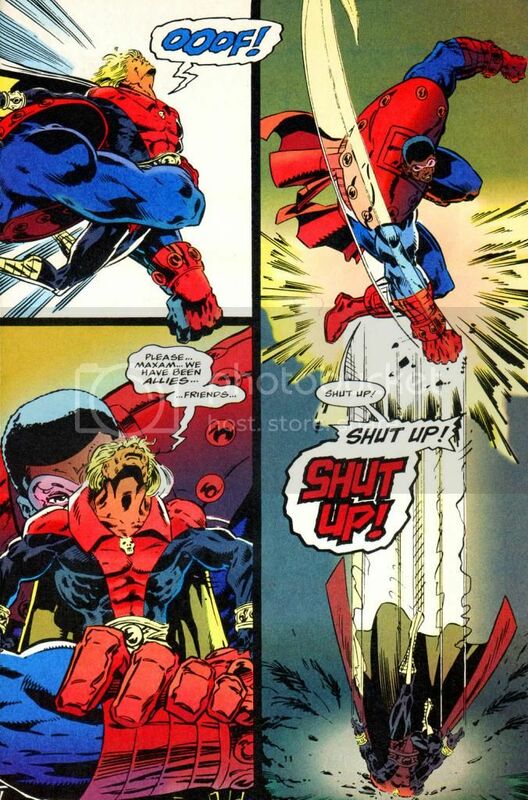 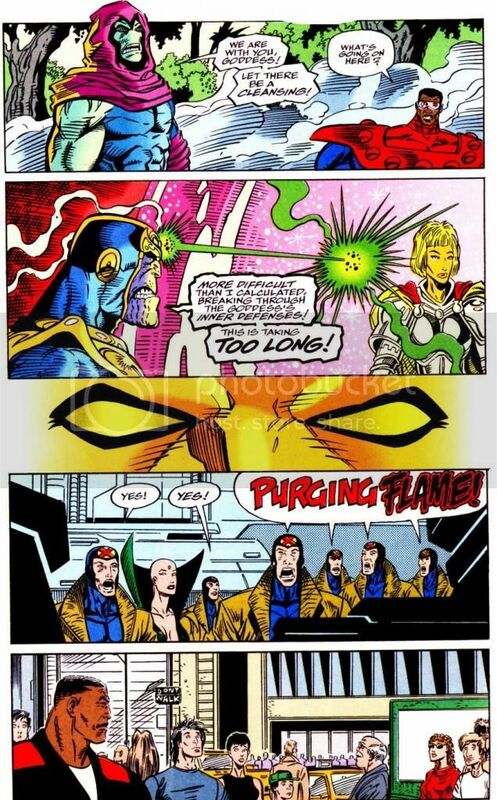 Warlock is the only person in the entire universe that Thanos fears. 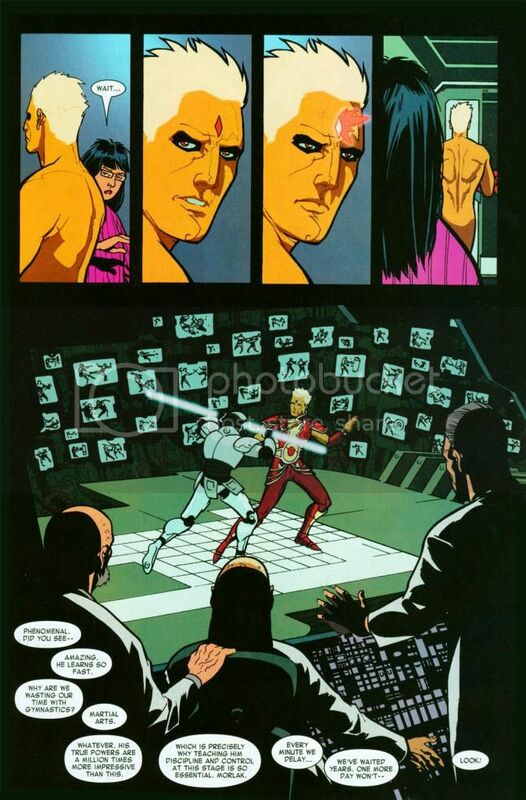 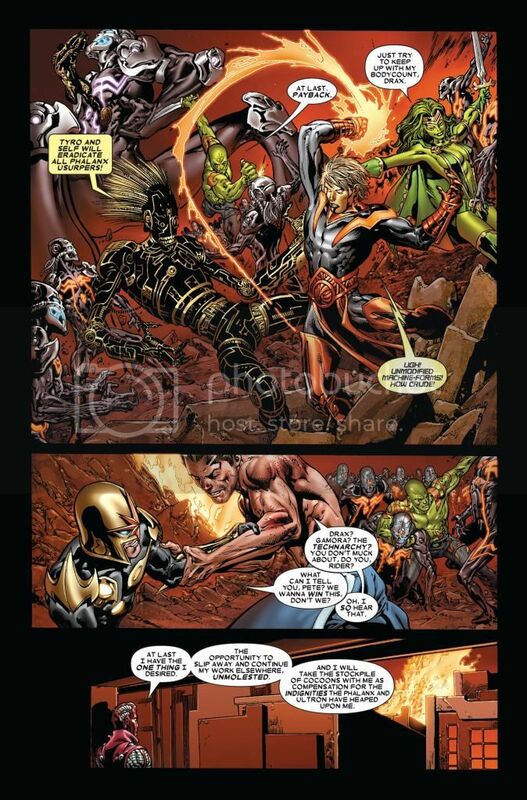 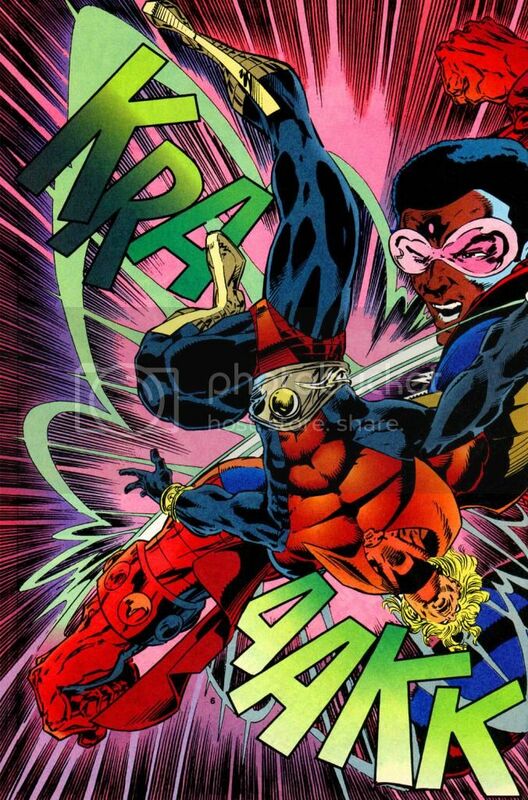 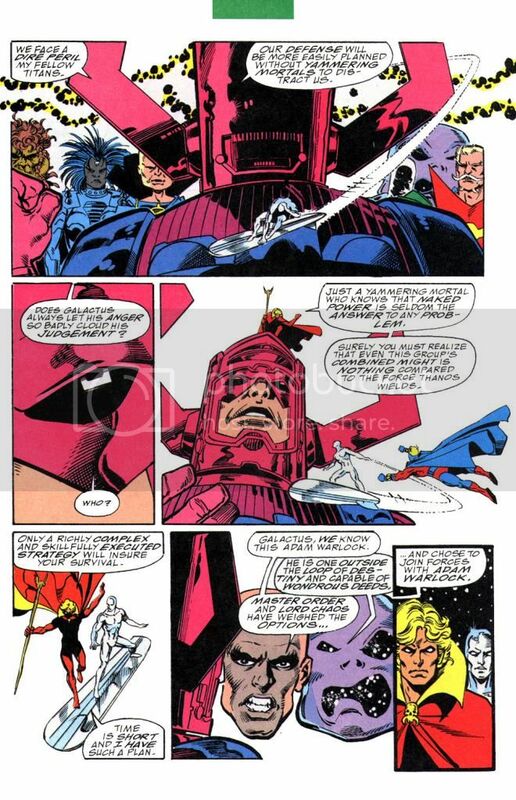 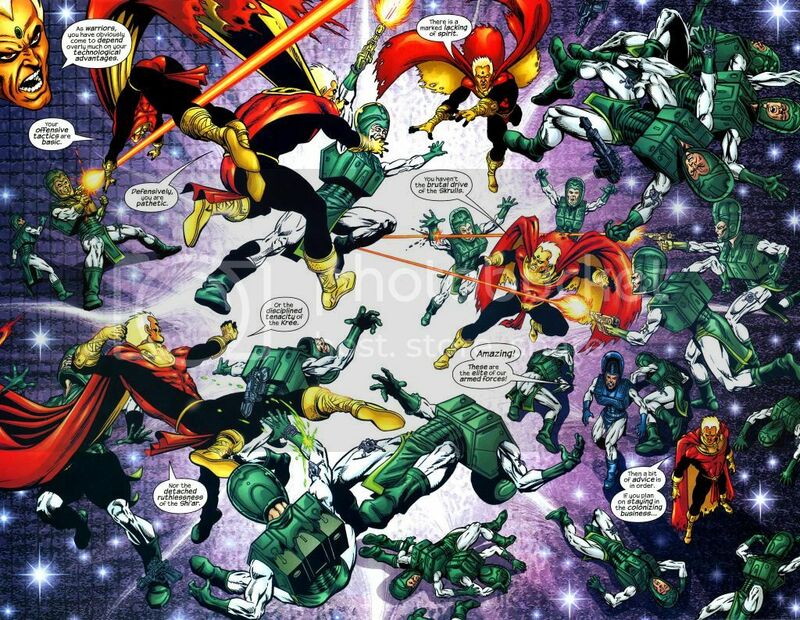 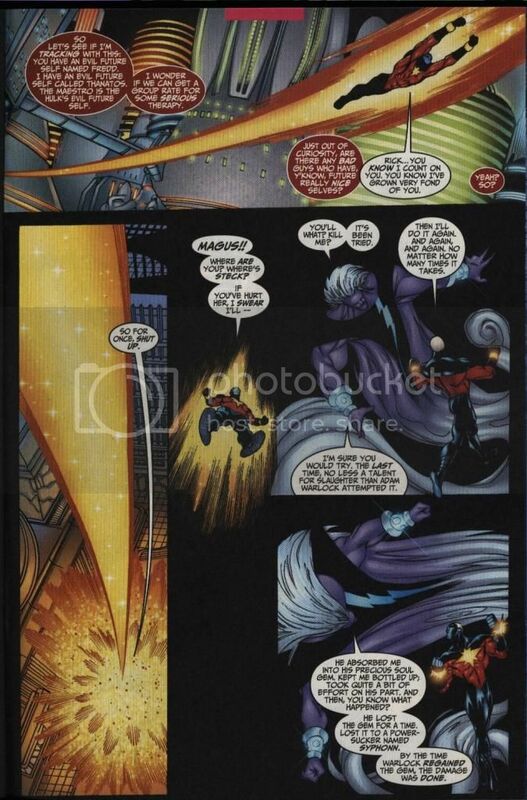 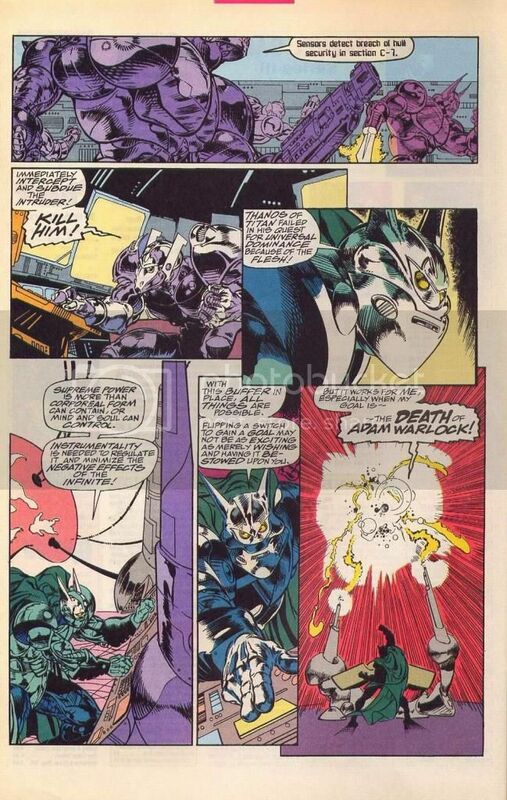 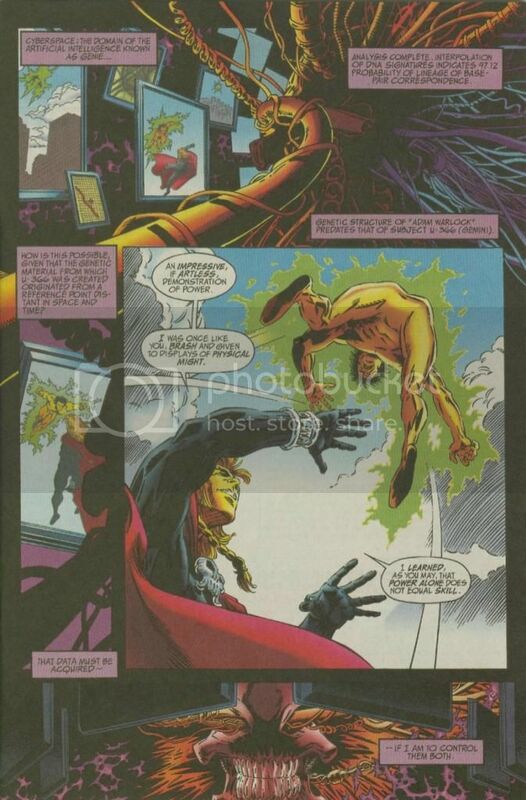 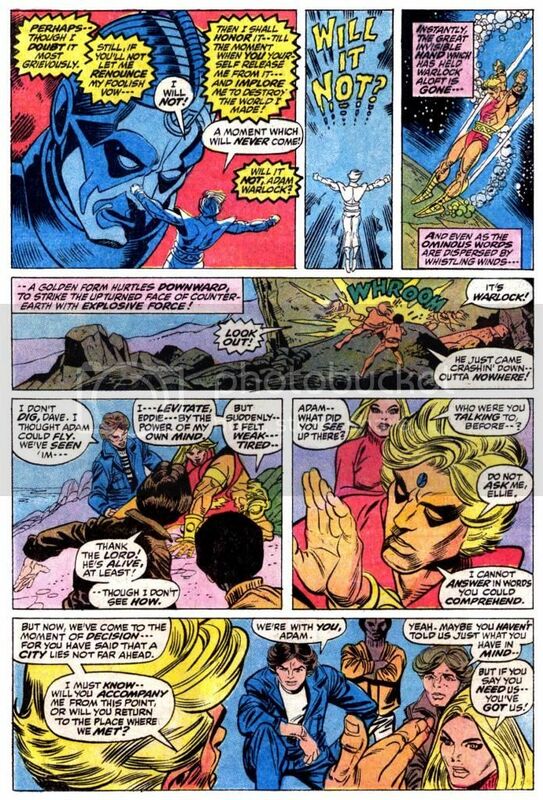 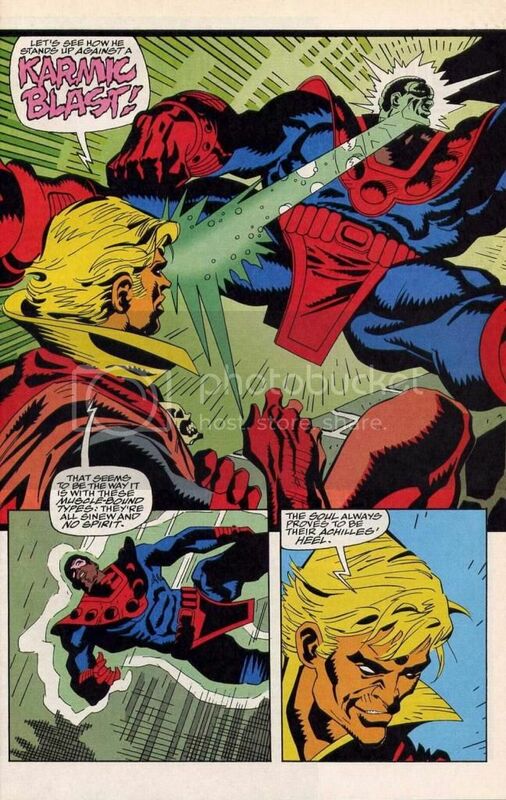 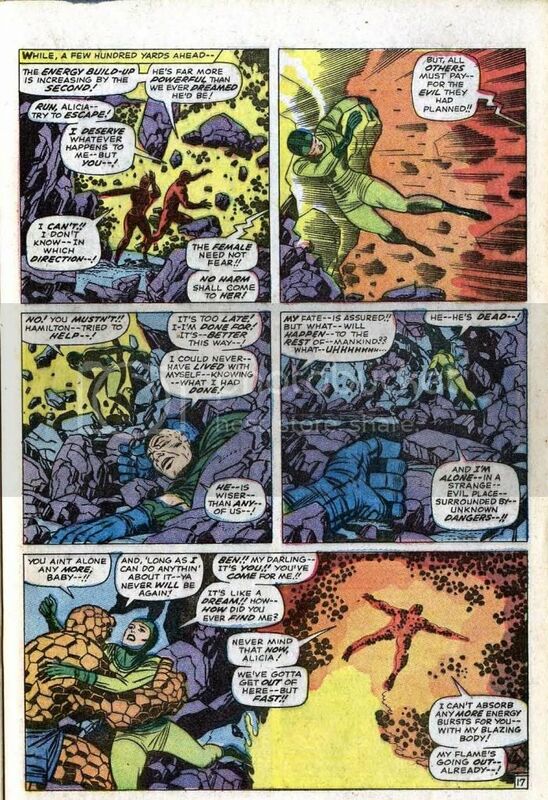 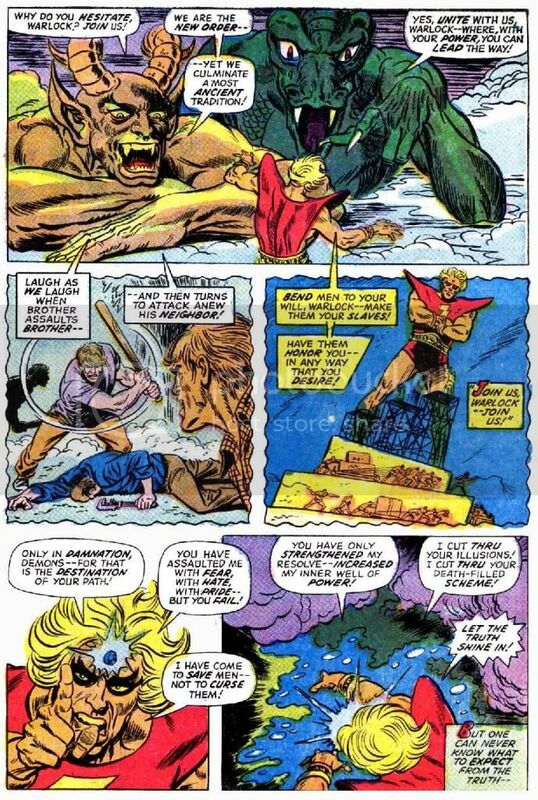 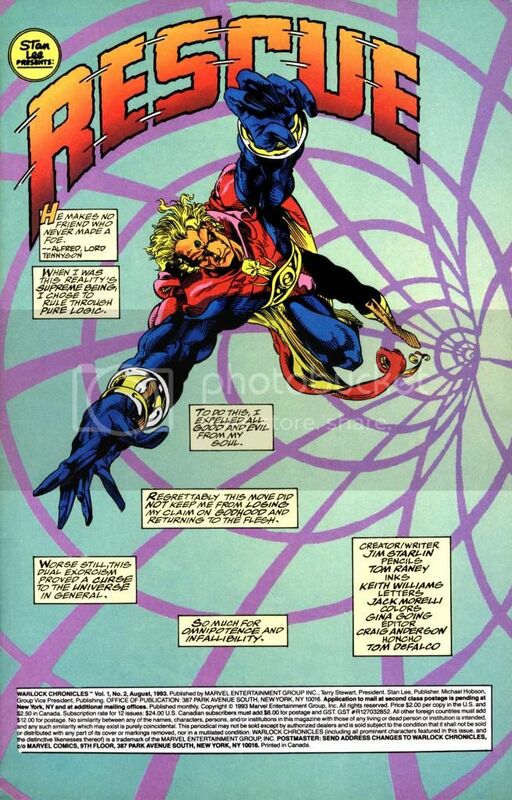 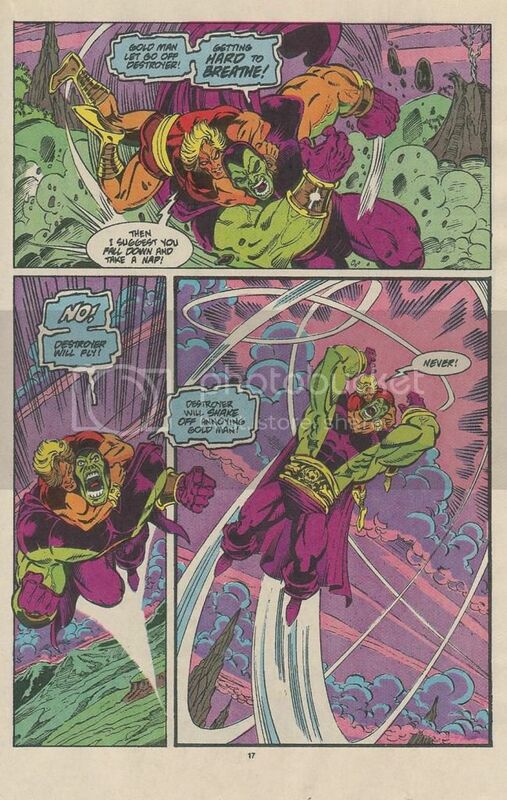 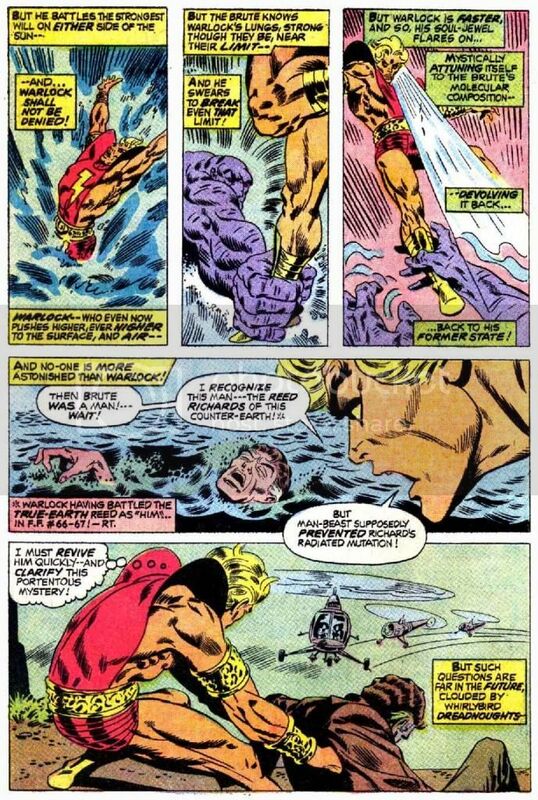 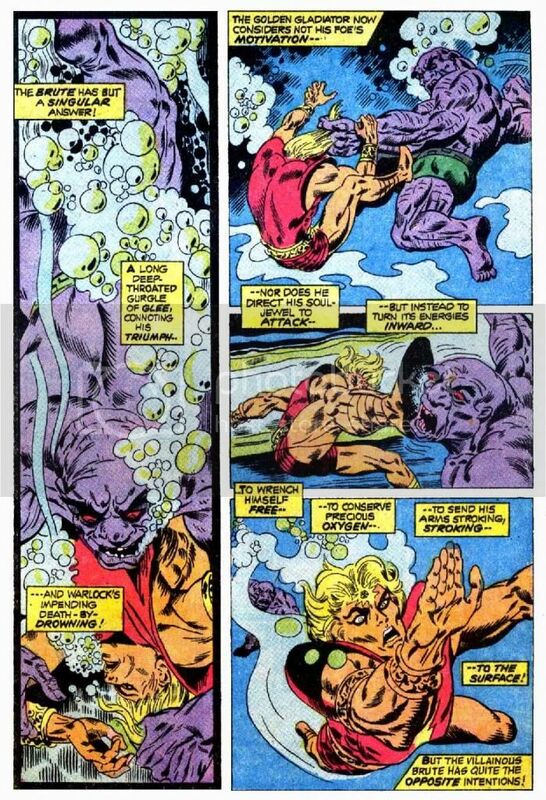 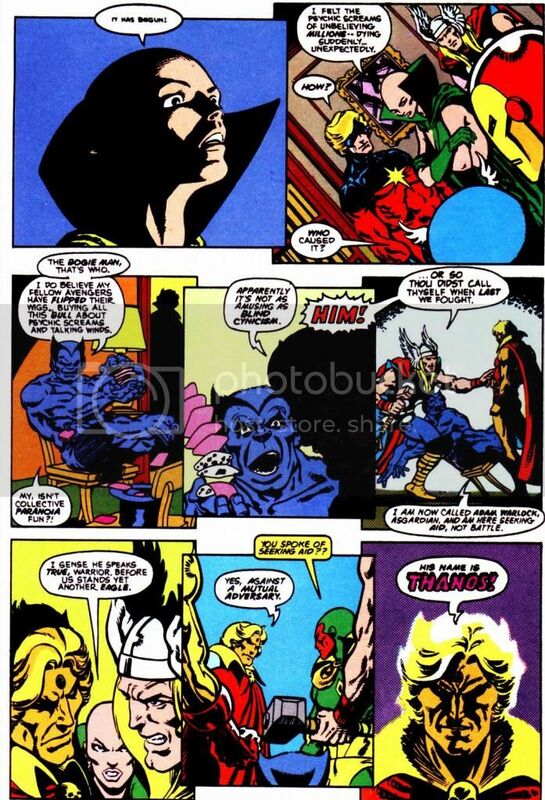 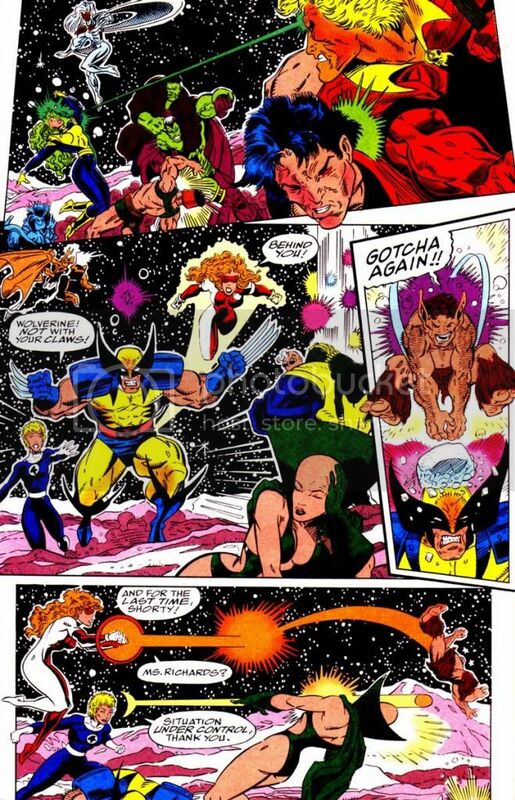 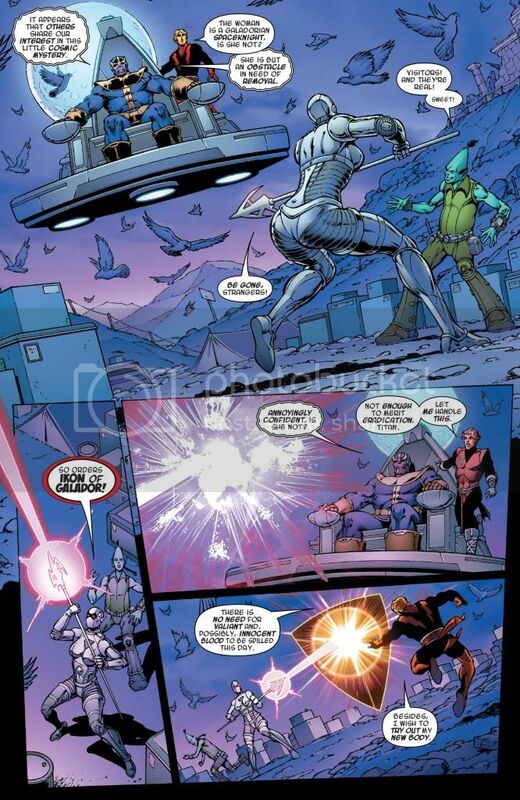 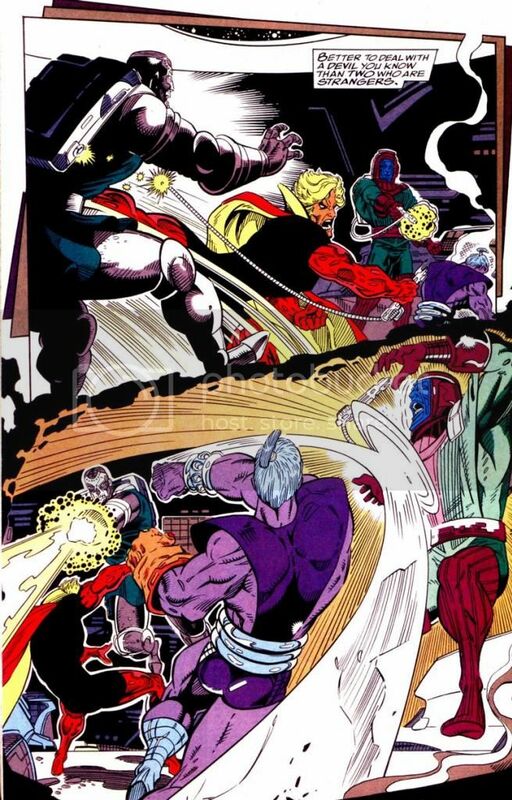 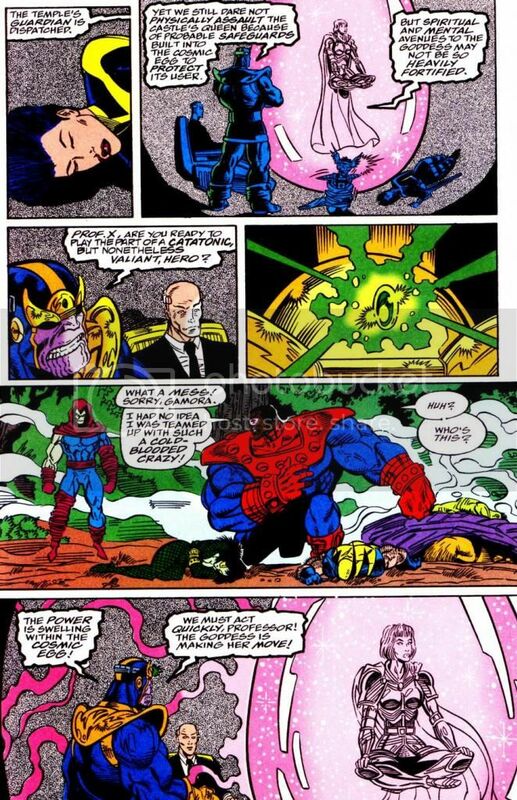 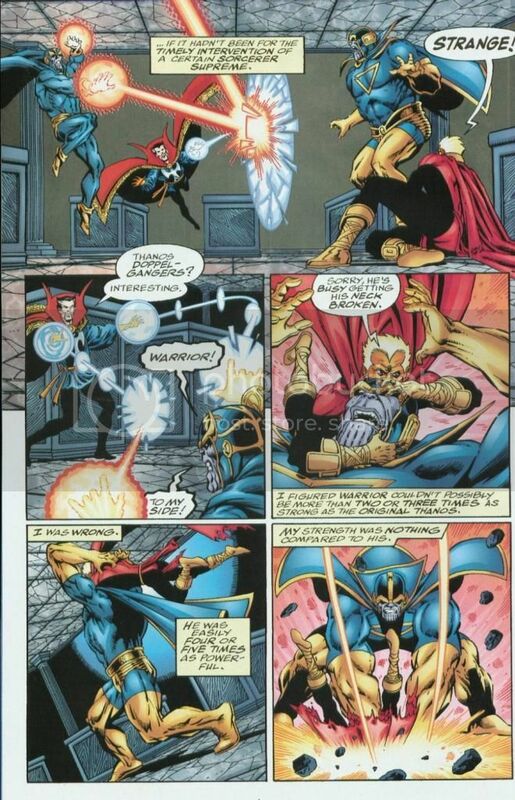 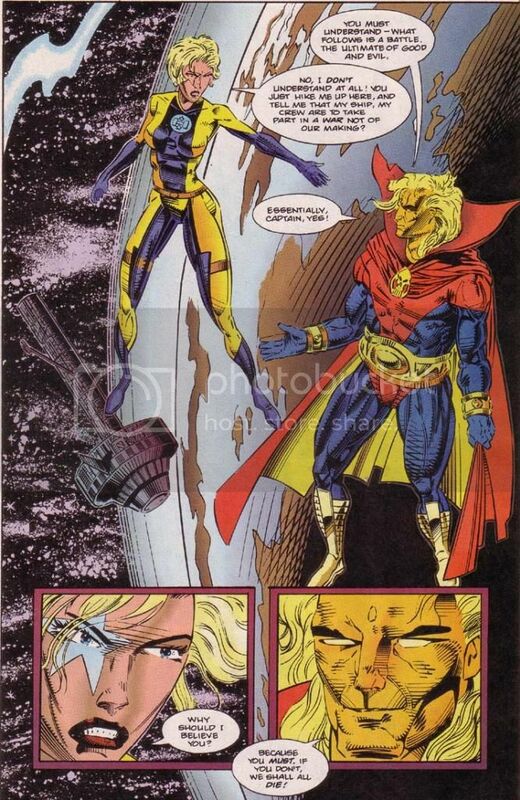 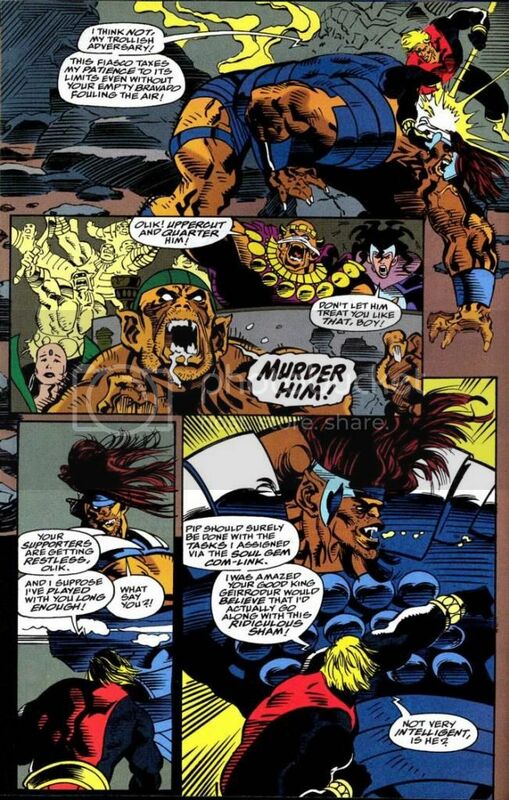 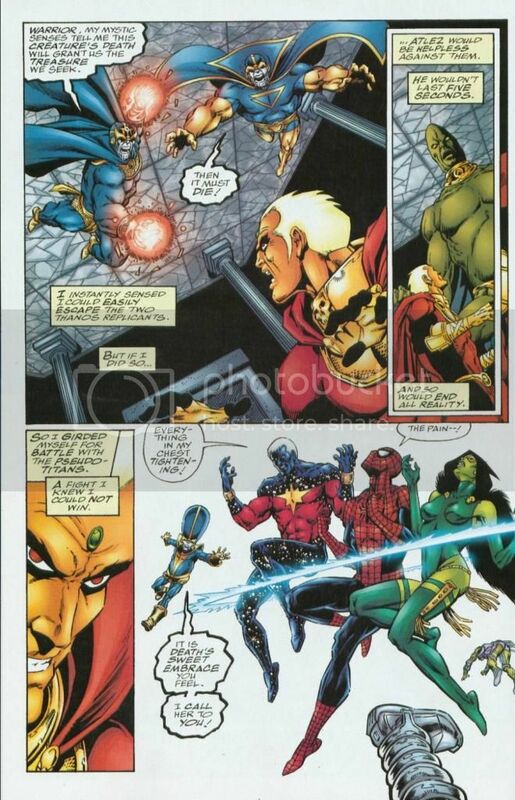 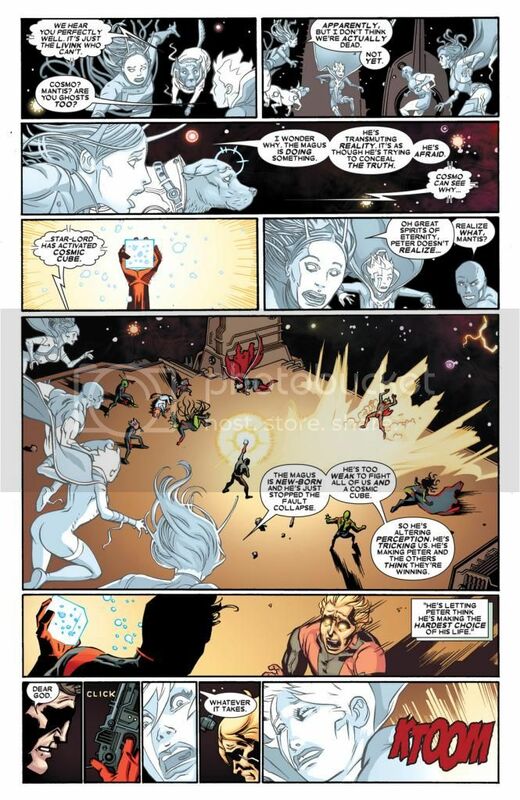 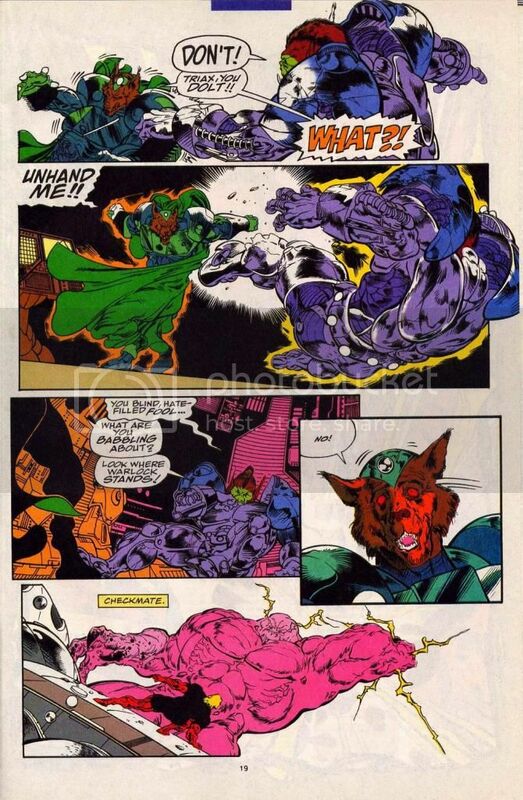 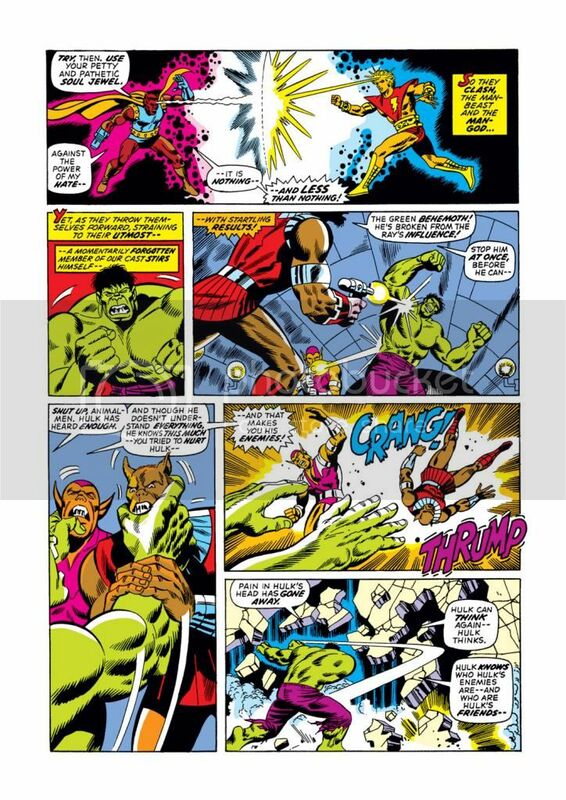 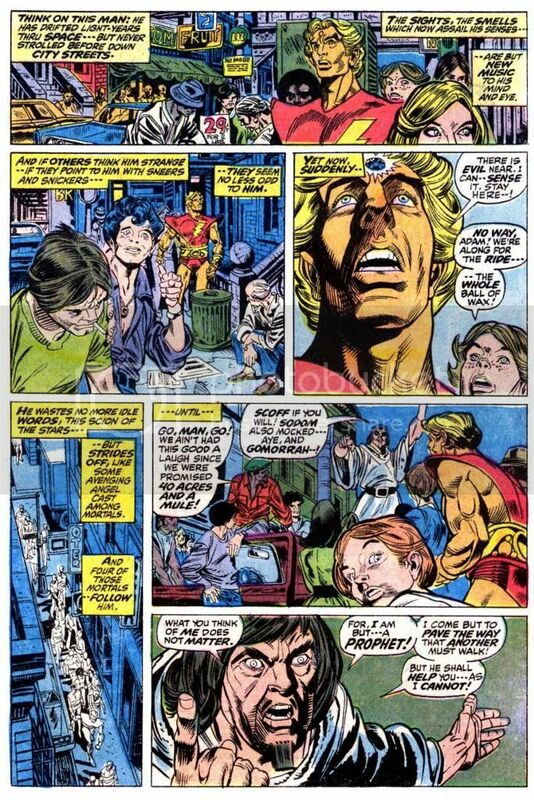 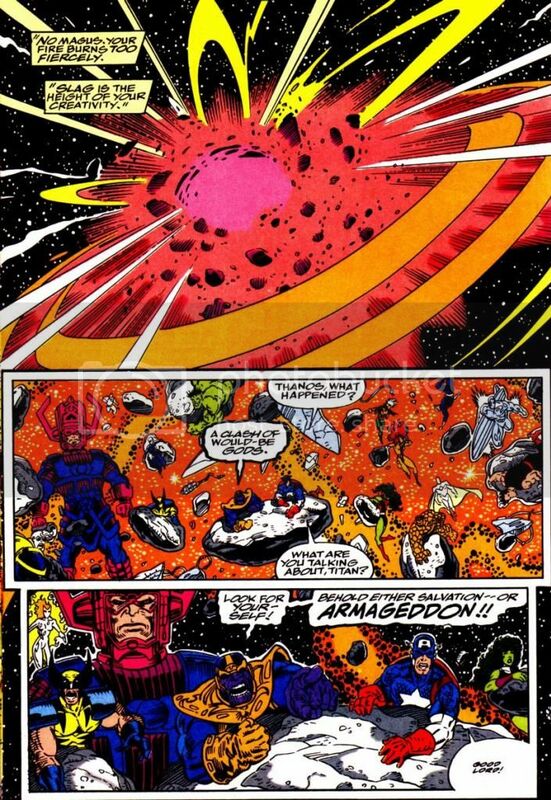 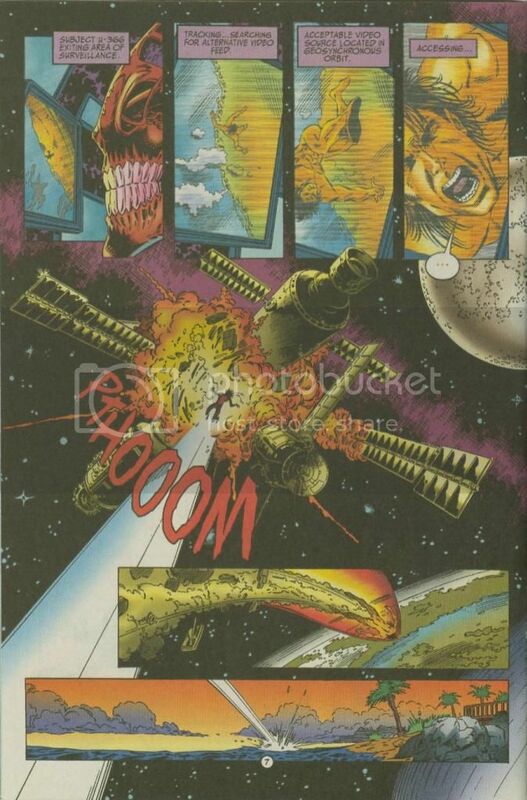 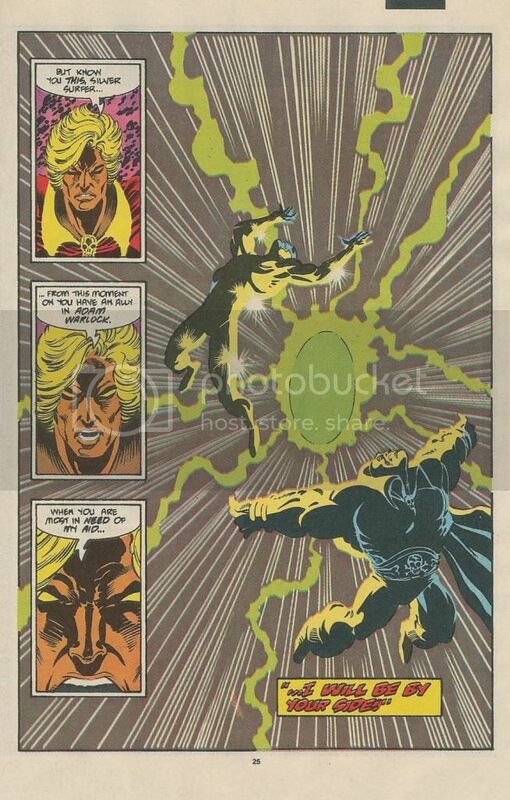 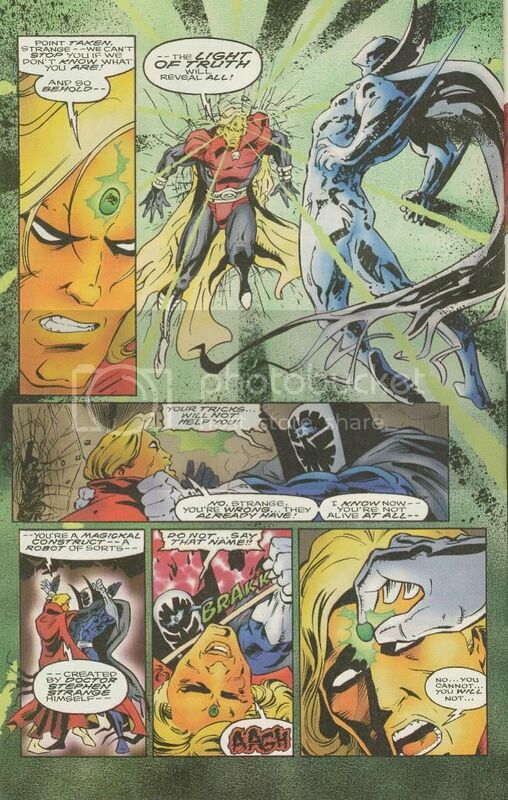 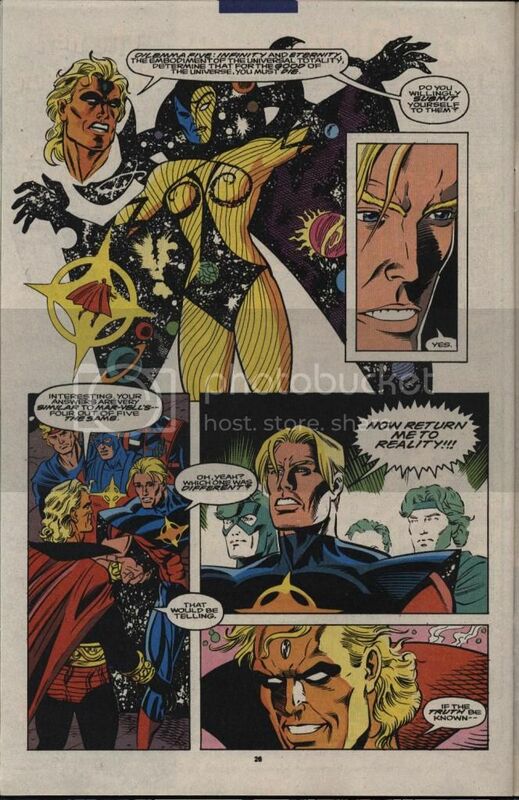 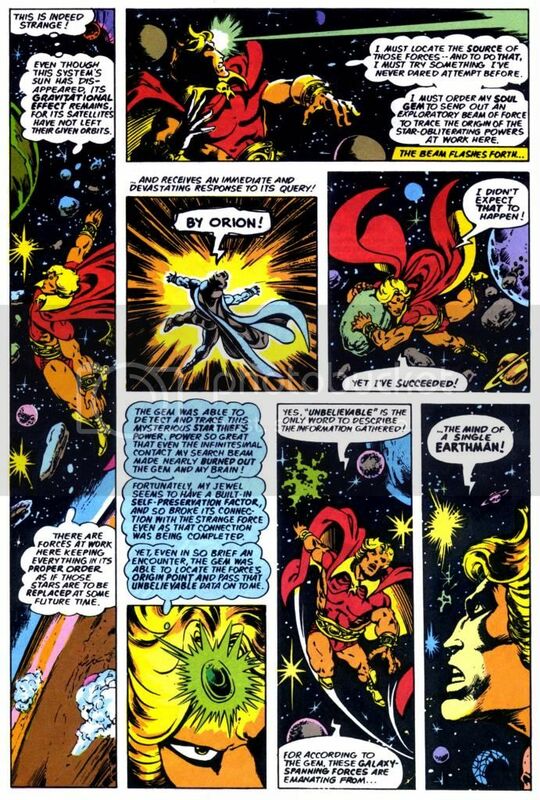 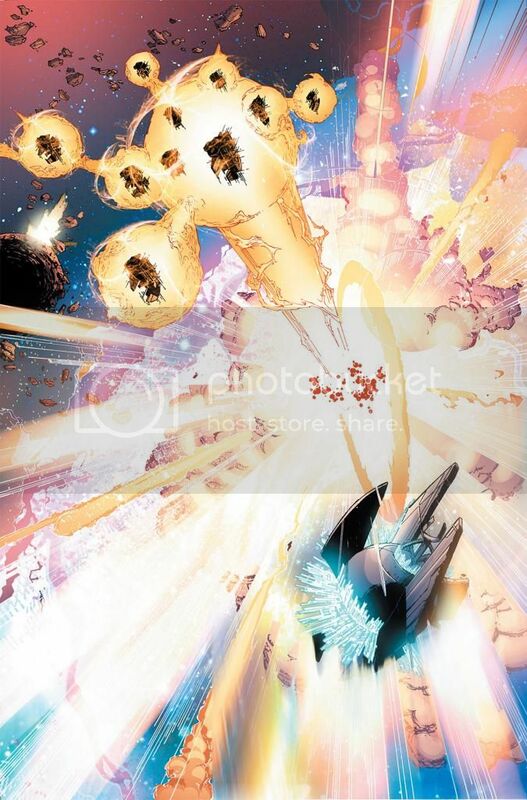 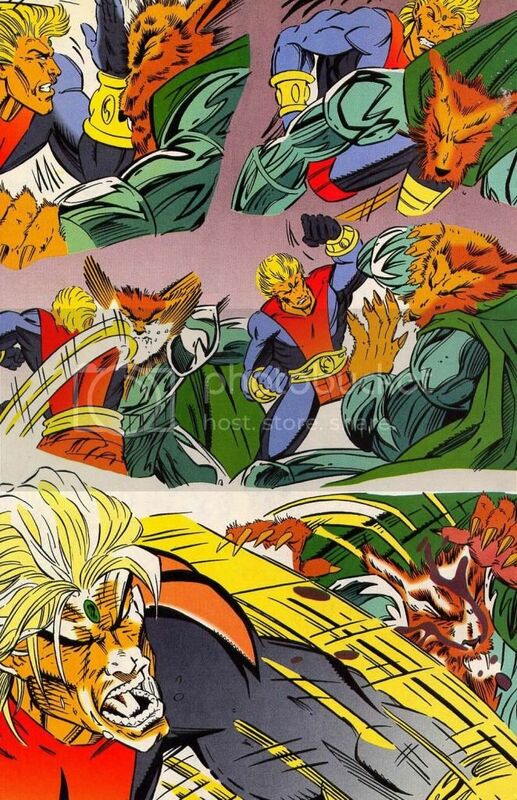 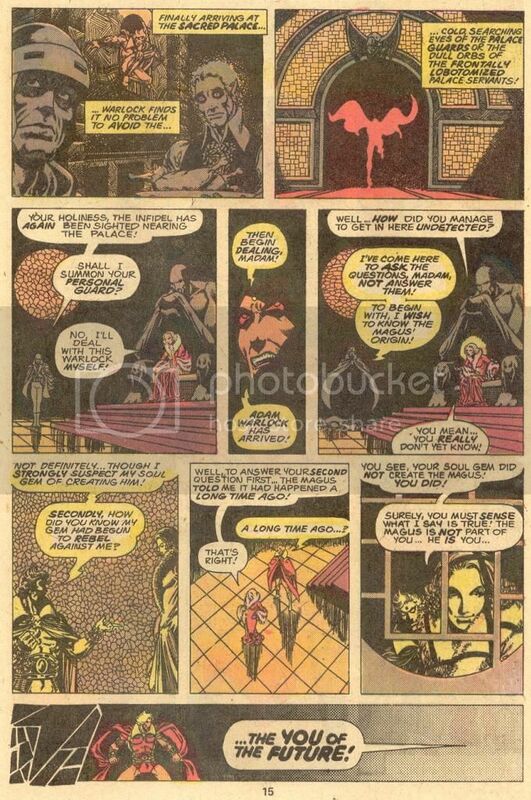 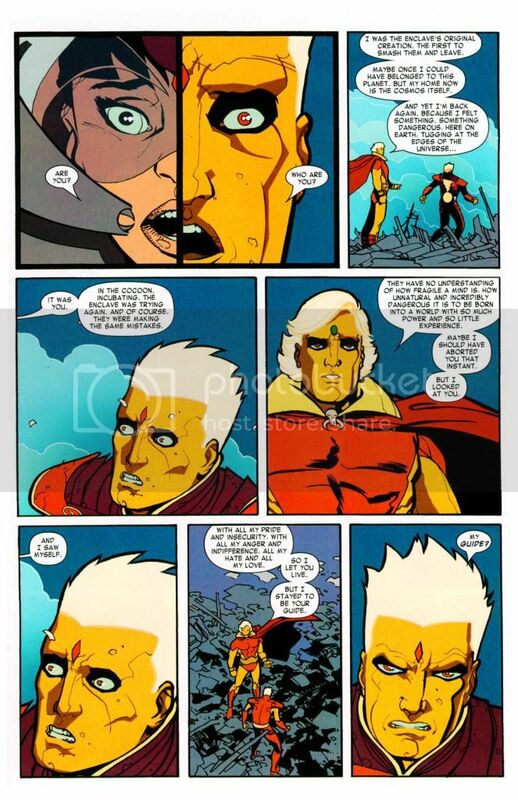 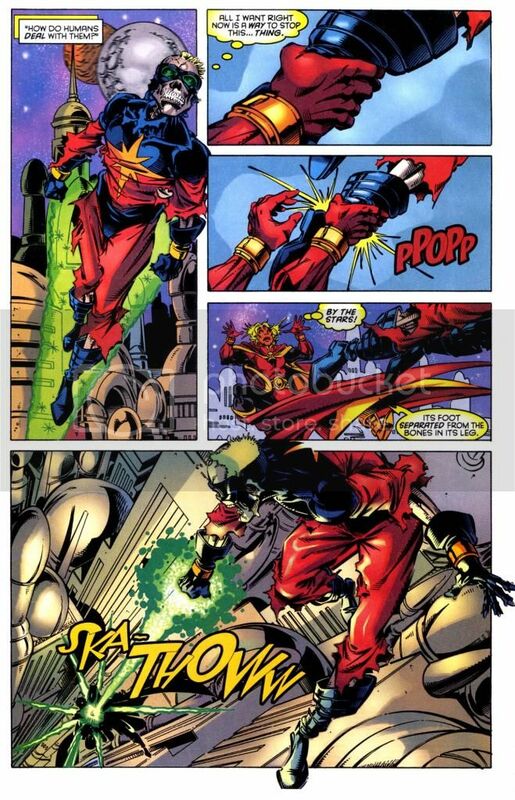 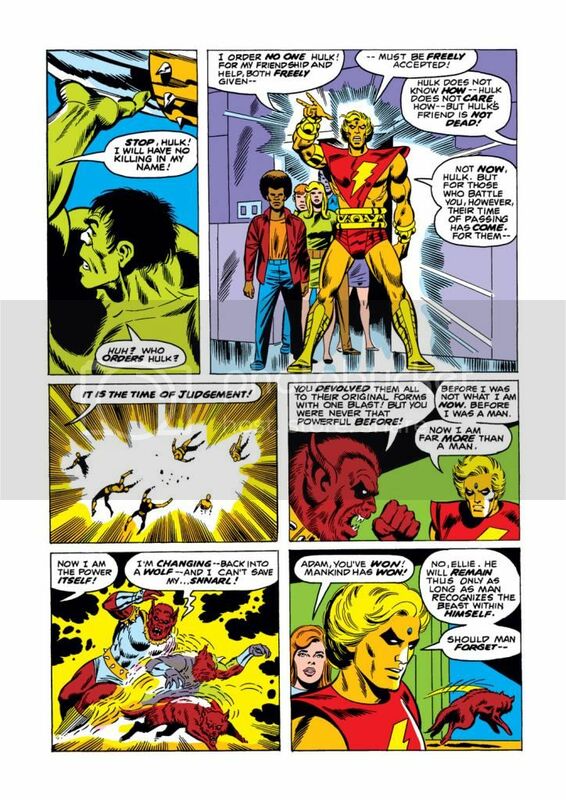 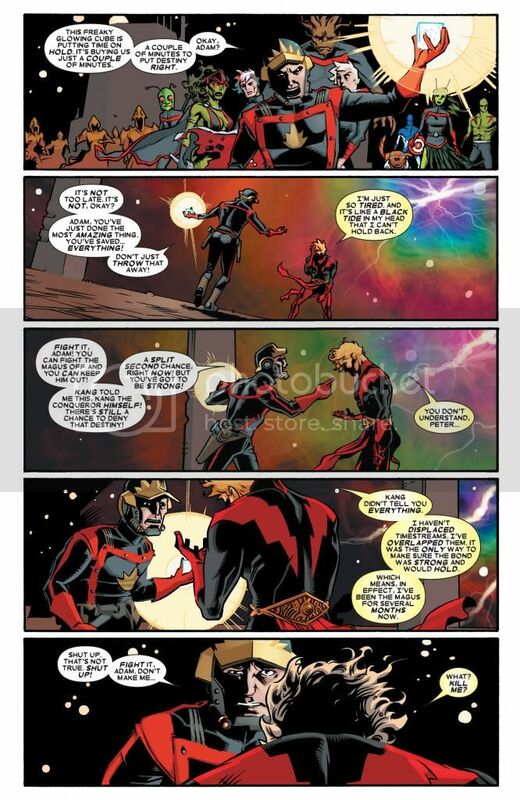 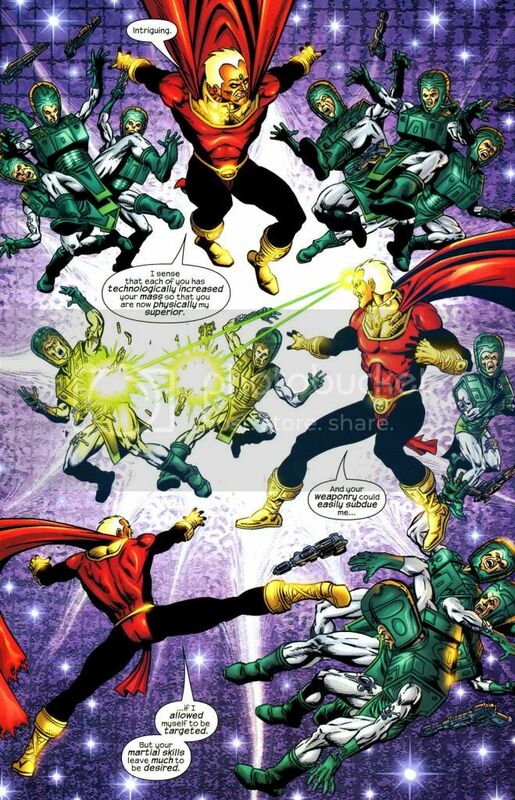 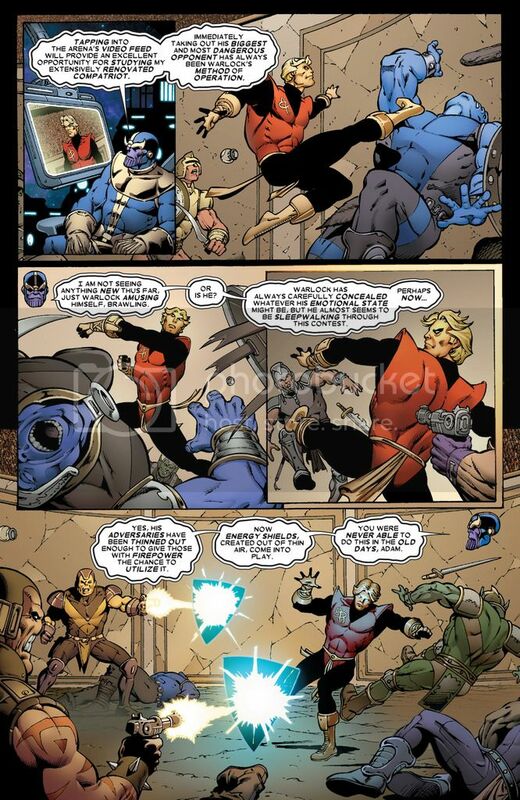 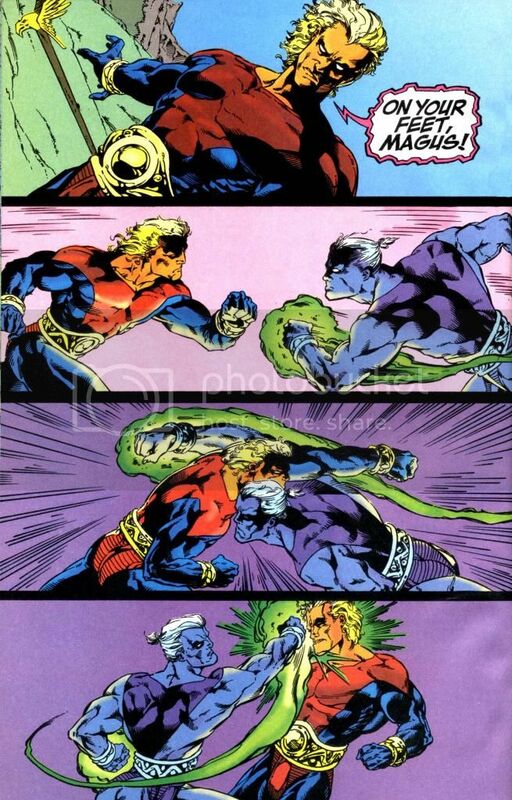 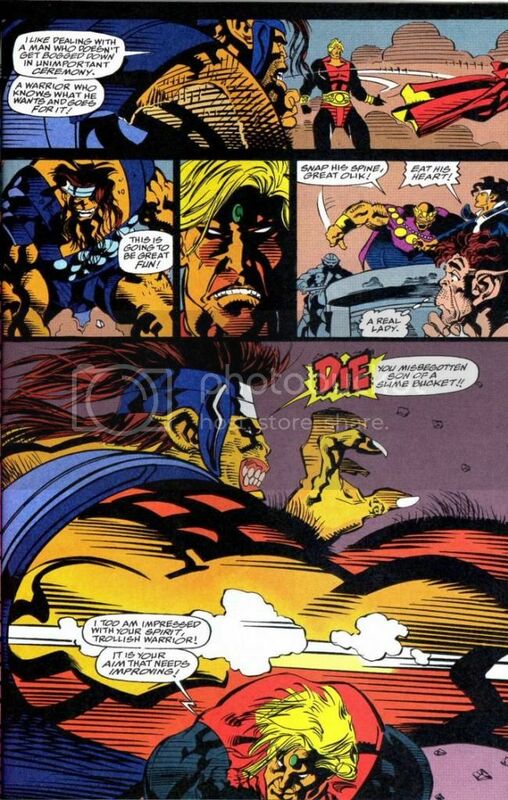 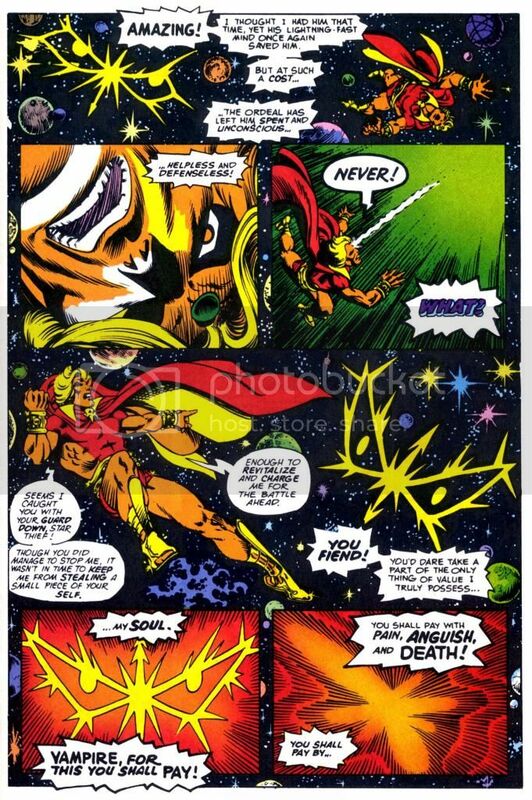 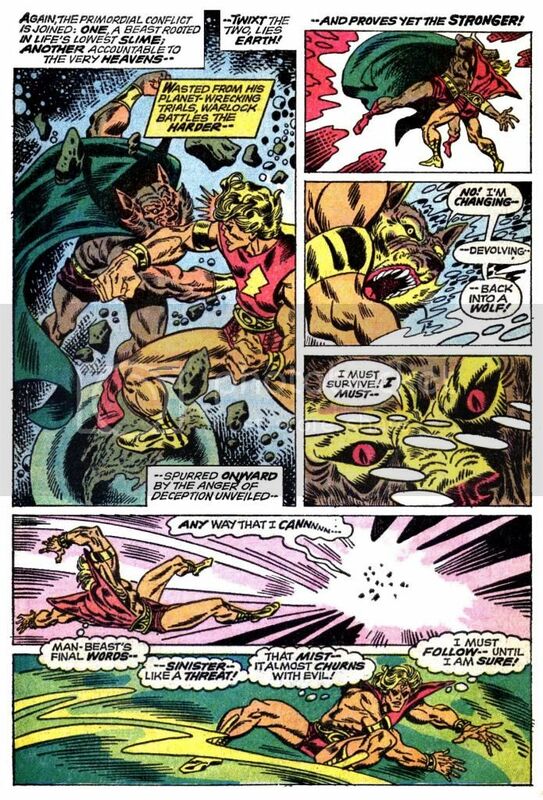 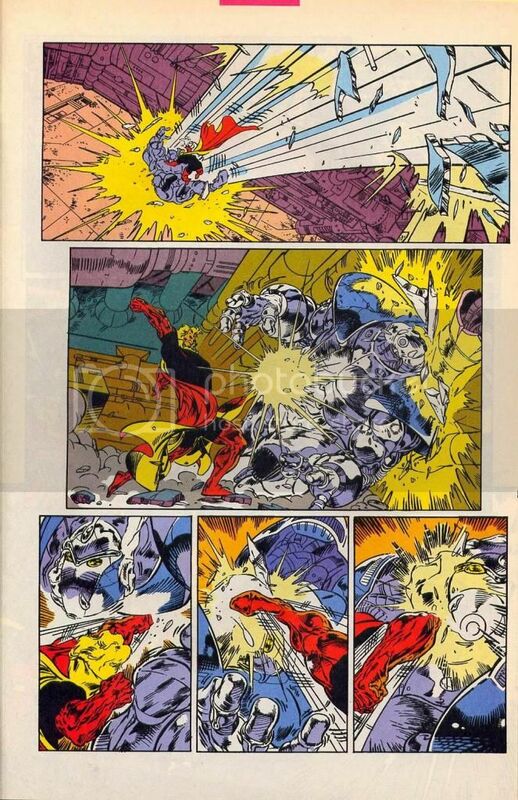 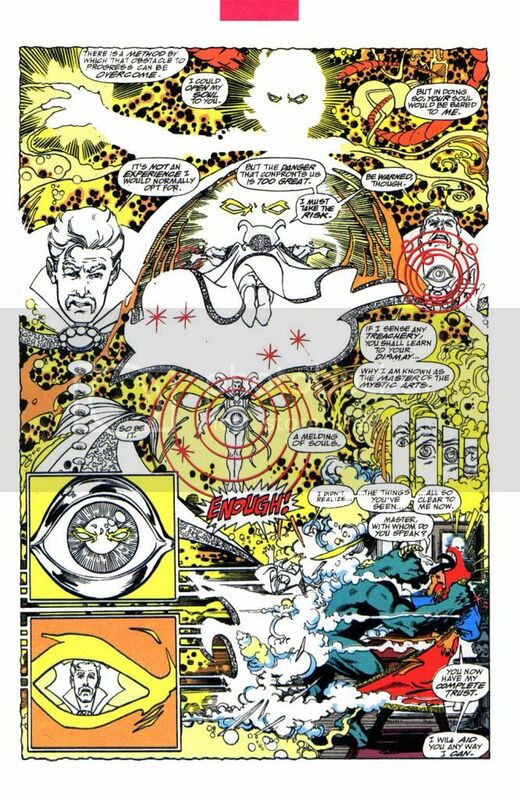 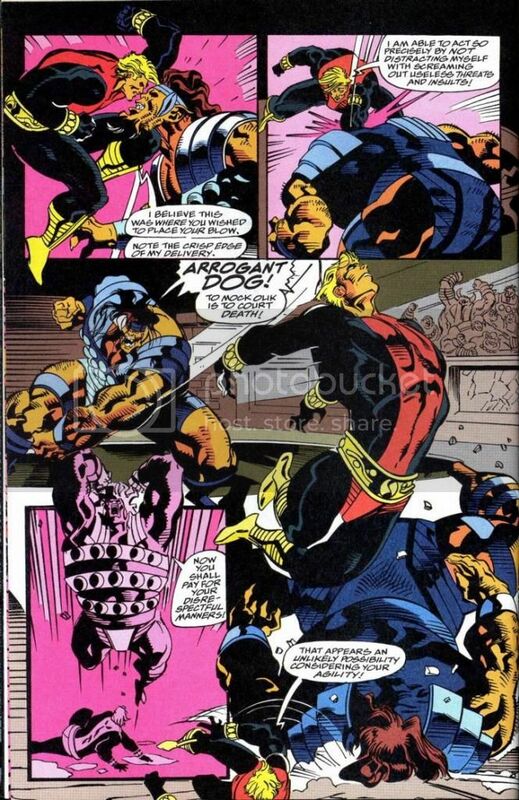 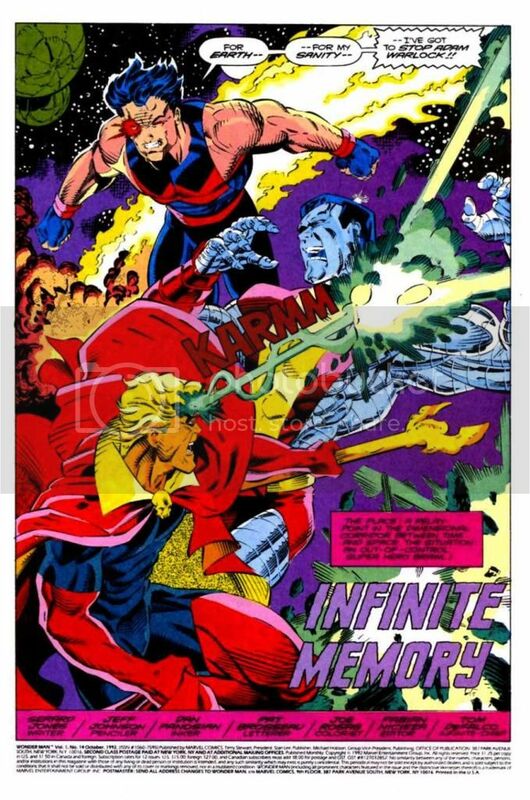 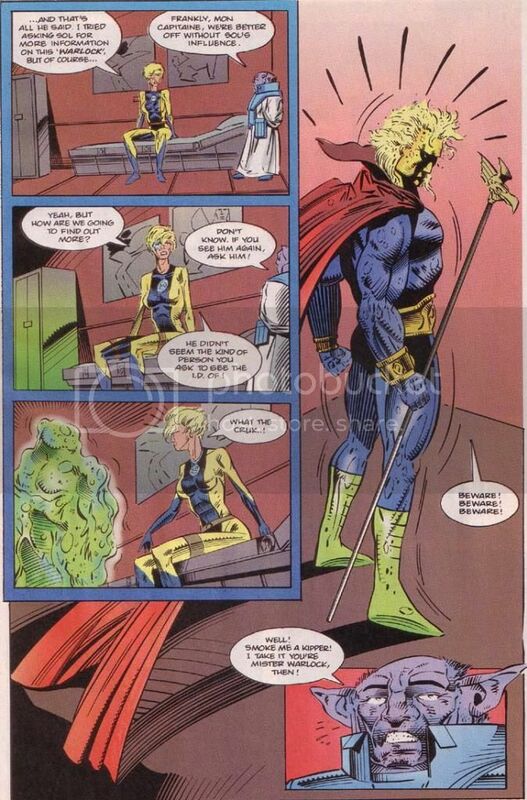 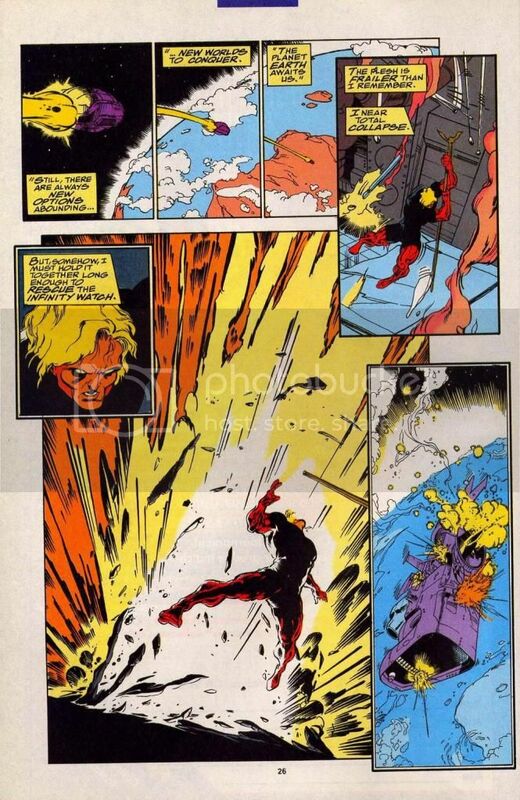 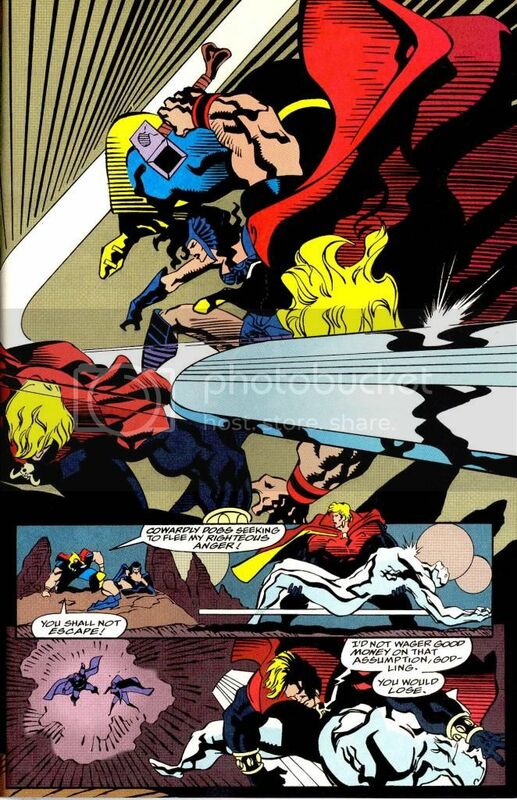 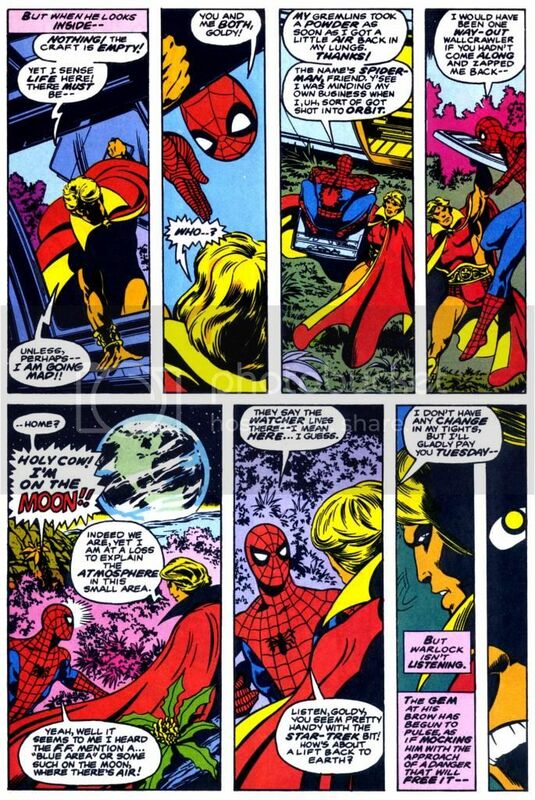 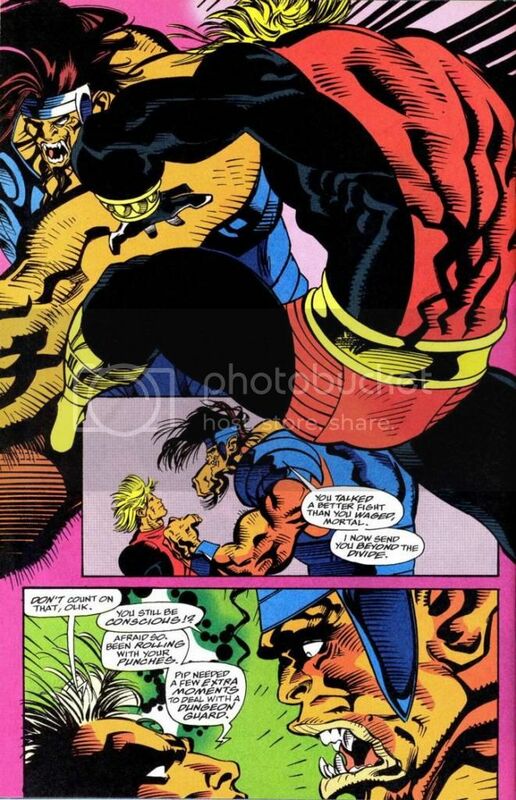 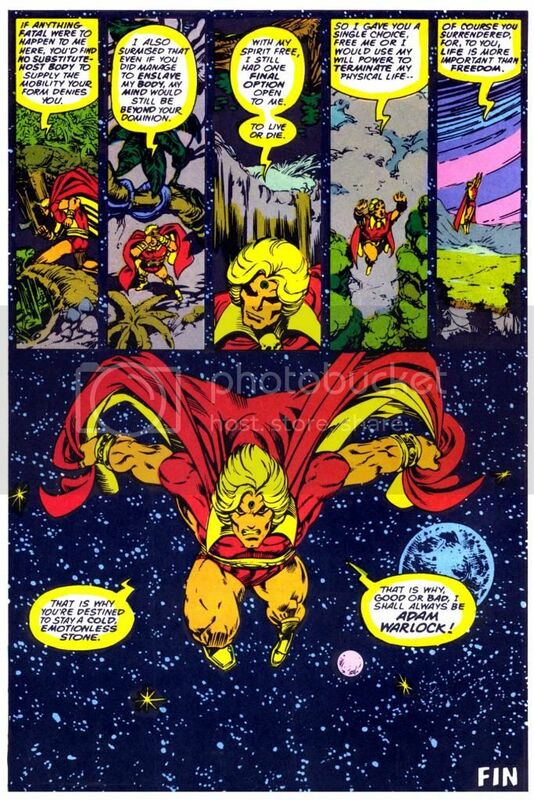 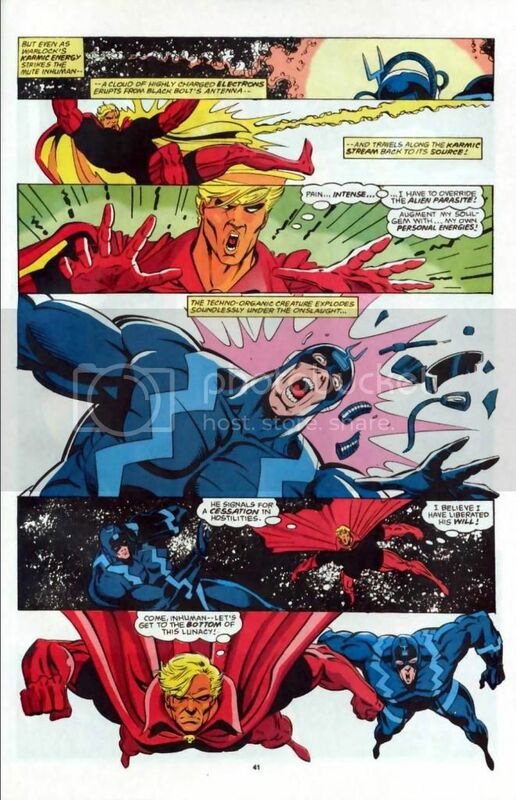 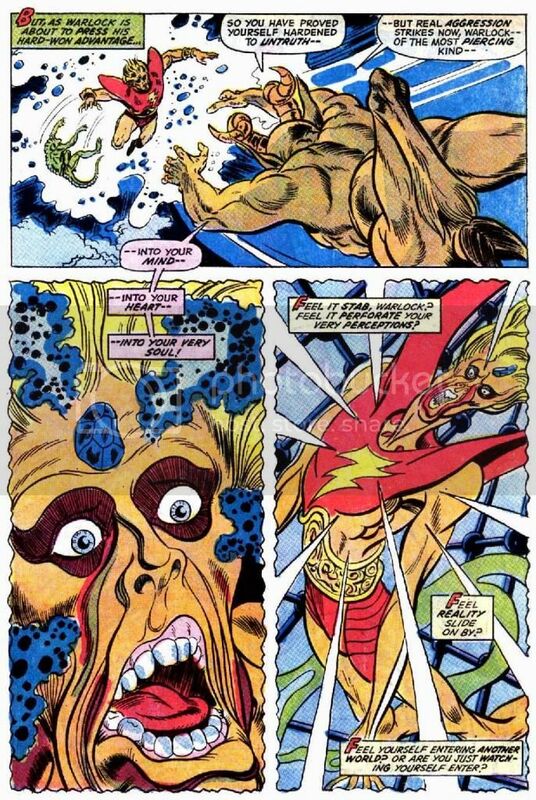 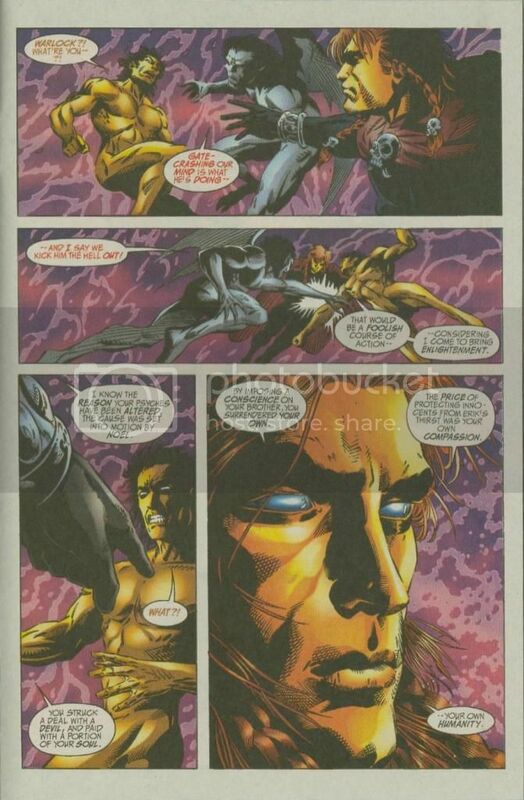 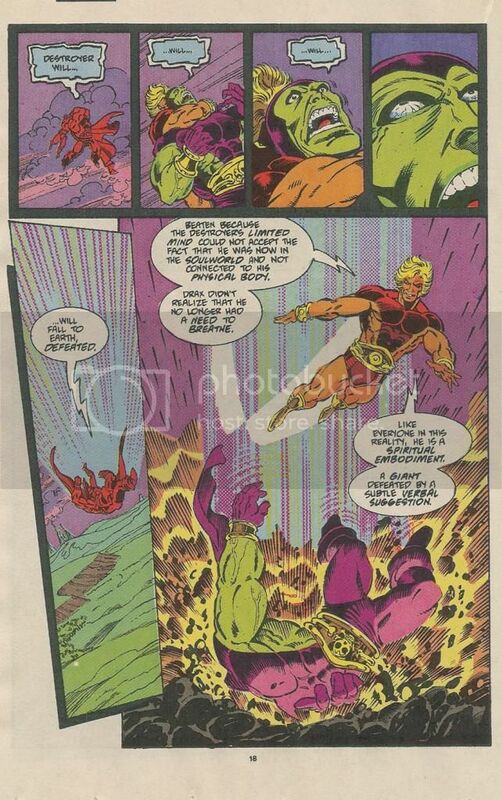 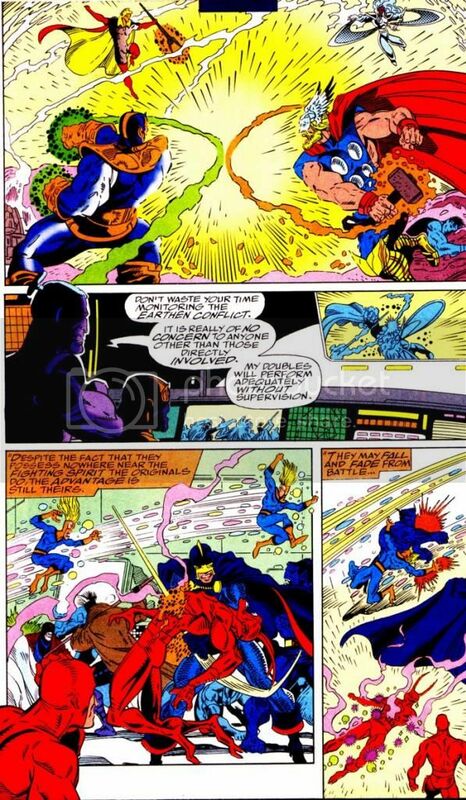 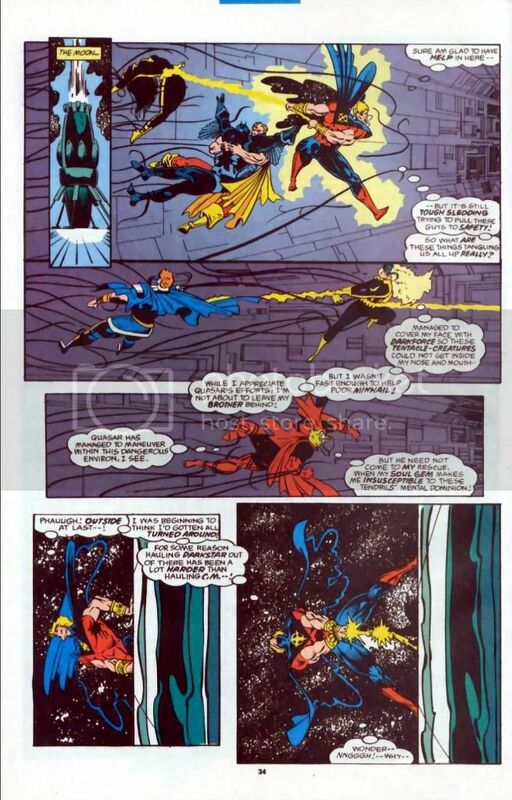 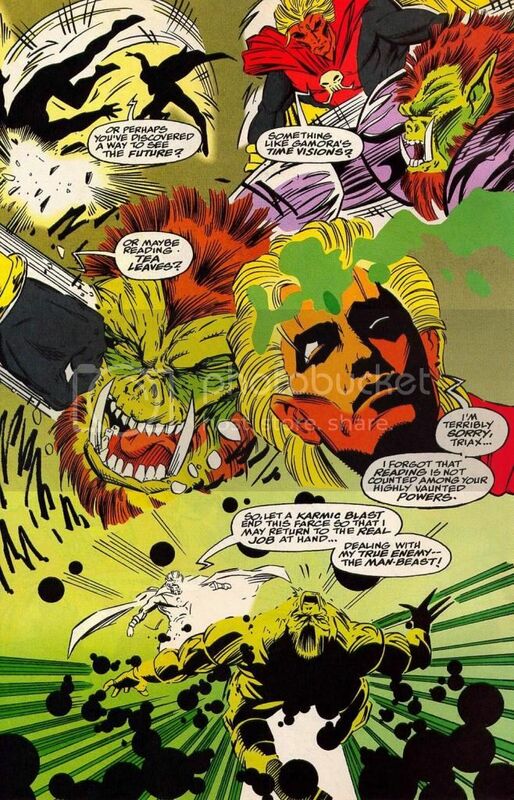 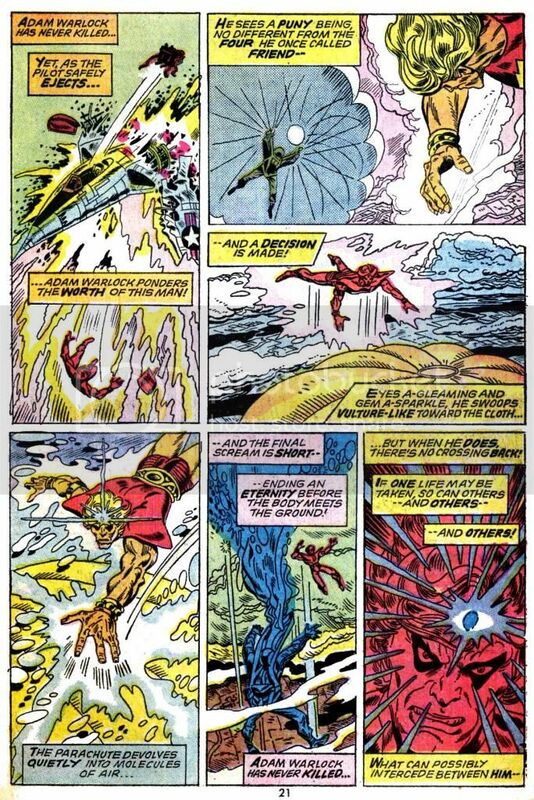 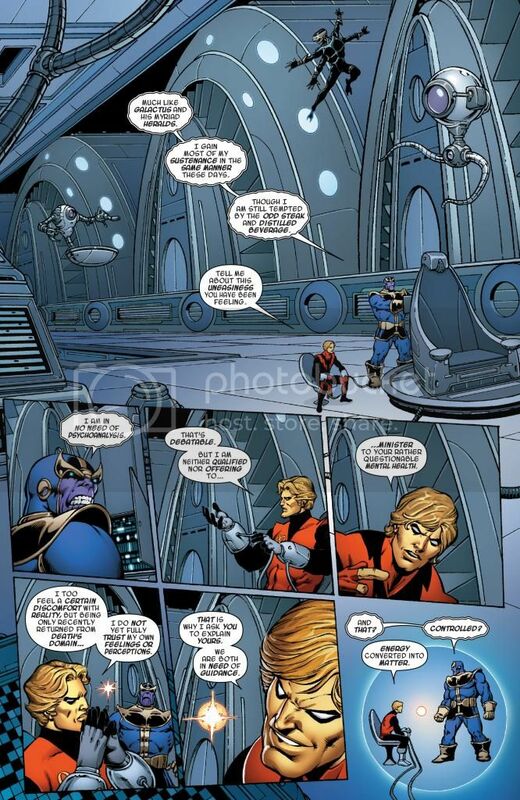 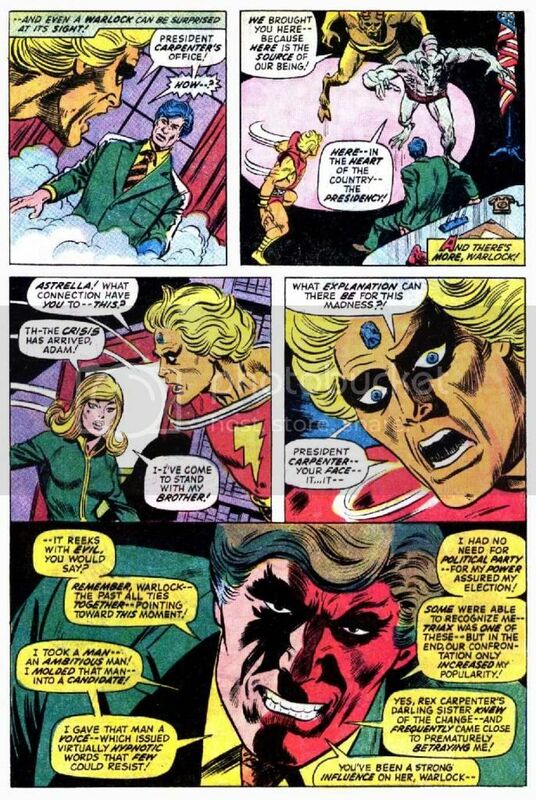 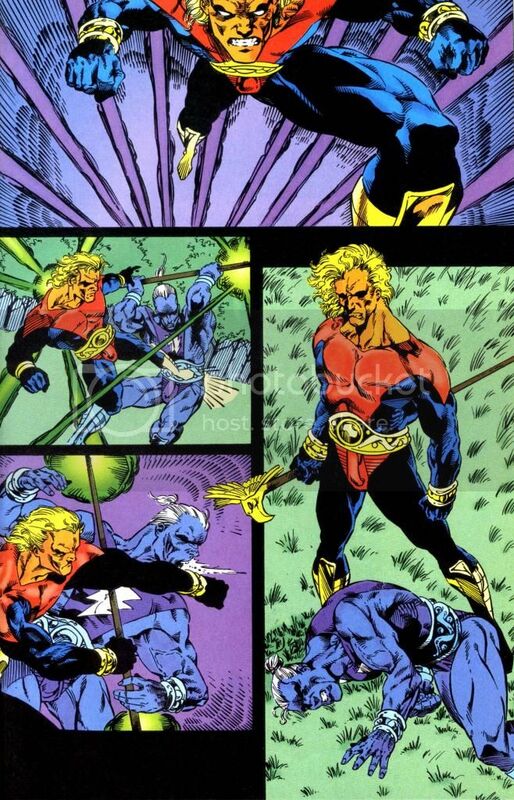 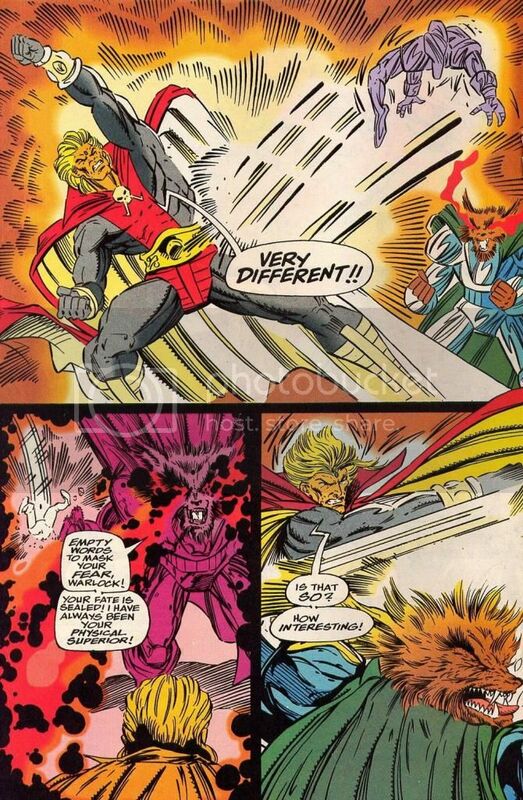 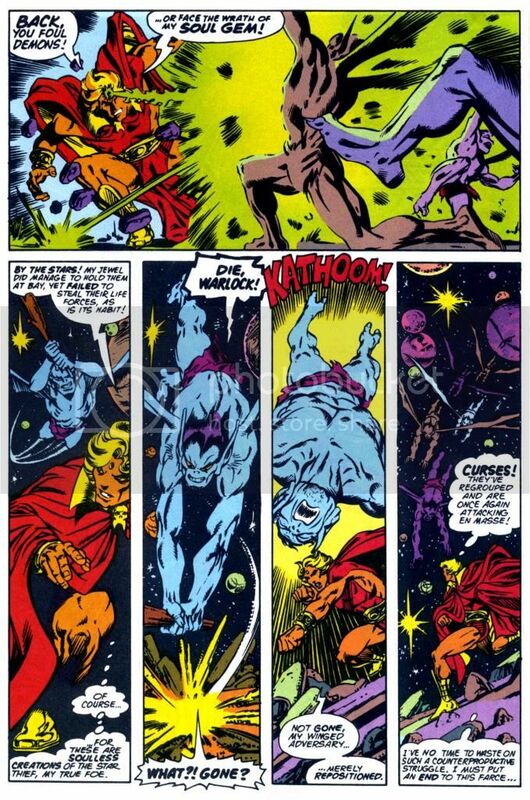 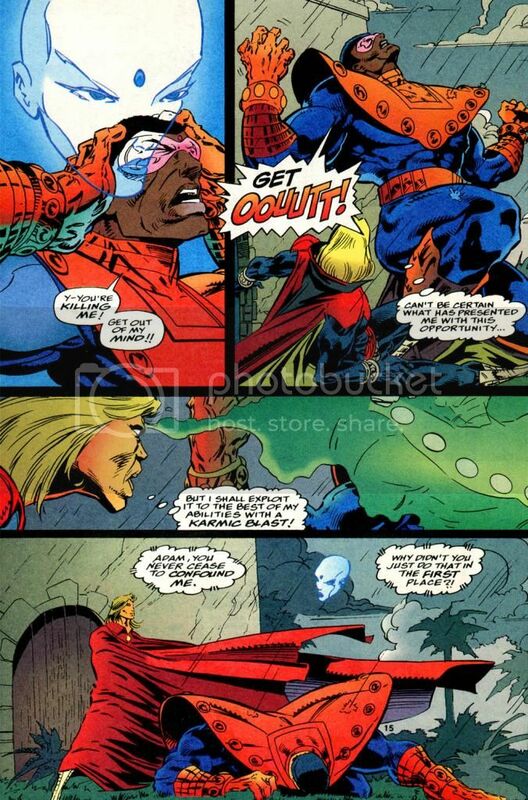 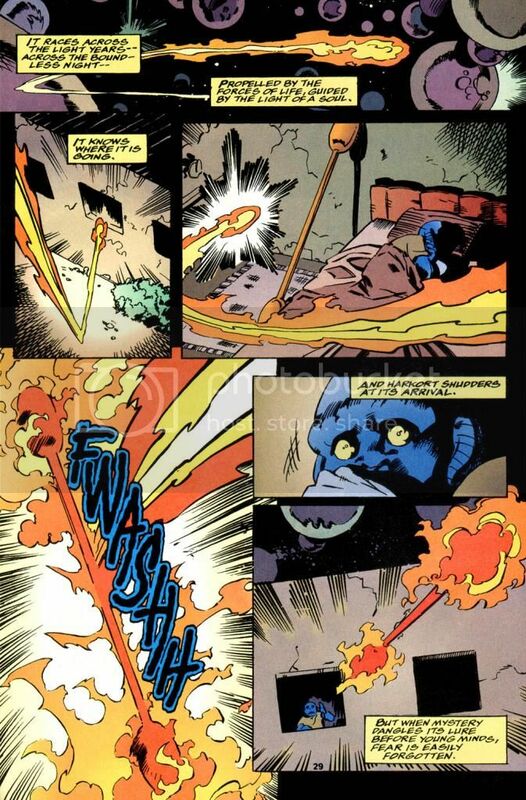 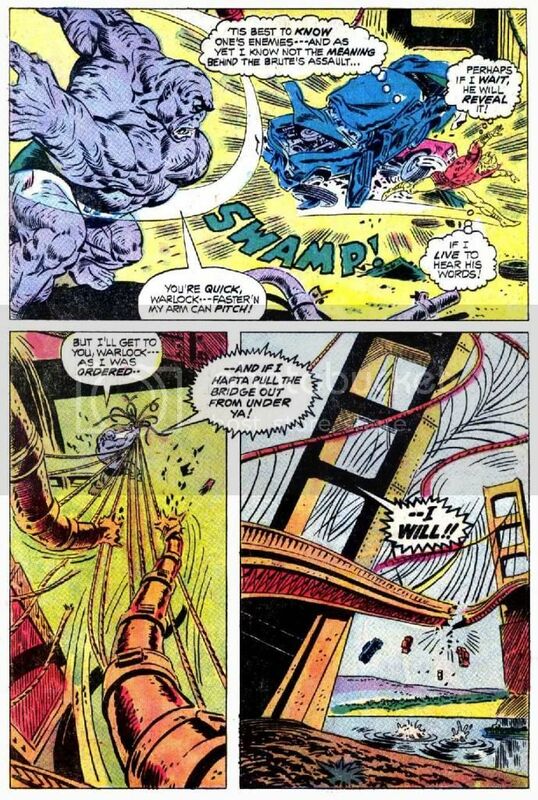 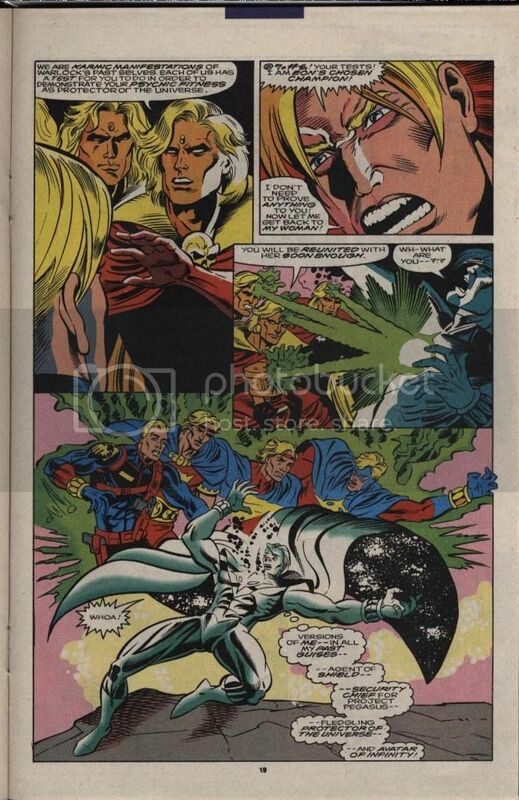 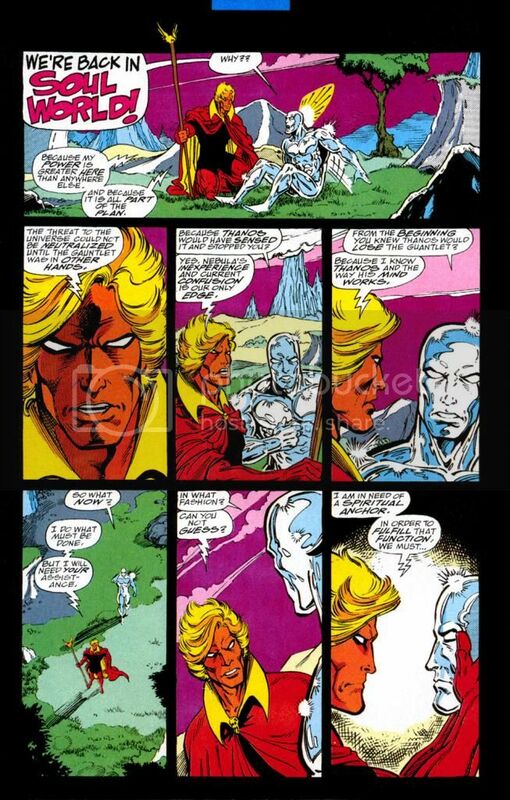 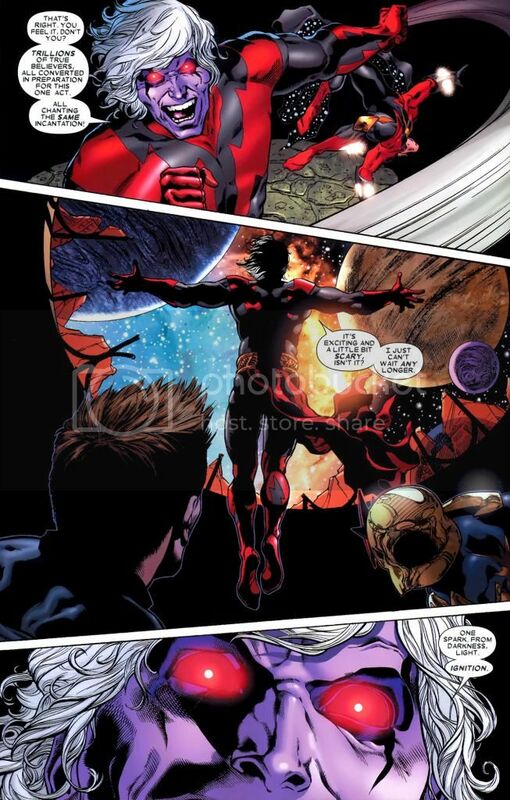 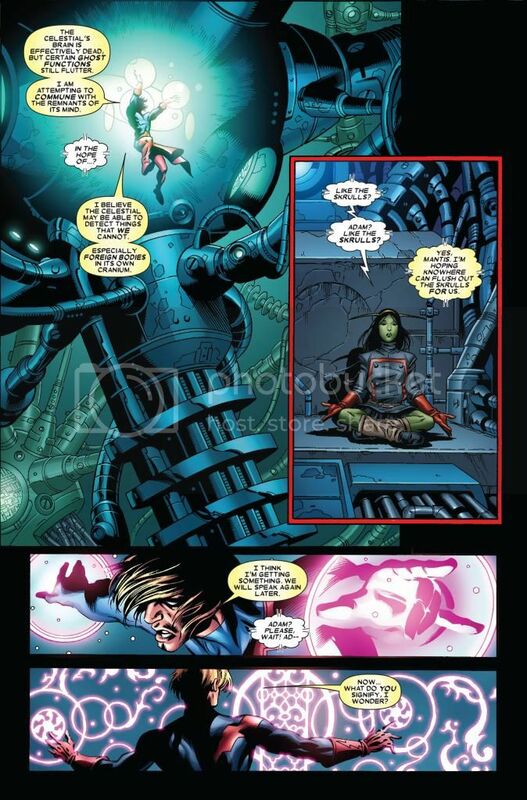 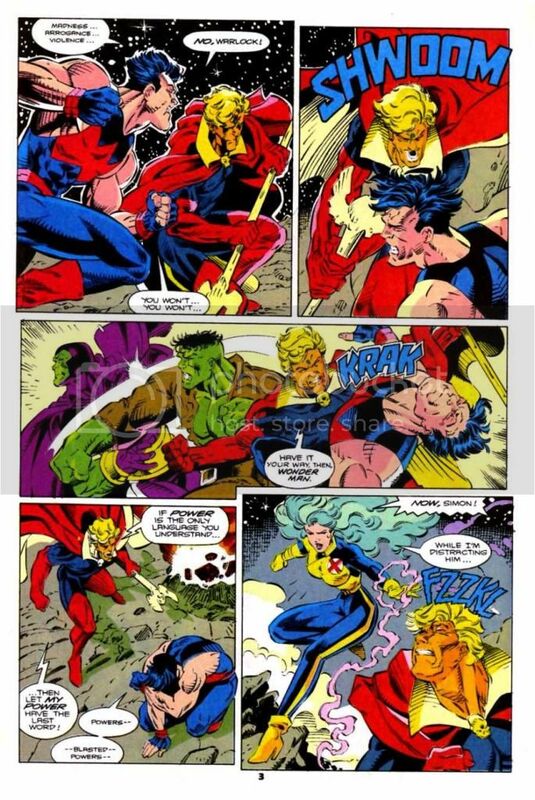 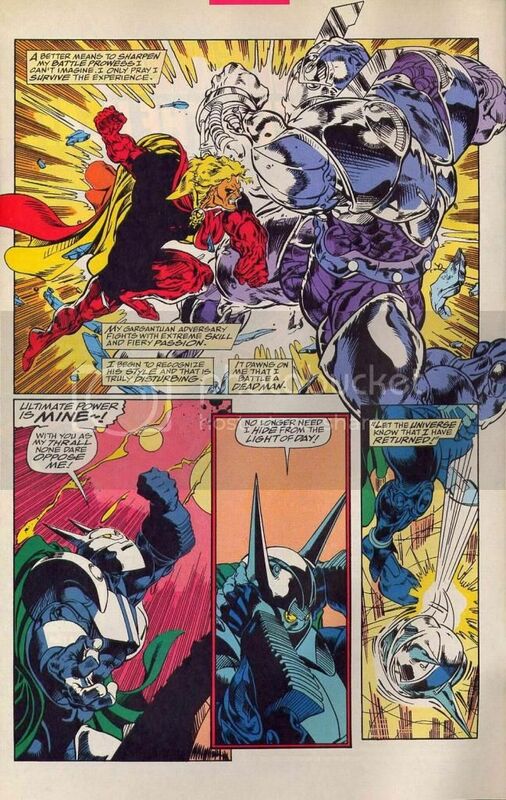 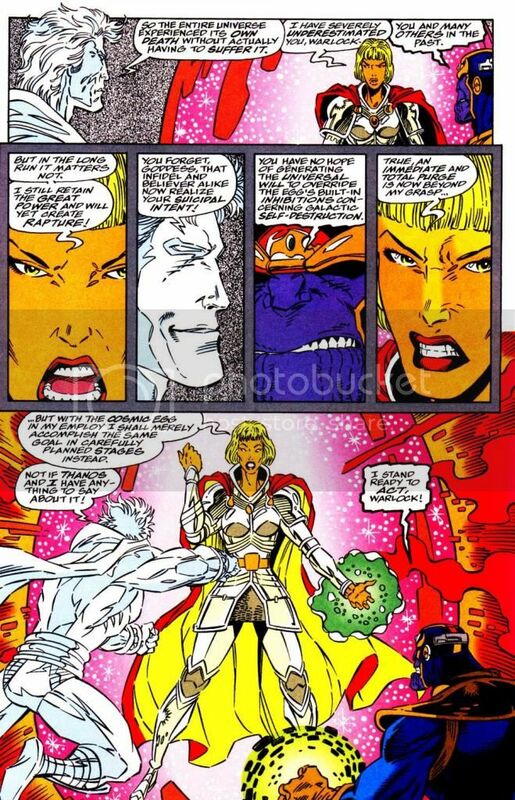 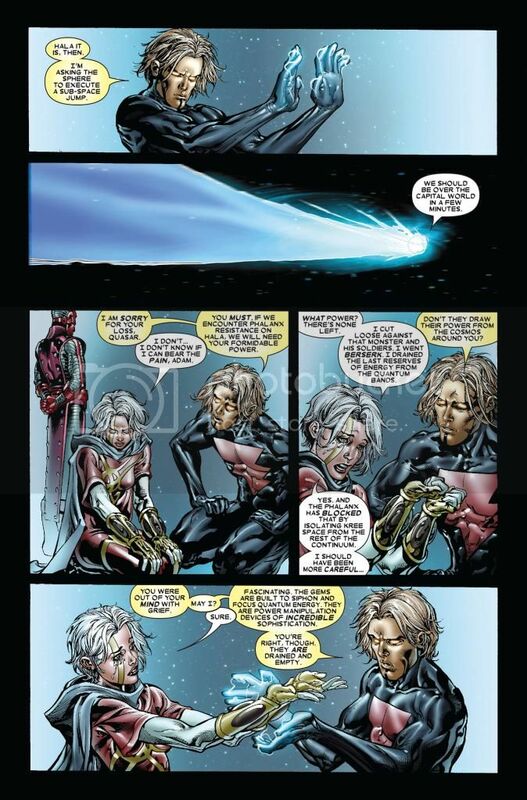 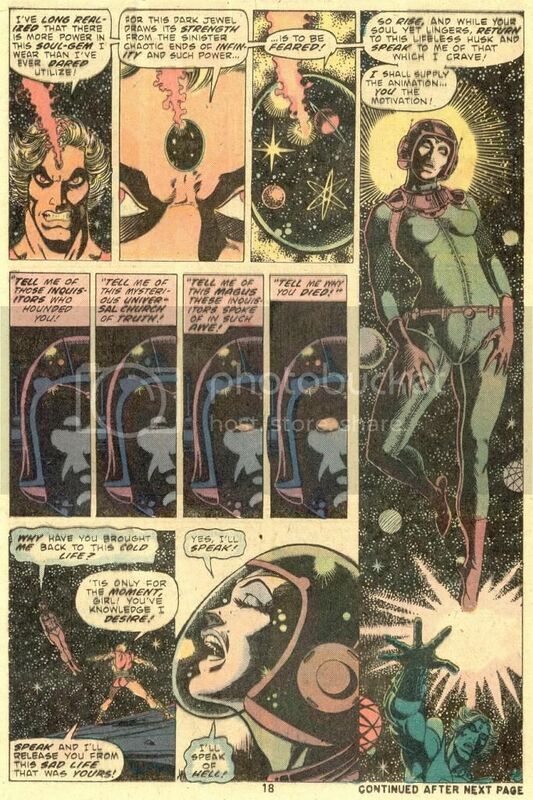 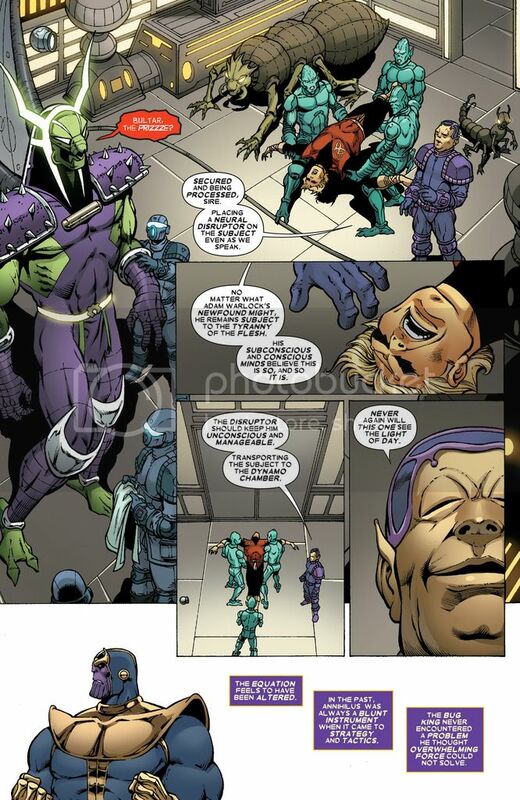 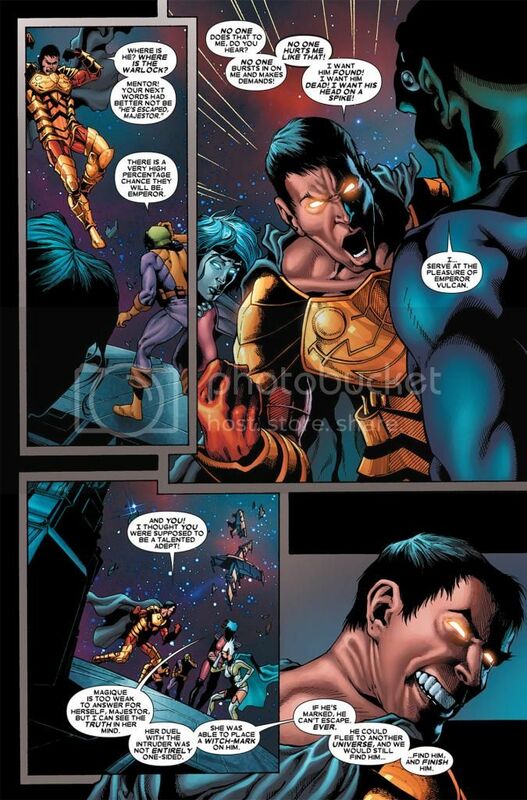 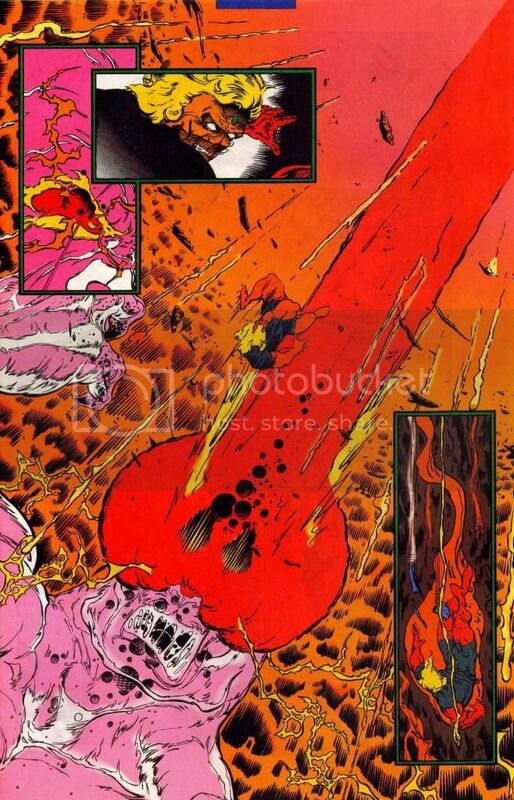 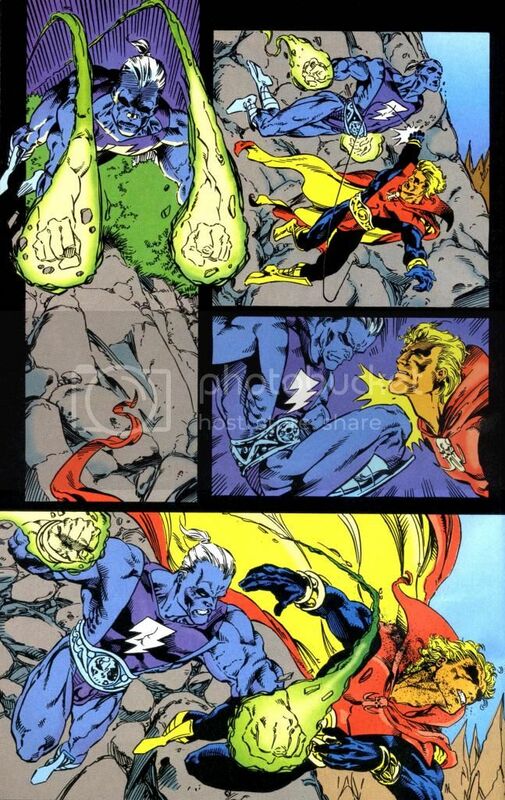 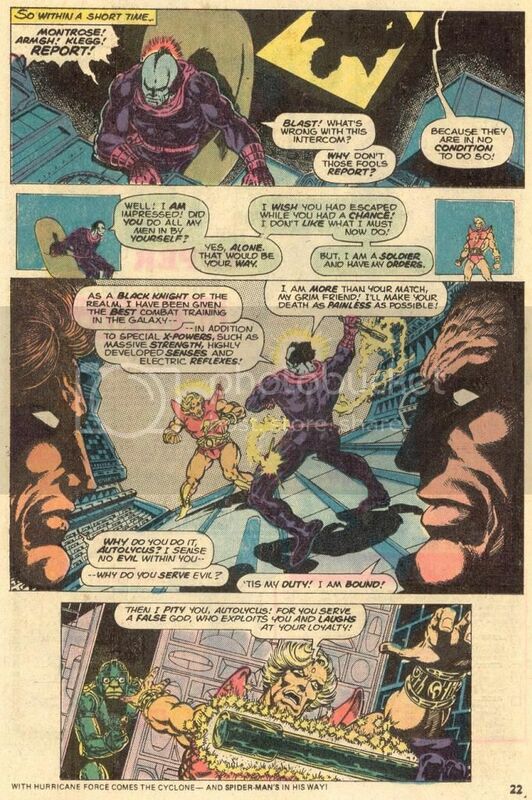 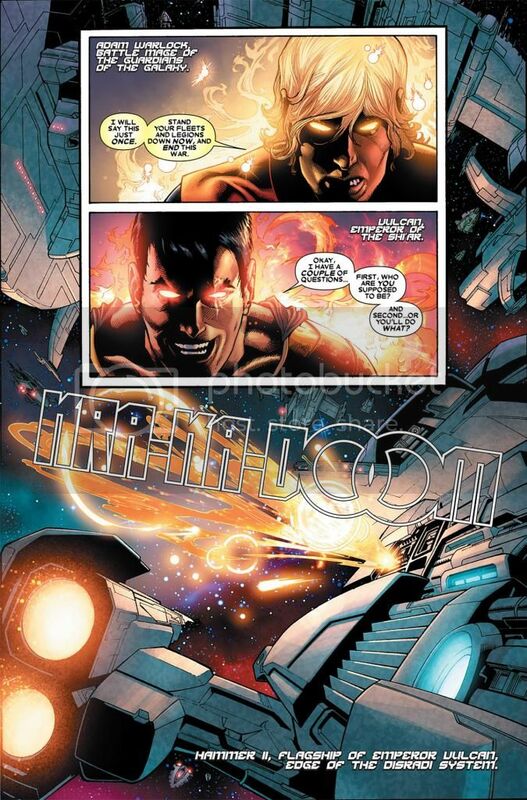 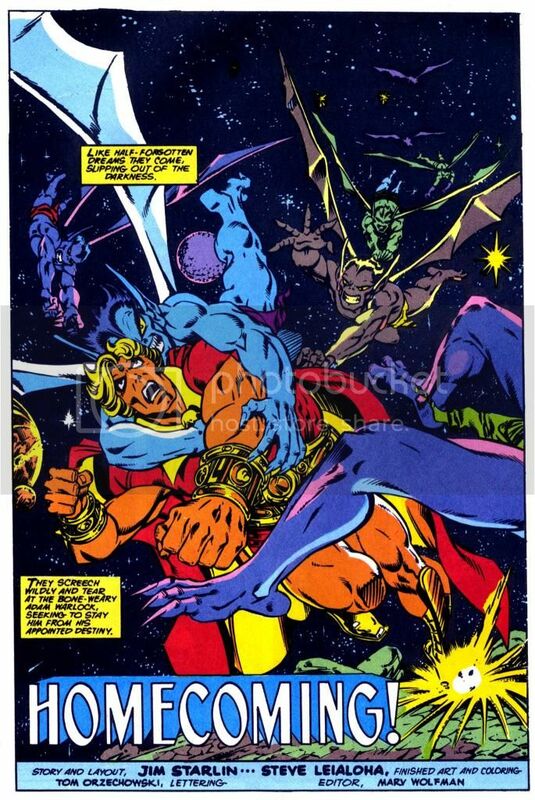 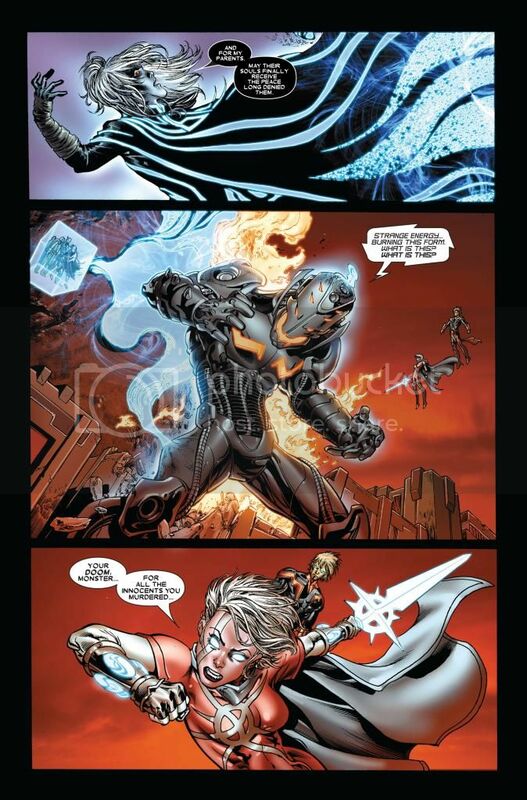 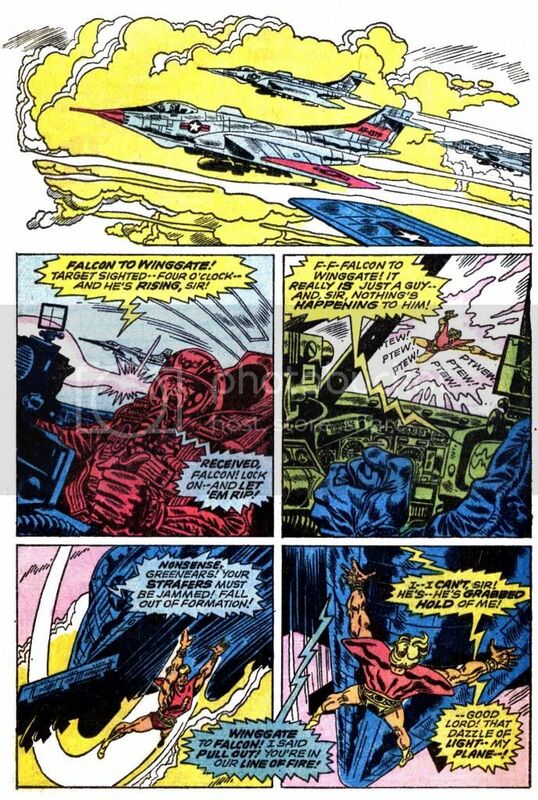 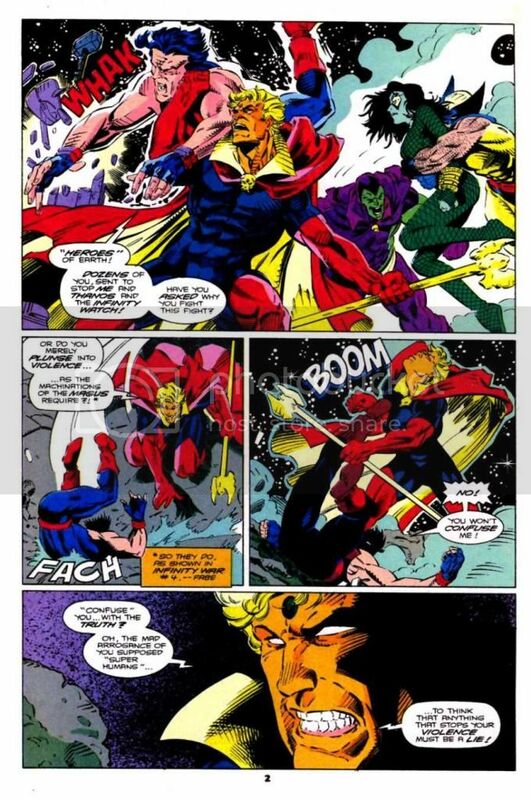 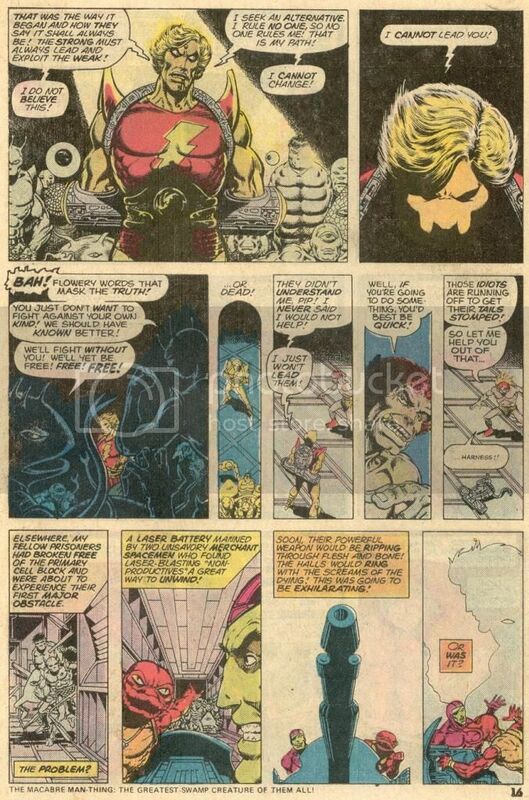 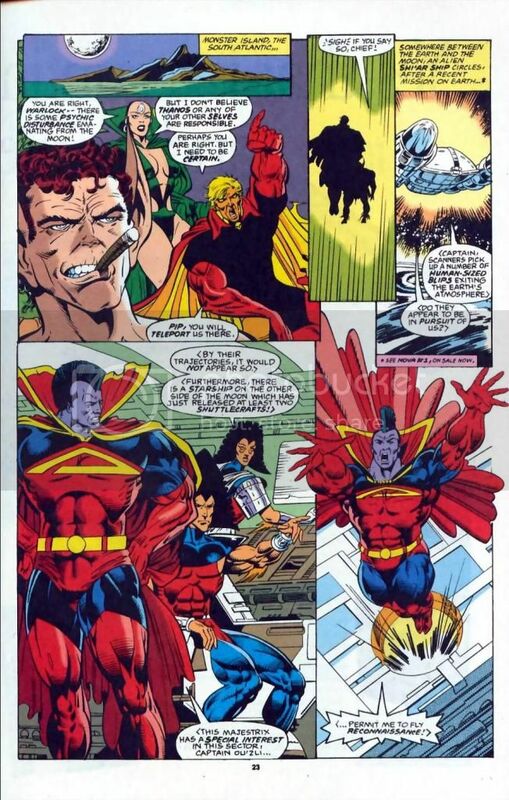 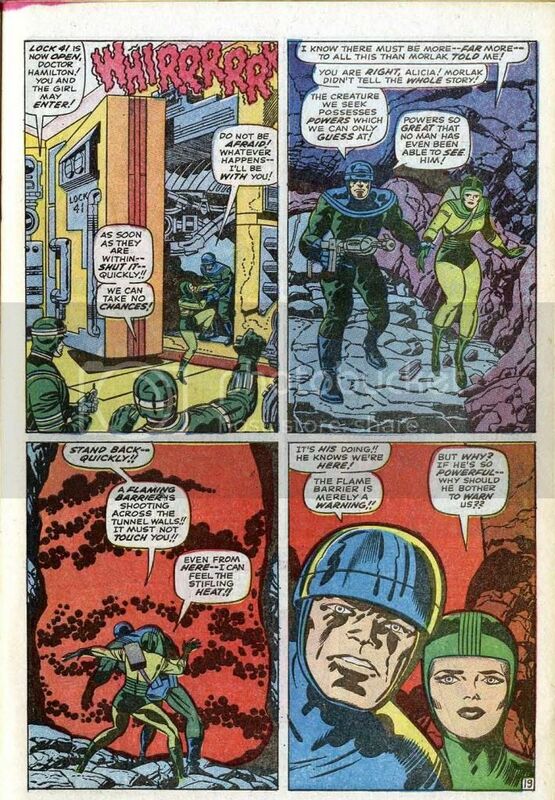 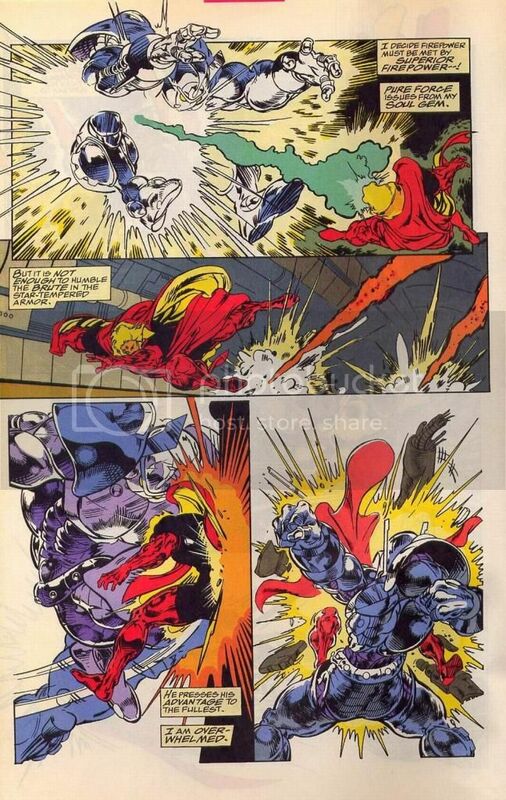 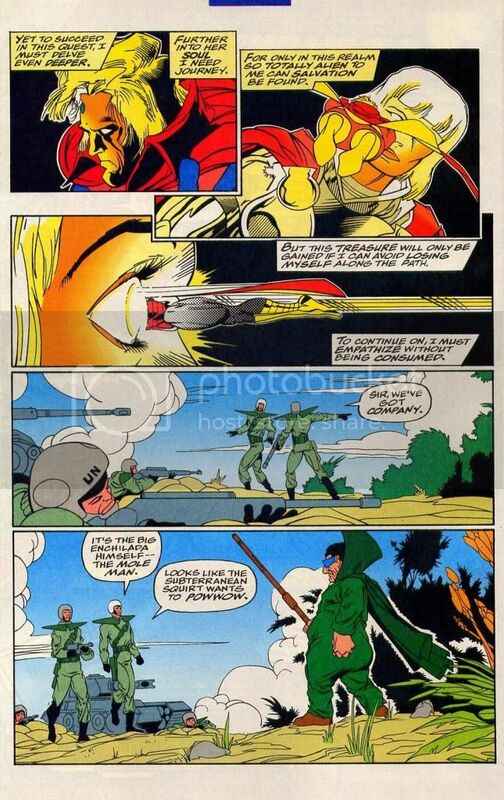 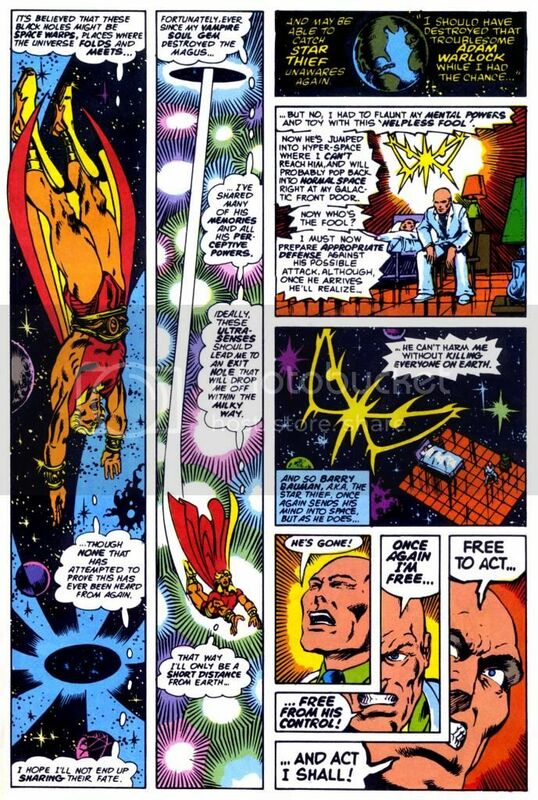 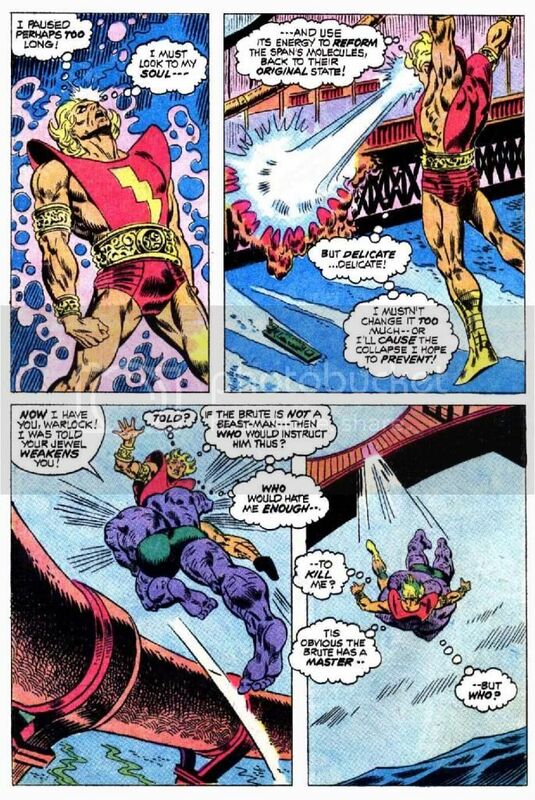 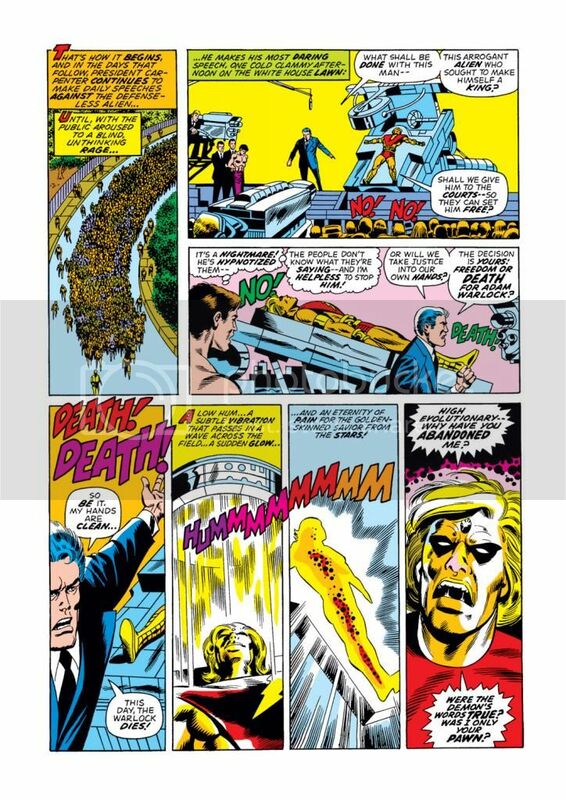 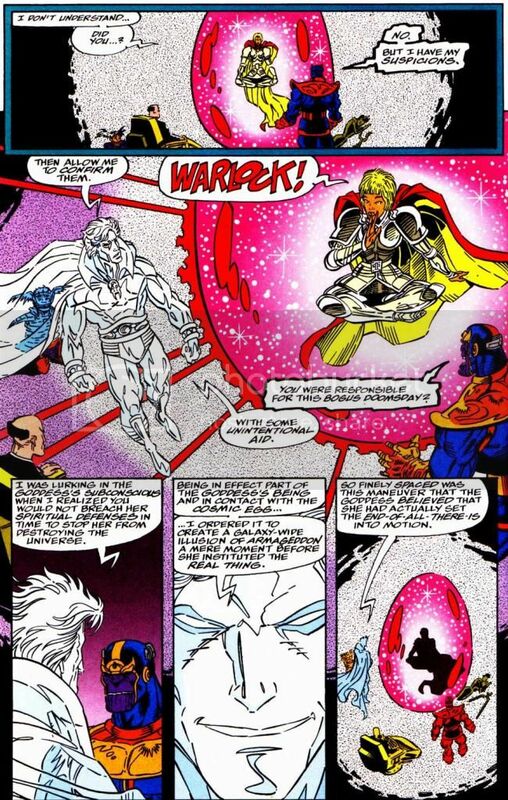 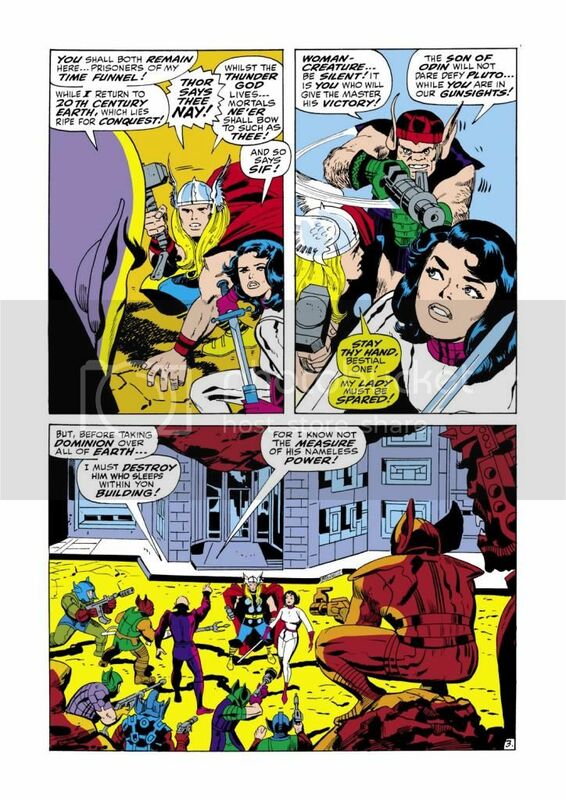 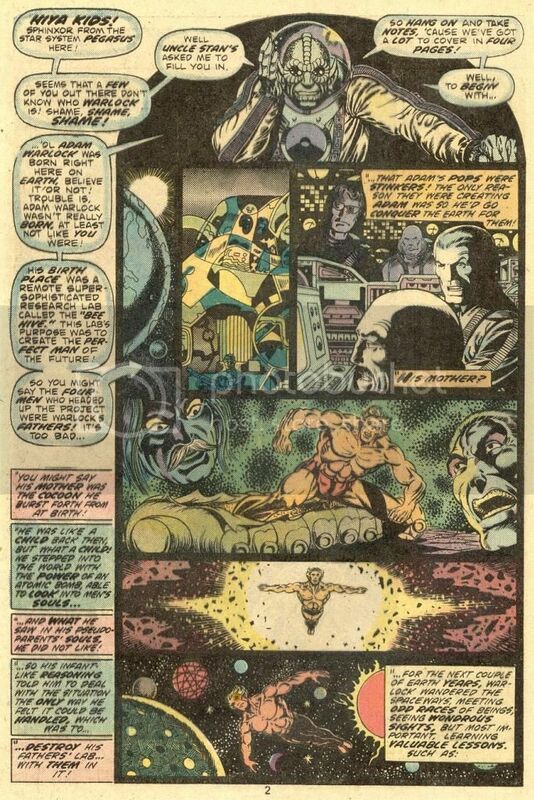 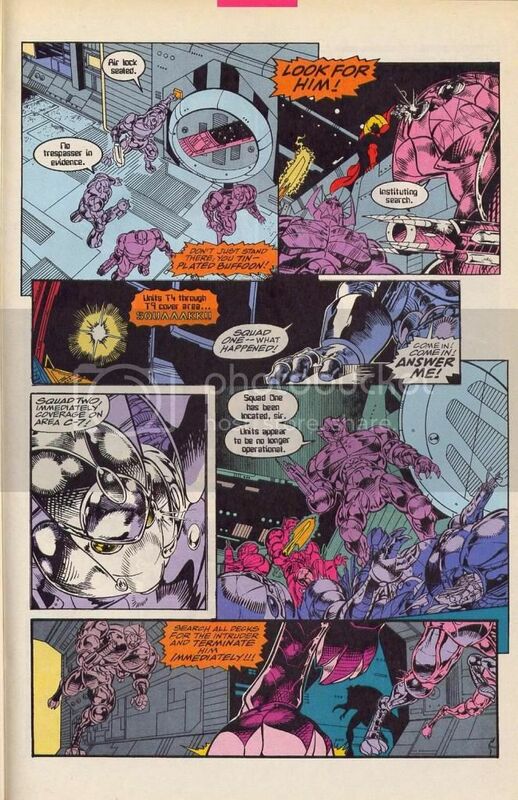 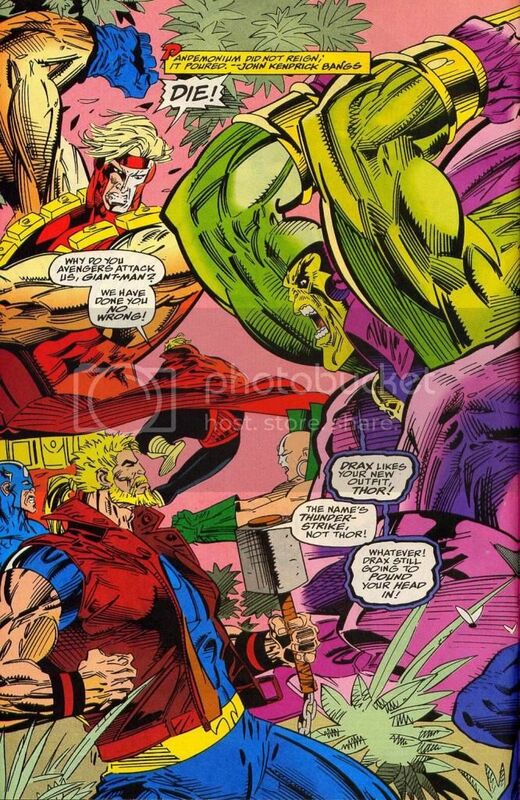 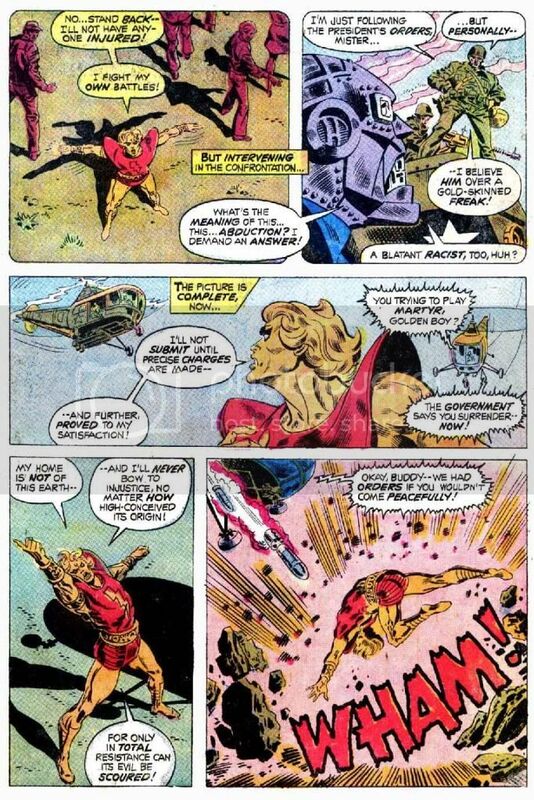 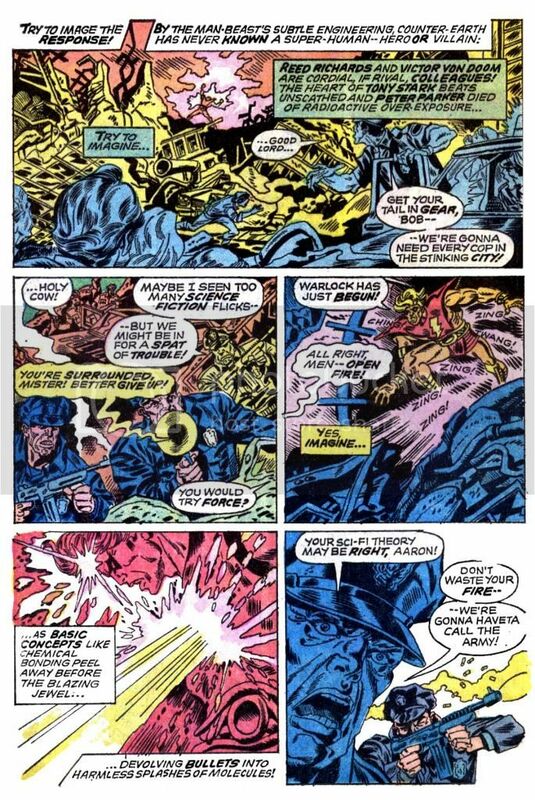 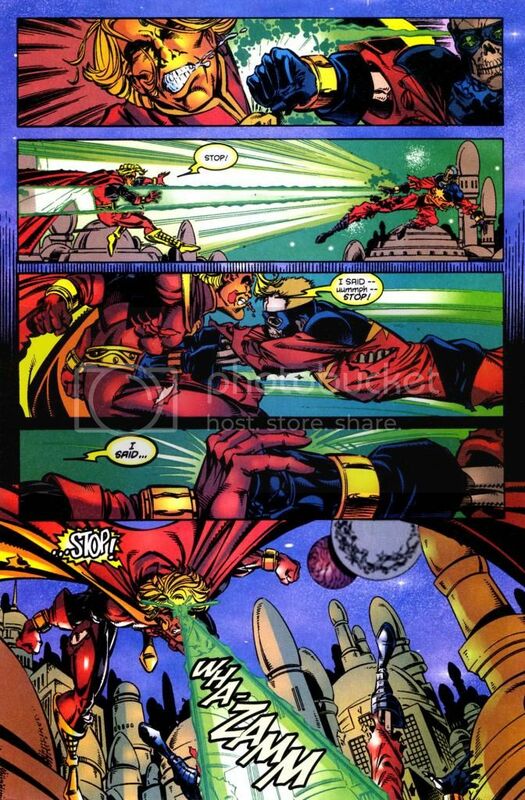 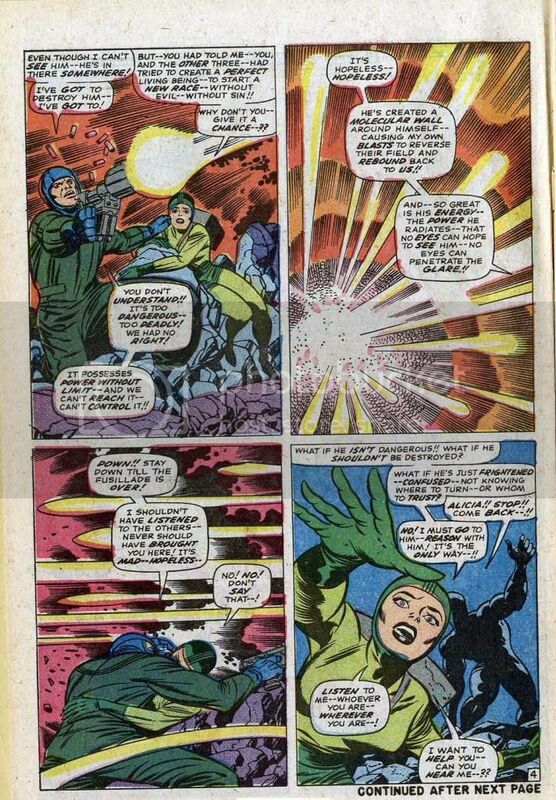 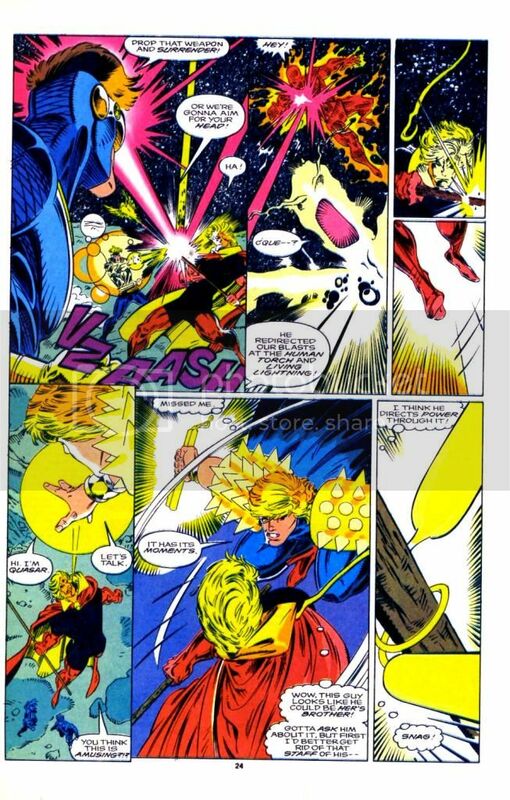 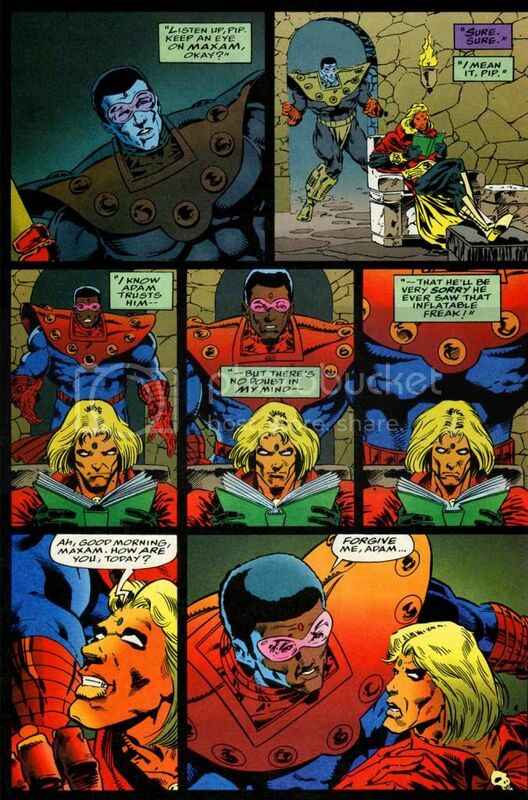 Worldmind tells Nova who at the time housed the full Nova Force that the Cancerverse Quasar is a significant threat to his safety, but Adam exceeds him in power to a degree that is impossible for the Worldmind to measure. 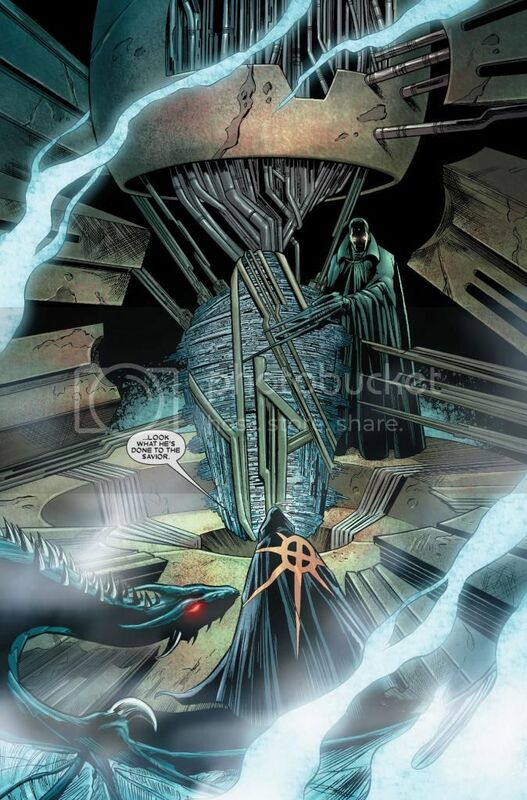 In the future, when Adam turns into future Magus by being in the cocoon for years, he gains vast power that Adam had forsaken when he left the cocoon prematurely the first time around. 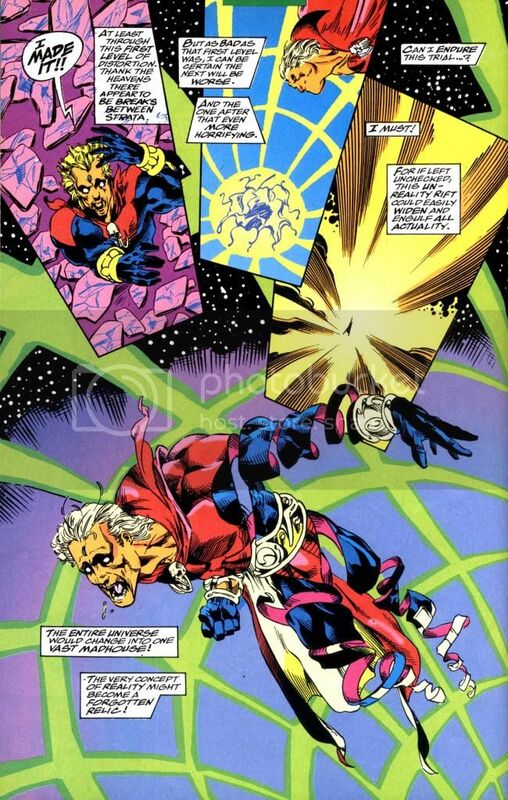 The Magus: "The very fabrics of time, space, soul and mind are mine to command. 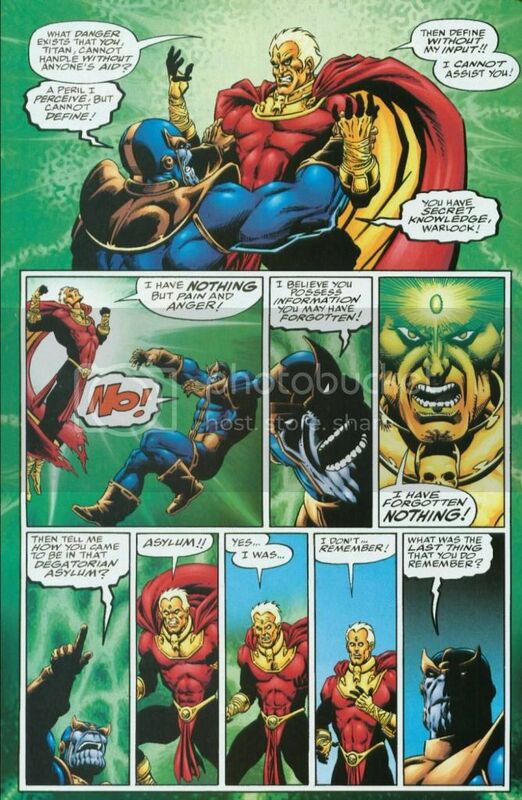 I am power absolute. 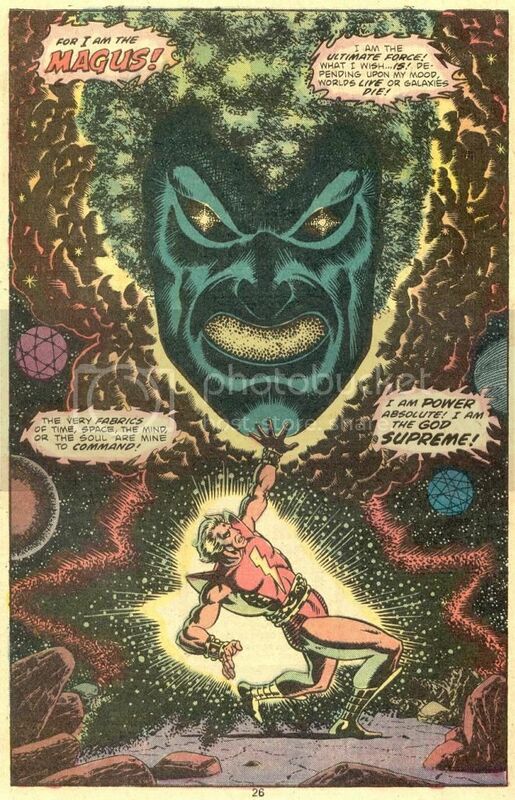 I am the god supreme." 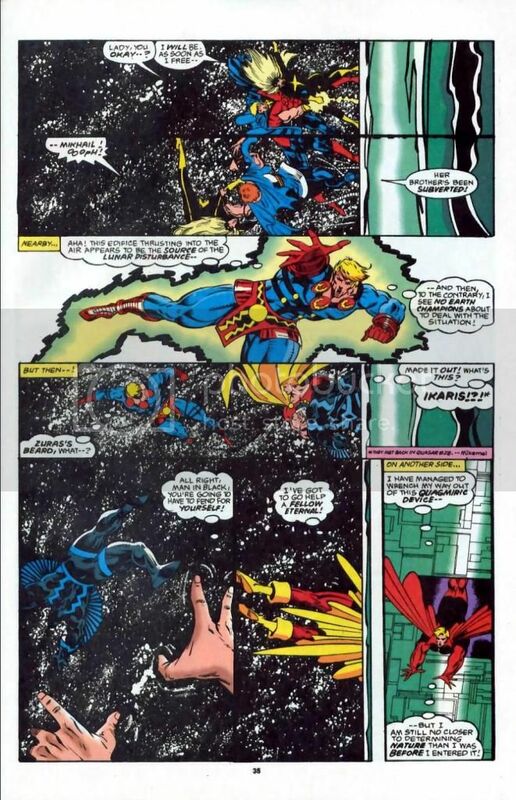 Punches Count Abyss with a force so terrible that it could shatter worlds and shake the very stars themselves. 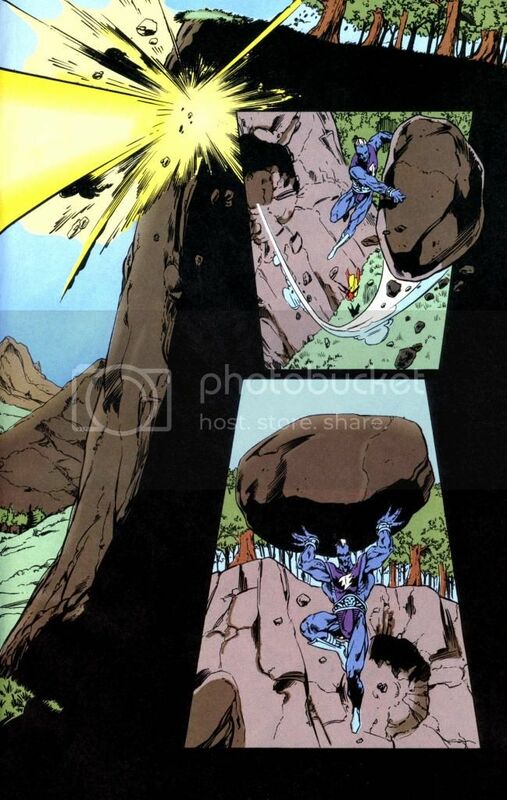 One-shots Shatterax through the building far away. 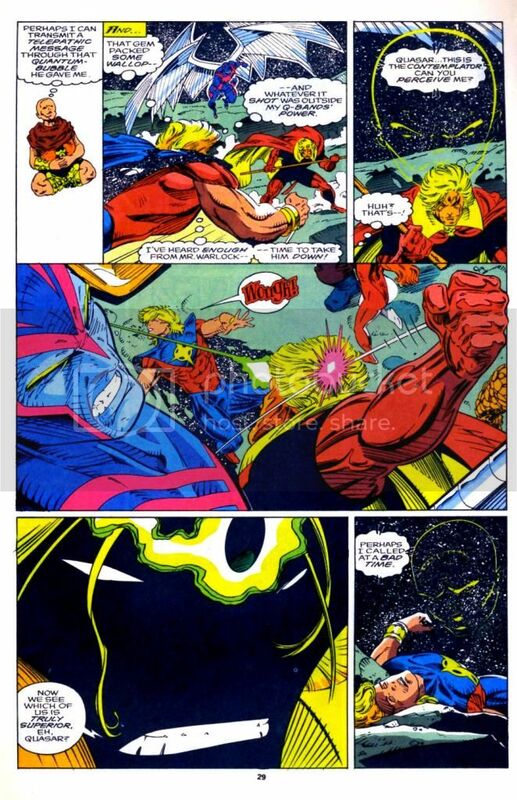 Backhands away Nova (with the full Nova Force). 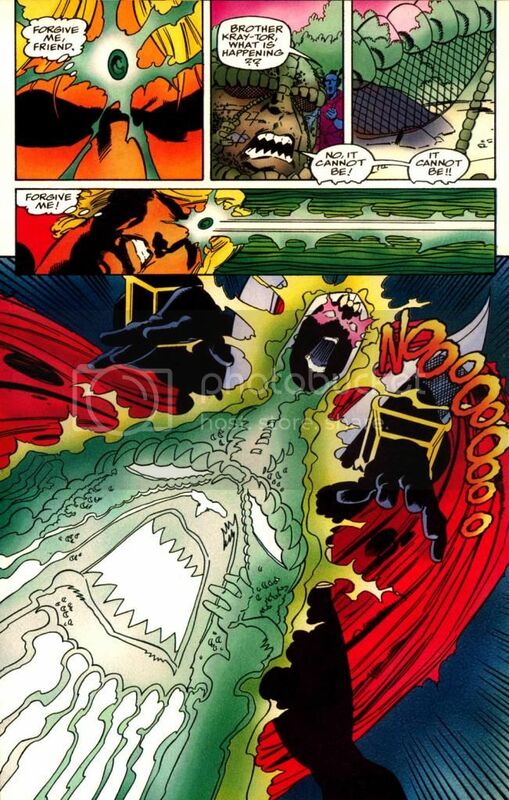 Backhands away Count Abyss (note: Abyss was intoxicated from drinking the souls from the gem at the time). 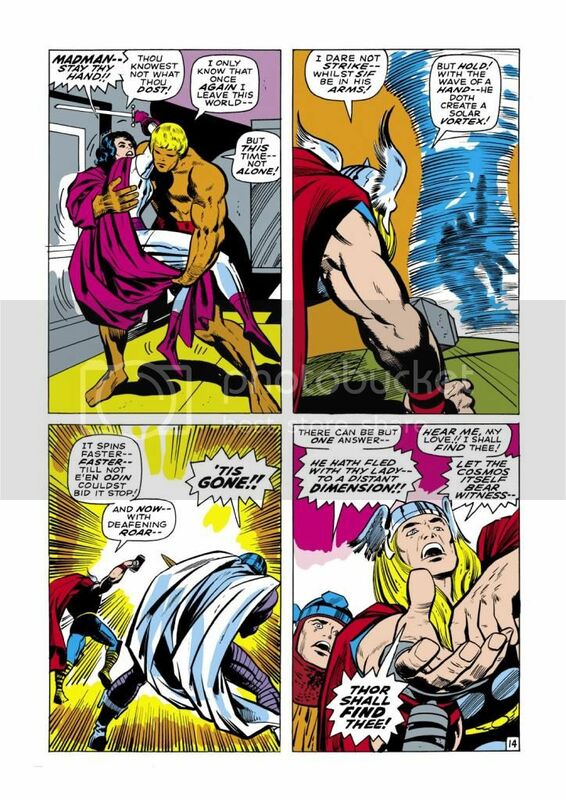 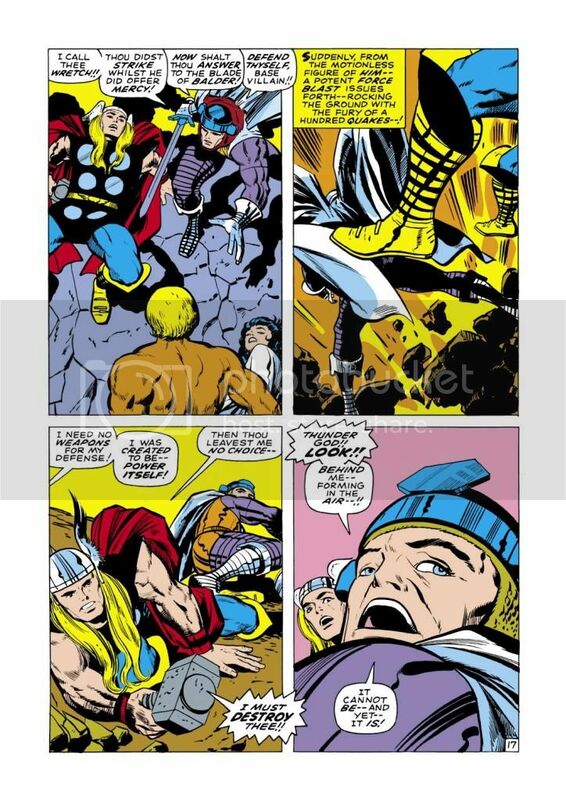 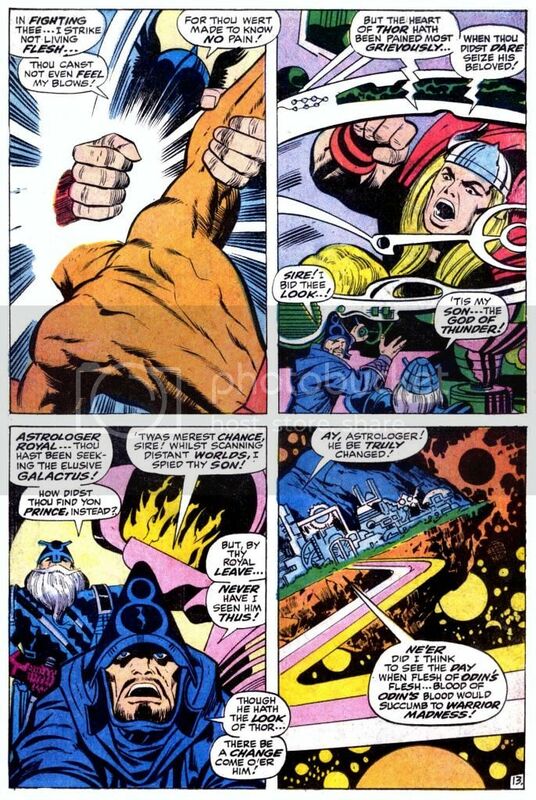 Knocks out Nobilus (Thor clone who has been shown to be Thor’s equal physically). 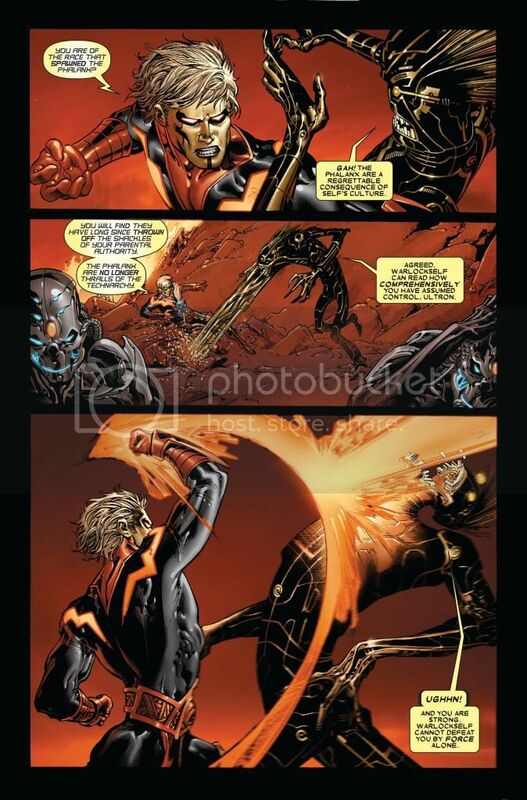 Knocks around Ultron (Phalanx version) and his robots. 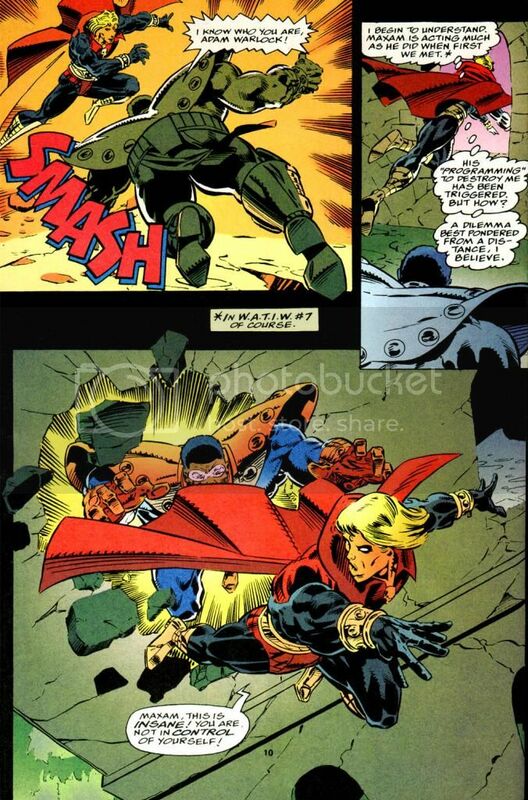 Smashes a Cardinal’s shield with one strike, defeating him. 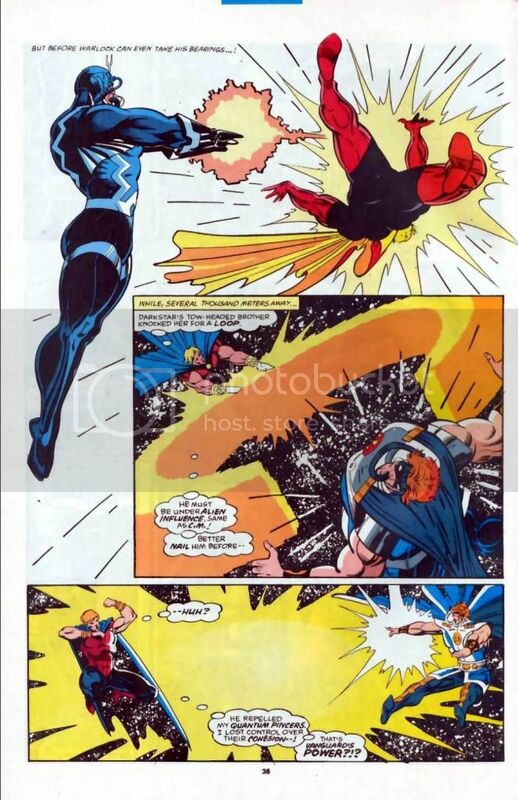 After being almost completely drained of power by Vulcan, he still manages to stun Vulcan with a punch. 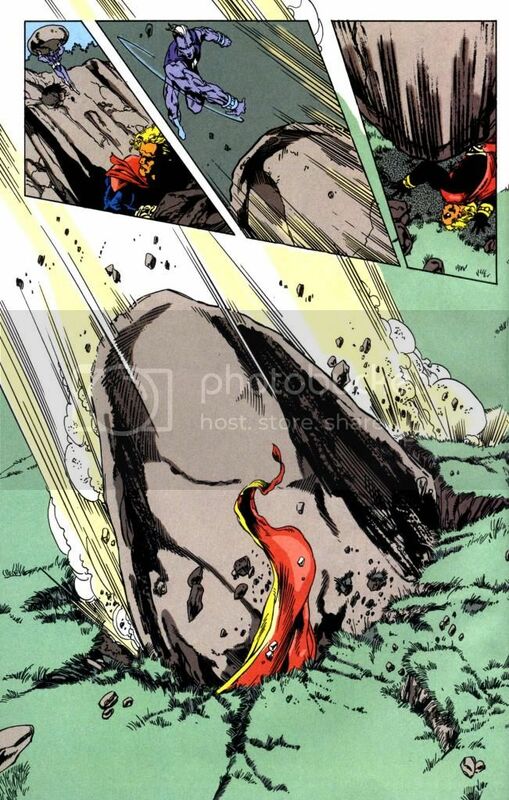 Rips off a big piece of machinery and throw it at Vulcan which keeps Vulcan out of the battle for a while. 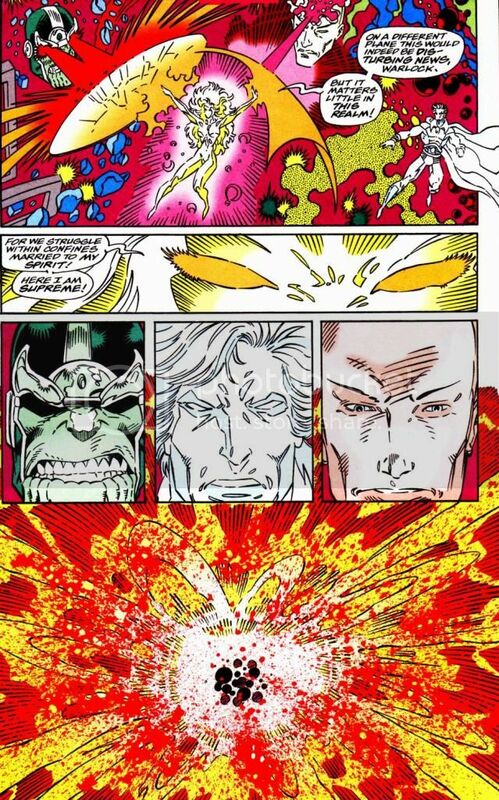 Yanks Drax out of a portal to the Negative Zone. 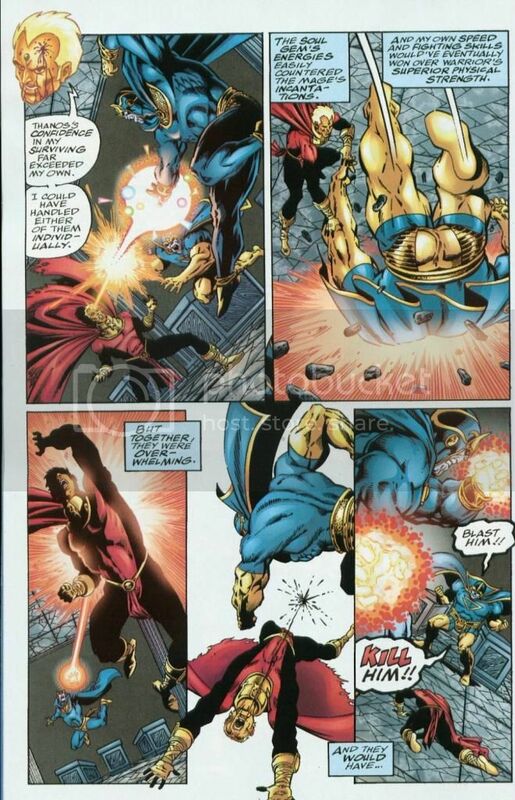 It is stated this feat of strength is something Adam was not capable of before. 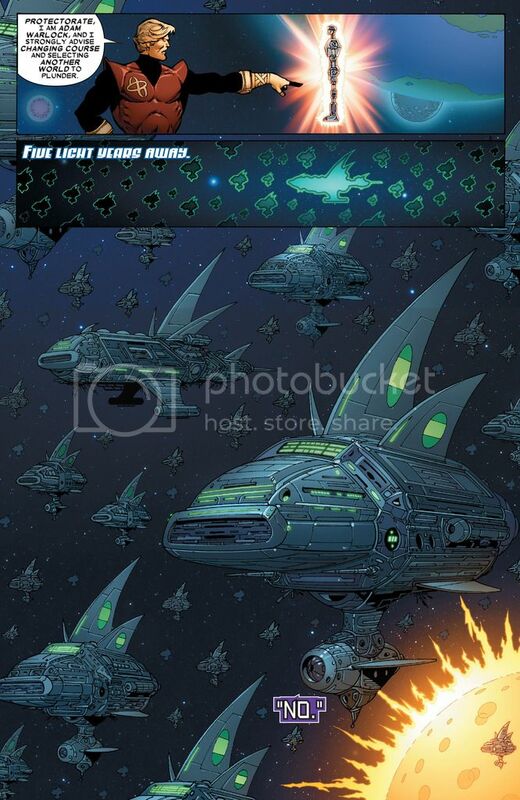 Keeps a fighter plane in place. 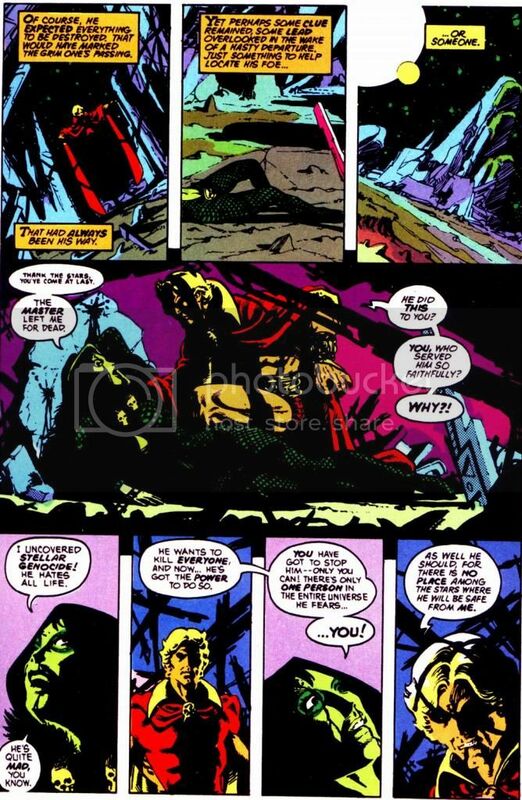 Even in his weakest incarnation, proves stronger than the Man-Beast. 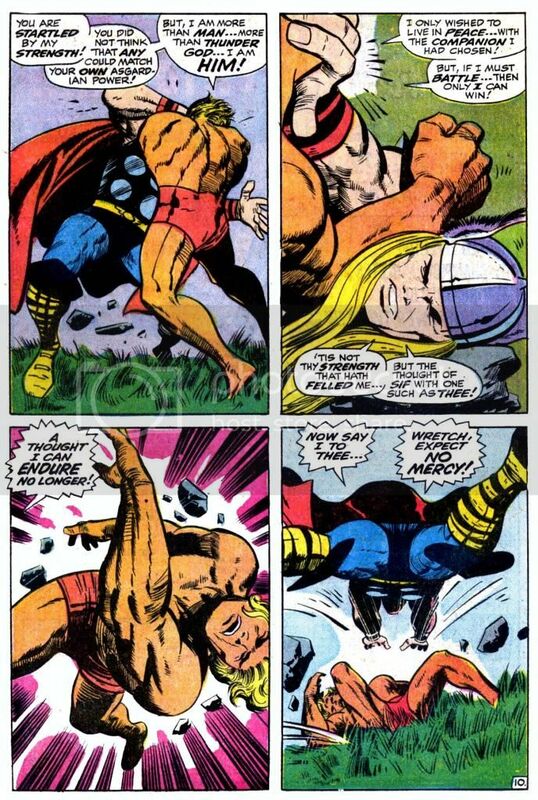 Defeats Drax (smart) in a punchout. 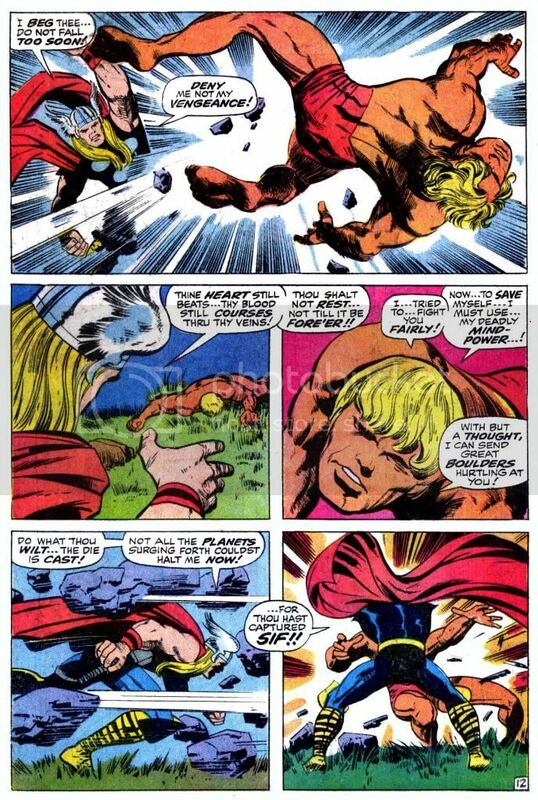 Manages to briefly go at it with Thor (who was in warrior madness), using his strength. 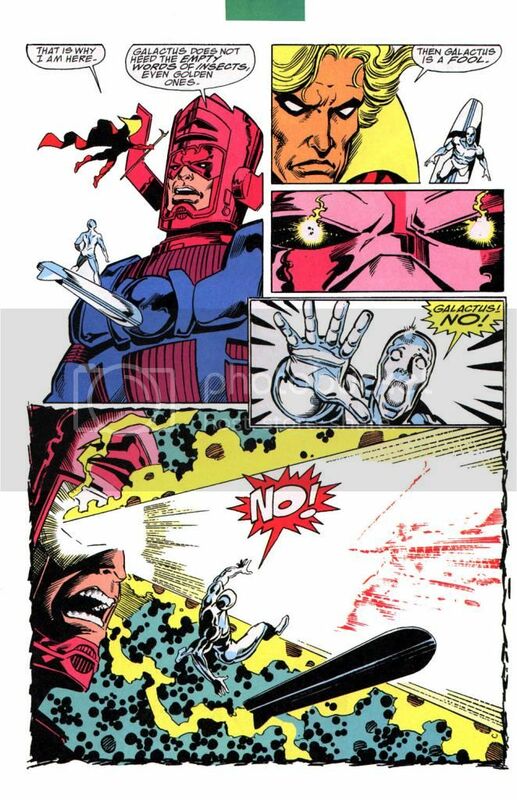 Briefly forces down the Silver Surfer with one hand. 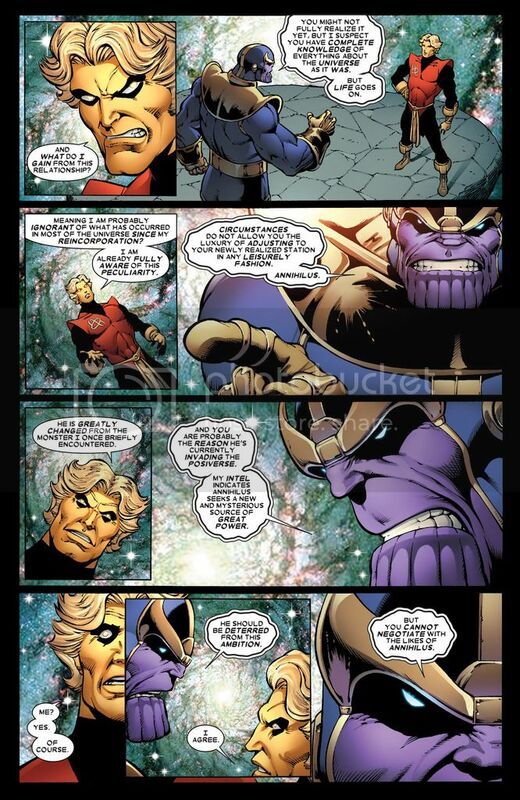 Chokes Thanos’ Infinity War doppelganger. 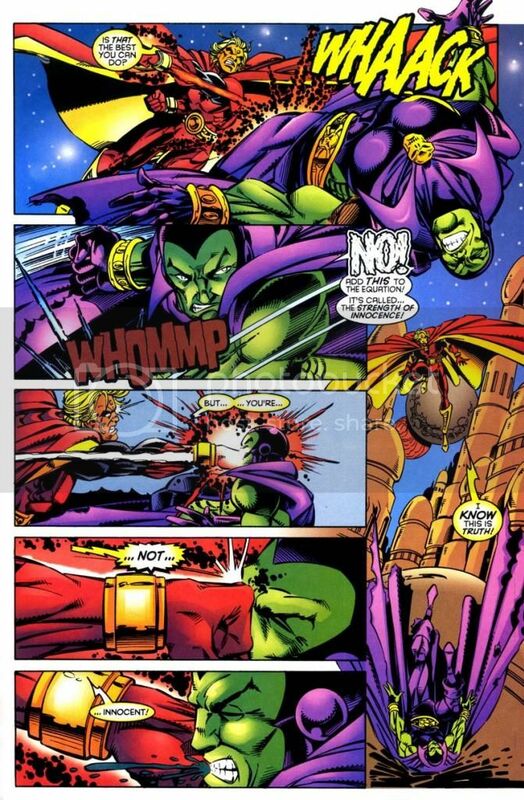 Snaps Gamora’s neck with one hand. 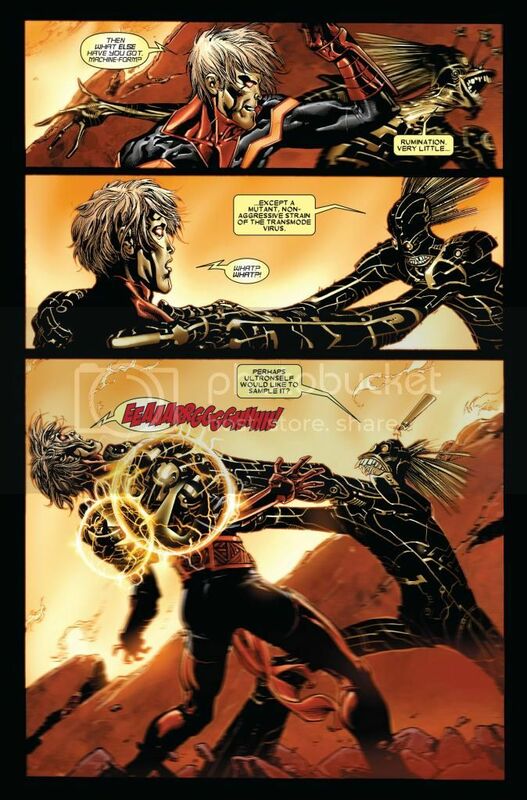 Easily catches zombified Mar-Vell’s punch. 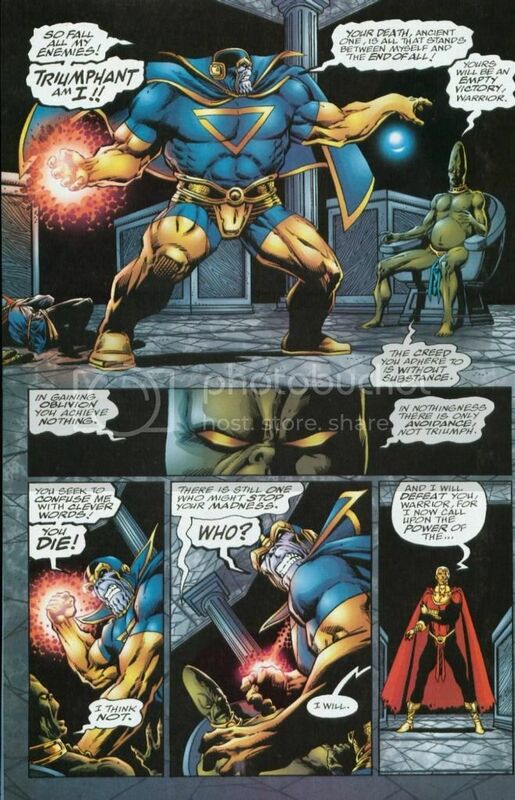 Takes a massive pounding from Warrior (stated to be 4-5 times stronger than Thanos) and gets up. 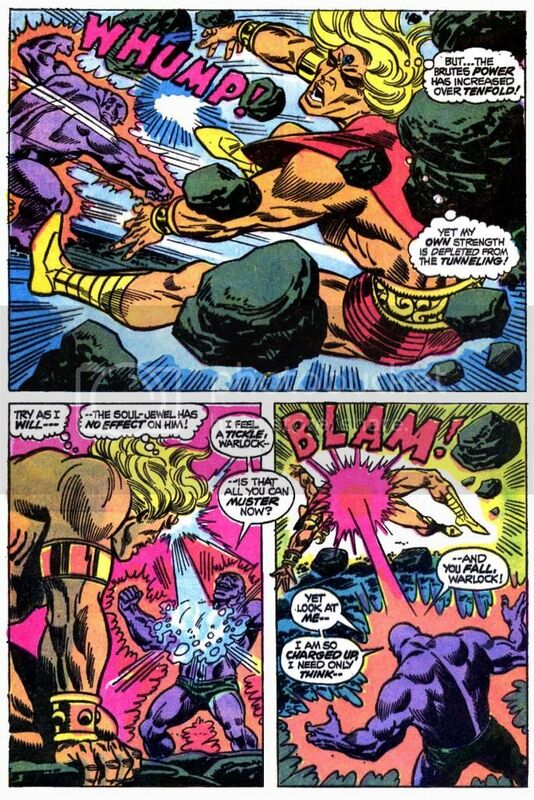 Seems unfazed by Nova (with full Nova force) bullrushing him into a mountain. 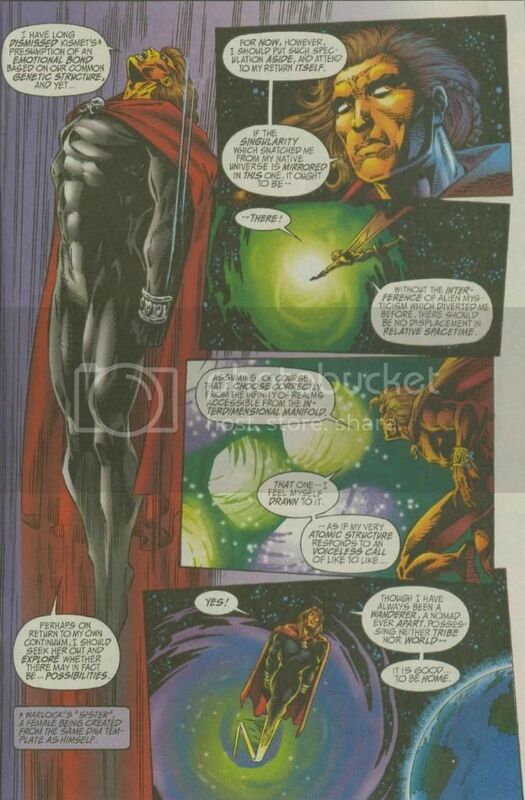 Endures surprise shots from a bloodlusted class 100 Maxam who has gown to his maximum size. 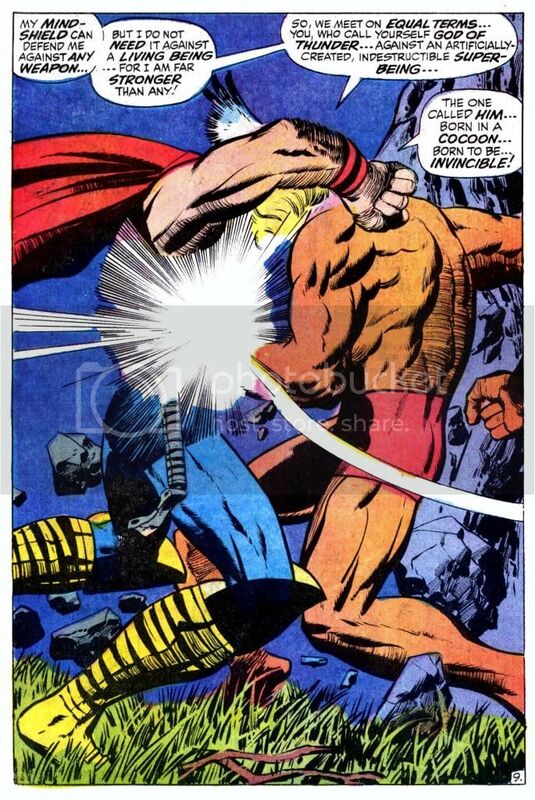 Does not feel pain from Thor’s blows. 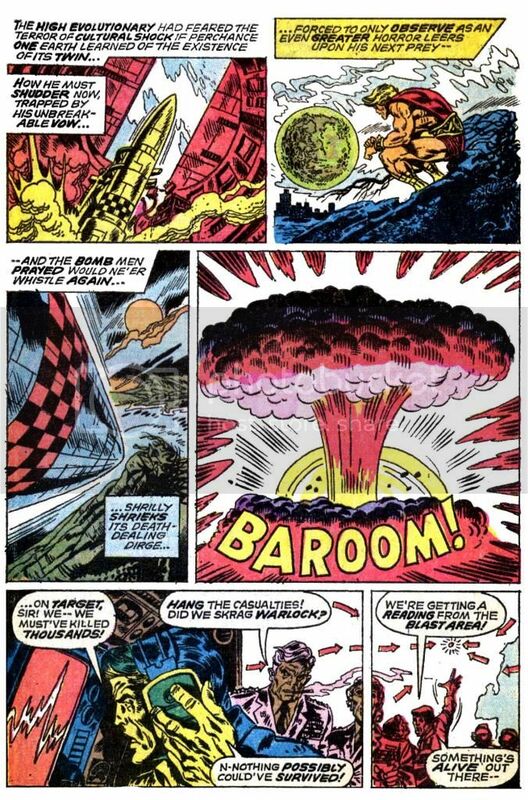 Even in arguably his physically weakest incarnation, endures a ground zero nuclear explosion unfazed. 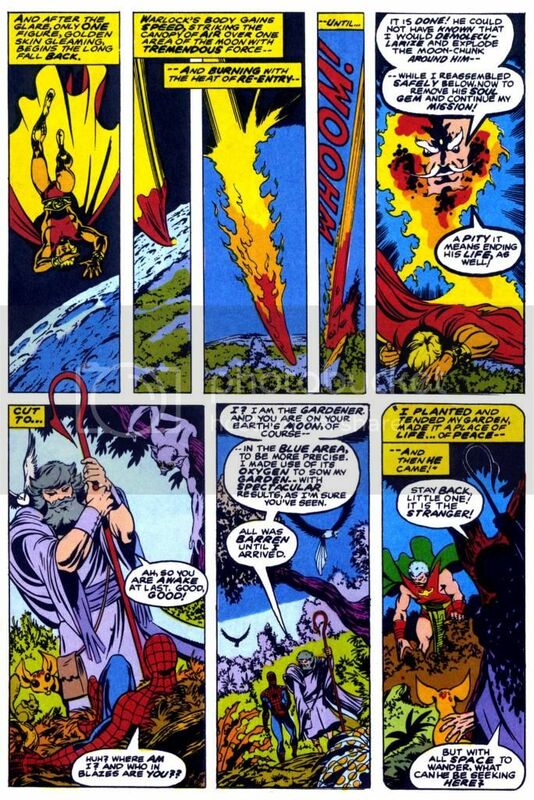 Note: this did not actually happen in the present, but it was shown what „will“ happen, if Adam turned evil. 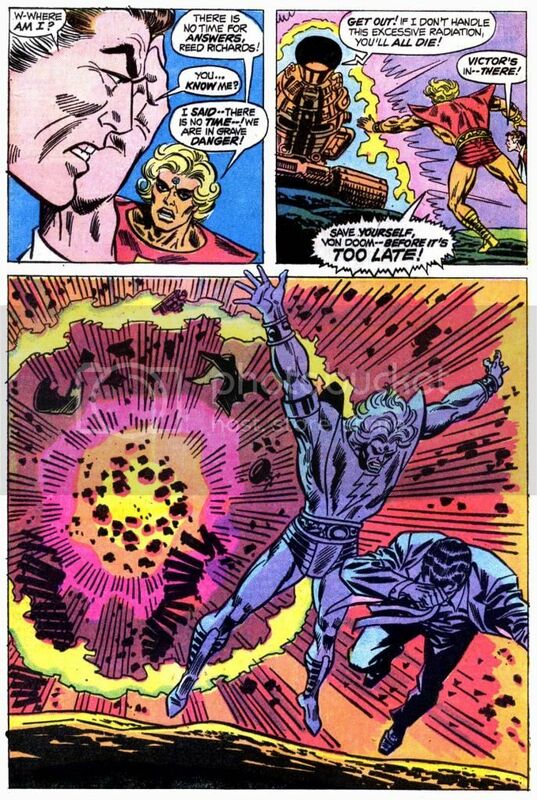 Survives a nova intensity explosion casued by the Stranger and crashes into the moon. 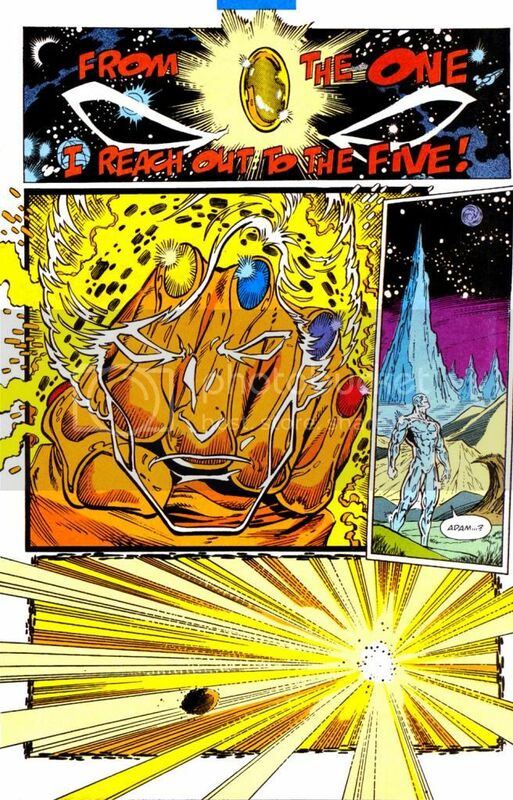 Survives repeated hits, blasts and explosions when fighting Infinity Thrall, the combiend harnessed power of 4 Infinity gems. 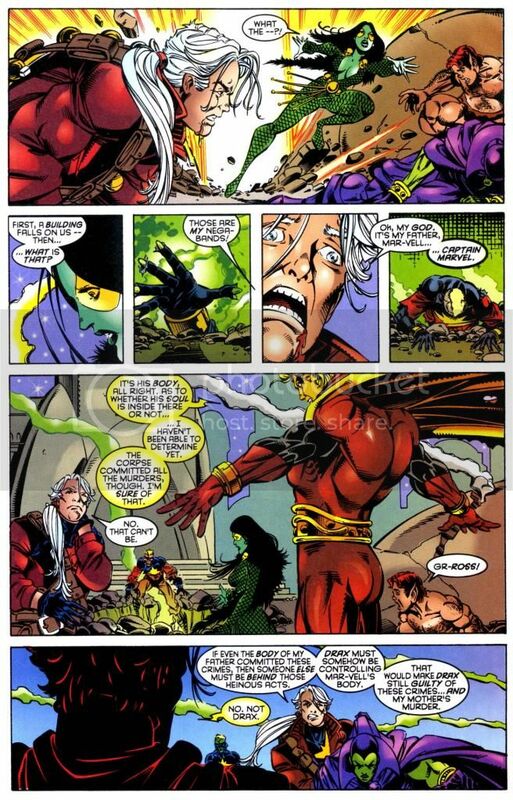 Endures hundreds of deathbird missiles exploding. 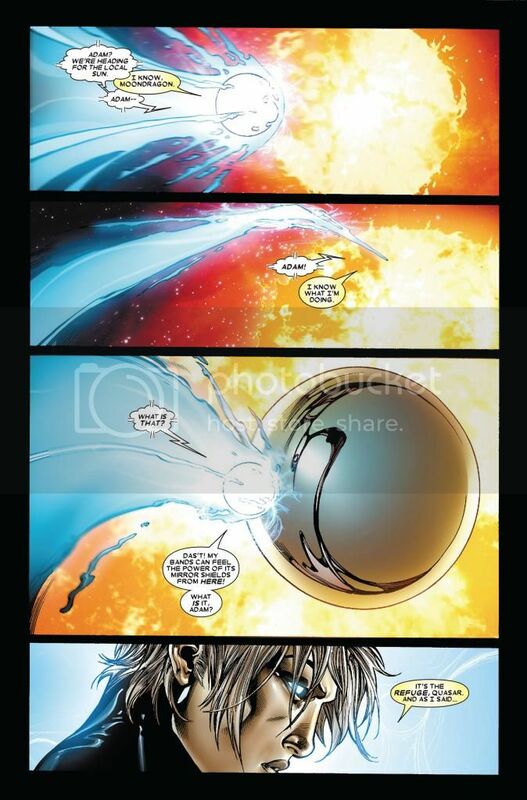 Travels through a black hole. 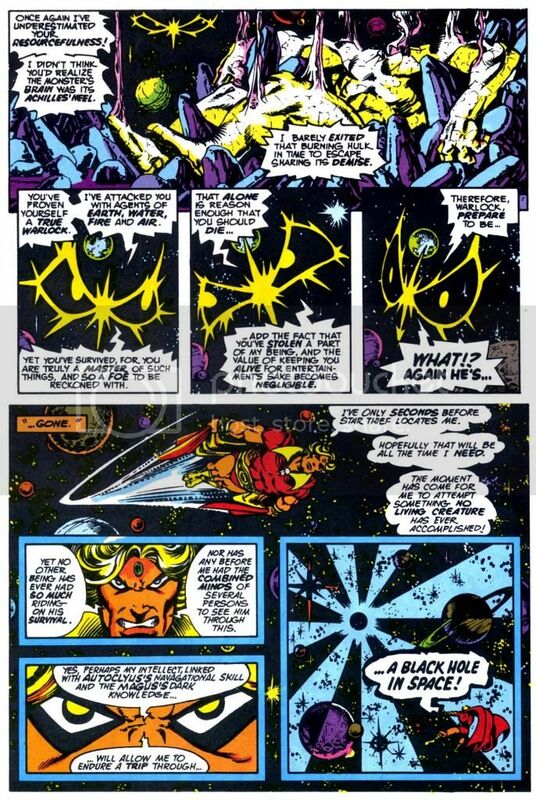 Survives a black hole again. 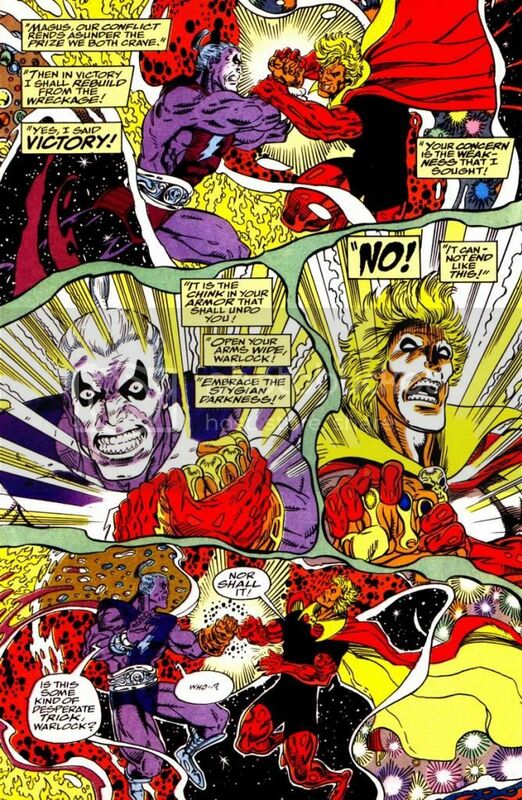 Gets caught in the energies released from the battle between the cosmic forces and Thanos with the Infinity Gauntlet. 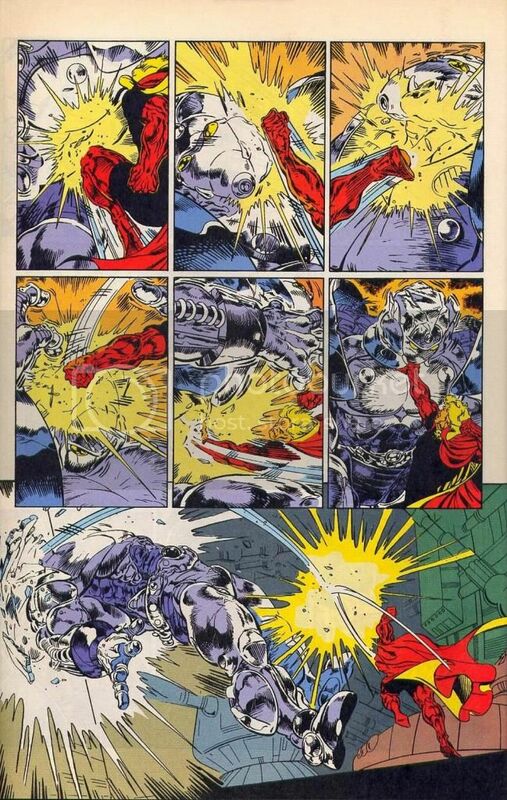 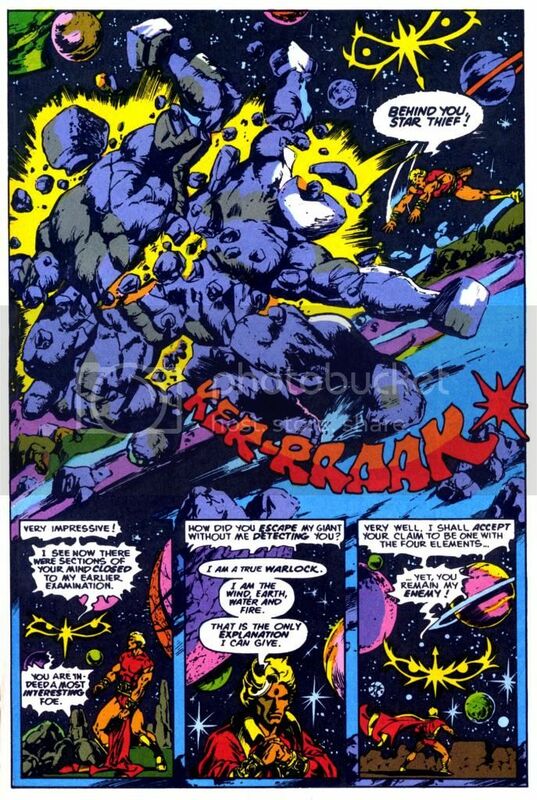 While weakened, takes blasts and punches from the Brute whose power was increased over tenfold by absorbing energy from the Earth’s core and even shields Reed Richards from an explosion. 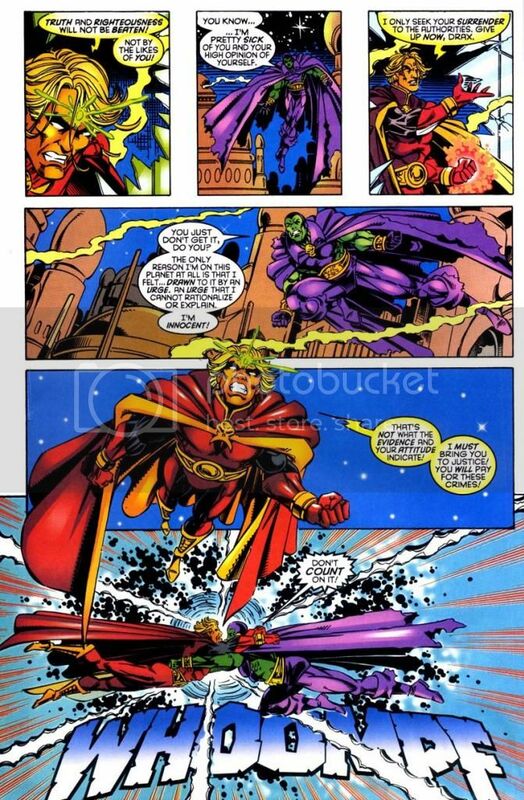 Endures multiple falls from orbit. 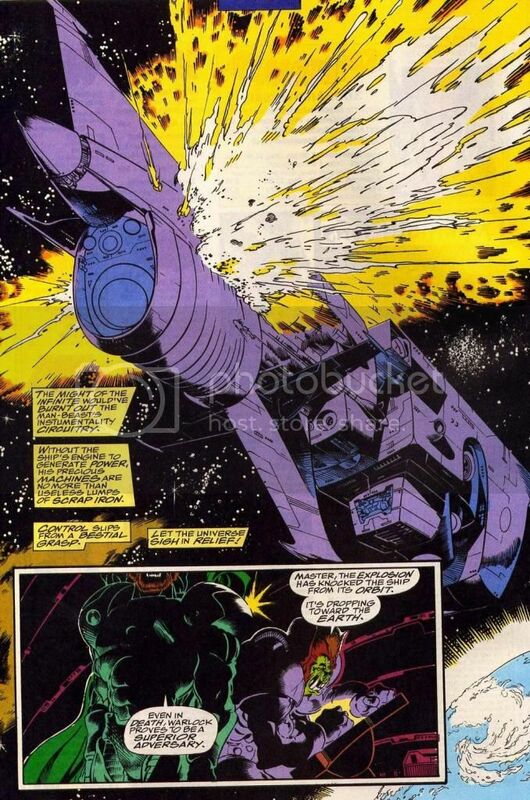 Is blasted with force five phaser power by a giant Church spaceship is none the worse for wear. 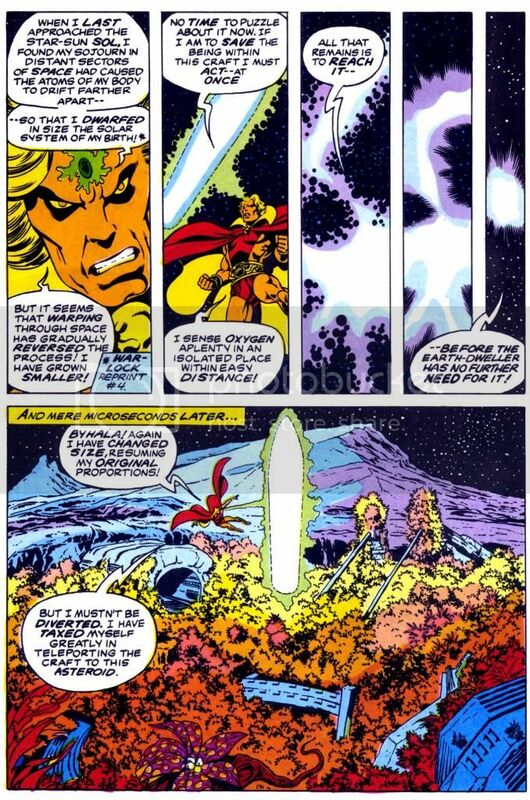 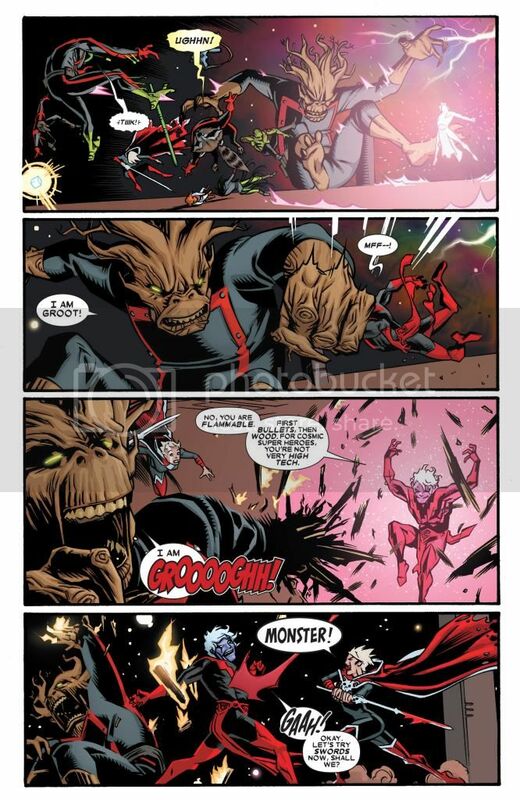 Endures repeated blasts from Annihilus’ cosmic control rod, Blastaar’s energy blasts and Syphonn’s cosmic energy bolts and doesn’t seem injured in the least. 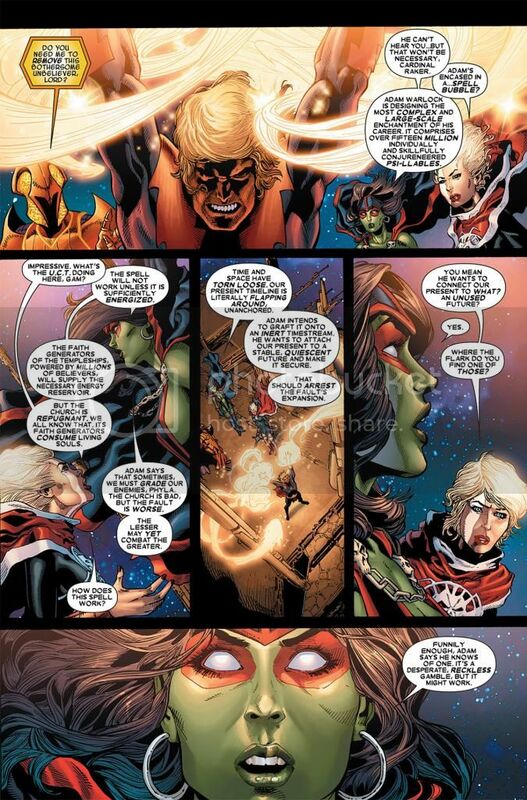 Endures repeated blasts from Captain Mar-Vell’s Nega-Bands without much trouble. 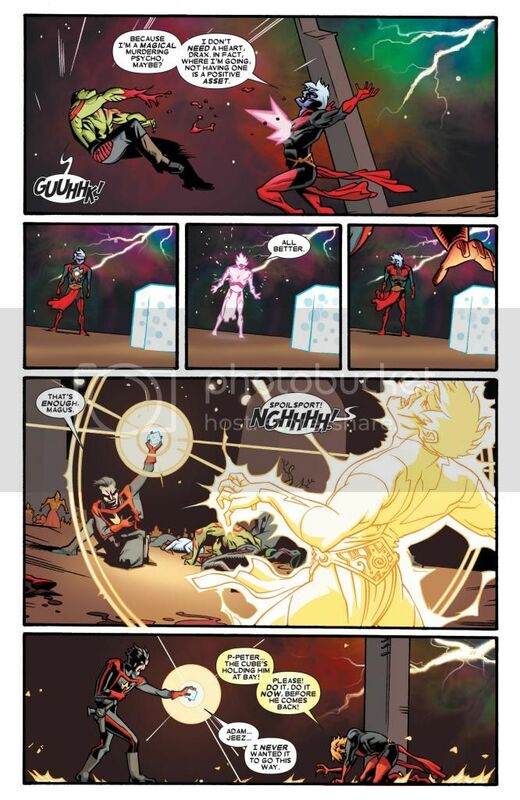 Takes a surprise energy barrage from Vulcan to the back and gets up. 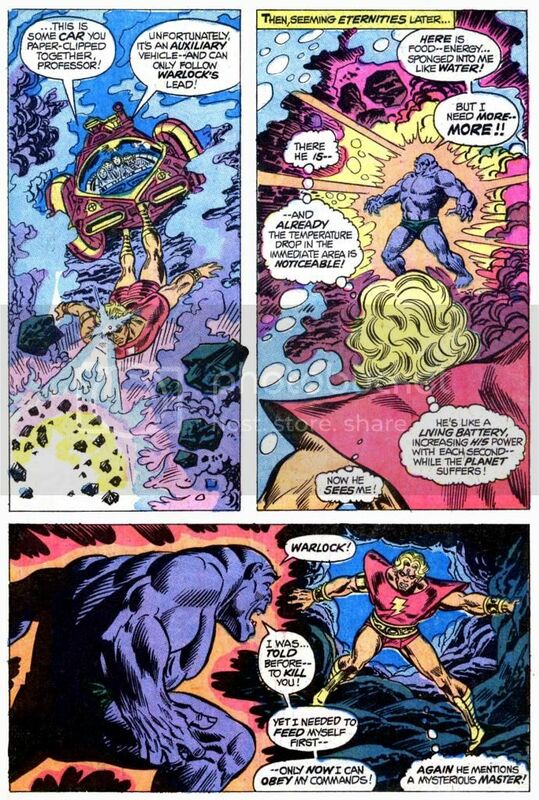 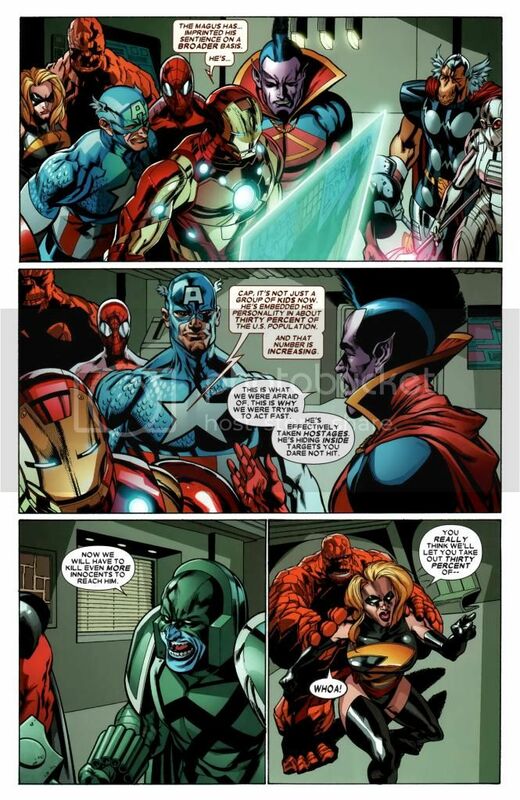 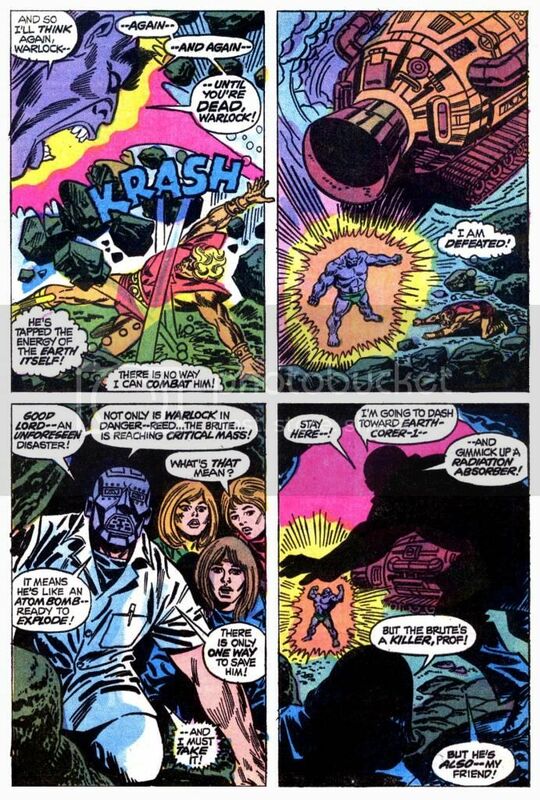 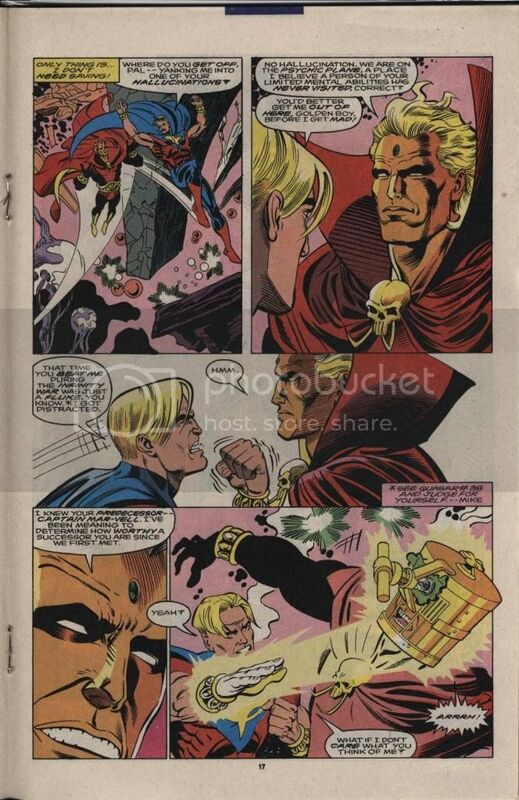 Endures attacks from a cosmic cube and fakes his death. 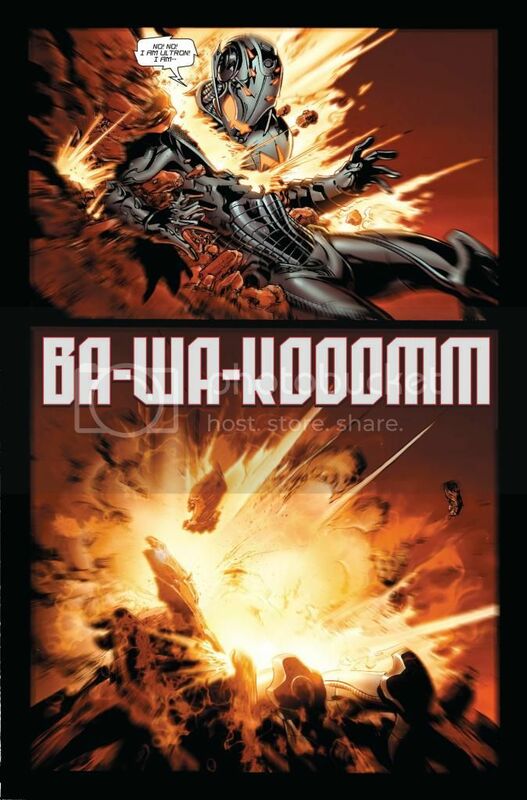 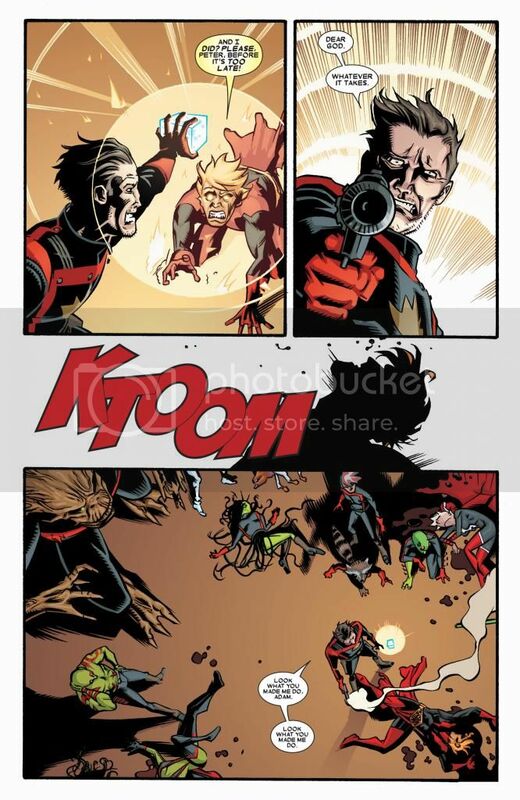 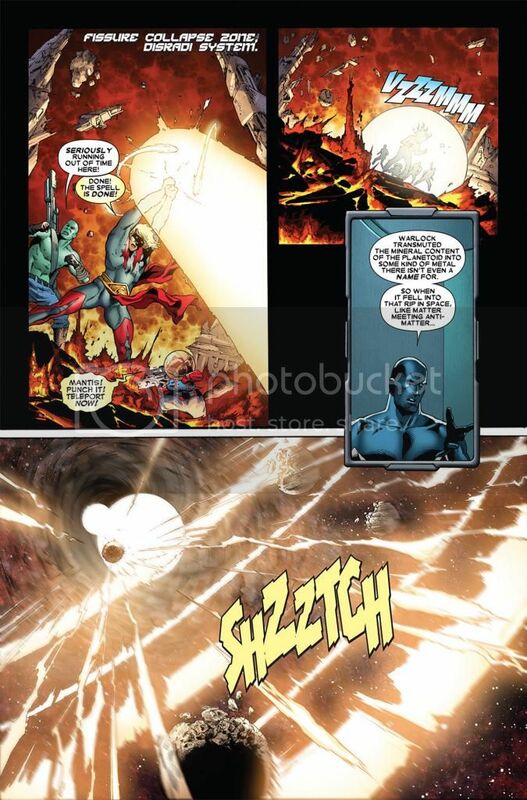 Blast from Black Bolt at point blank range only knocks Adam backwards. 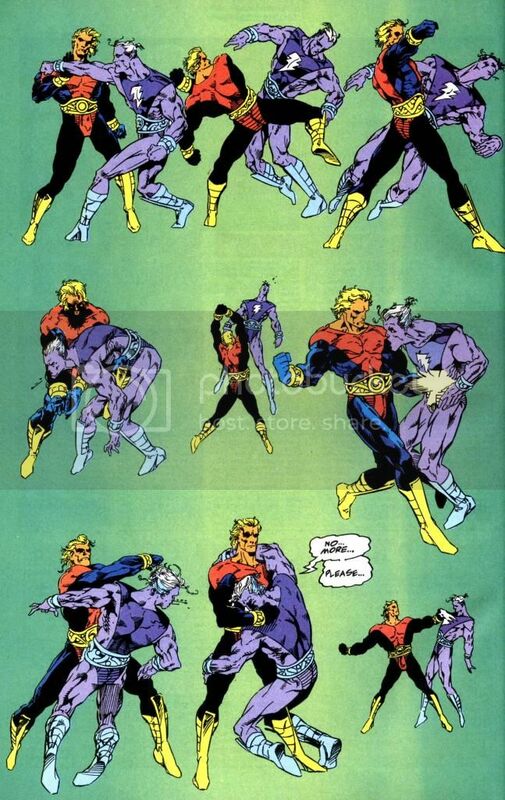 Gemini’s energy projection does not visibly harm or injure Adam. 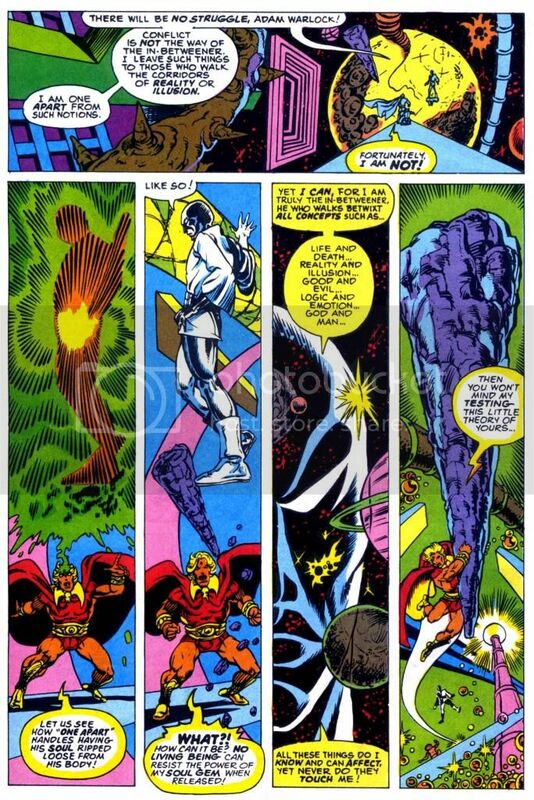 Warlock can create a regenerative cocoon around himself to heal from any wounds or even resurrect himself after dying. 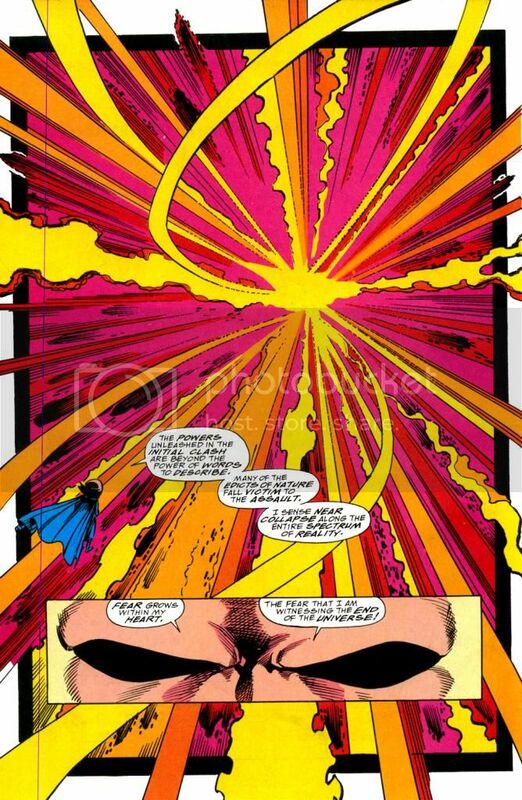 Resurrects himself without the use of the cocoon. 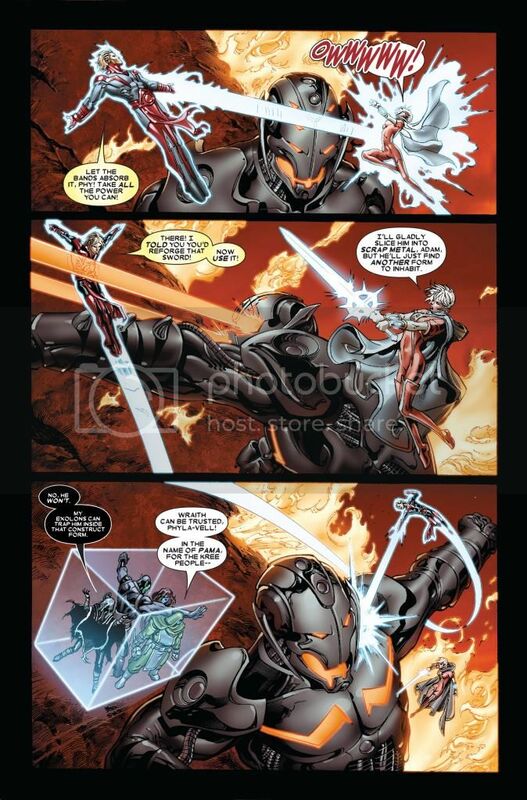 Easily heals after being run through with a sword. 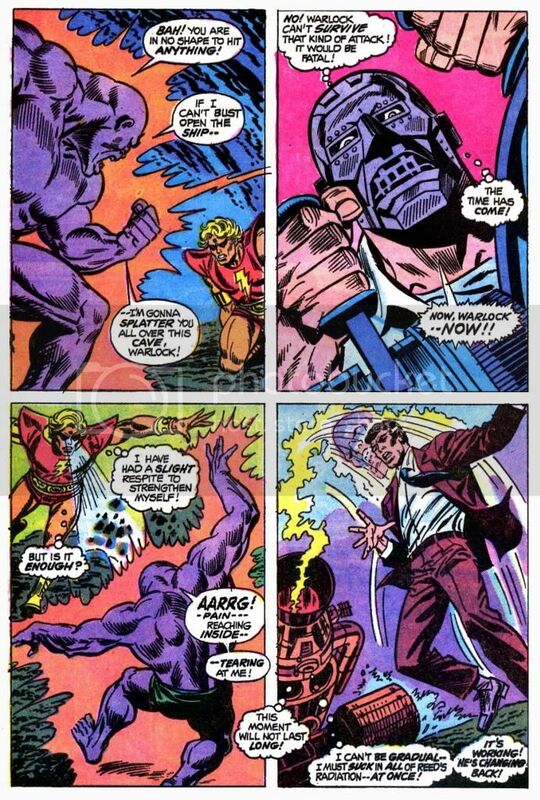 Heals himself after Drax tries to rip his heart out. 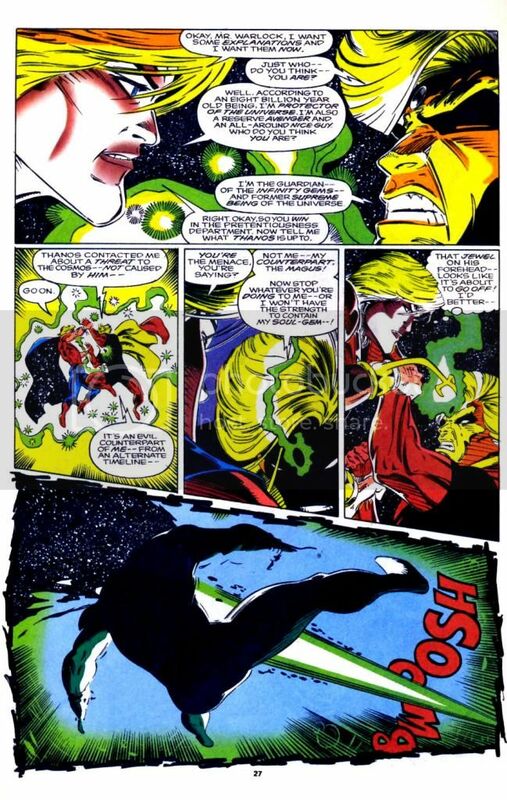 Heals Moondragon with a kiss after punching a large hole through her body. 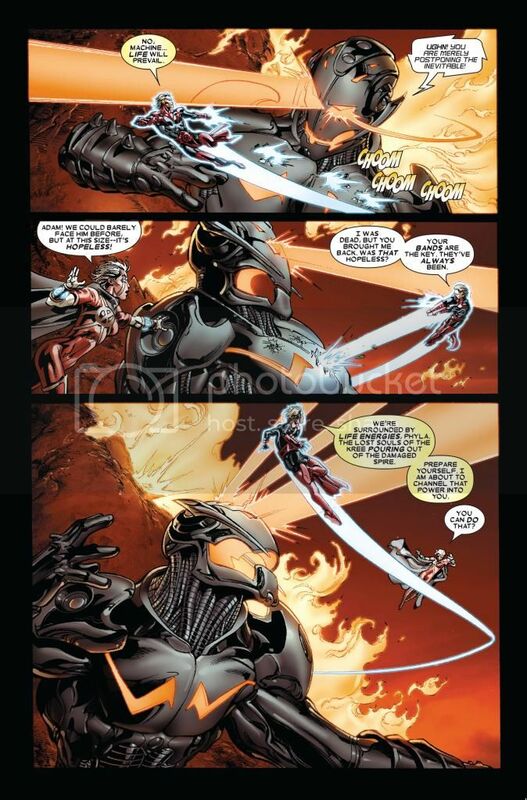 Flies faster than the speed of light. 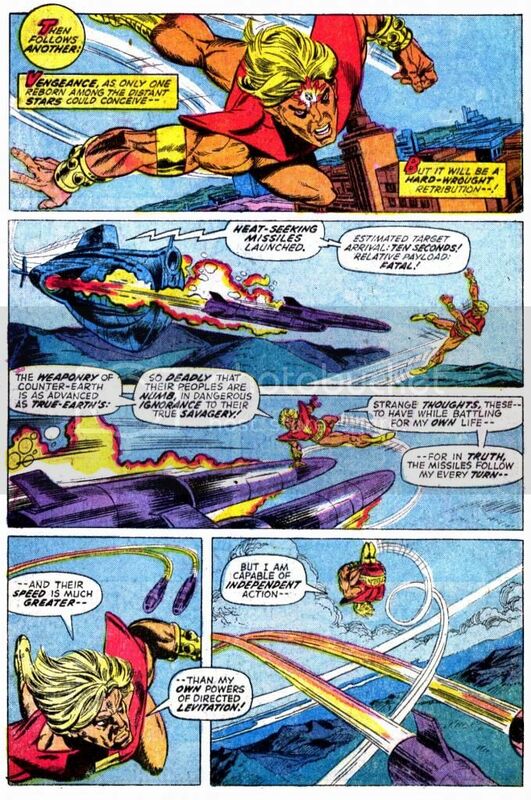 Not only flies himself and the others out of immediate danger through space at immense speeds, but also executes a sub-space jump to reach his destination faster. 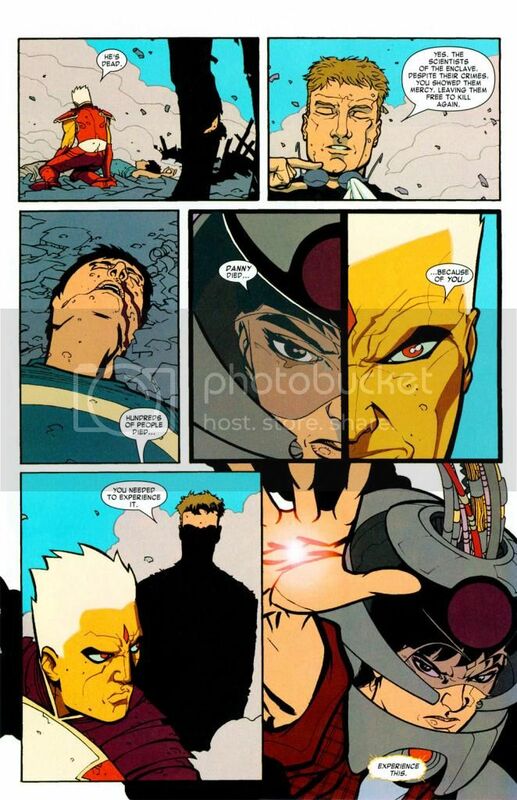 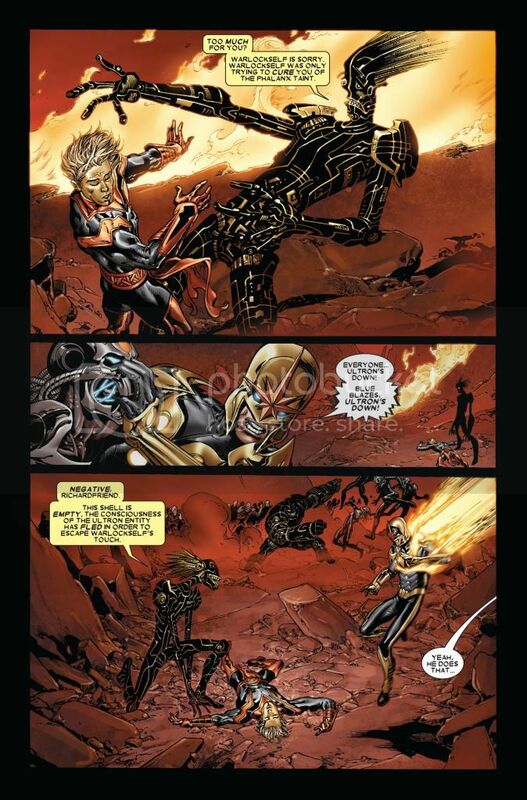 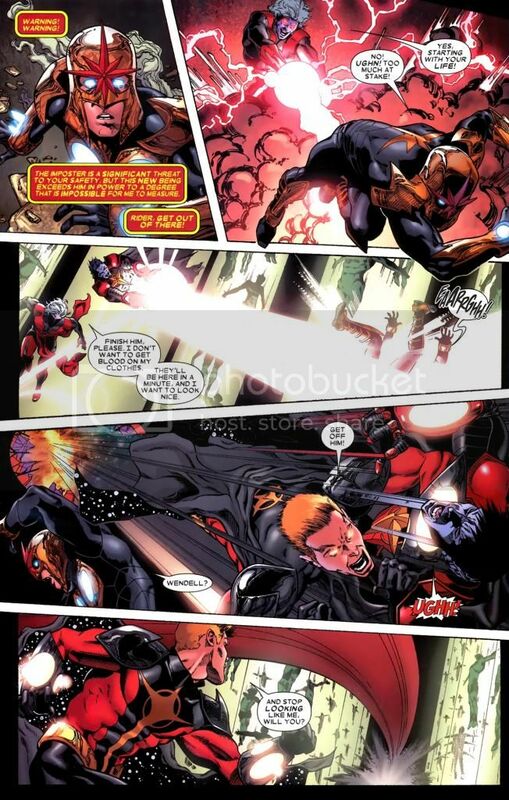 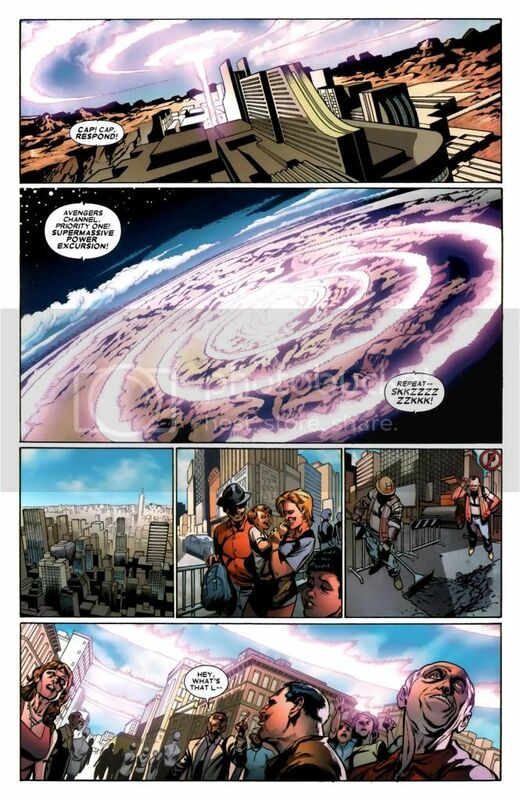 Redirects Cyclops' and Havok's blasts at Living Lightning and the Human Torch. 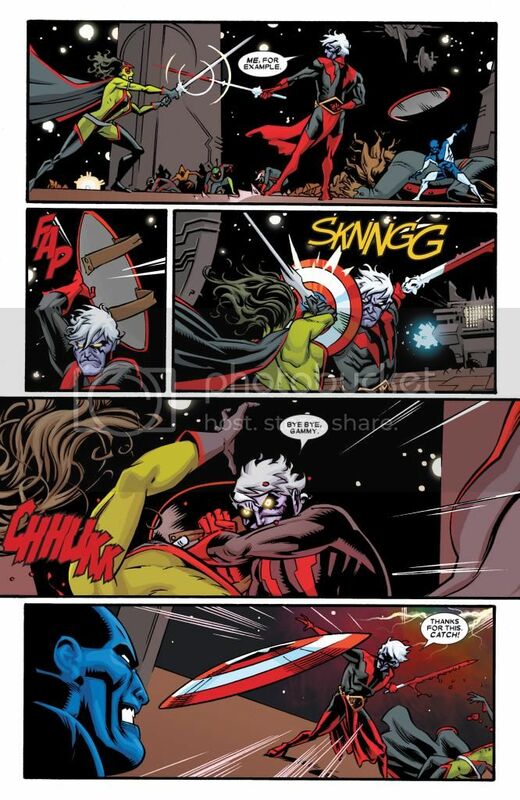 Catches Captain America’s shield thrown by Major Victory without even looking. 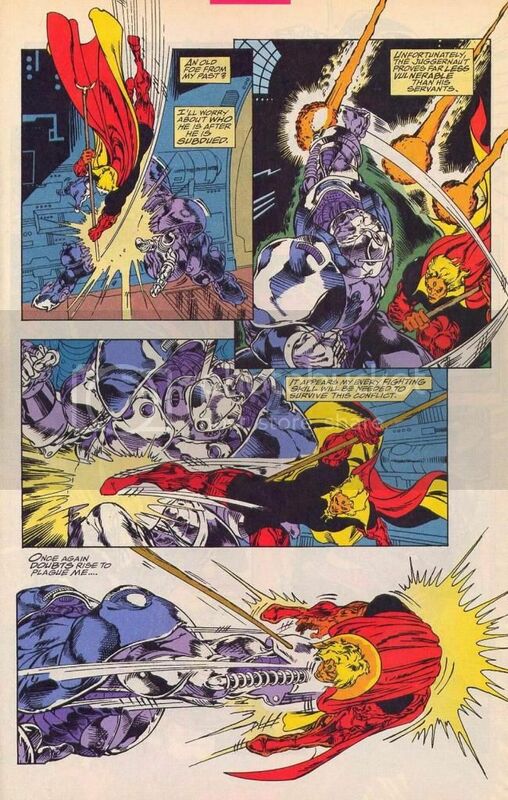 Deflects Zakaius' blast with his staff. 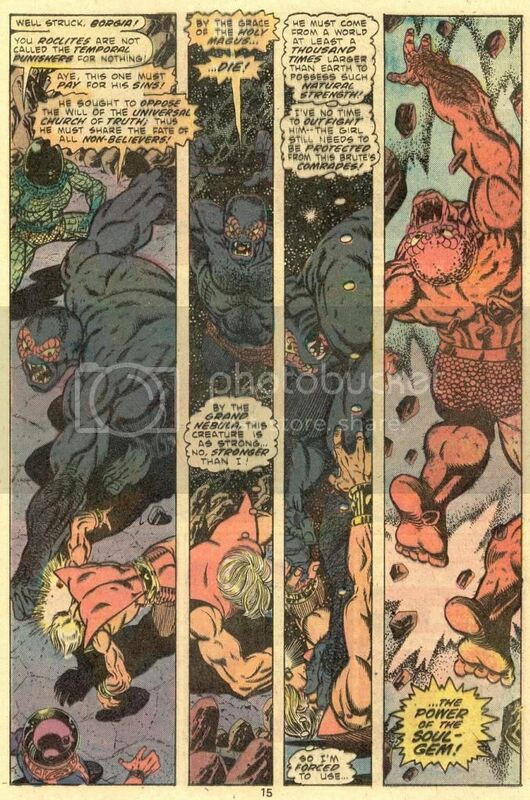 Drives off Man-Beast and his New Men with a fast attack. 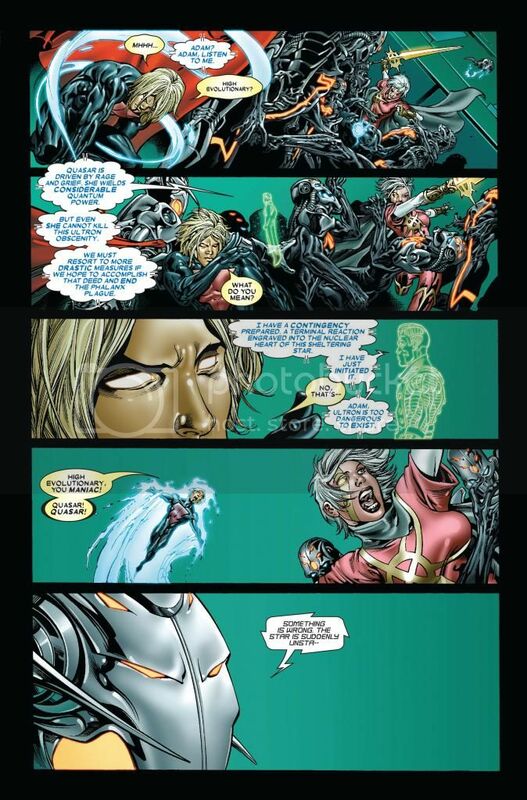 Sneaks up on cyborg soldiers. 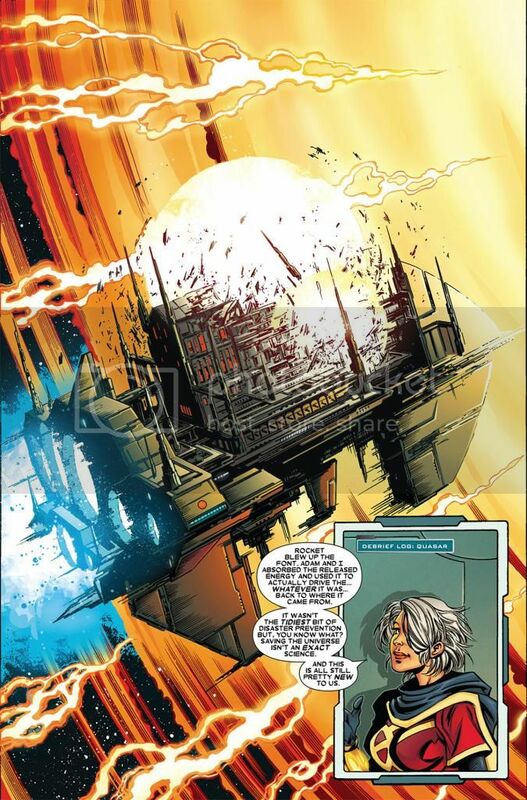 Takes out an entire ship's crew without anyone noticing. 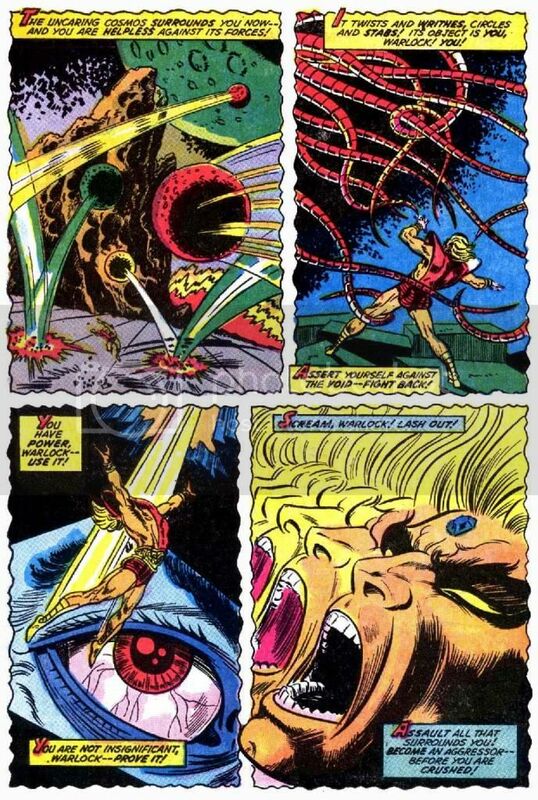 From his creation, Adam was powered by cosmic energy that he stores in his cells and uses for a variety of effects. 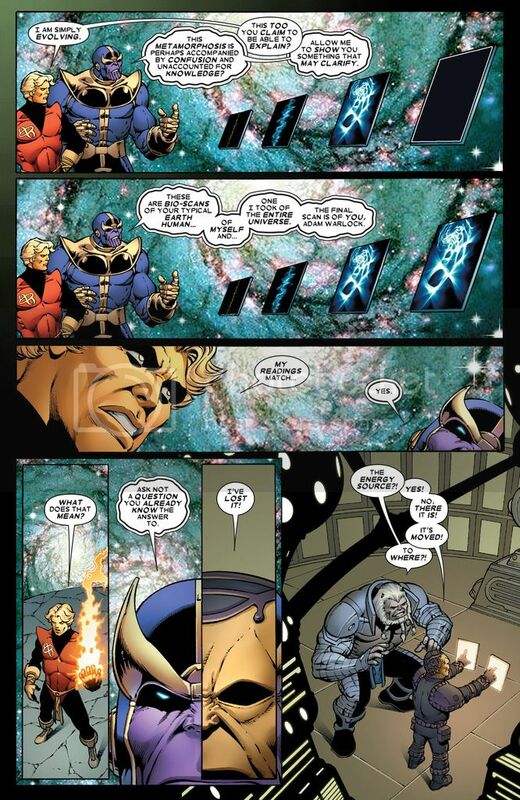 Even his soul gem helps him tap into the energies of the cosmos. 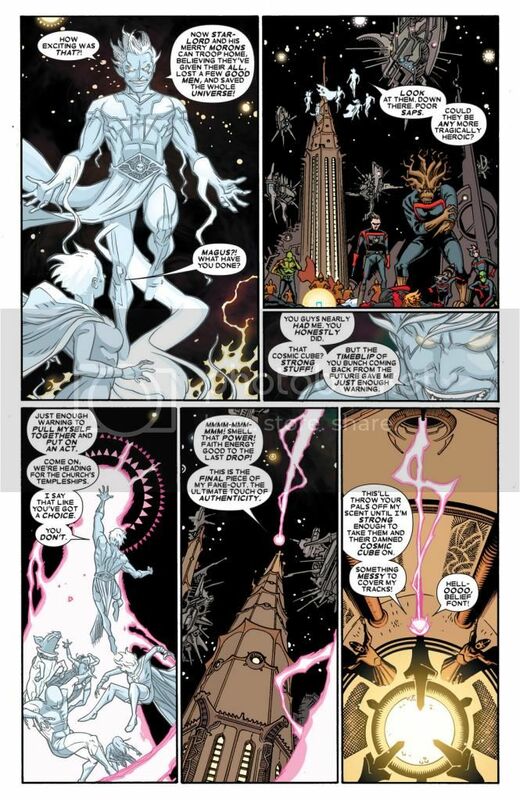 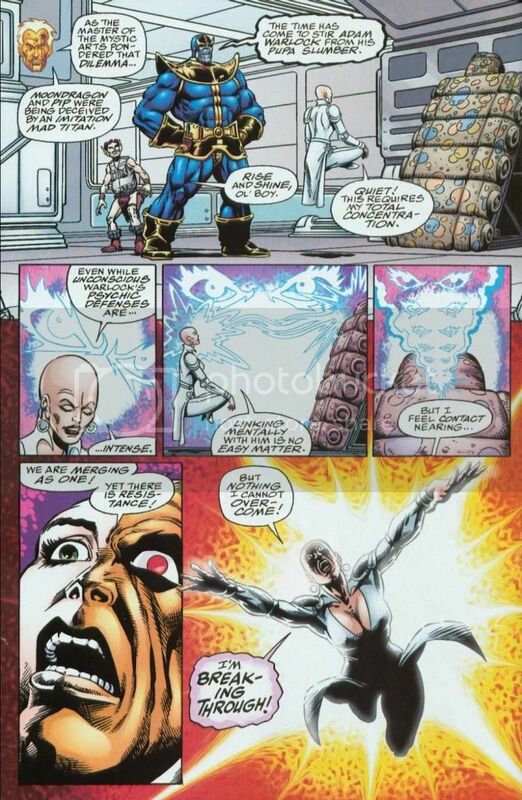 Adam absorbs energy from Thanos’ blast, which recharges him and it is stated that Adam has become a direct consumer of energy much like Galactus and his heralds and gains his sustenance from it. 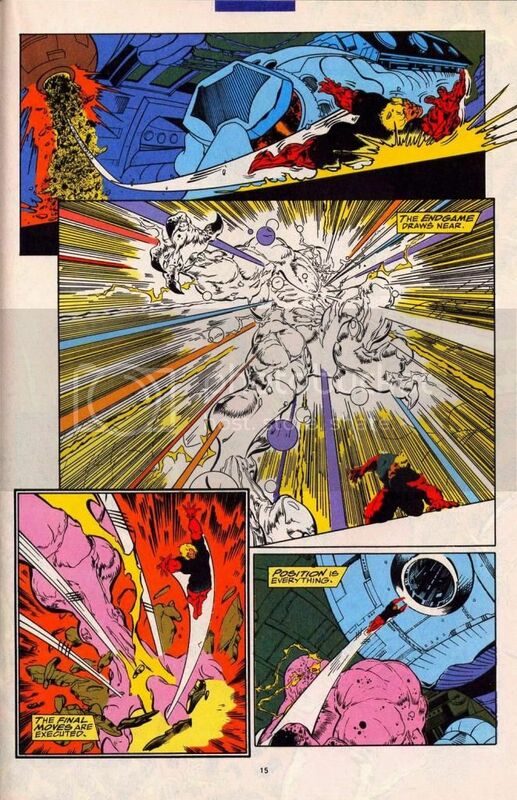 Drains Ikon’s spaceknight armor of its power. 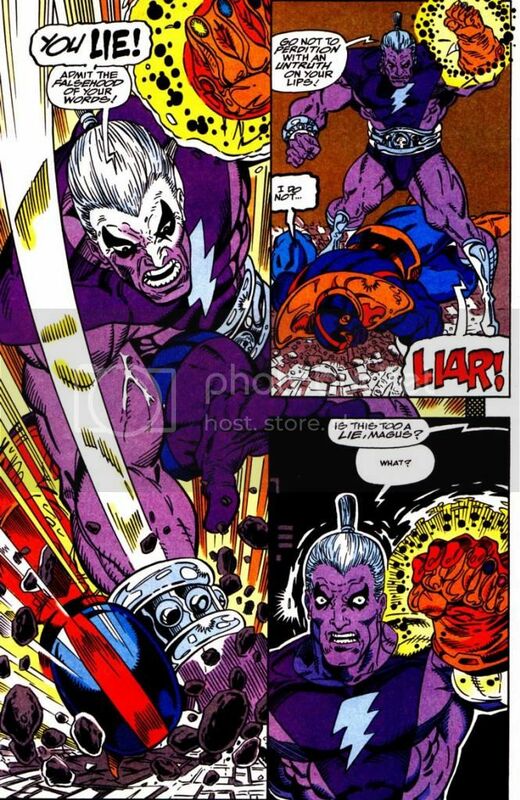 Possibly uses a similar technique of shortcircuiting and/or draining on the Silver Surfer. 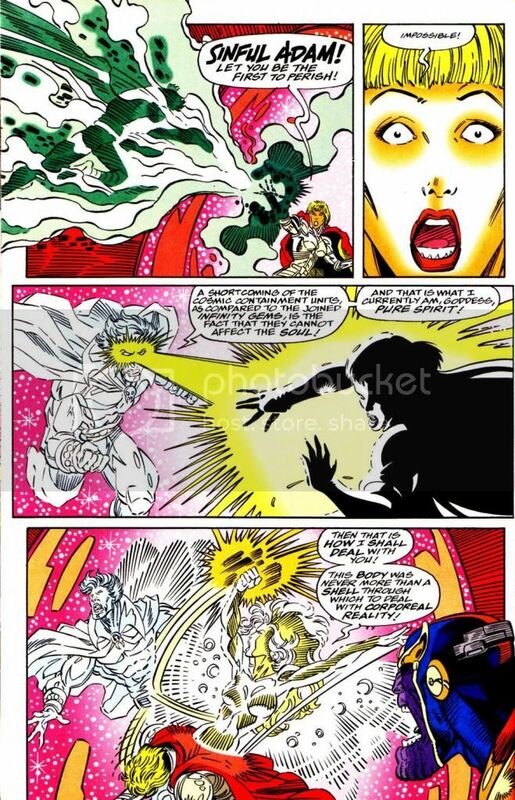 Channels the Silver Surfer’s energy into Moondragon using the soul gem. 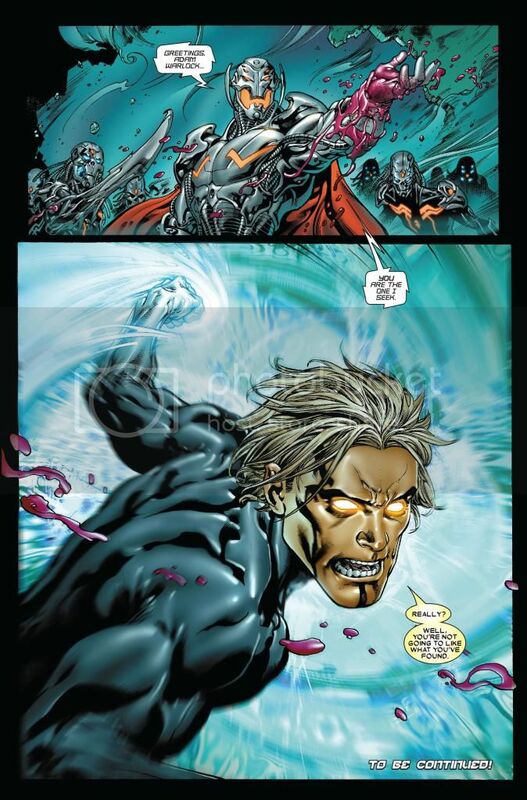 Enhances the soul gem with his personal energies to override a techno-parasite from a distance. 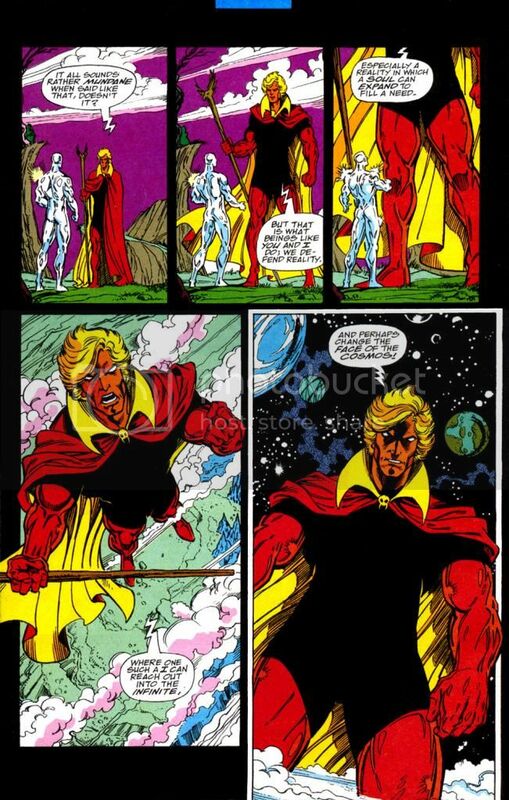 At one point, when he developed the ability to control quantum magic, he could recharge himself with magical energies. 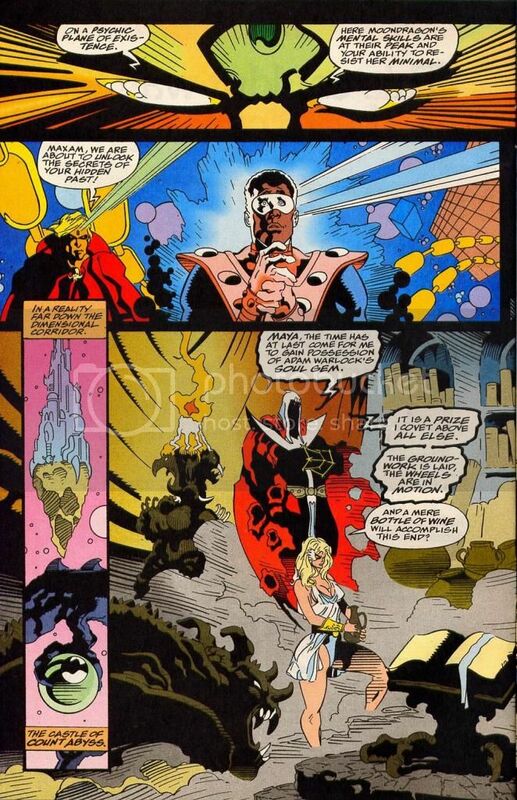 Here, he drains Magique of her magic to recharge himself. 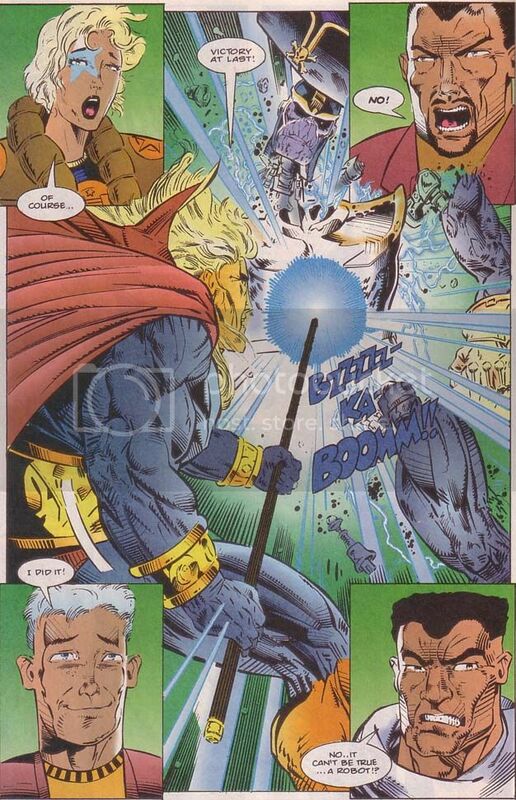 Casts a spell to remove a witchmark from himself and place it on Magique. 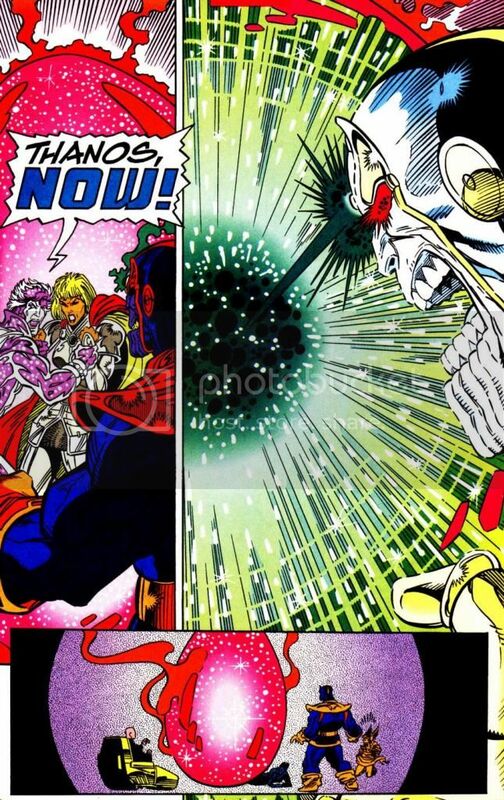 A feat that was thought impossible. 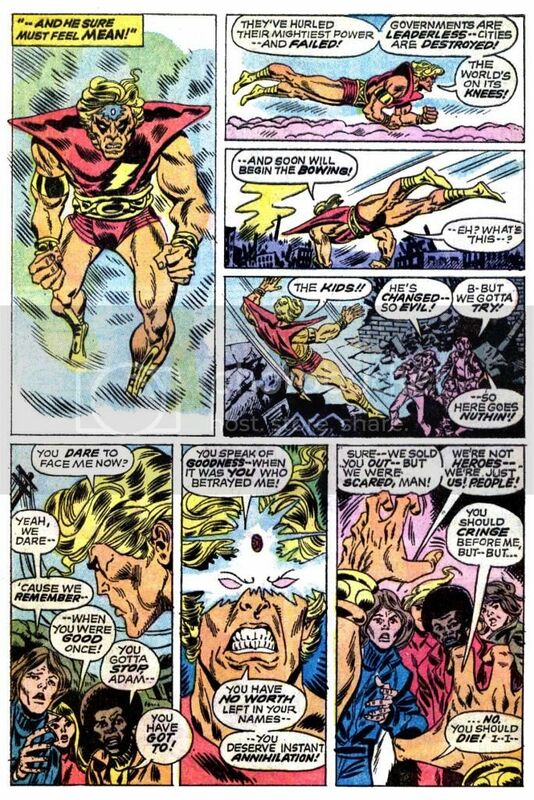 From the early days, he also recharged himslelf from the support of his followers. 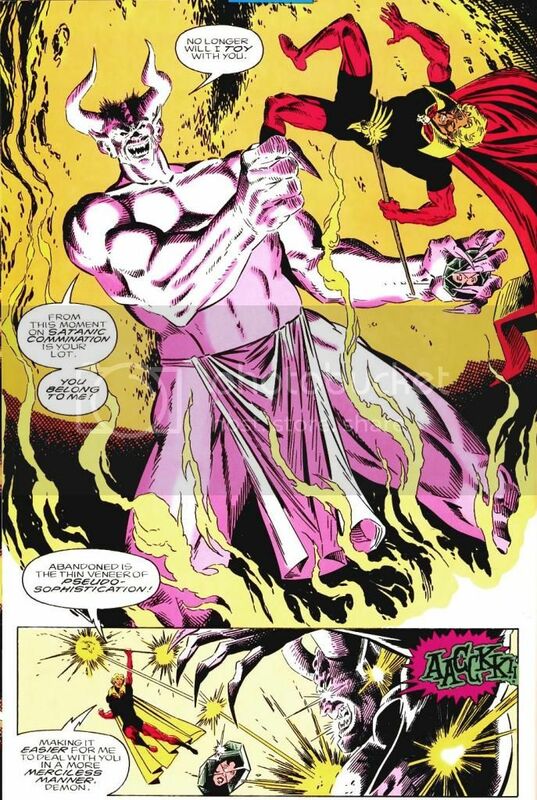 Has has the ability to absorb power, energy and souls and take their ephemeral energy and convert it into physical. 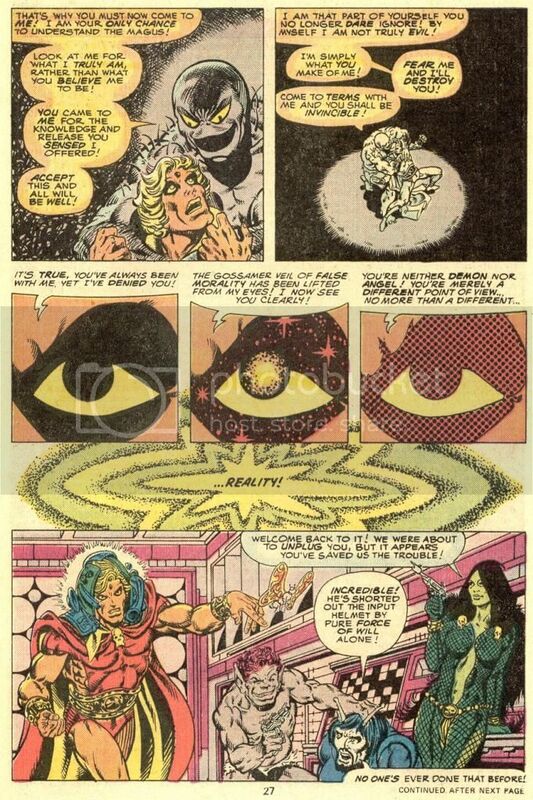 Absorbs souls and feasts on Genis-Vell’s cosmic awareness (soul of the universe) to become whole again. 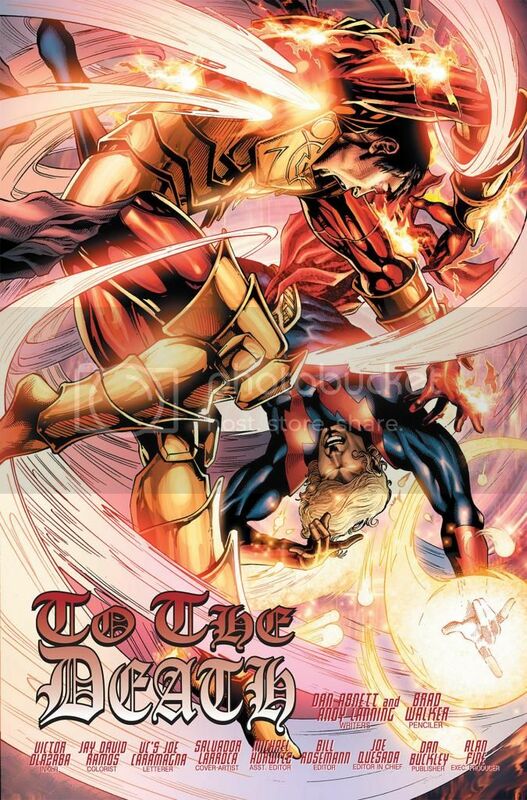 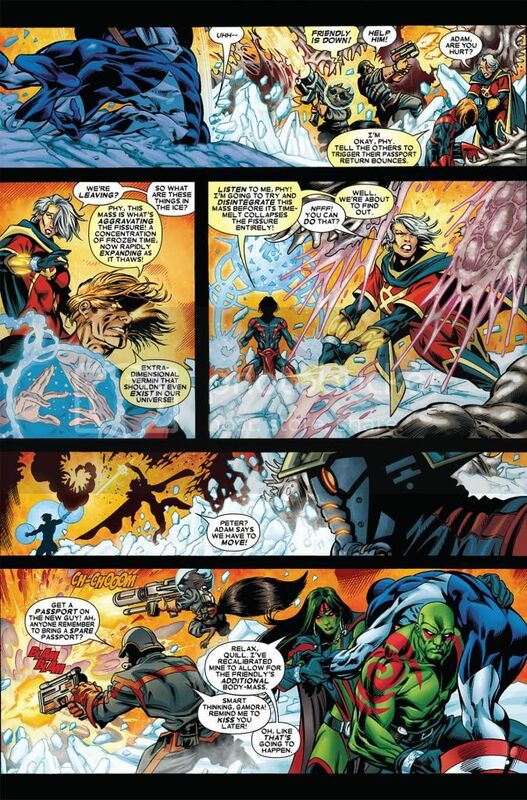 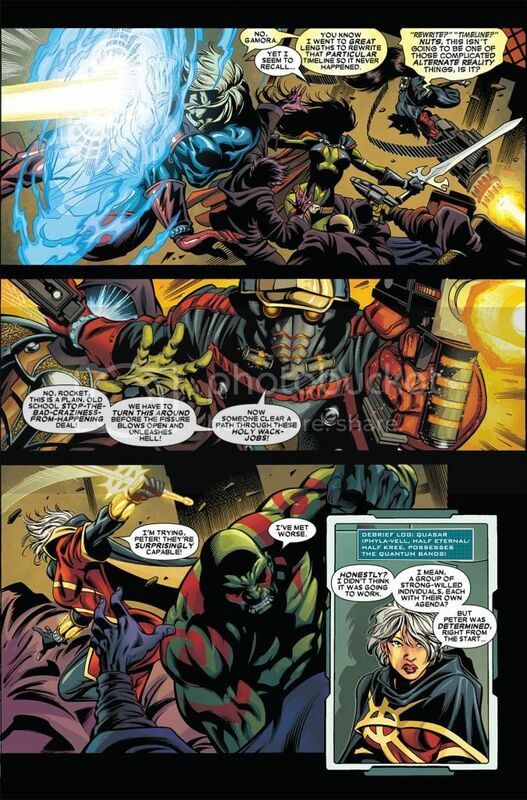 Channels the souls and life energies of billions of souls and pours them into Phyla-Vell to create an energy sword capable of destroying Phalanx Ultron. 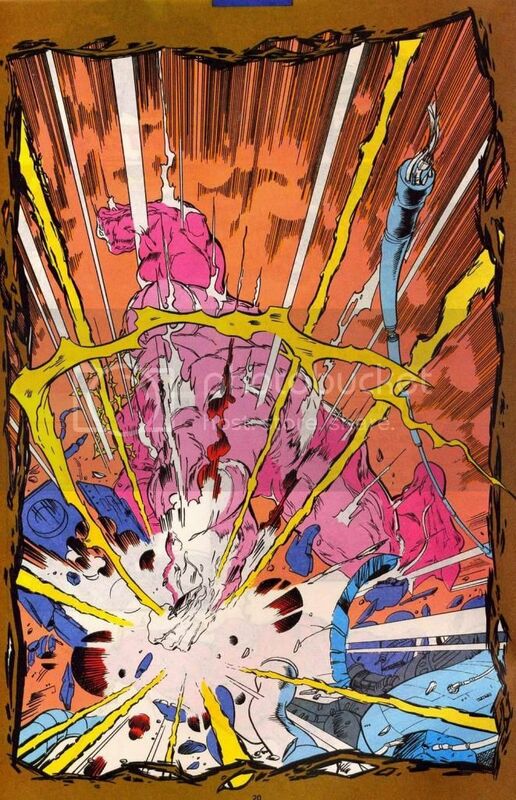 The souls that Adam has absorbed using the soul gem are a part of him and their energies can be utilized to fire blasts or for illumination. 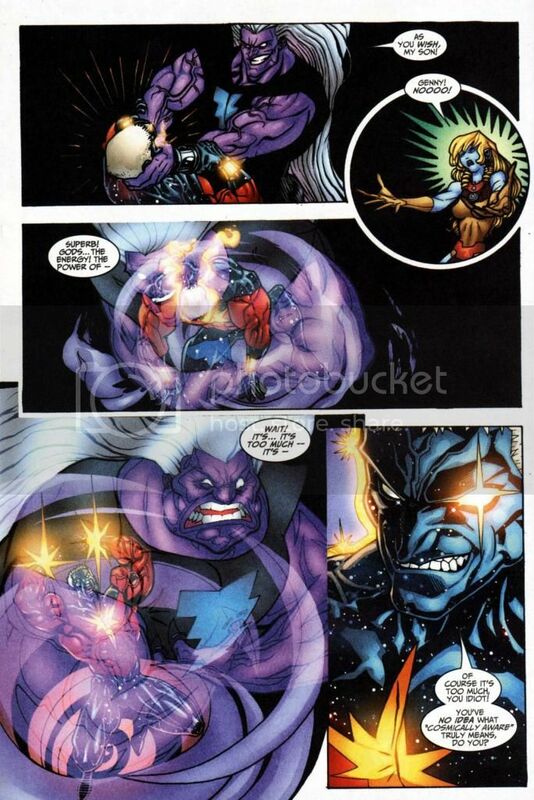 Revitalizes his body and recharges himself by absorbing a piece of Star-Thief’s soul. 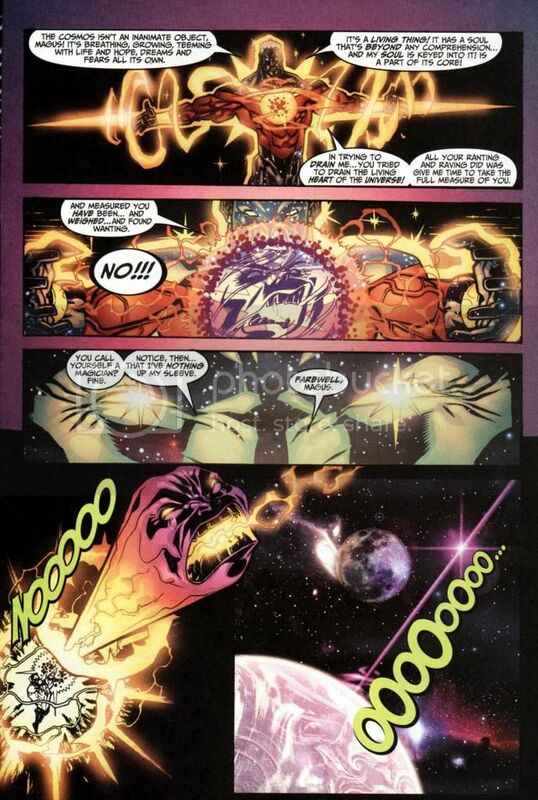 Uses his soul gem’s energies to send a blast down his karmic path, cleanse it and destroy it, effectively destroying a whole universe/timeline. 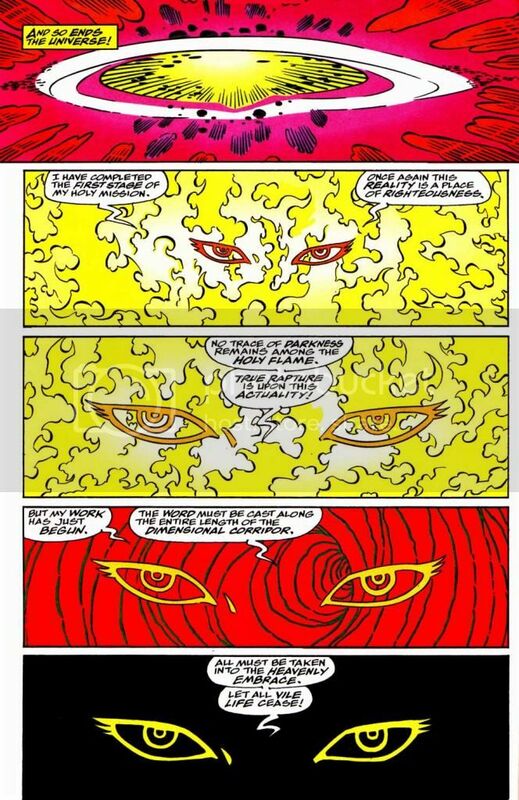 Absorbs the belief energies of a belief font and uses them against a powerful otherworldly creature. 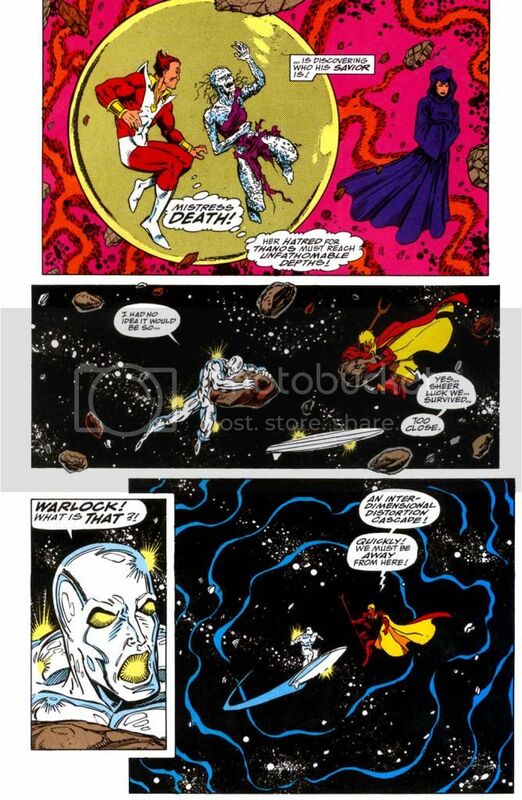 Warlock channels the faith and belief and soul energies of millions of followers to design a large-scale enchantment that comprises over fifteen million individually and skillfully conjureneered psillables to close a rift in space that would have destroyed the universe by grafting an unused timeline to a current one. 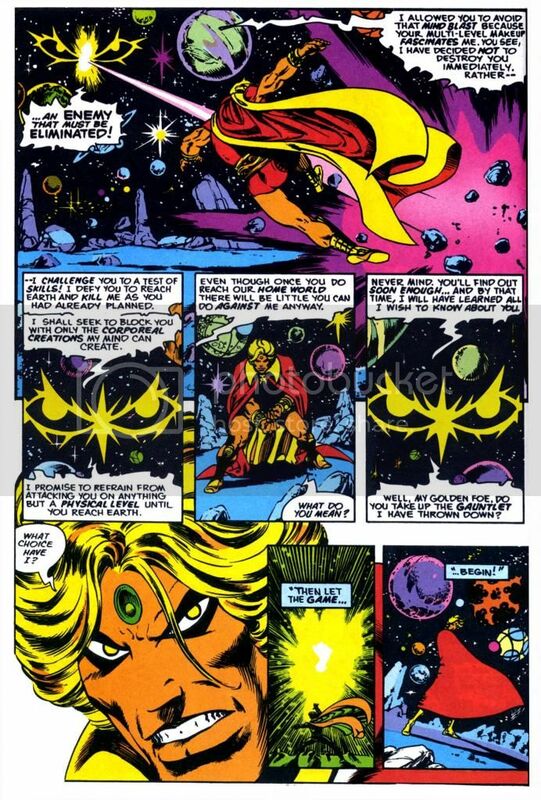 Uses the faith energies of converted homeworlds to destroy a large number of planets to open a gateway to the cancerverse. 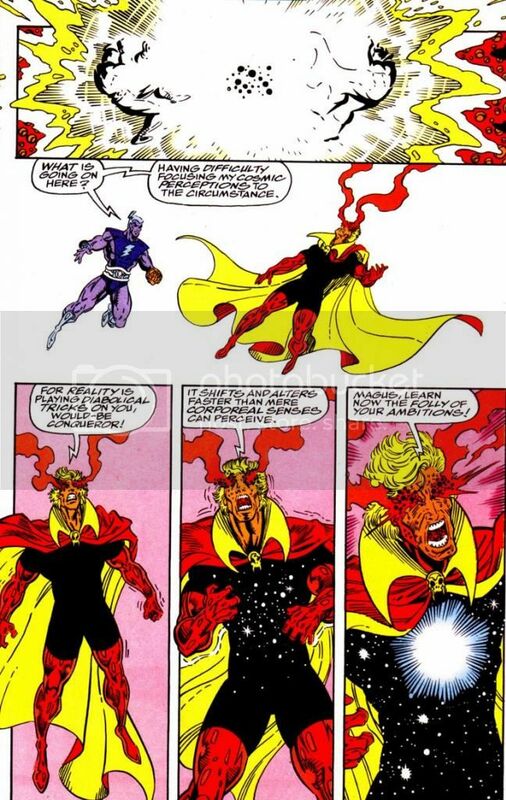 Uses belief energies to possess 30% of the US population at first, with the number increasing rapidly. 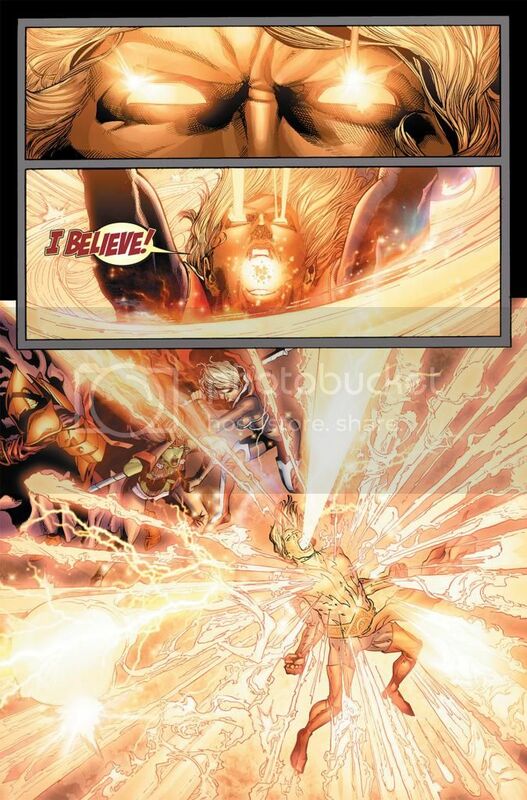 Uses energies of a belief font to blow up all of the Church’s templeships. 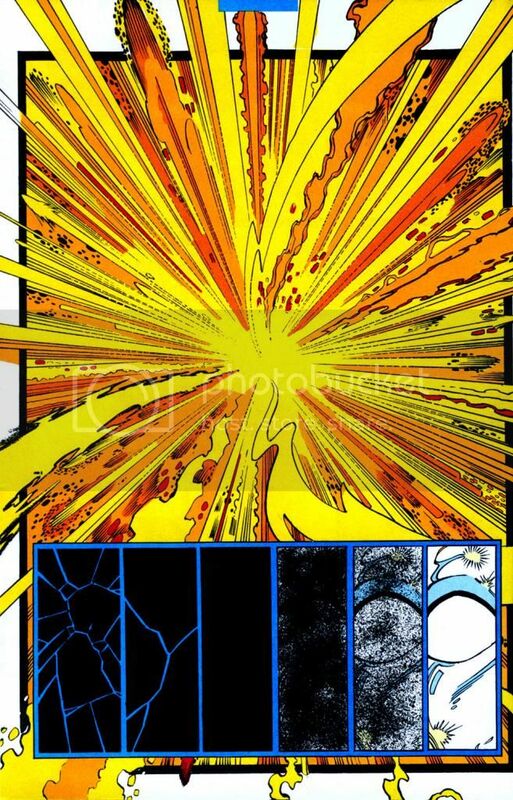 Simply the energy output from Adam being born destroyed the surroundings and was more than the Human Torch could absorb. 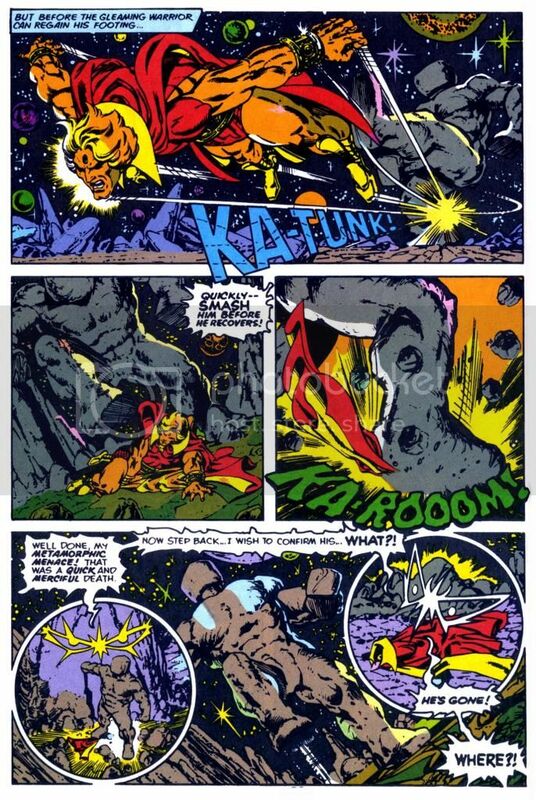 After being born, just the energy he harnesses to depart into space seemingly destroys the giant beehive complex (although it was later changed that he actually teleported the beehive away). 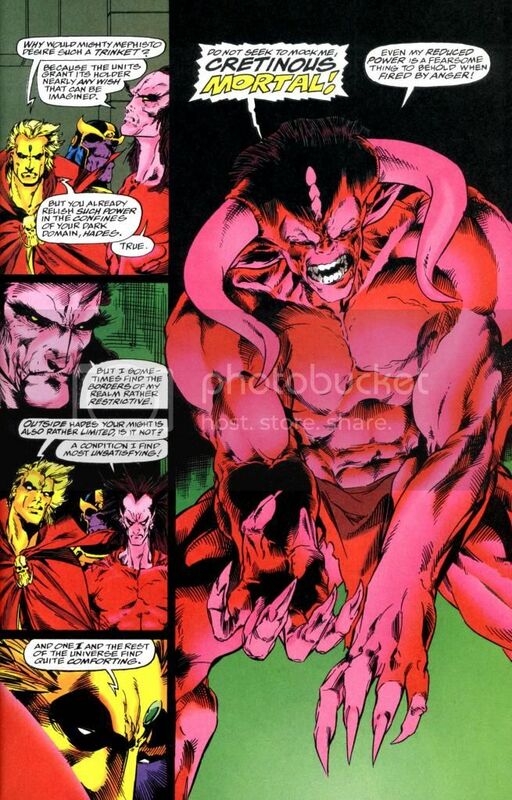 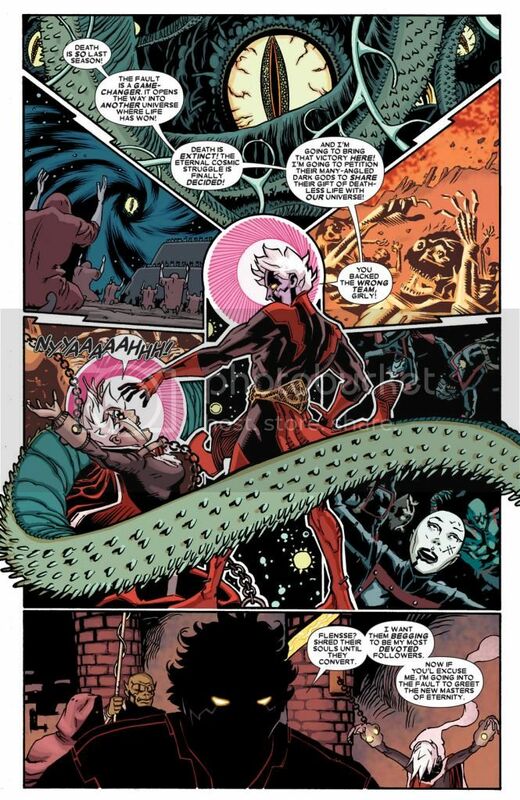 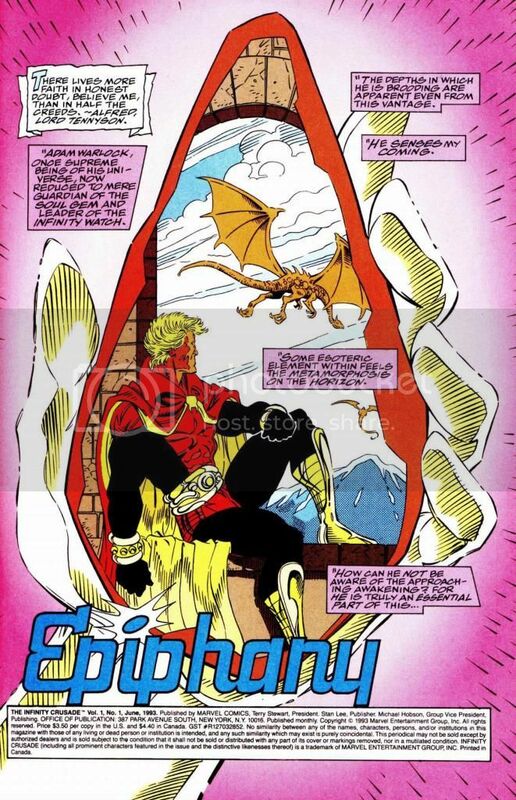 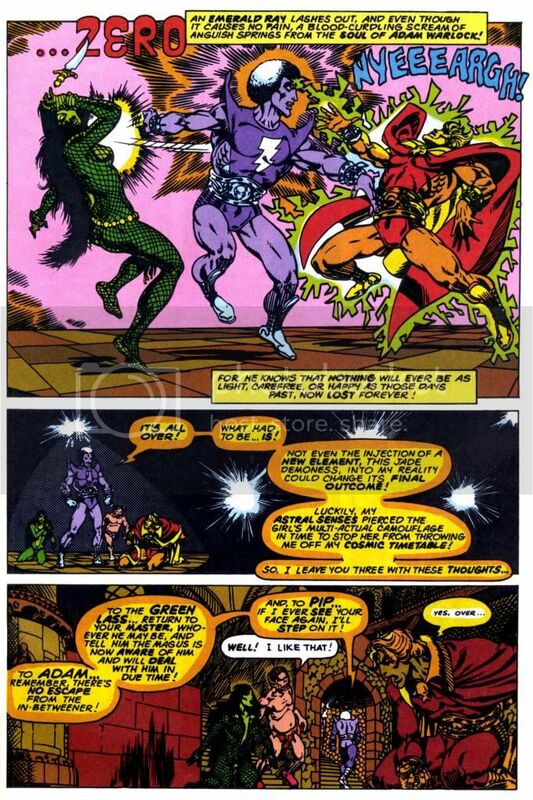 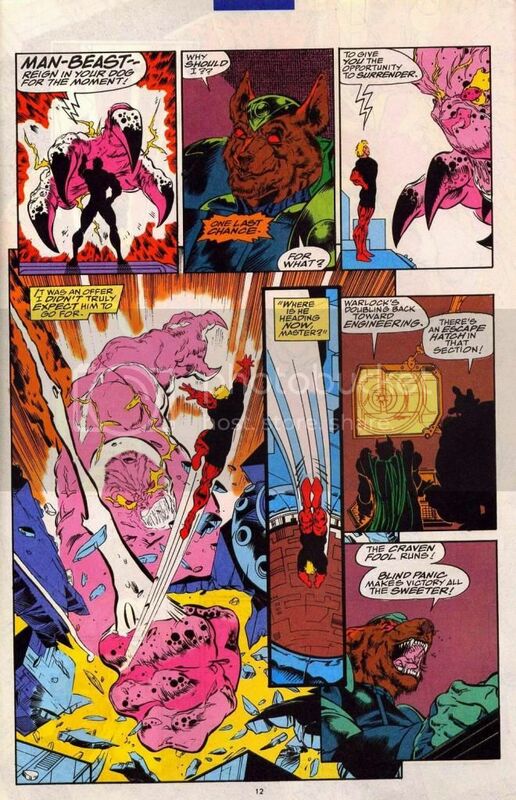 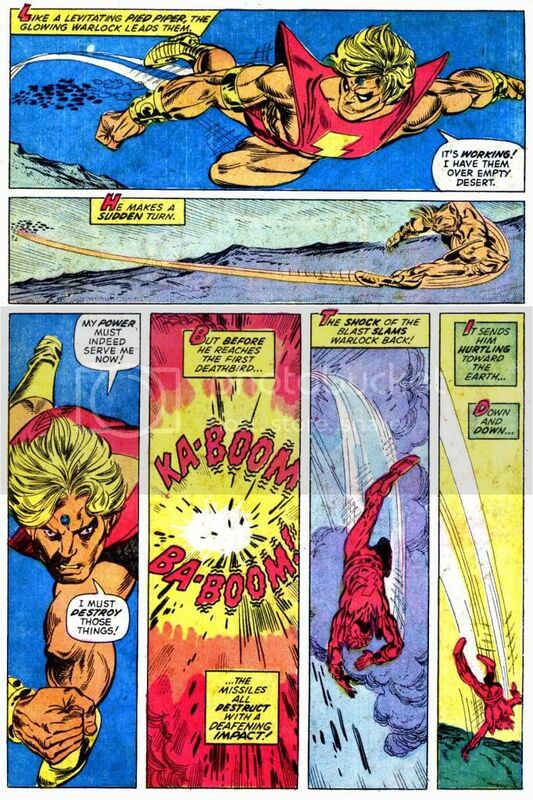 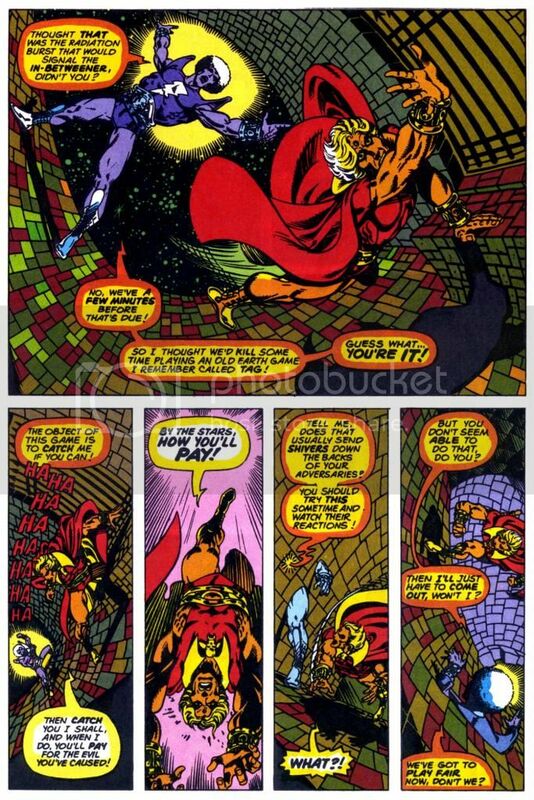 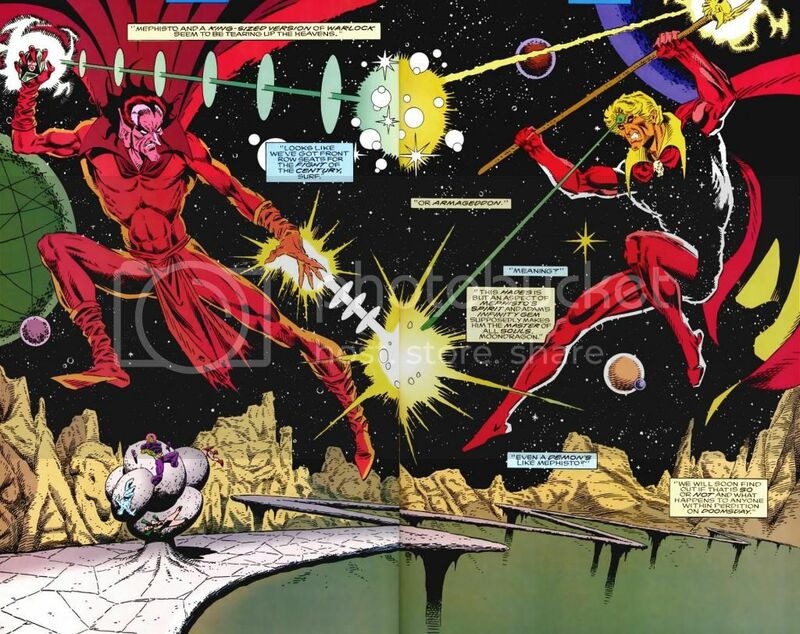 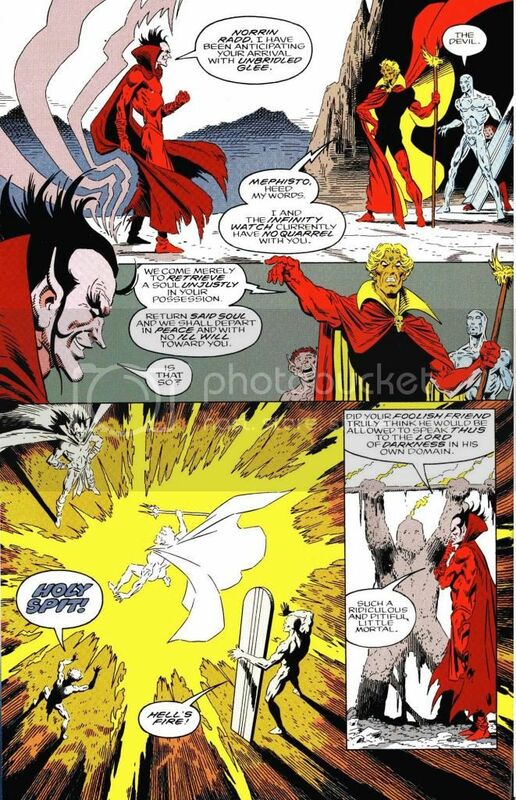 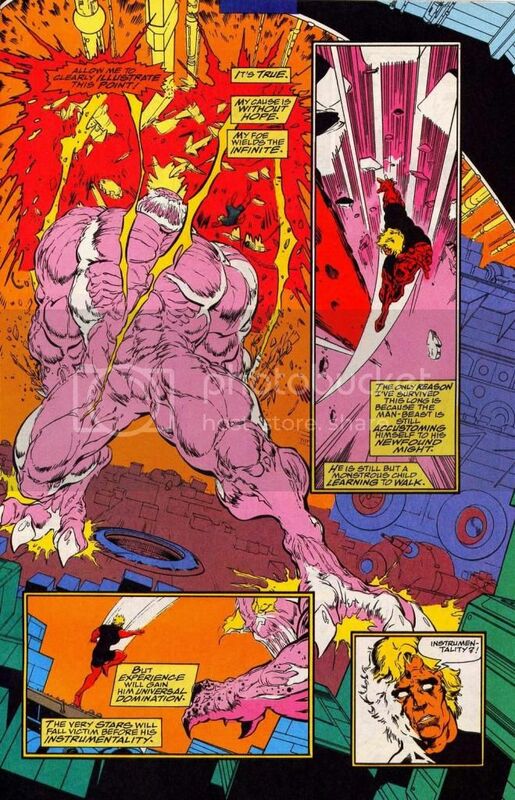 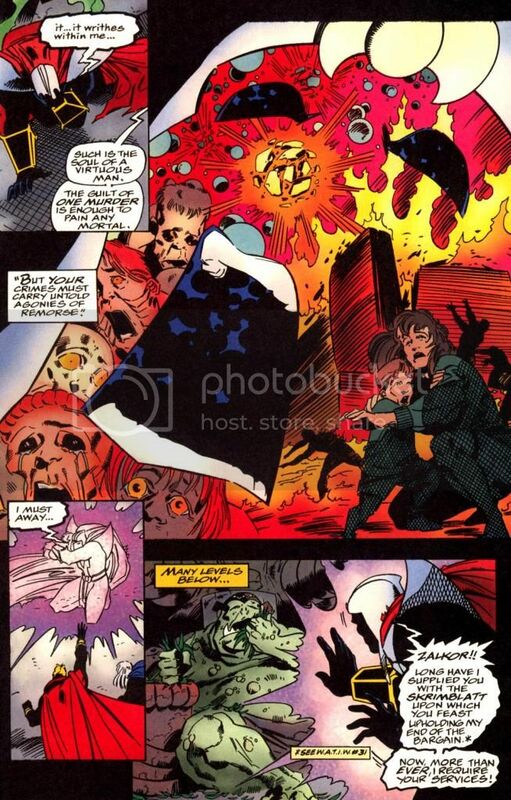 The clash between Mephisto and Adam inside Mephisto’s realm creates a giant sphere of spiritual energy in which the giant-sized versions of the two combatants match their energies. 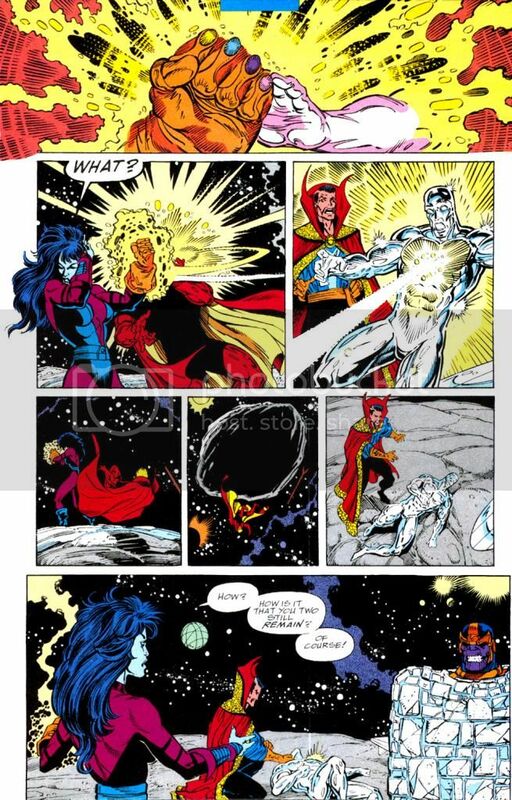 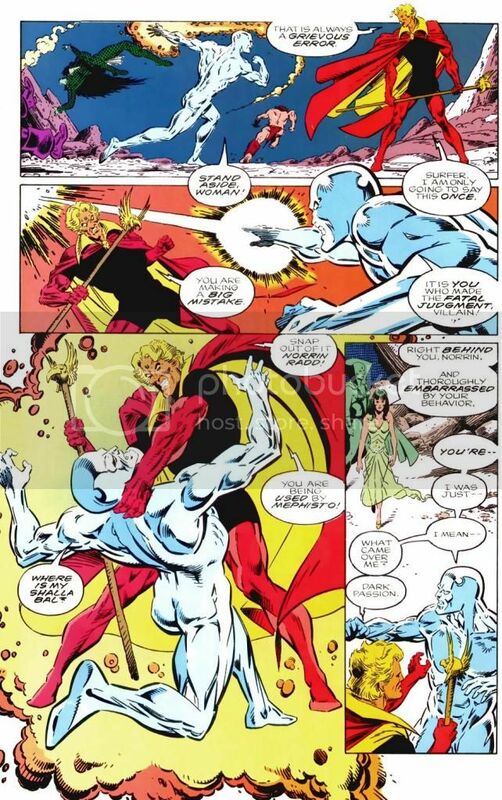 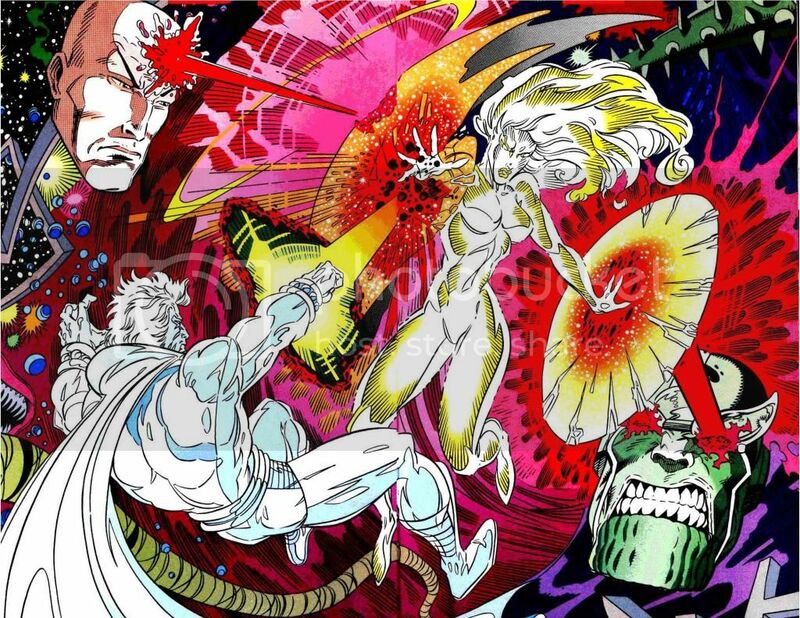 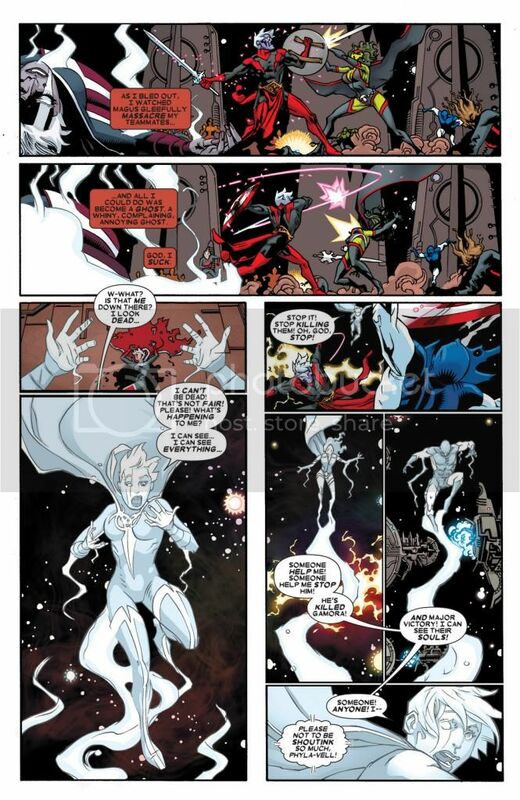 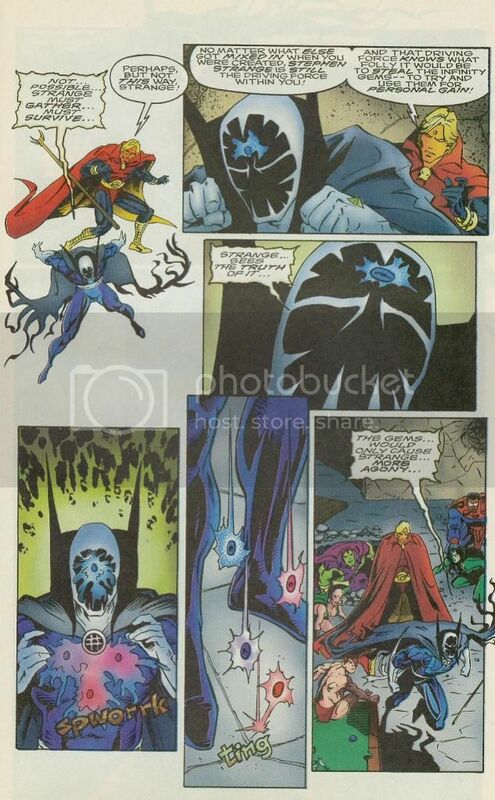 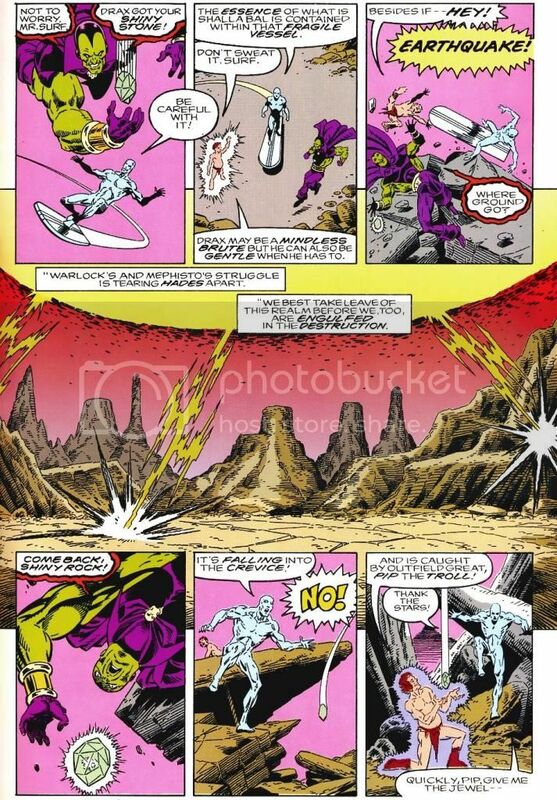 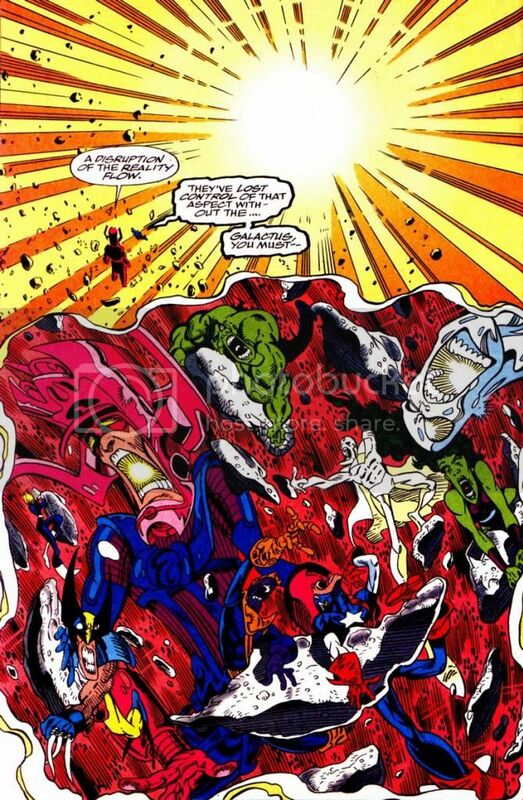 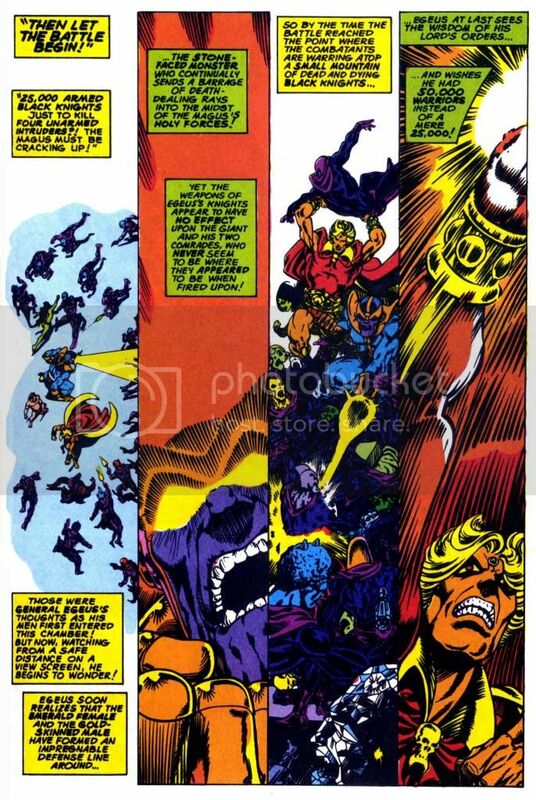 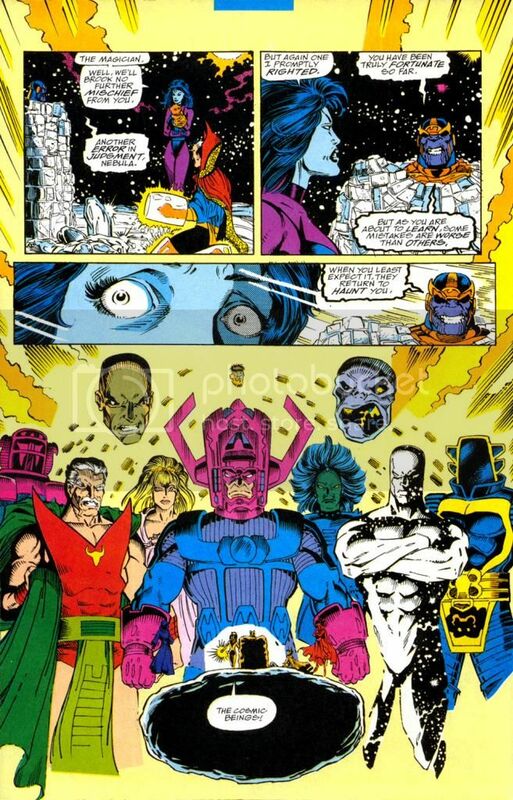 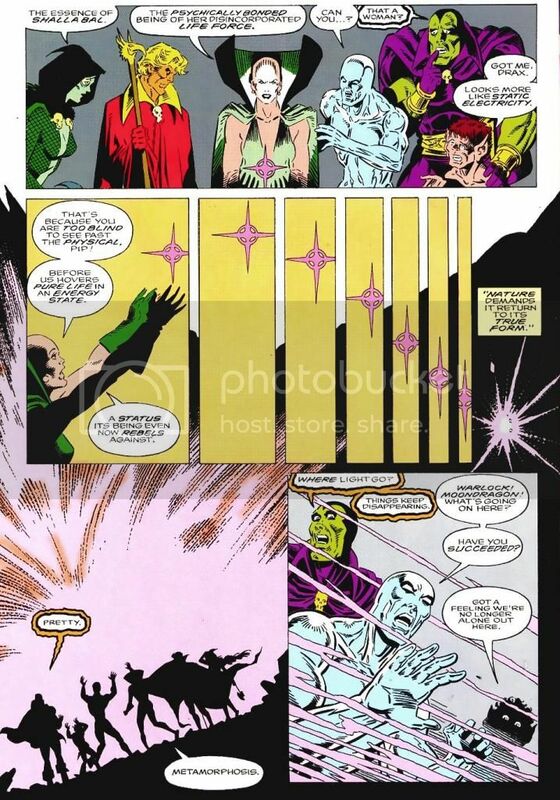 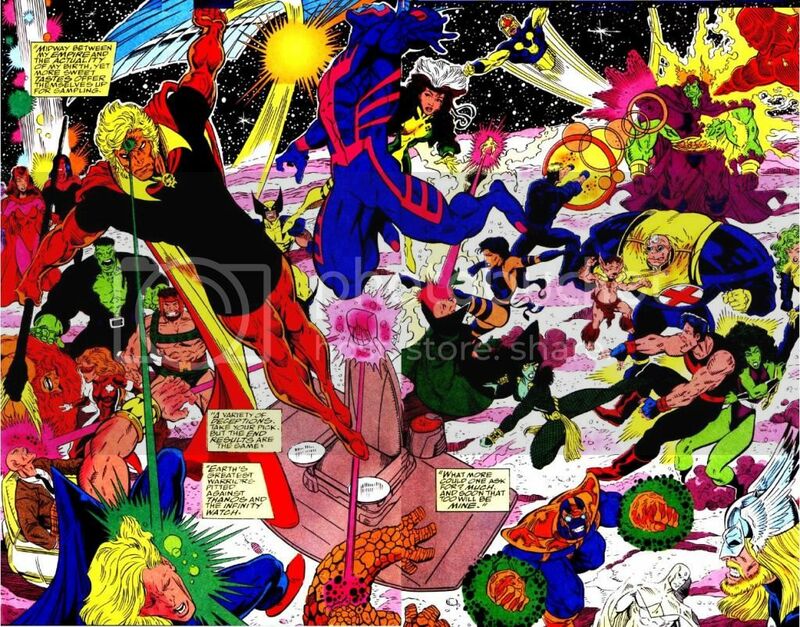 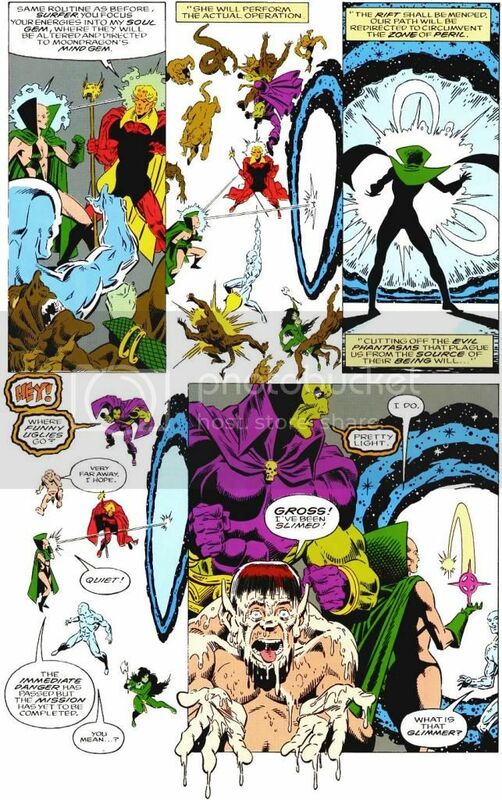 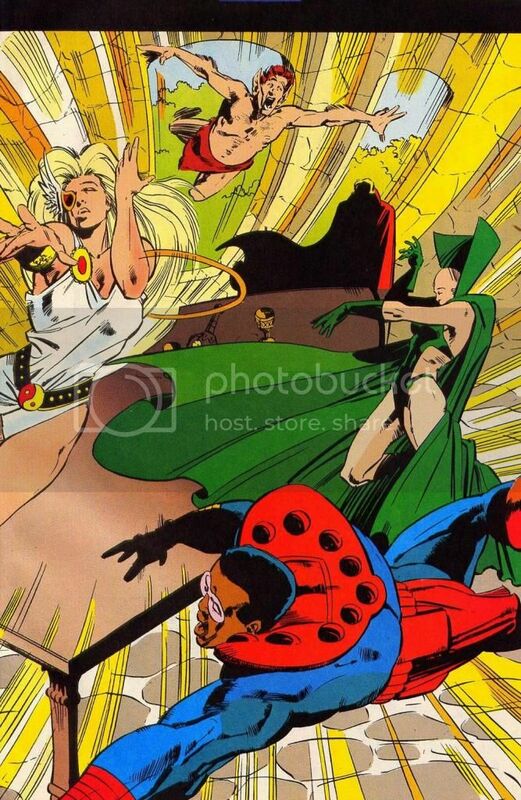 The astral energies released from their battle pulsate and ripple, endanger the Silver Surfer and the Infinity Watch and threaten to destroy the whole realm. 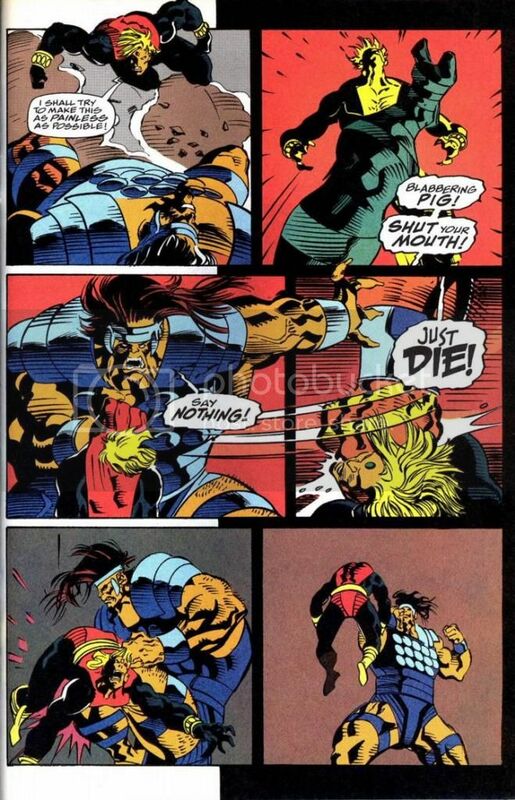 In the end, Adam soundly wins. 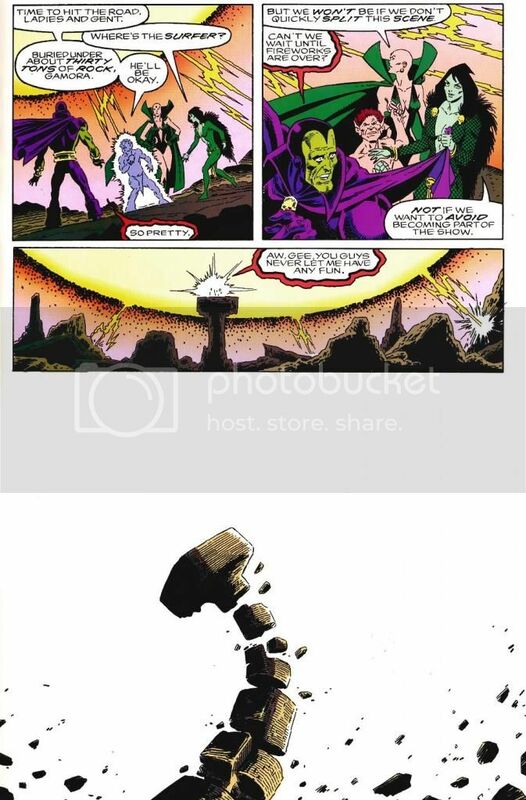 Destroys skyscrapers, the Kremlin, the White House etc. 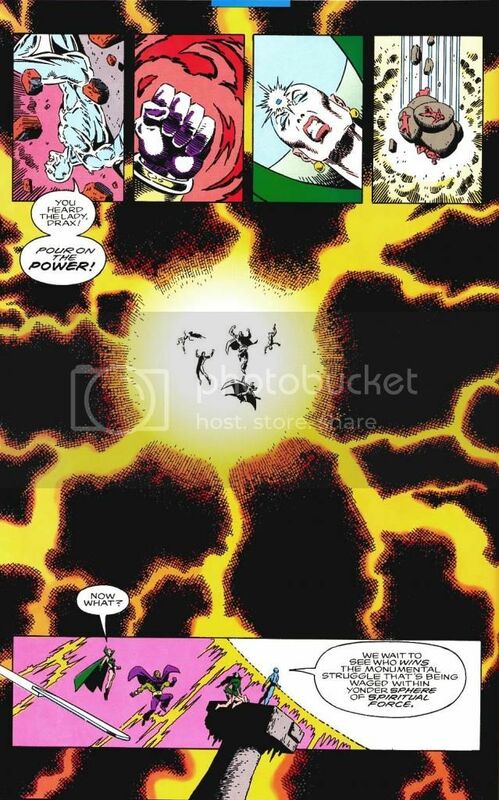 with his energy blasts. 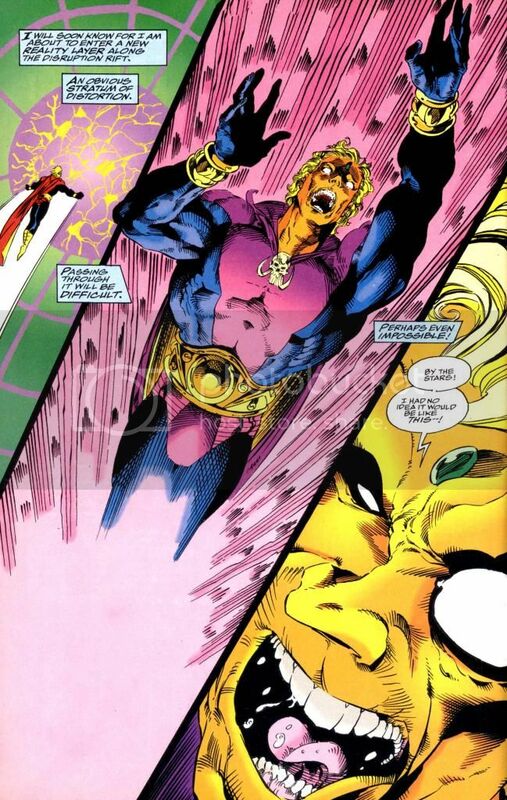 A blast from his soul gem that would level a building. 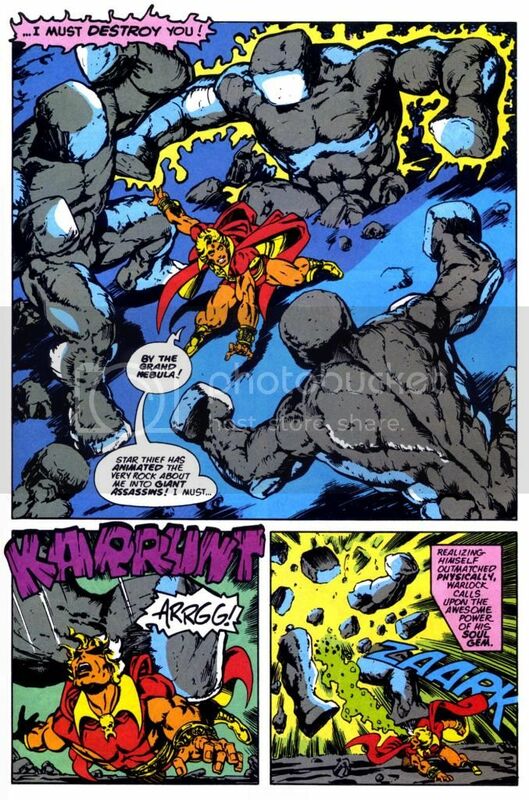 Casts a spell to disintegrate an asteroid. 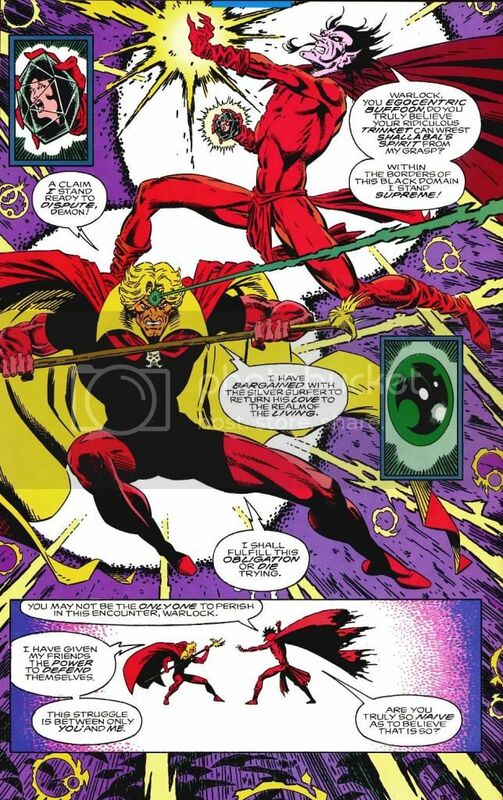 Matches Mystic’s incantations with the soul gem’s energies. 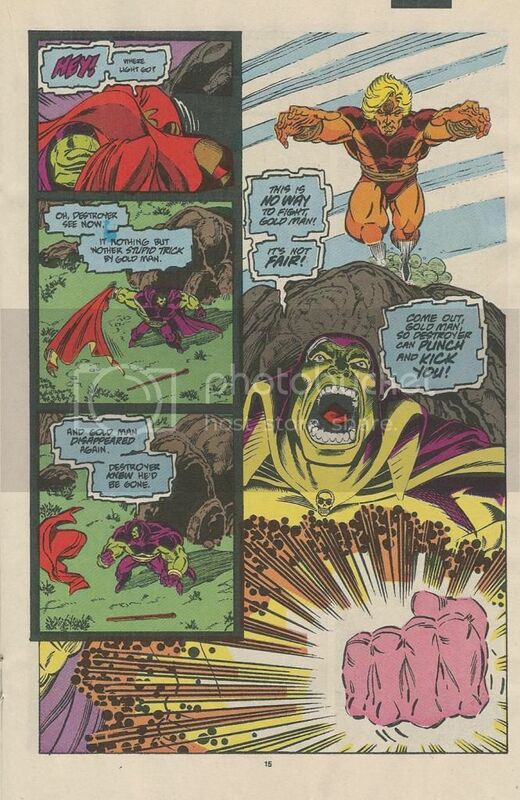 Matches Man-Beast’s mindblasts with the soul gem’s energies. 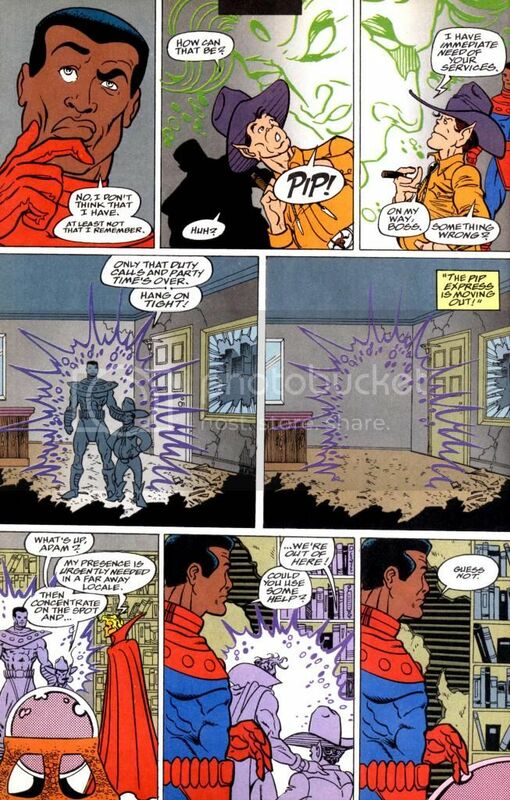 Temporarily matches Stranger’s energy blasts. 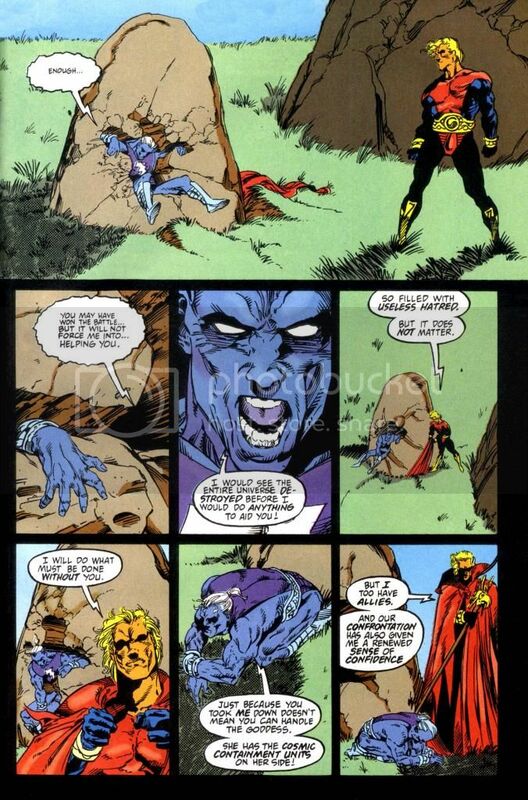 The combined output of his and the Gardener’s gem is enough to drive away the Stranger. 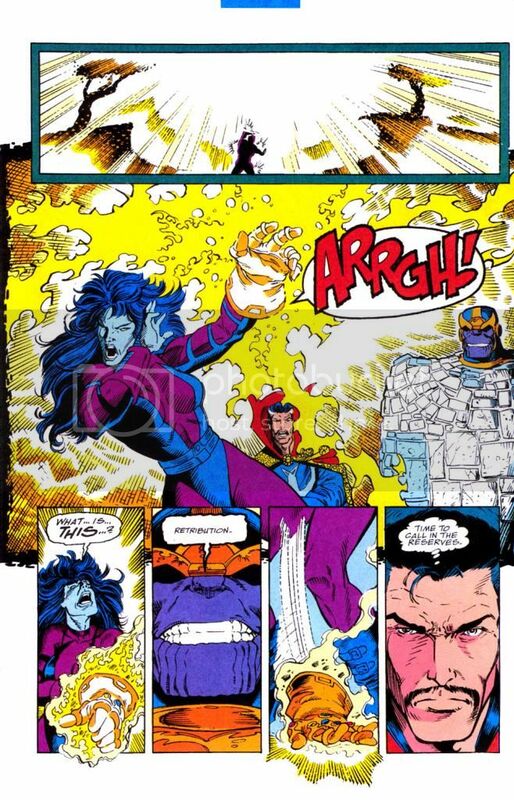 Emits energy to knock Thanos down. 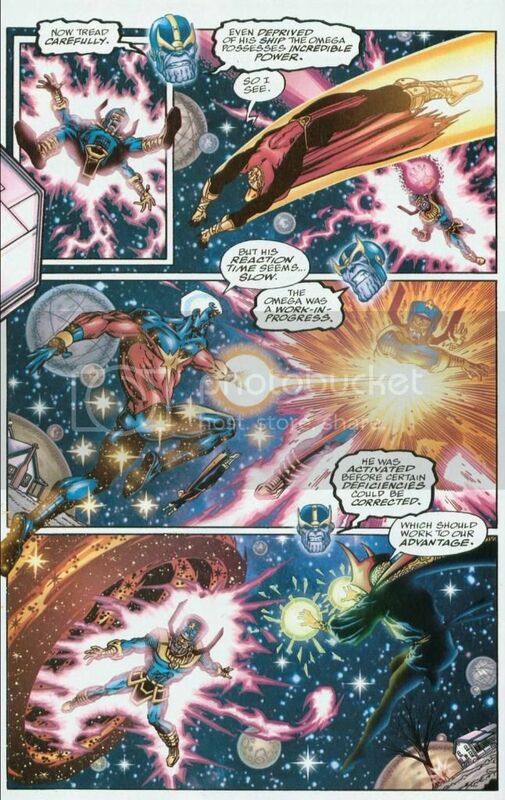 Separates Omega (Galactus/Thanos clone) from his craft with a blast. 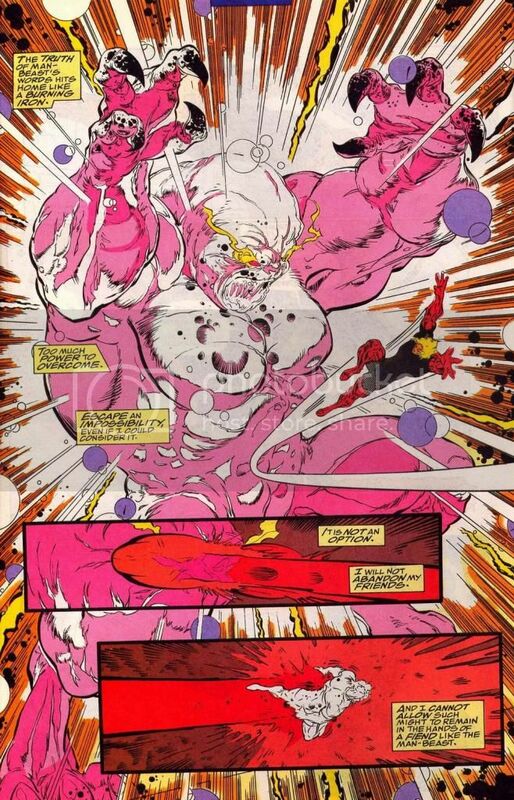 Blasts his way to the core of the earth and hurts a massively powered up Brute with a blast. 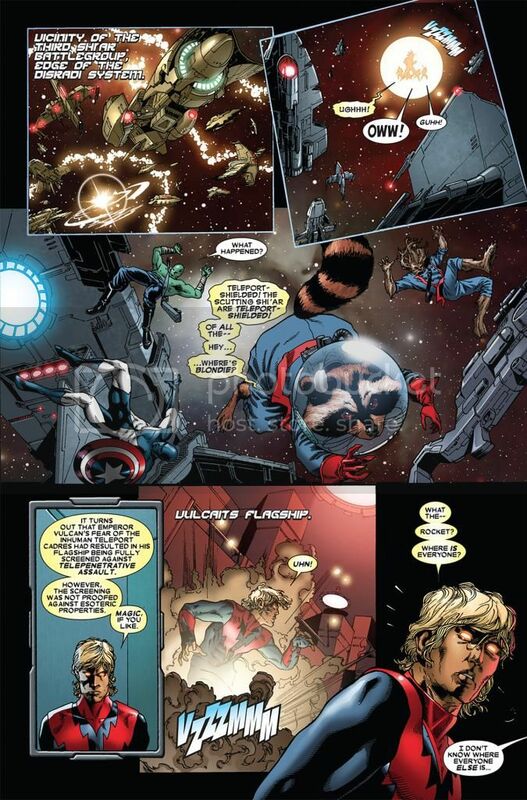 Knocks away the Guardians of the Galaxy with a large scale blast. 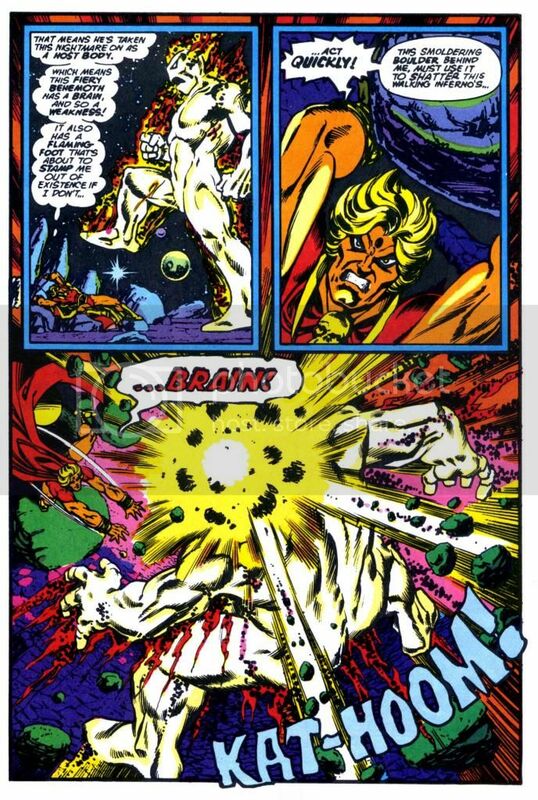 While severely drained, destroys Magique’s shield and stuns the Imperial Guard with an energy blast. 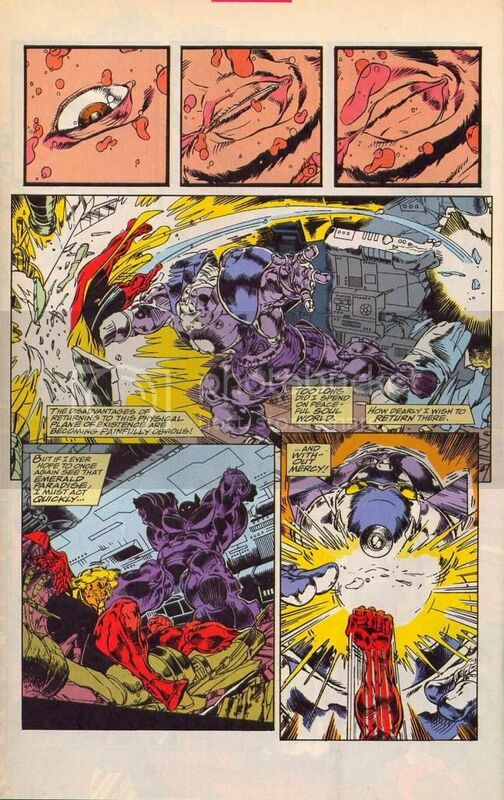 Destroys a Punisher robot with a blast from his gem. 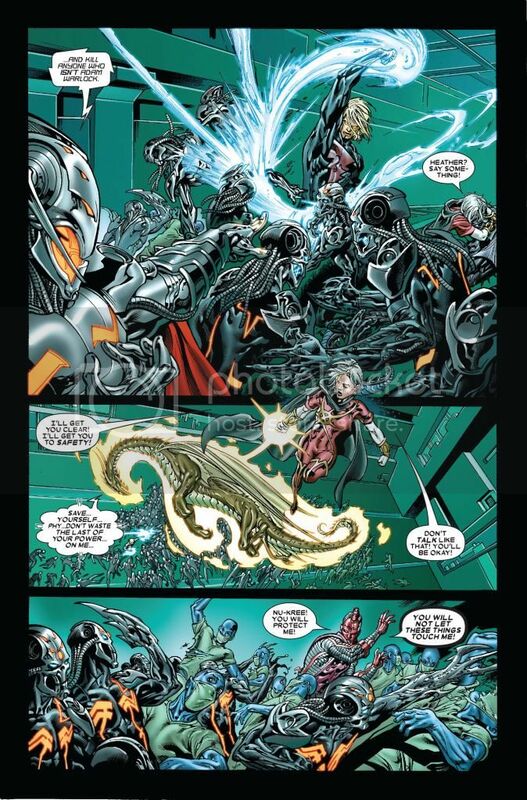 Damages Ultron’s (Phalanx version) giant body with energy blasts. 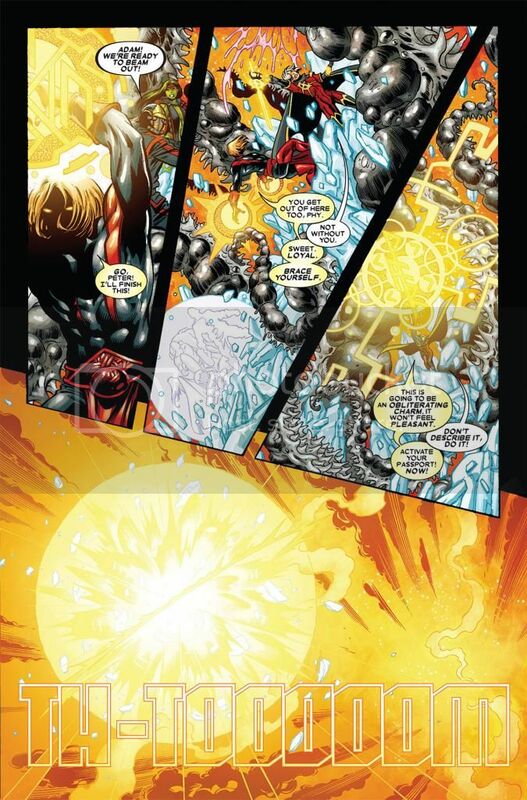 Damage to Nova (with full Nova force) from Adam’s energy blast. 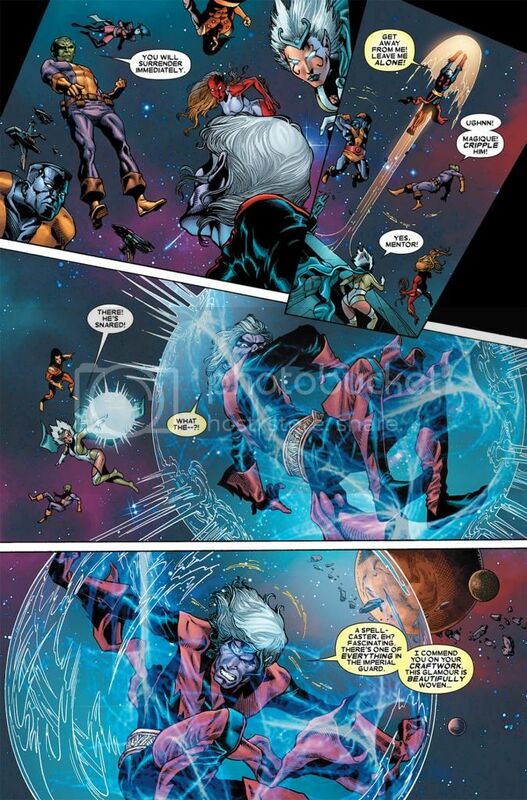 Uses a force field to transport himself and the others. 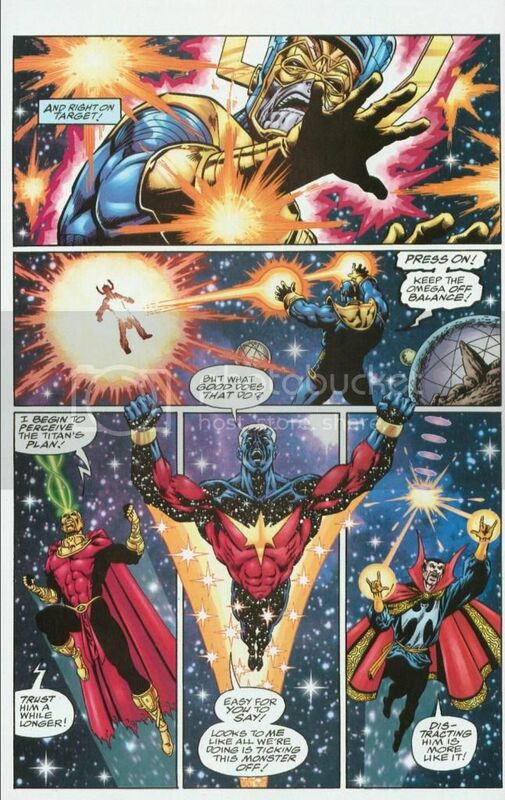 The field was strong enough for them to effortlessly fly into the heart of a star and endure the star going nova. 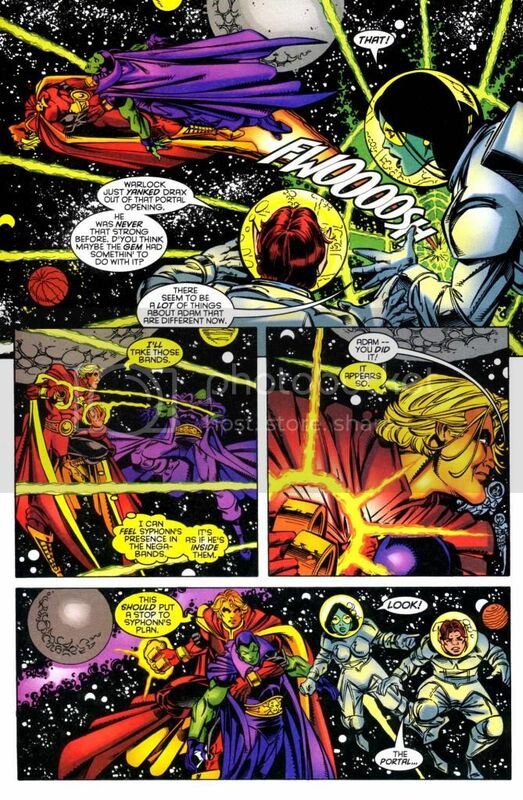 Uses a force field to set a spacecraft down. 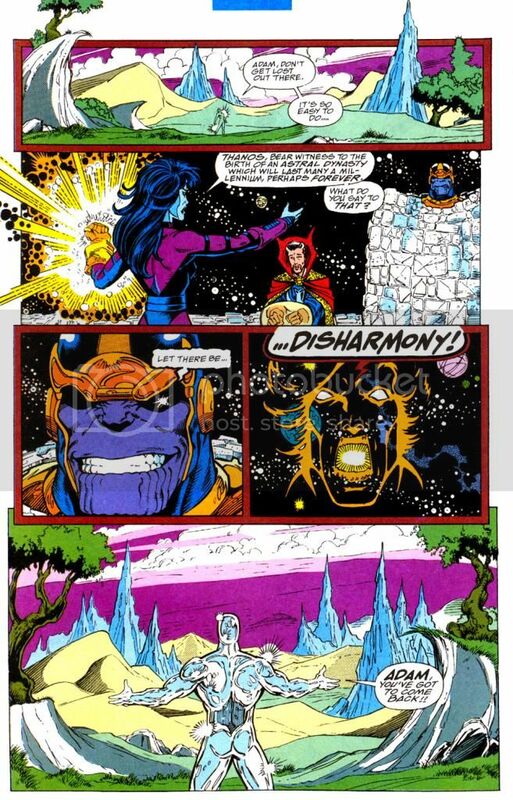 Using his gem, creates an energy construct. 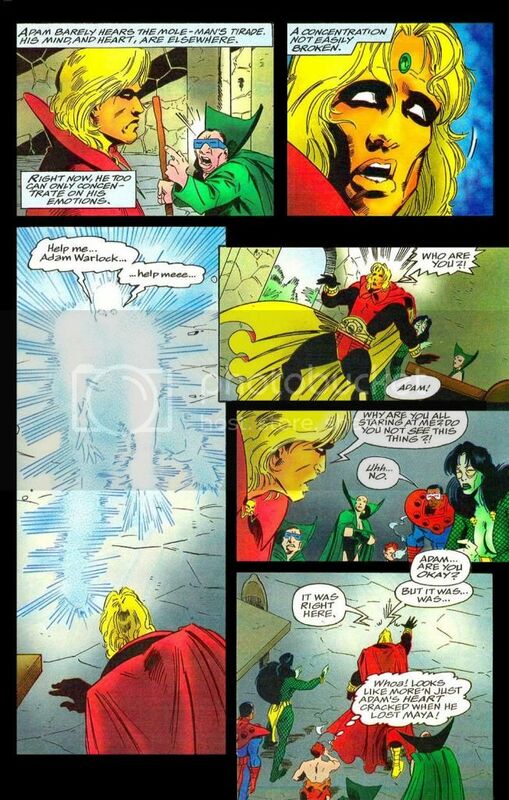 Adam also has used a mindshield that even Thor’s hammer could not dent. 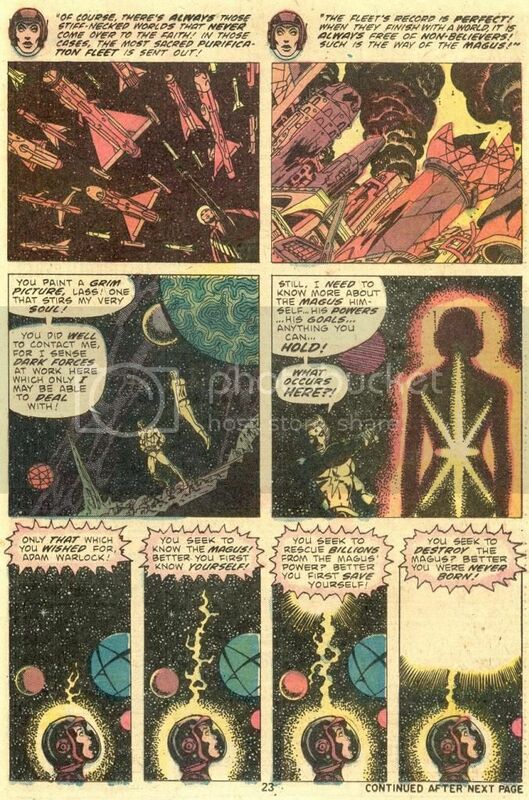 Please see telekinesis section. 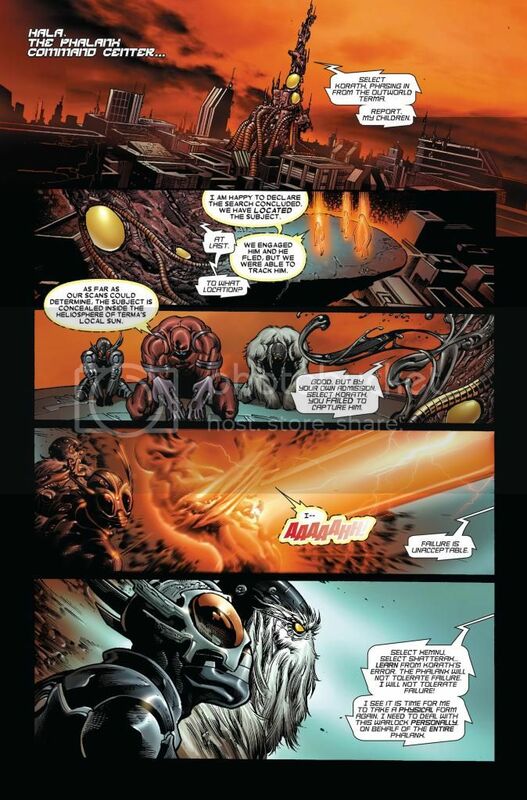 Transmutes a whole planet(oid) into ultra-transitional metal. 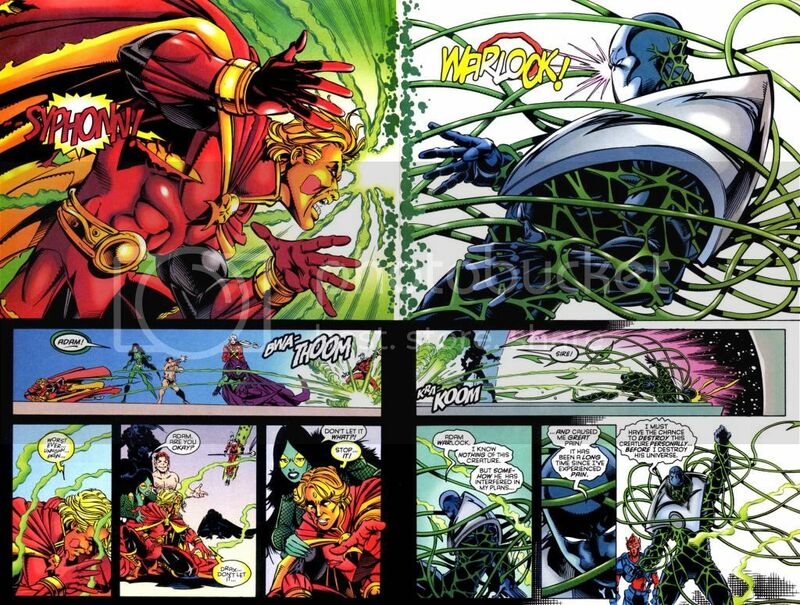 Causes tendrils to attack Hamilton. 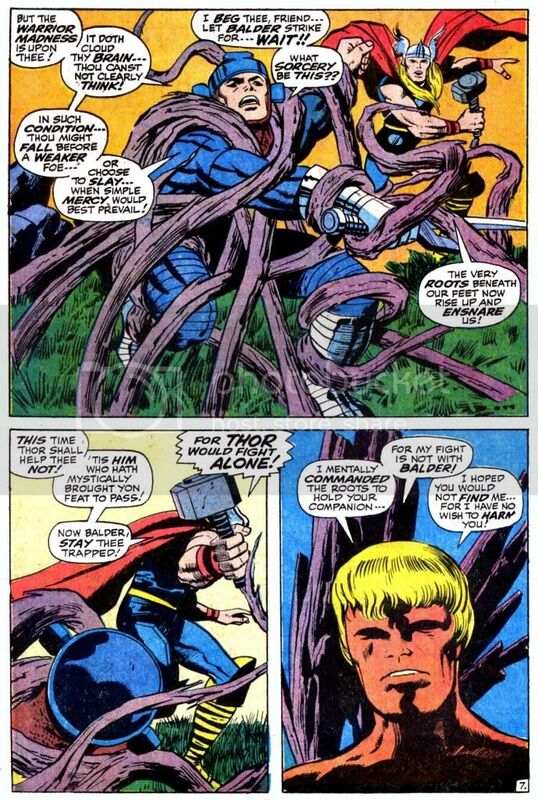 Causes the roots to attack Balder. 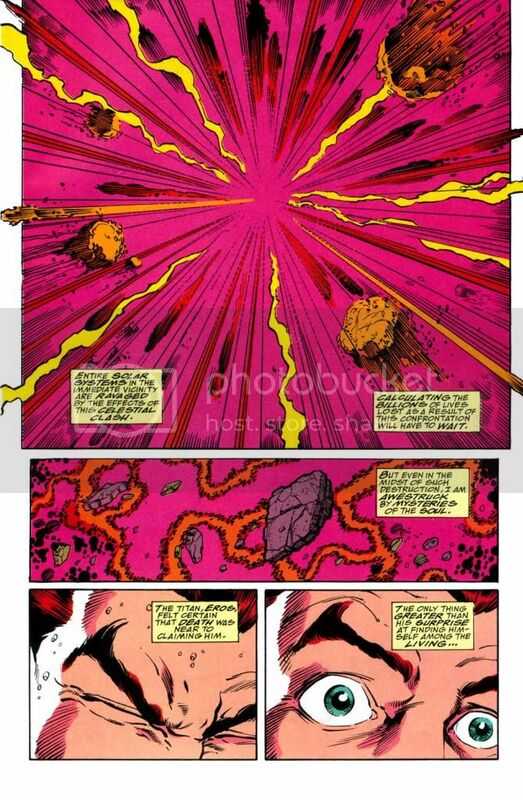 Can create a nigh-indestructible cocoon around himself. 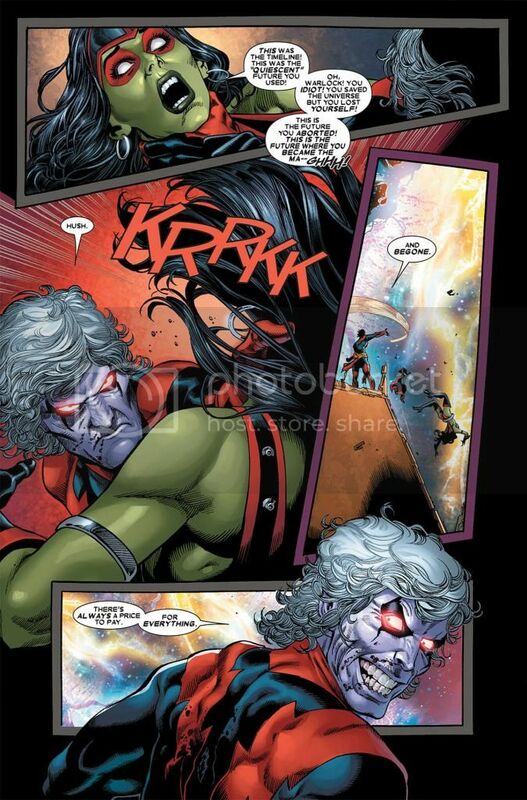 Takes dead bodies of 3 humans and turns them into new superhumanly strong bodies for himself, Pip and Gamora. 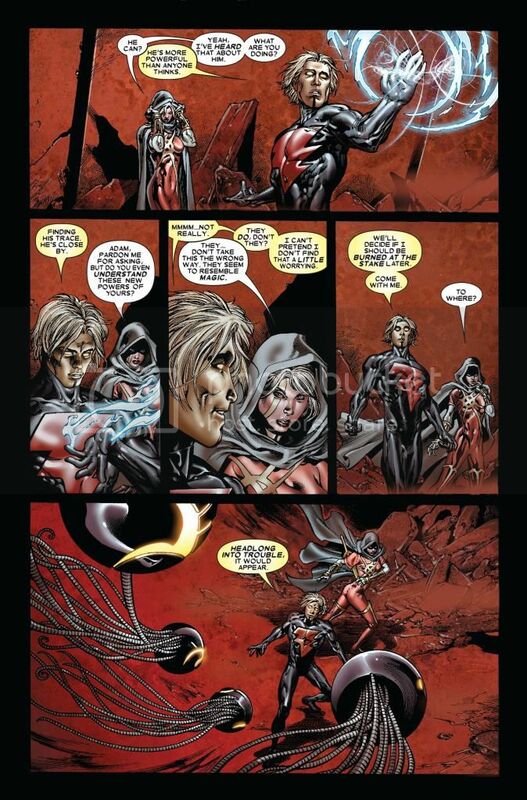 Possibly transmutes himself back after being turned to ash by Mephisto. 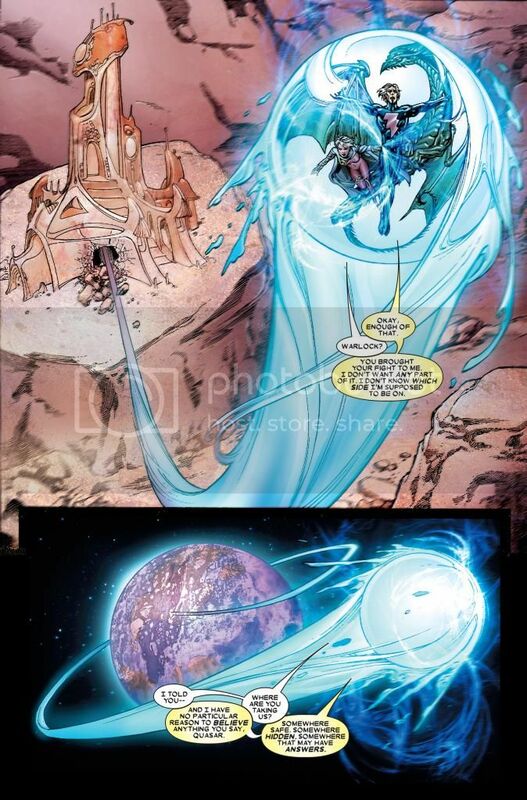 Creates a sphere of aerospace to contain Sif. 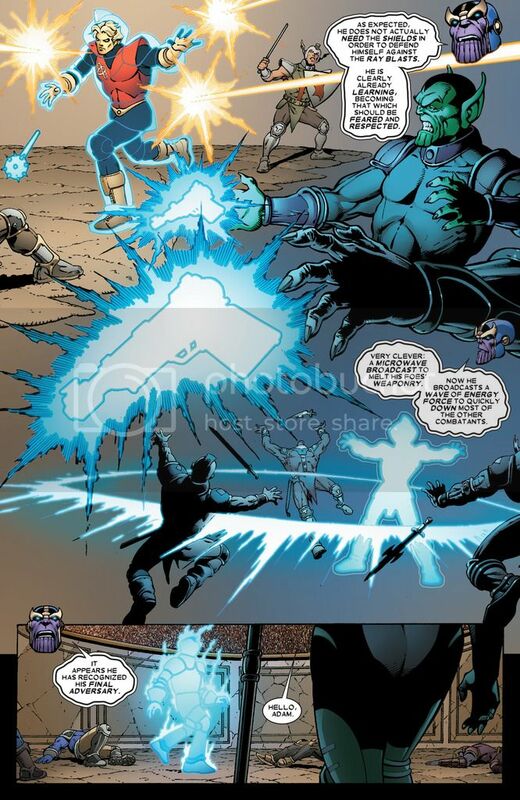 Creates a molecular wall for protection. 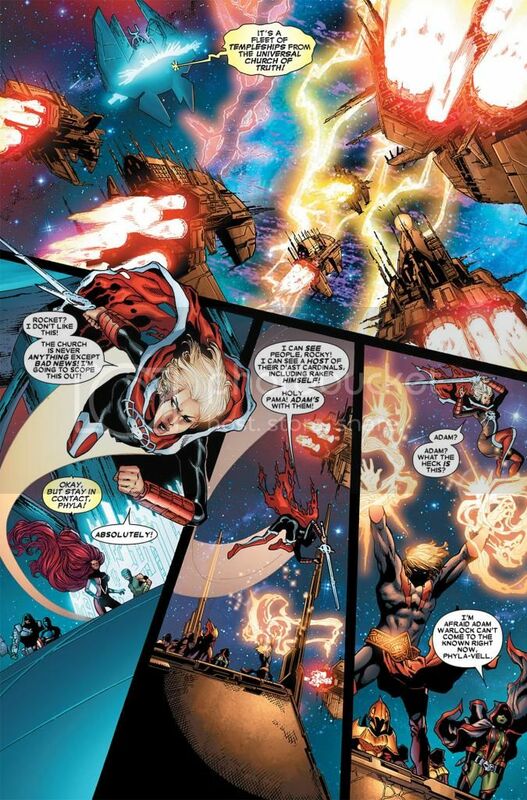 Reassembles the molecular structure of a spacecraft. 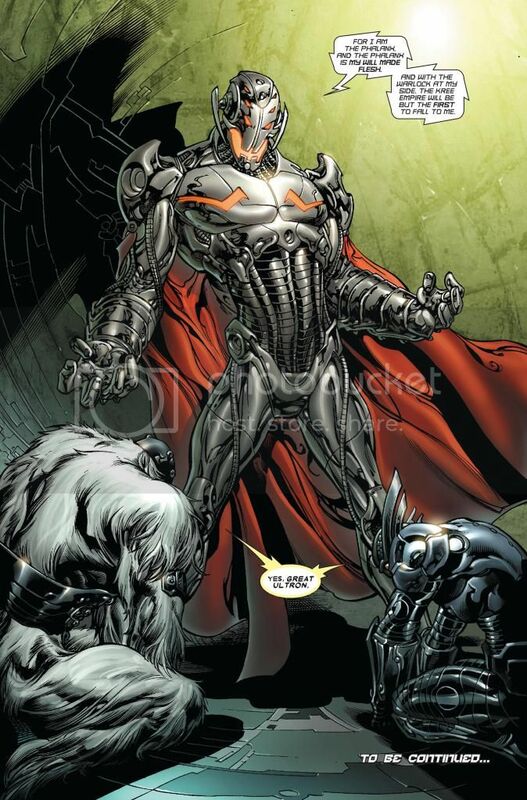 Creates a new costume for himself. 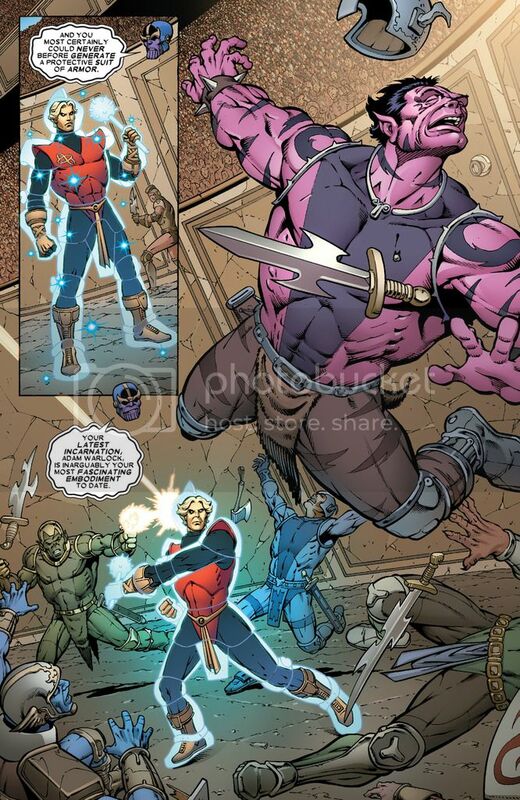 With the soul gem, he can attune himself to matter’s molecular vibrations and break matter down or prevent a change from occuring. 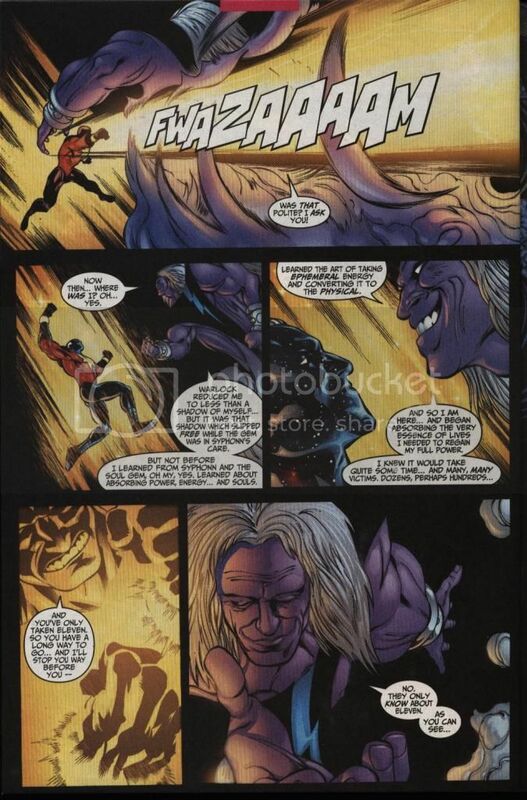 Also, he can affect the living genes to devolve his opponents. 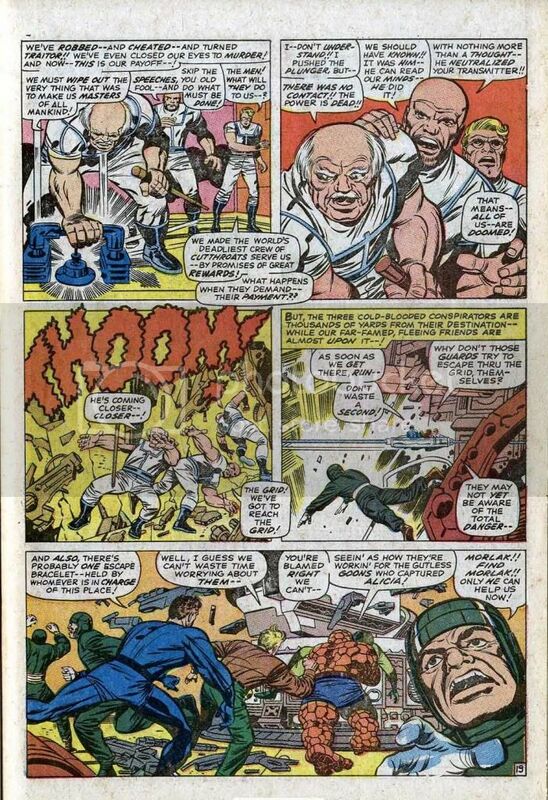 This tactic has been used to defeat Man-Beast, the Brute and various New Men. 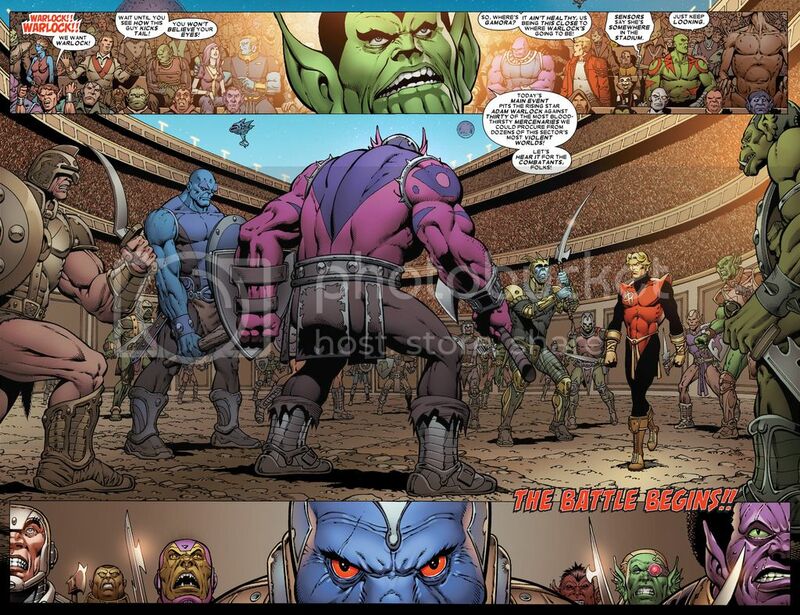 Please see the battle section. 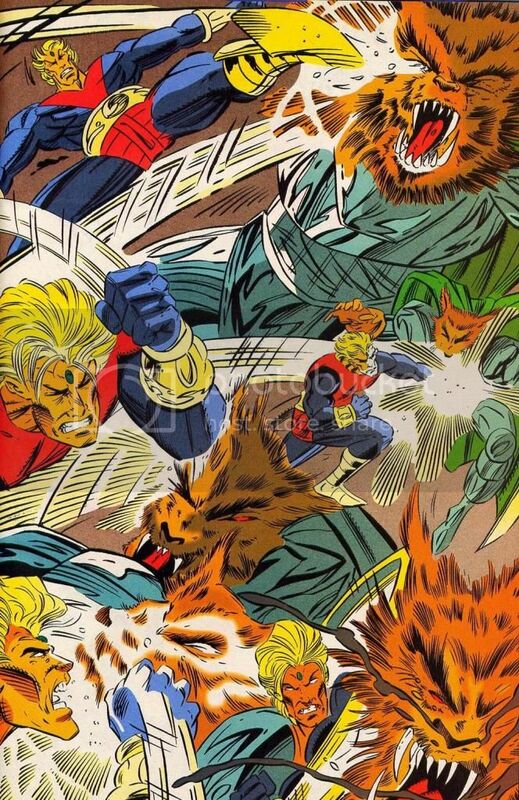 Devolves the Man-Beast and all of his New Men with a wave of his hand. 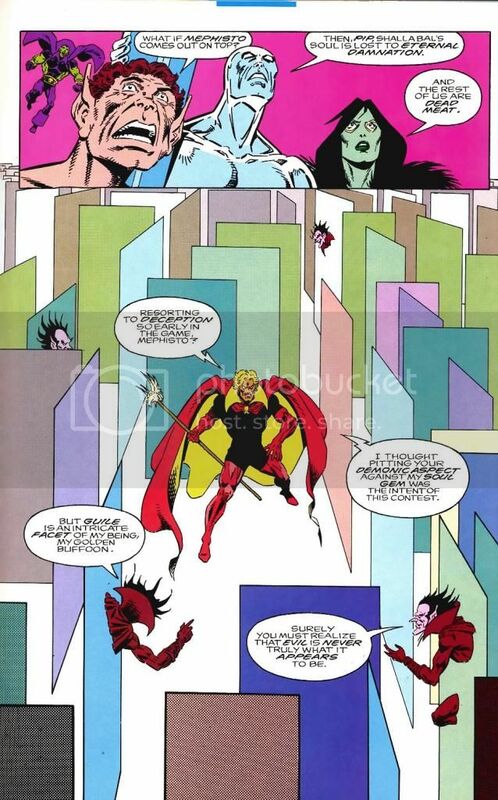 Turns a giant demon into a small toothless gnat. 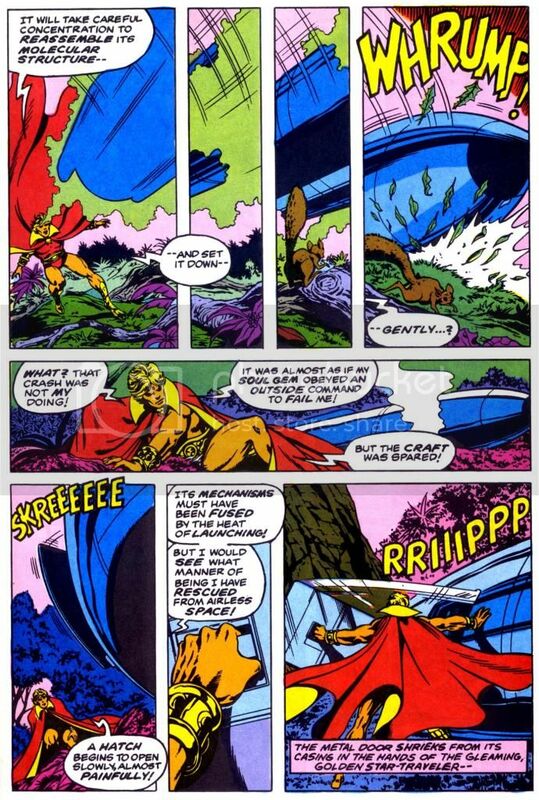 Devolves Rhodan into a mouse and his Star-Hound into random solar impulses. 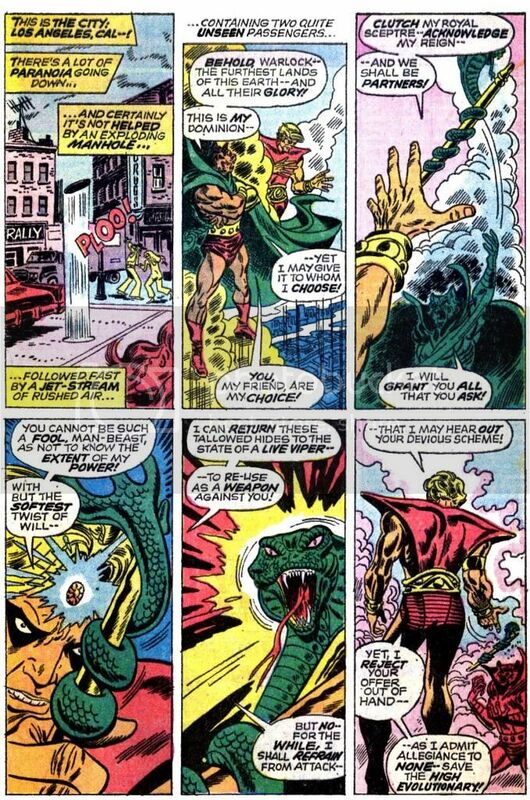 Turns snake skin into a real snake. 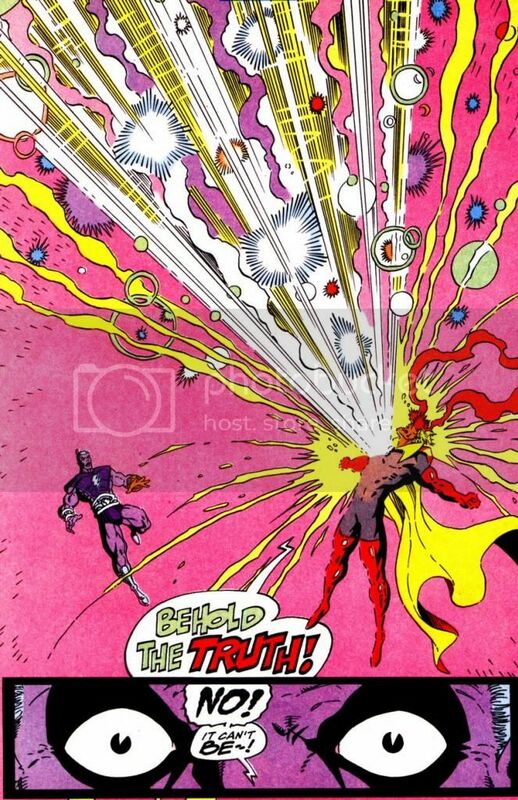 Devolves bullets and parachutes into splashes of molecules. 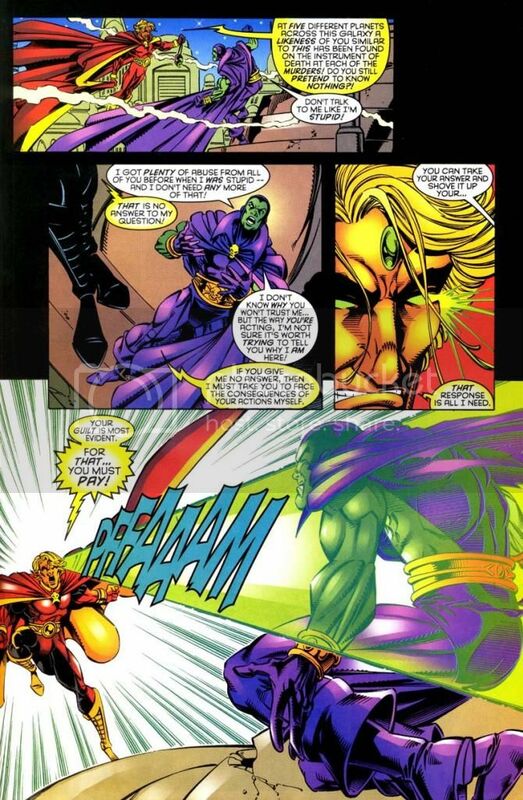 The soul gem gave Warlock the ability to absorb any opponent’s soul. 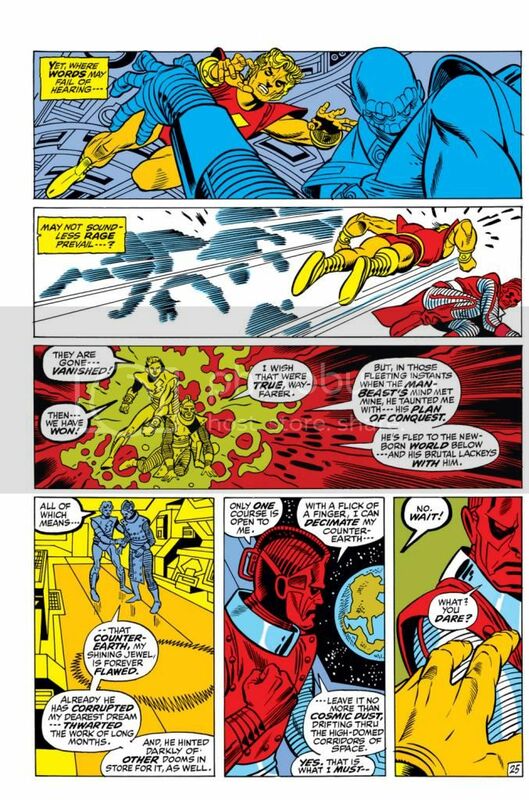 Please see the battles section where he uses this technique on Warrior, the High Evolutionary and others. 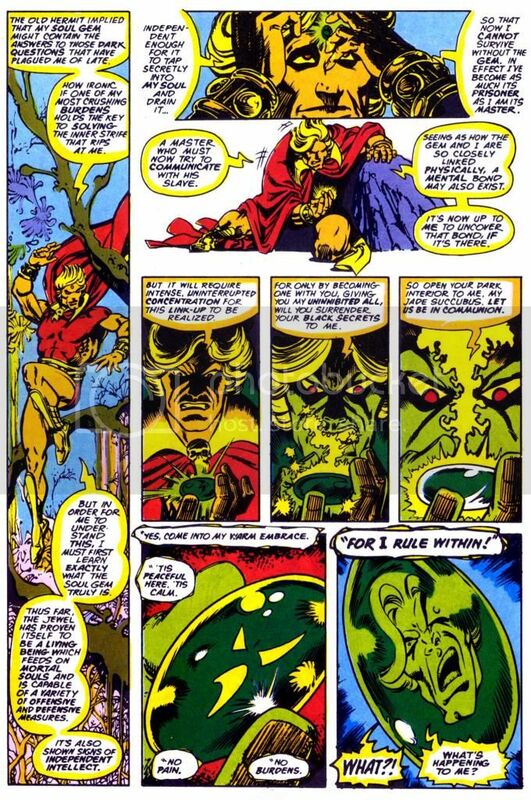 The souls that he absorbs into the soul gem, become a part of him, he also gains all of the victim’s memories and experiences, like he does here, when he absorbs the soul of Autolycus. 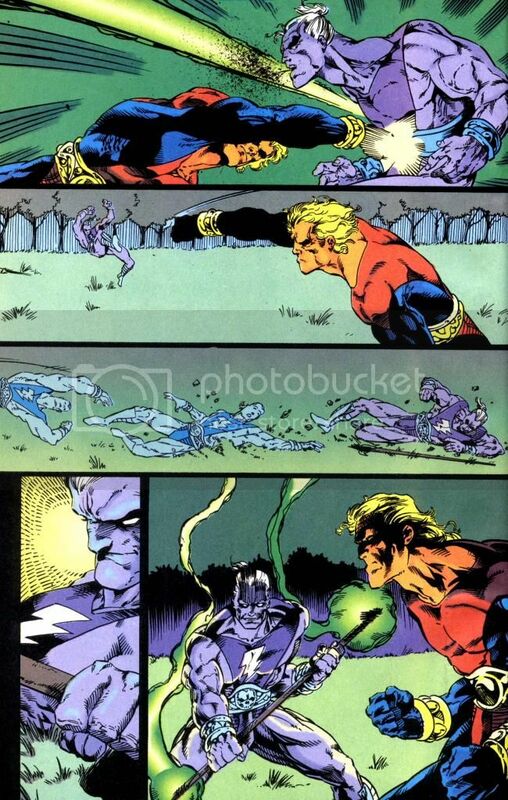 Warlock absorbs a piece of Star-Thief’s soul. 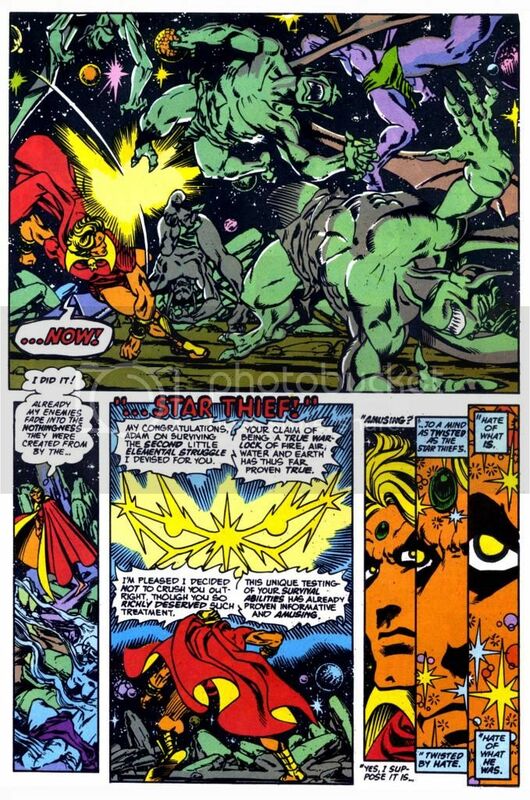 Star-Thief a nigh-omnipotent being who could easily snuff out stars. 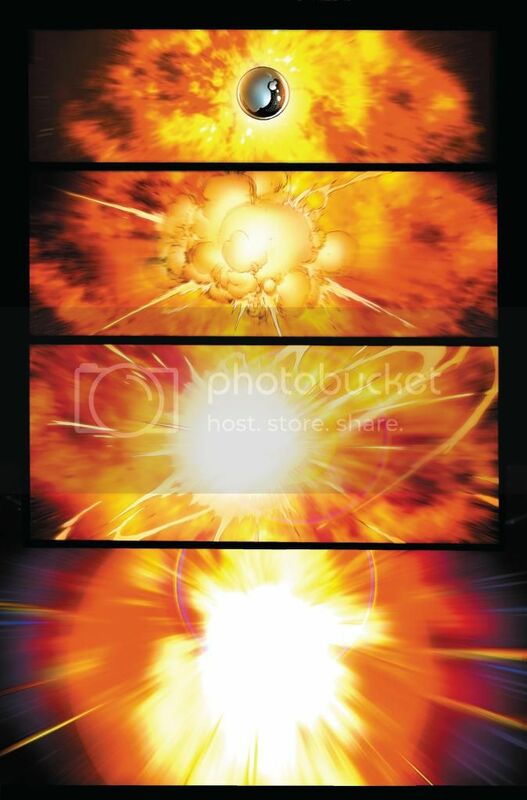 Uses this ability on a small army of Black Knights, stealing their souls all at once. 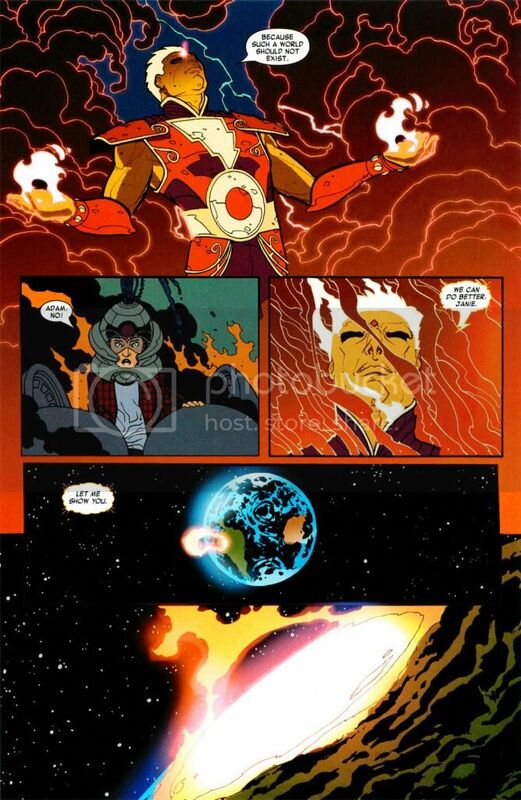 Uses the soul gem to put Firelord’s soul and life essence back into his body, effectively resurrecting him. 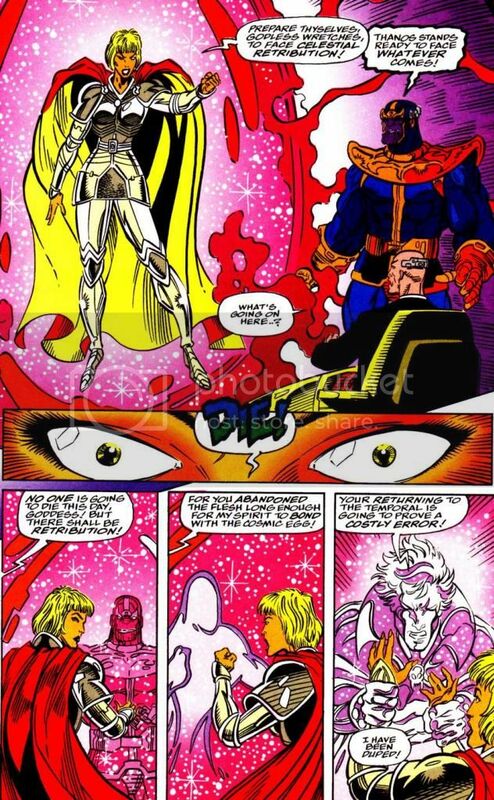 Uses the gem’s power to temporarily resurrect a dying woman and gains the necessary knowledge from her. 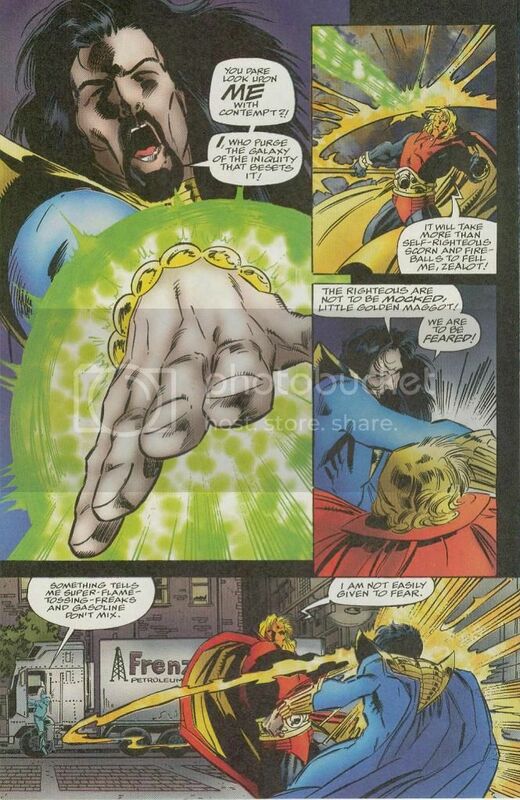 Plucks Kray-Torr’s soul (who he had absorbed long ago) from the soul gem and puts it into Count Abyss’ body (a being who did not have a soul). 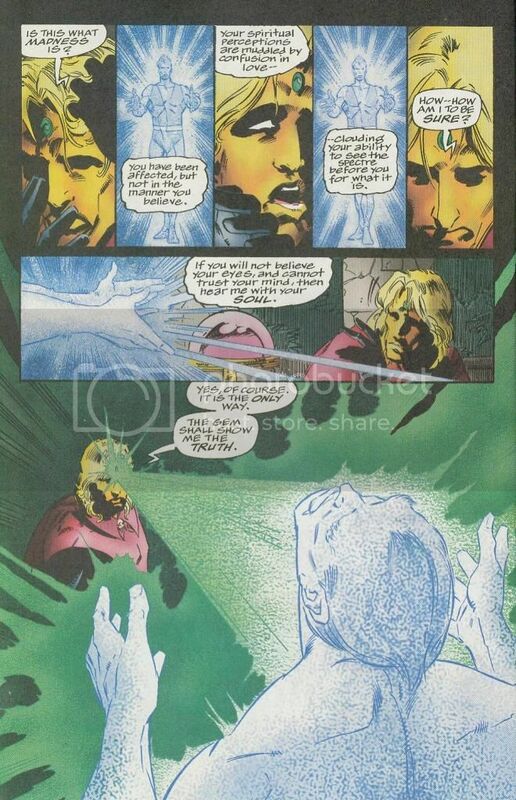 Transports Rune’s and his own soul right into the soul world against Rune’s will, despite the fact that Rune had stopped time using the time gem. 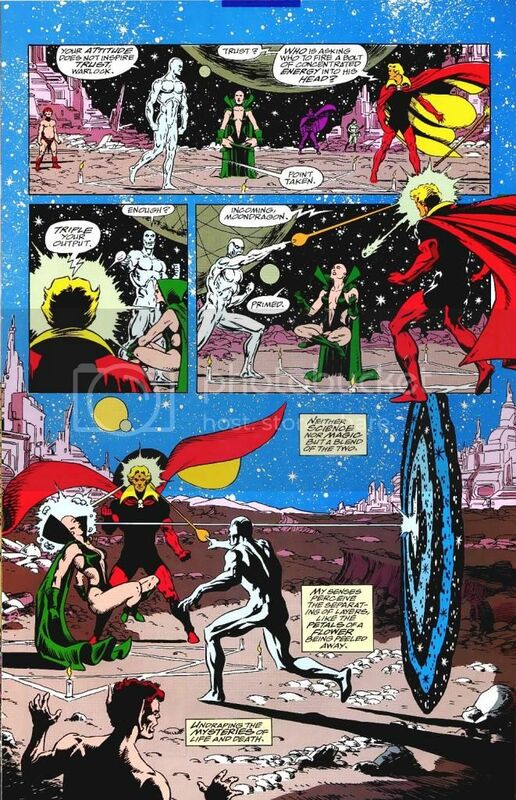 From inside the soul world, casts a spell to return Silver Surfer’s and Drax’s souls into their bodies. 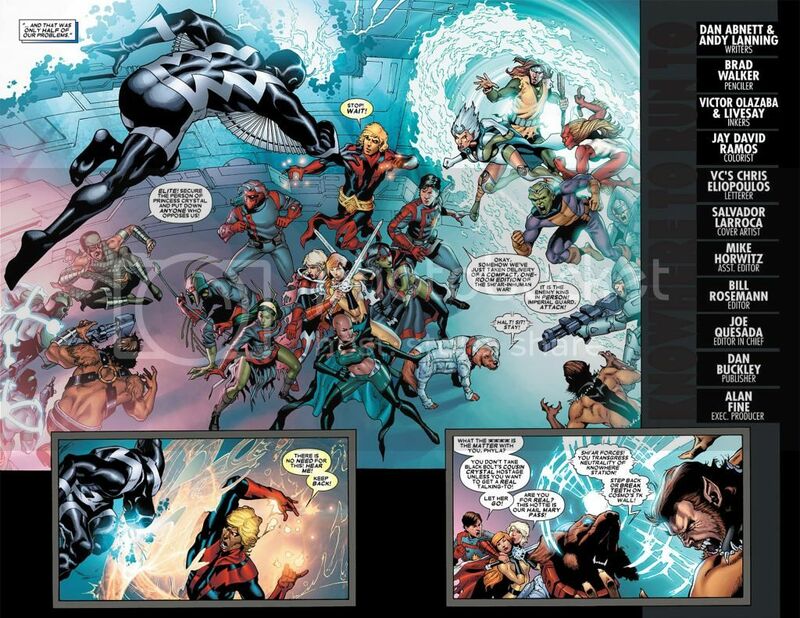 Casts Pip’s and Gamora’s and his own souls from the soul world to 3 recently deceased bodies (without possessing the soul gem). 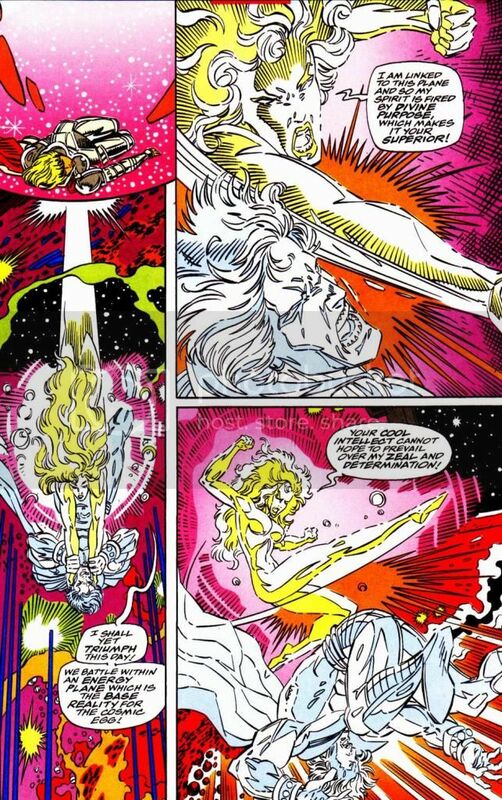 Exorcises a soul from Gemini’s body without the soul gem. 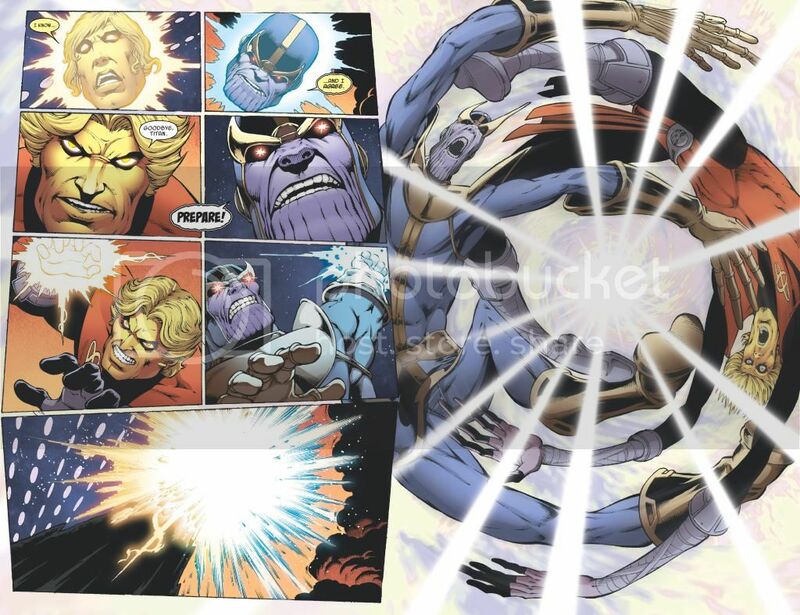 Absorbs billions of souls without the soul gem. 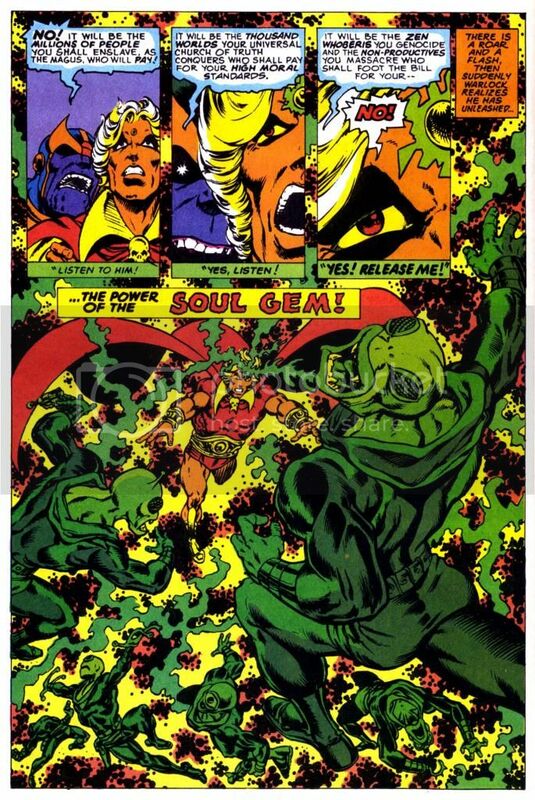 Controls and captures the souls of some Guardians of the Galaxy after defeating them (without the soul gem). 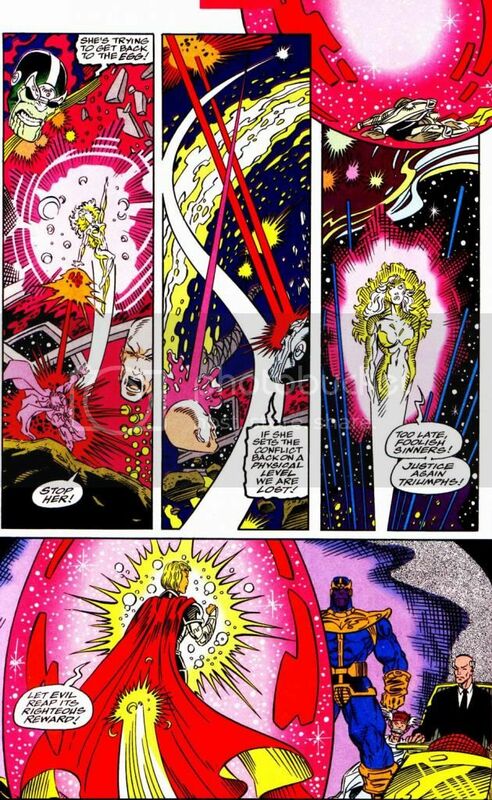 Goes to fight the Goddess in the form of a pure spirit. 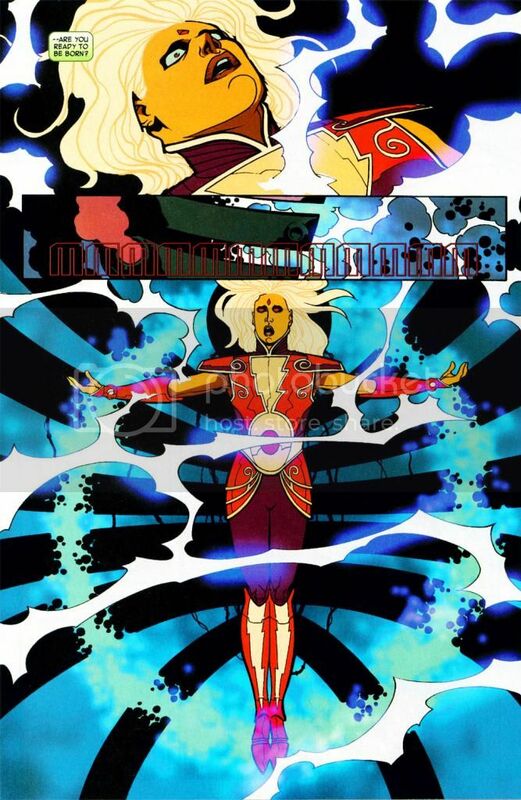 Takes spirit form once again. 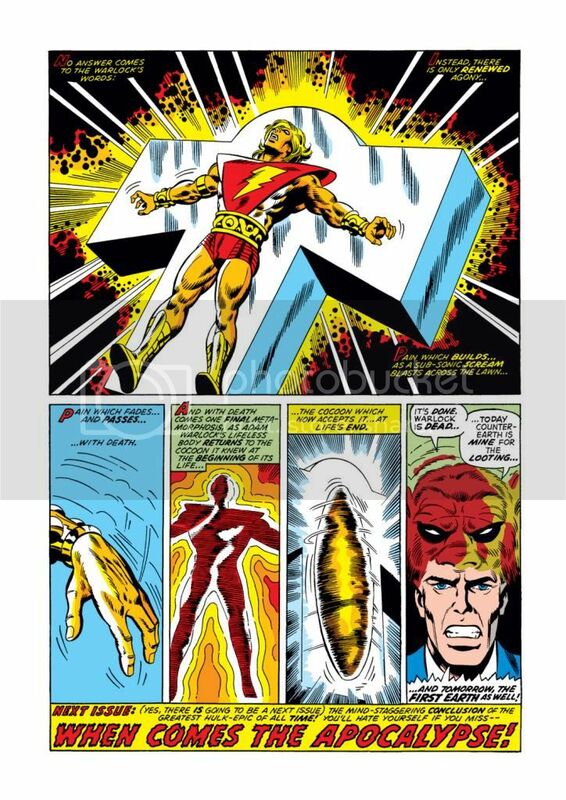 Can take a wraith-like form and pass through walls and appear out of a telephone at will. 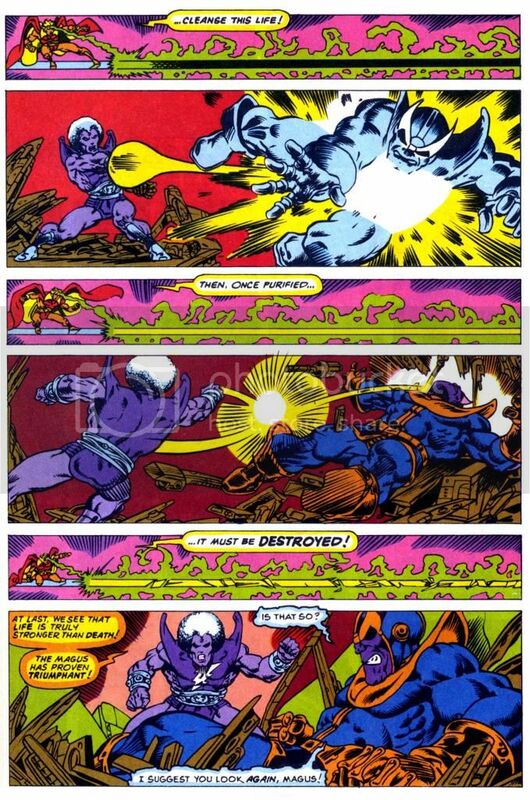 His karmic staff is an extension of his soul that he can remake at will. 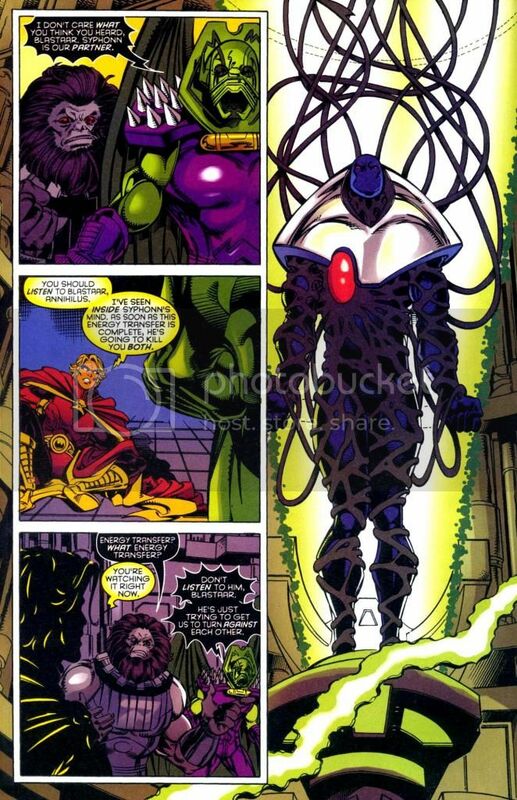 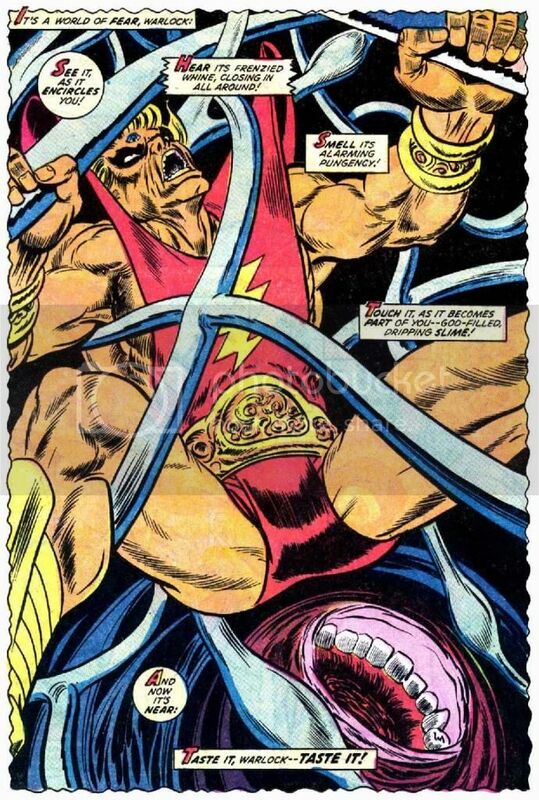 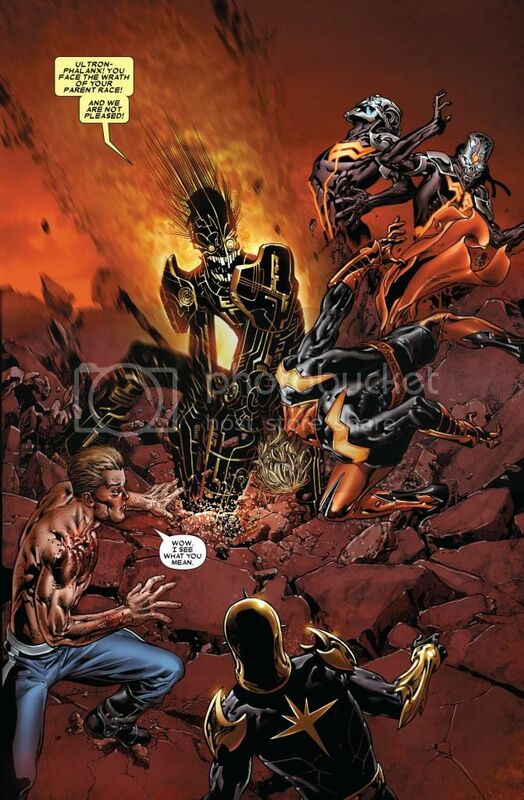 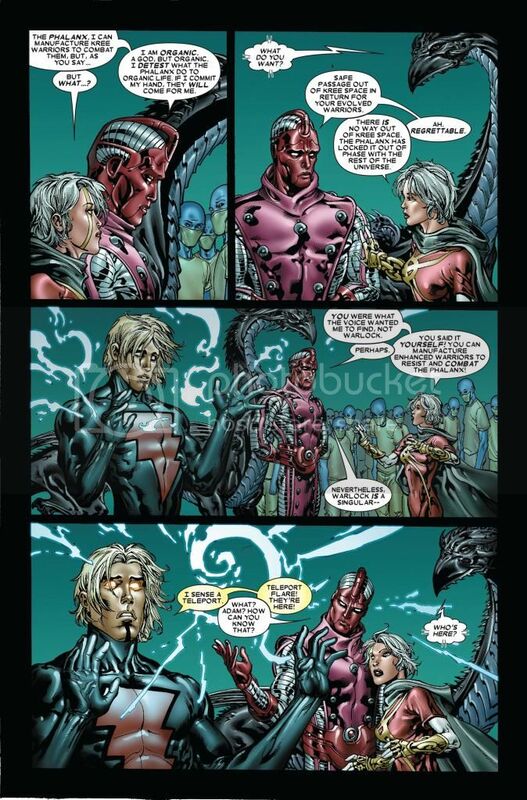 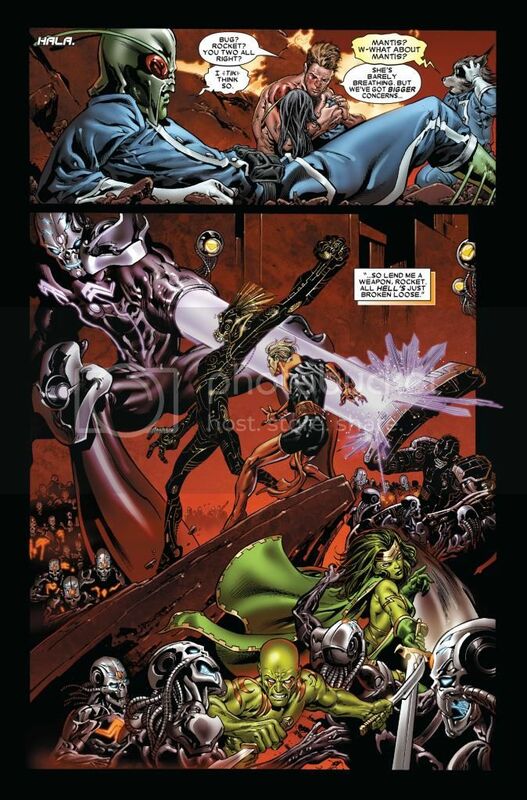 After Ultron took control of his body, Adam gave entrusted his soul into Phyla’s nega-bands. 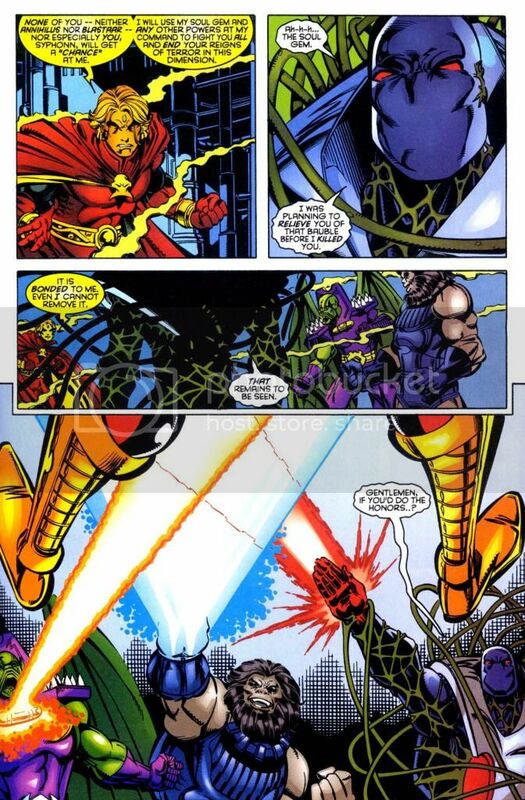 Resists assimilation by the Phalanx. 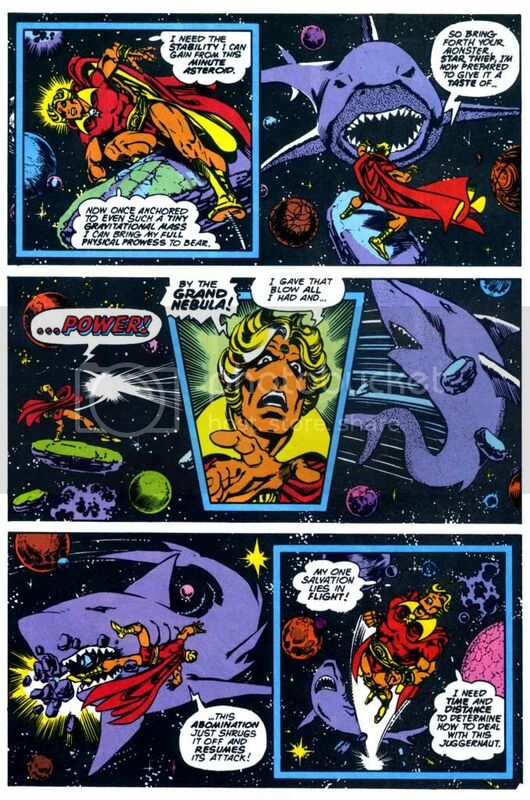 Resists Star-Thief’s vast mental powers. 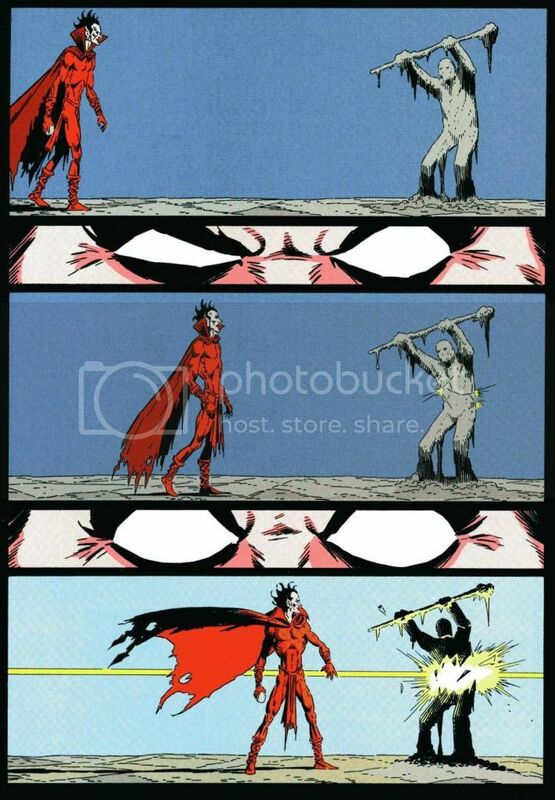 Resists the mental illusions of two demons. 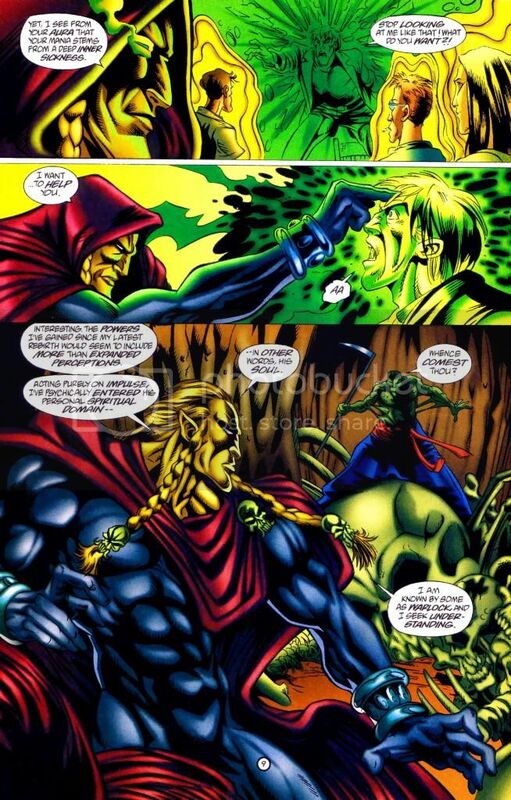 Resists Rune sucking out his soul. 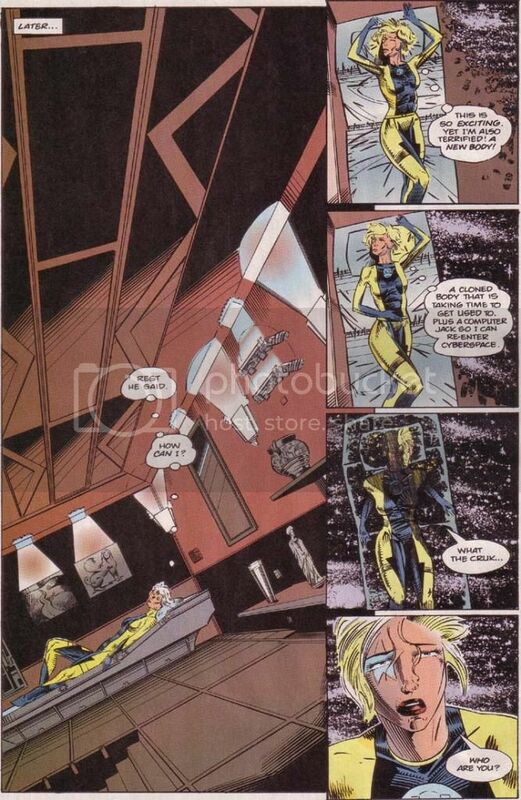 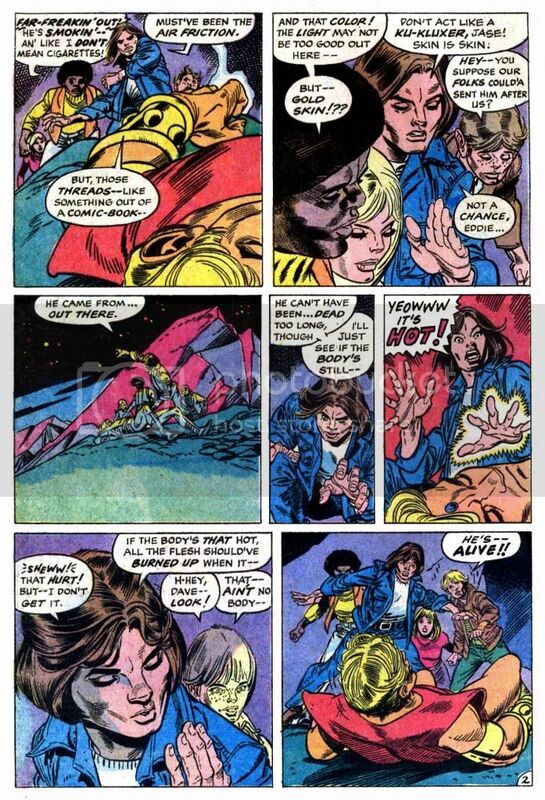 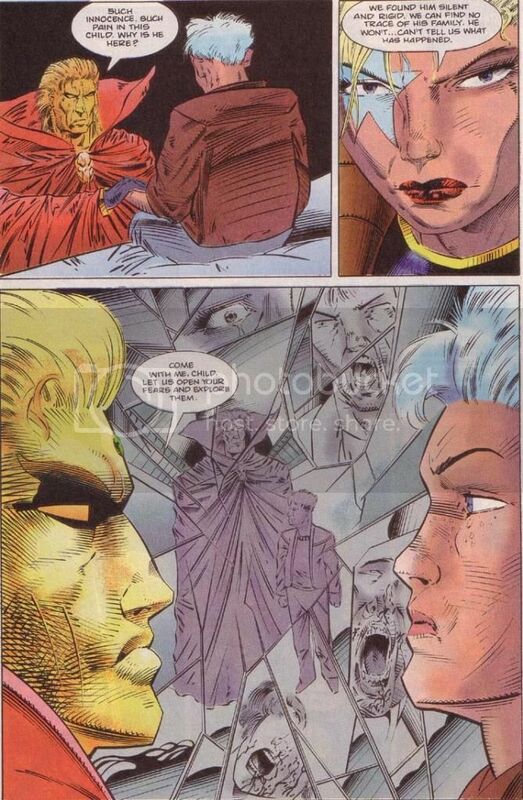 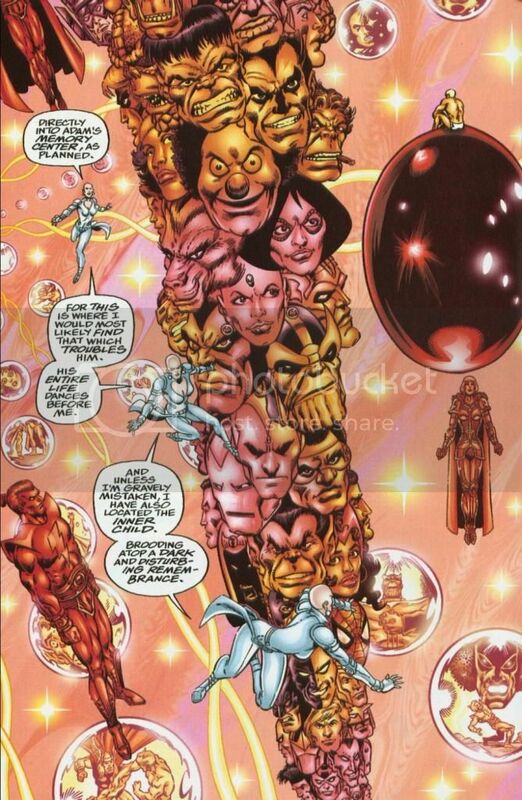 Is unaffected by Maya’s dance of reality, unlike the rest of the Infinity Watch. 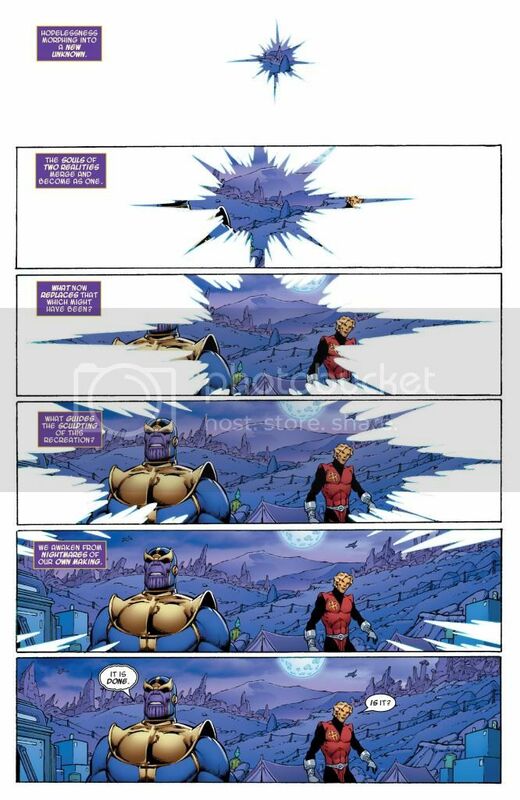 Survives travelling through a rift in reality. 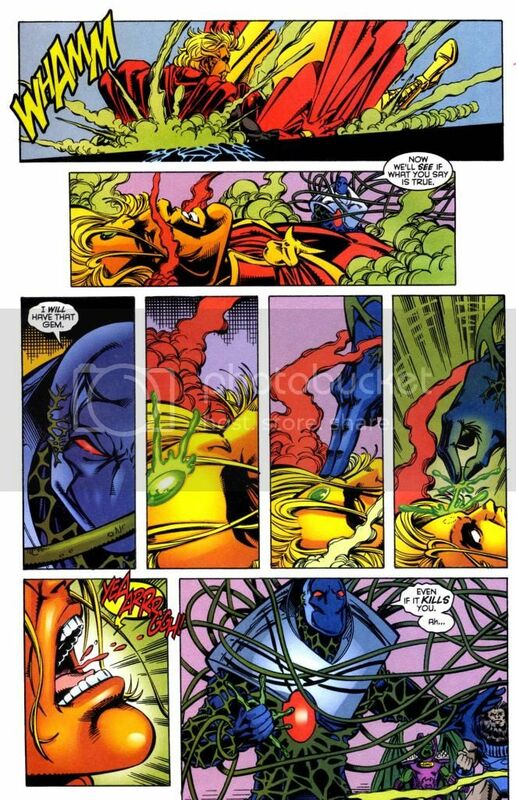 Resists the effects of Count Abyss’ love potion. 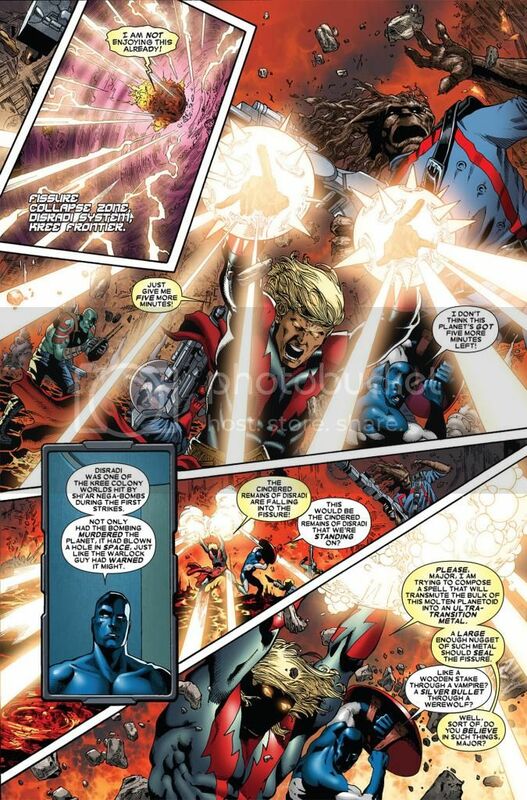 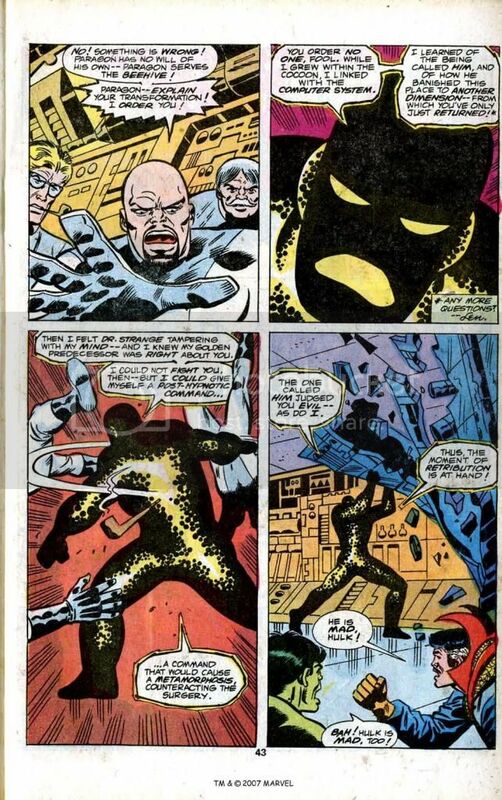 Resists mental tendrils that mentally enslaved Black Bolt and a number of other heroes. 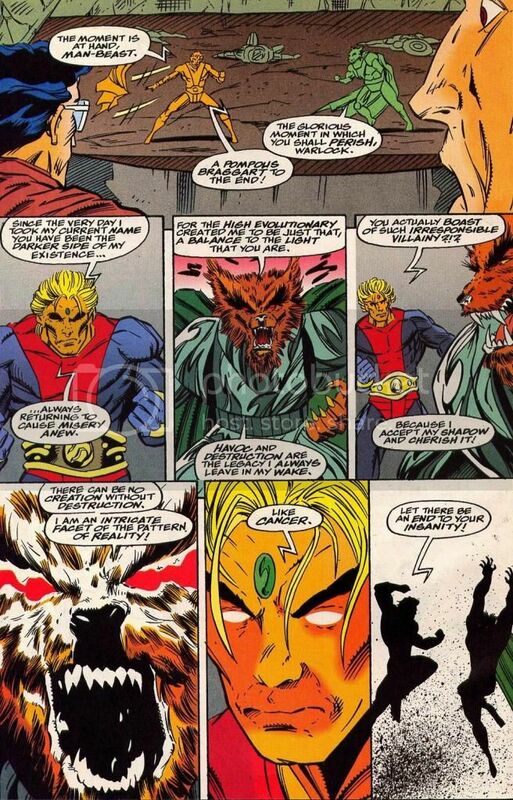 Resists the Man-Beast’s mental manipulation. 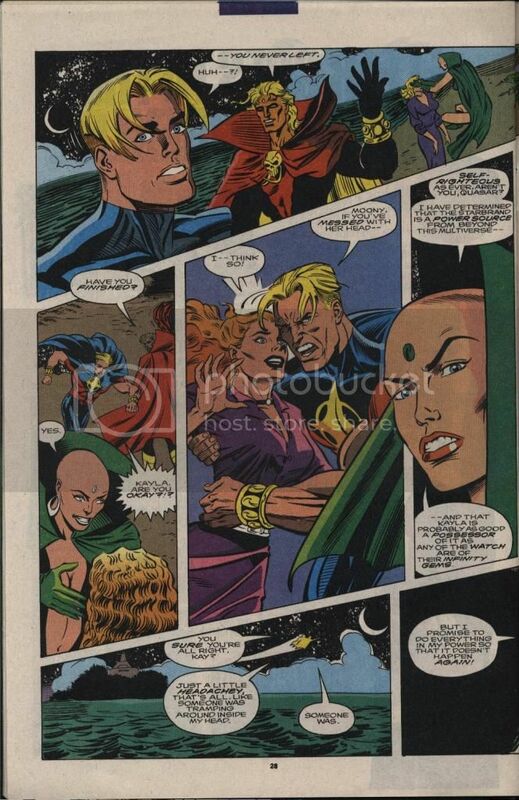 Moondragon is impressed by his mental defenses. 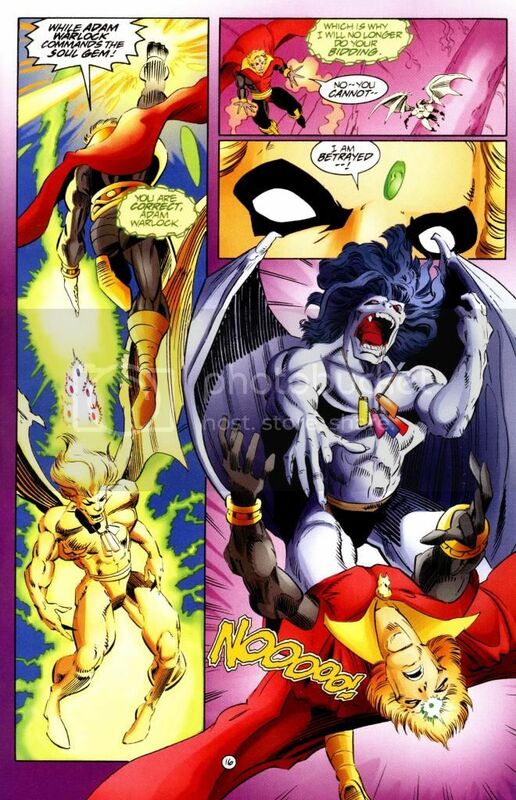 Resists the soul gem itself. 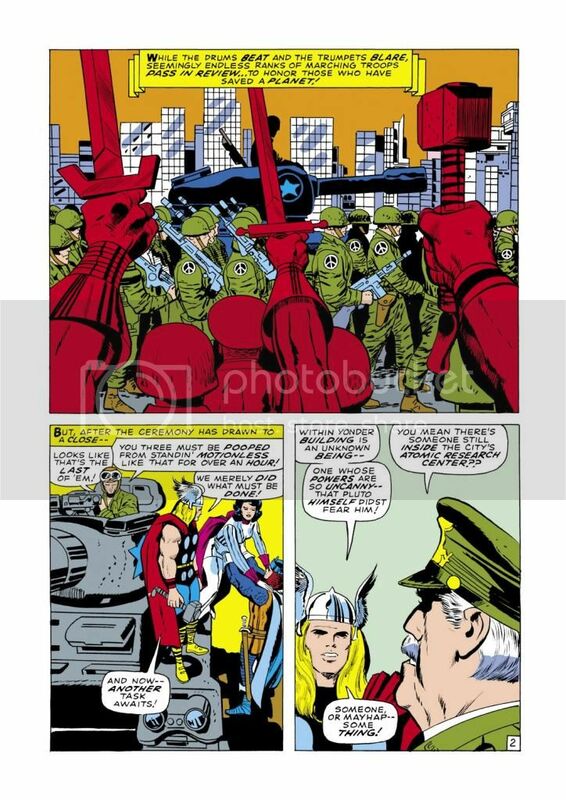 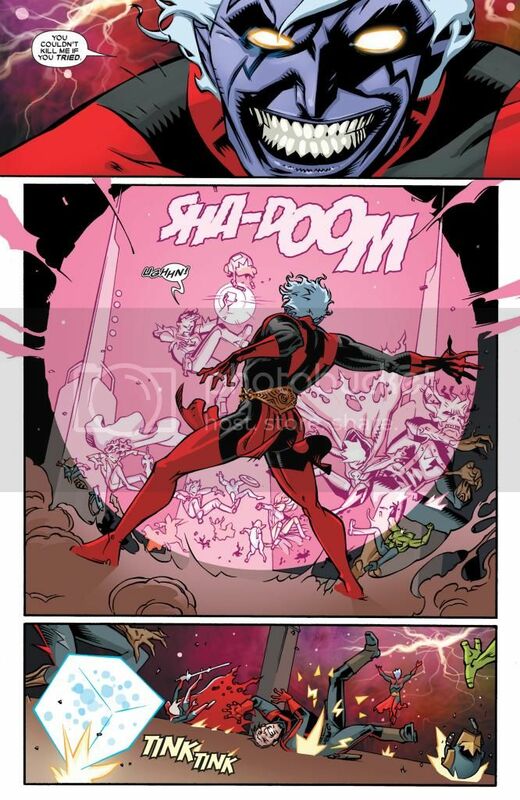 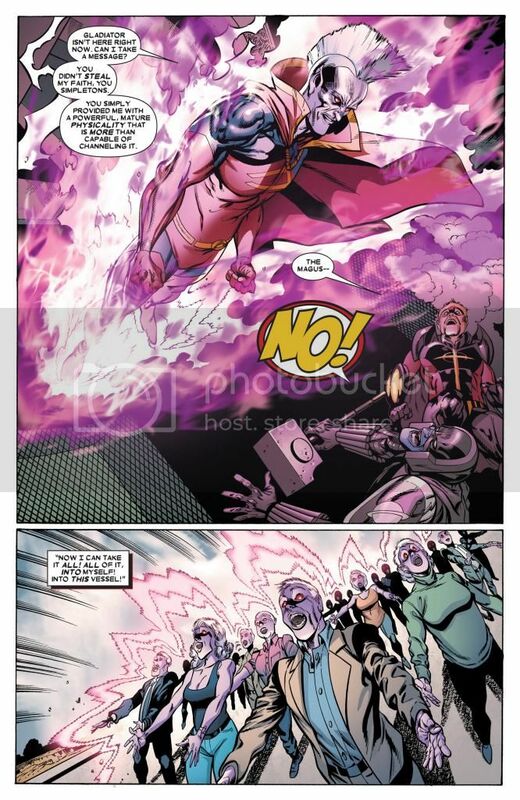 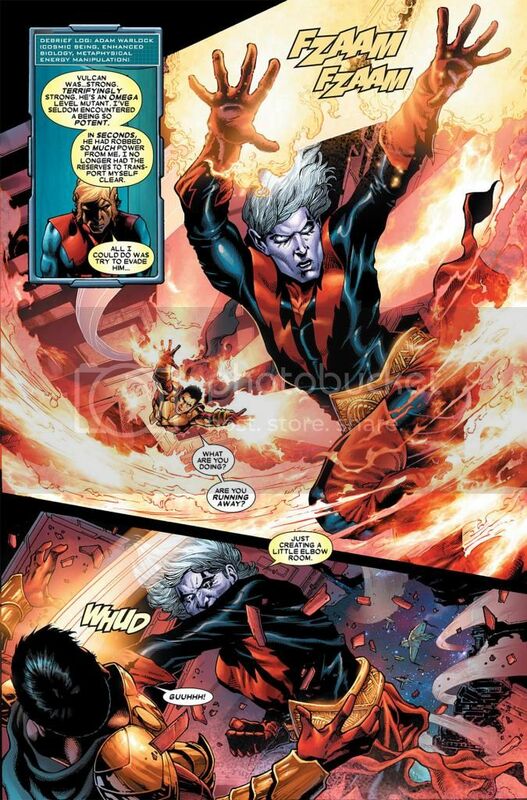 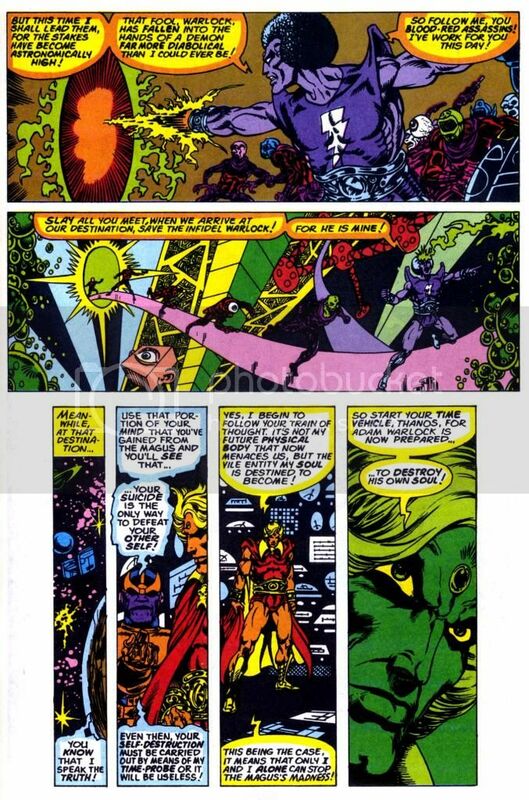 Nebula is not able to detect Warlock as he stands outside the normal parameters of reality and outside the realm of Chaos and Order. 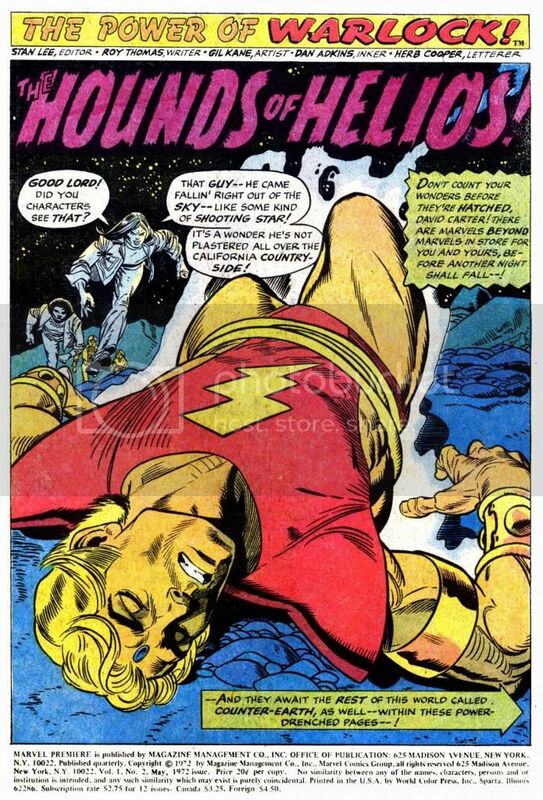 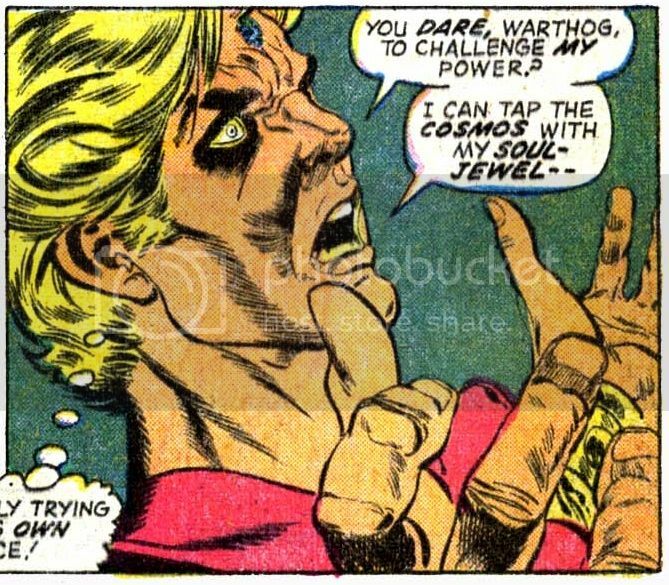 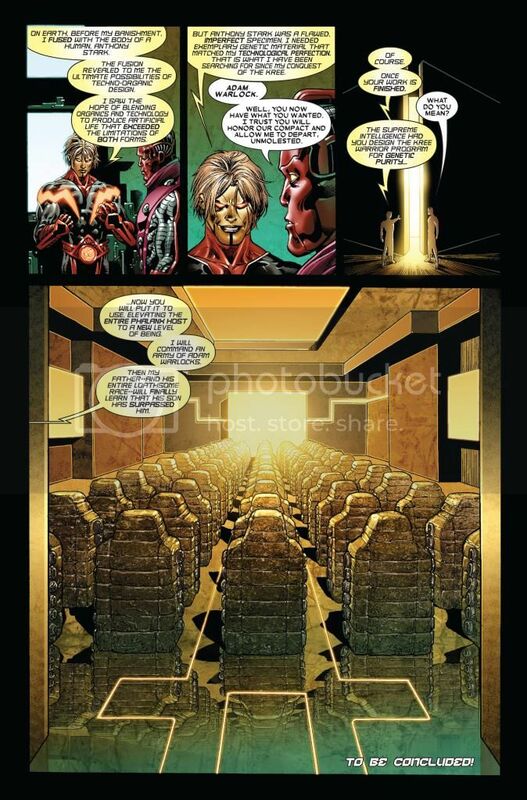 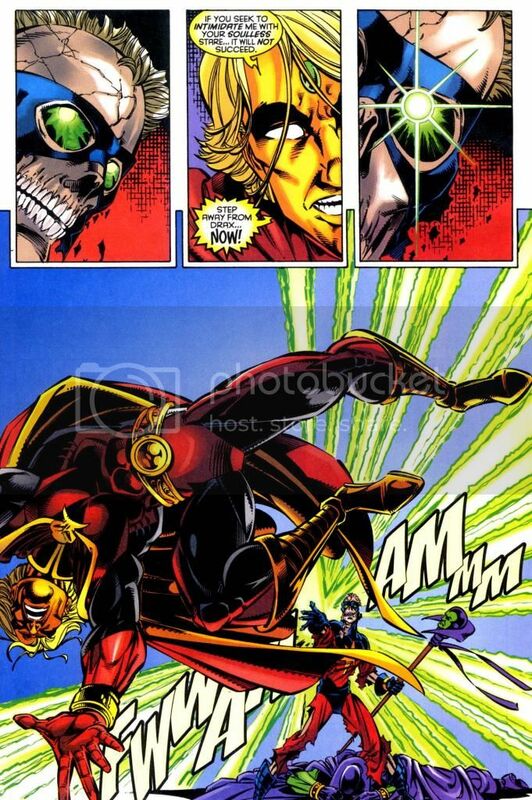 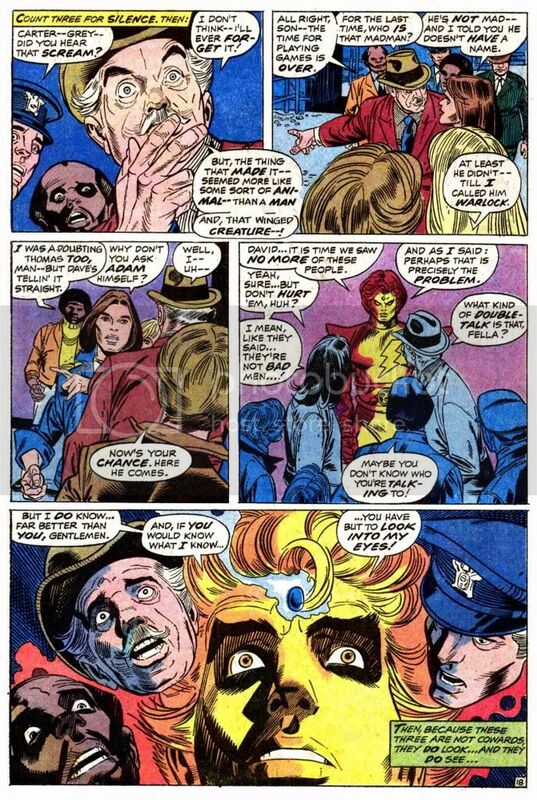 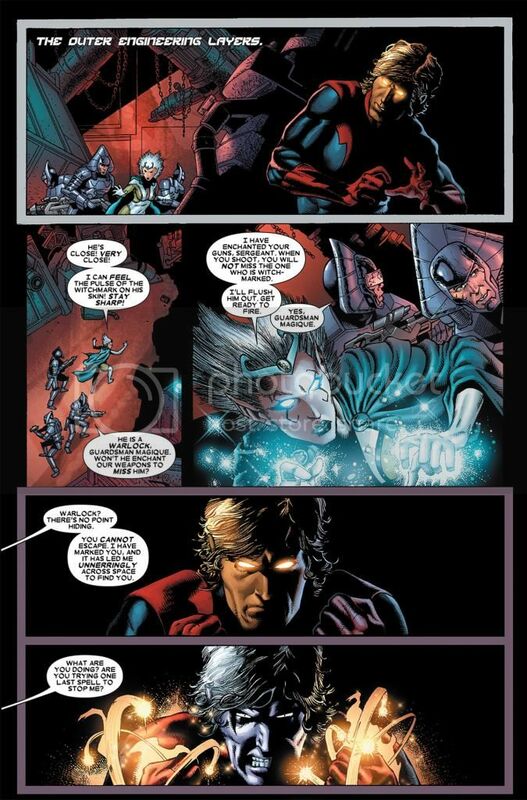 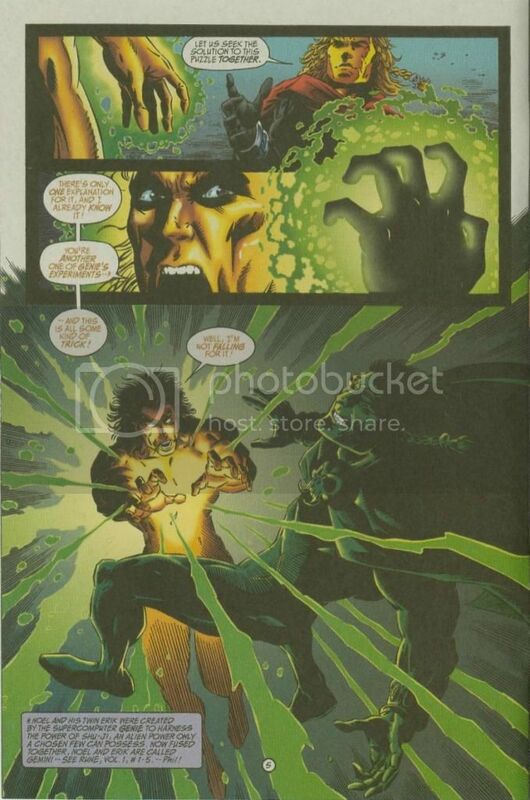 Even Mar-Vell with his cosmic awareness was not able to detect Warlock. 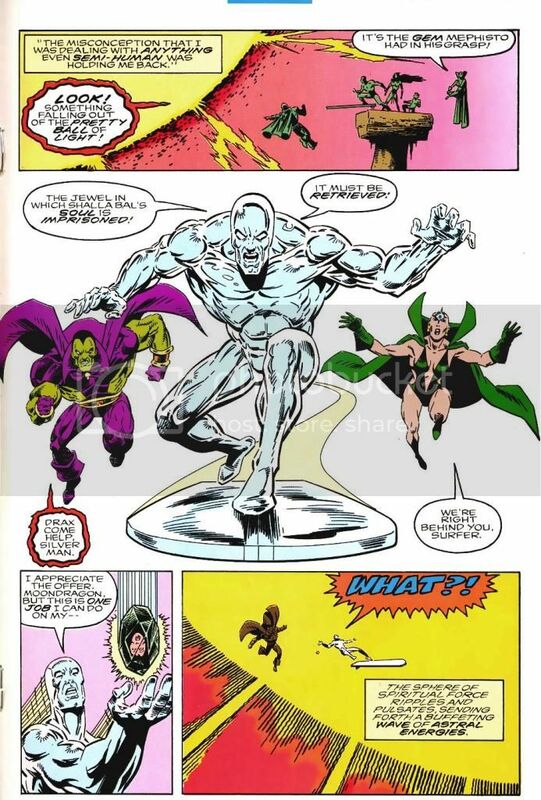 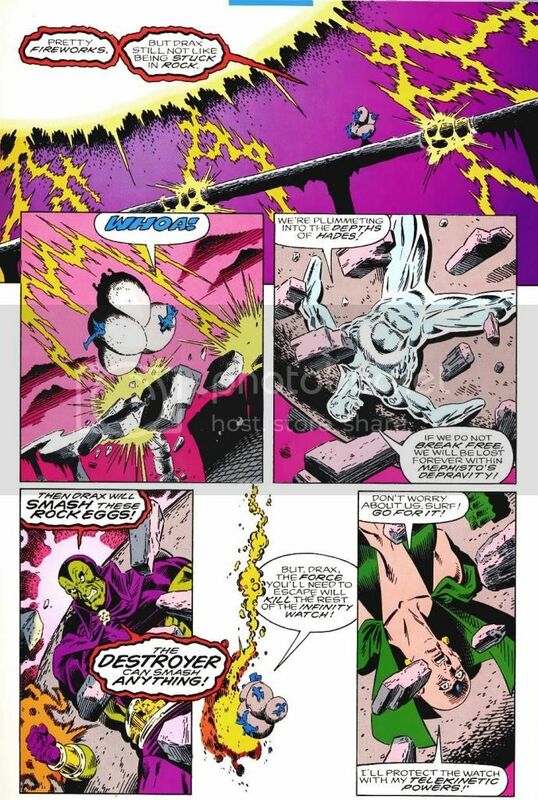 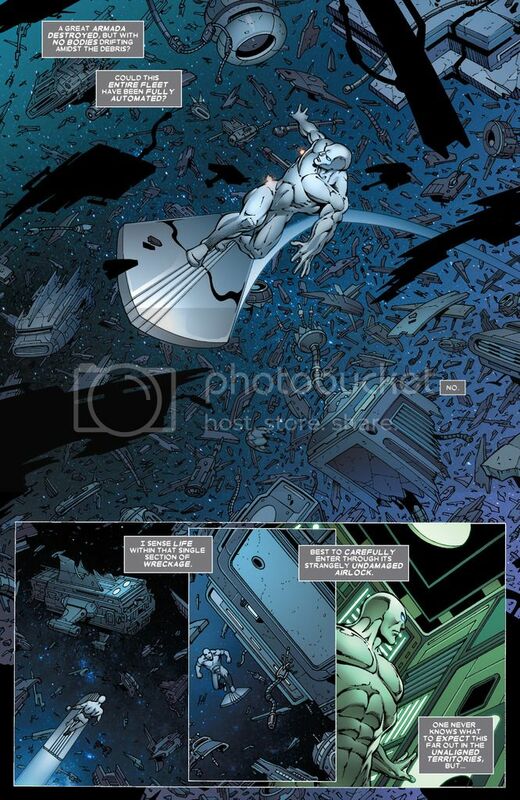 Detects a radical alteration in the Silver Surfer’s spirit. 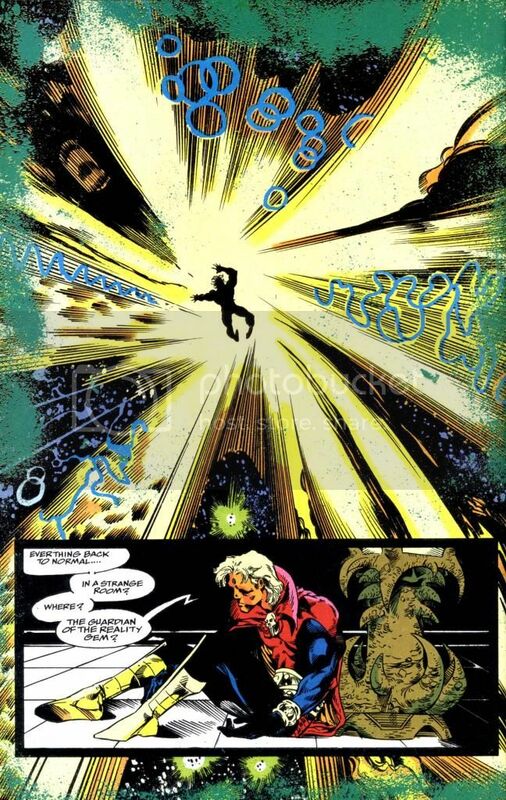 Detects the origin of a space-time fissure. 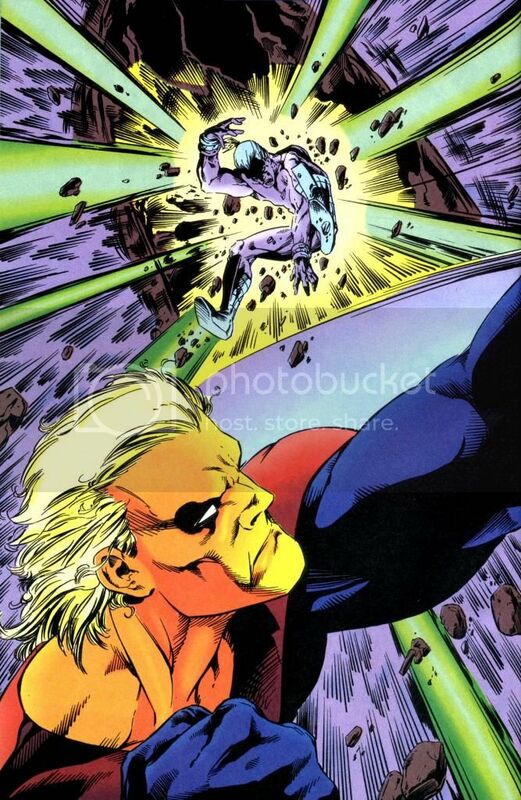 Senses a psychic disturbance emanating from the moon. 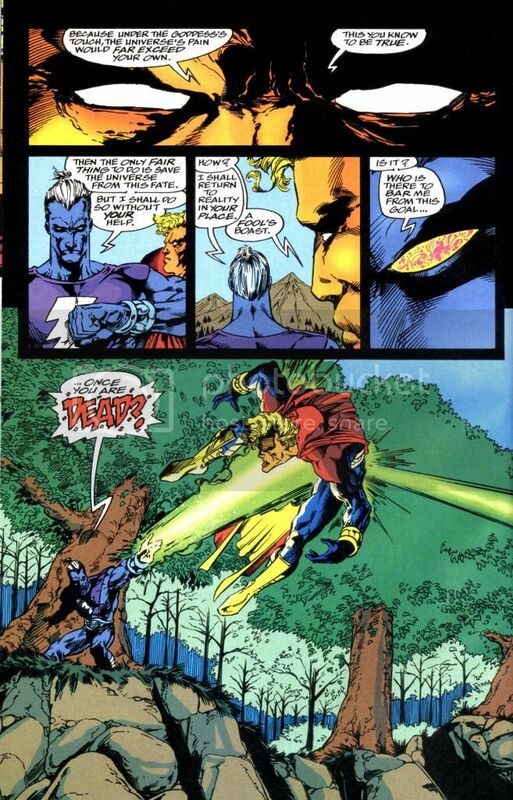 Senses an incoming teleport, while the High Evolutionary could not. 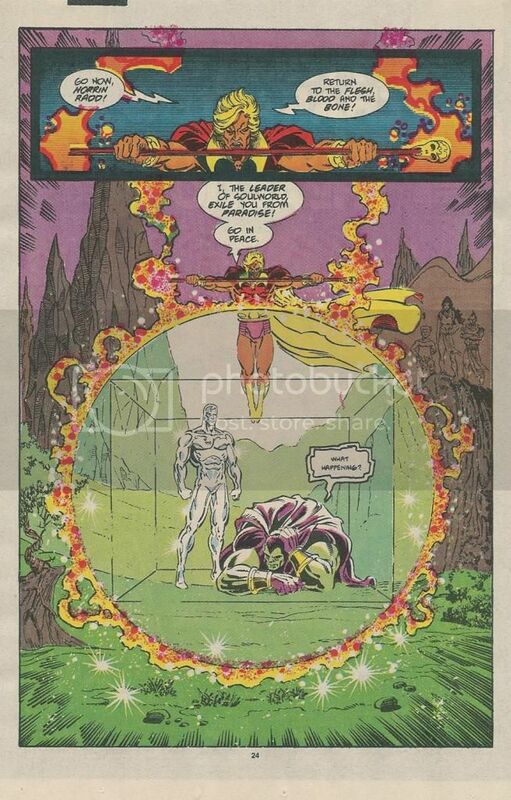 Can actually see souls and spirits. 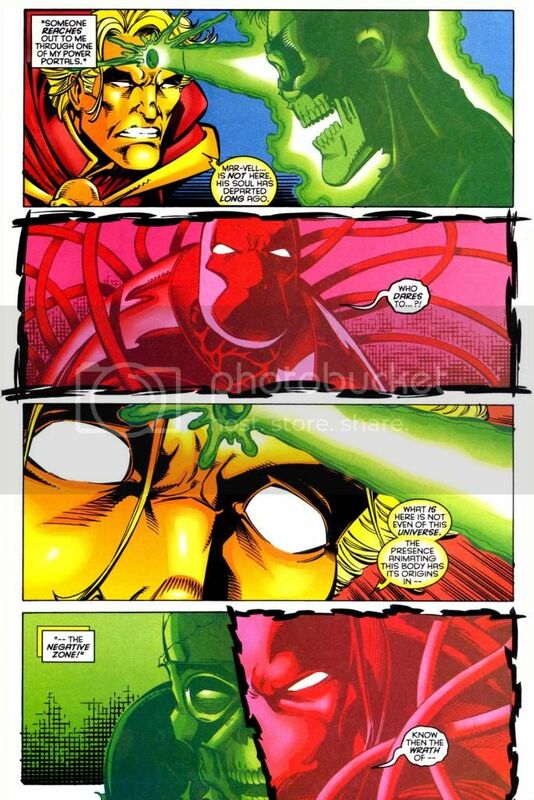 Can see everyone’s spiritual auras. 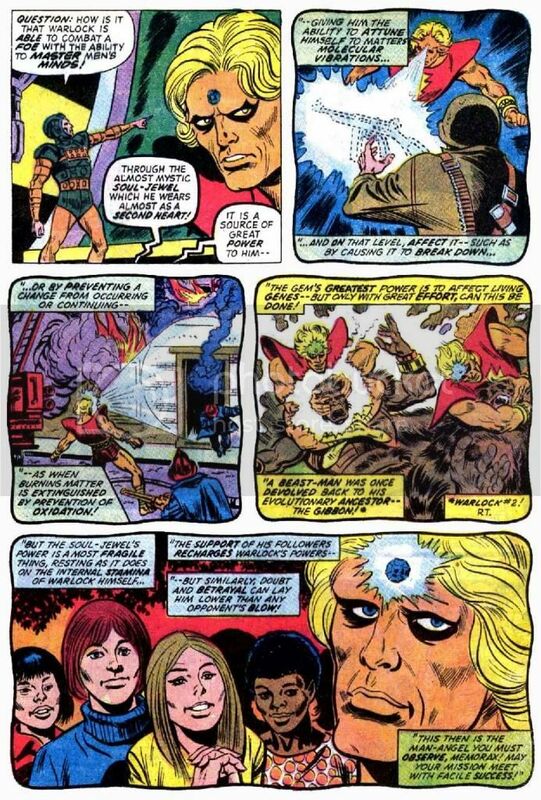 Can see the Valkyrie (a mental construct), while other could not. 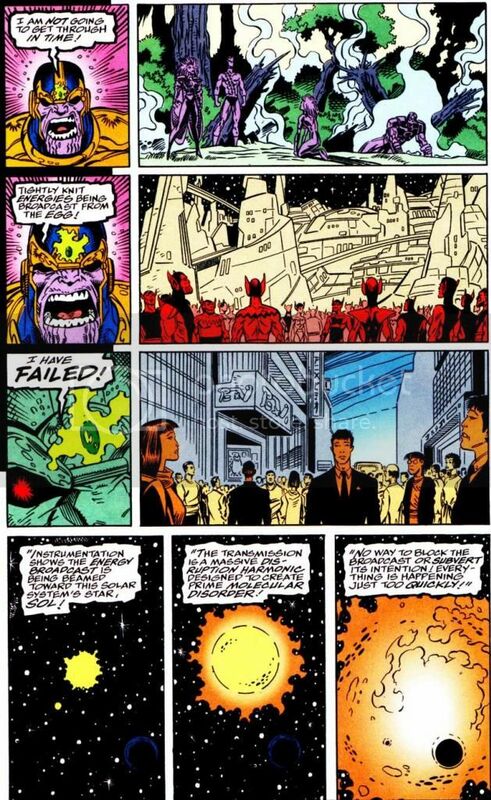 Feels every single one of the billions souls that perished in the Annihilation war. 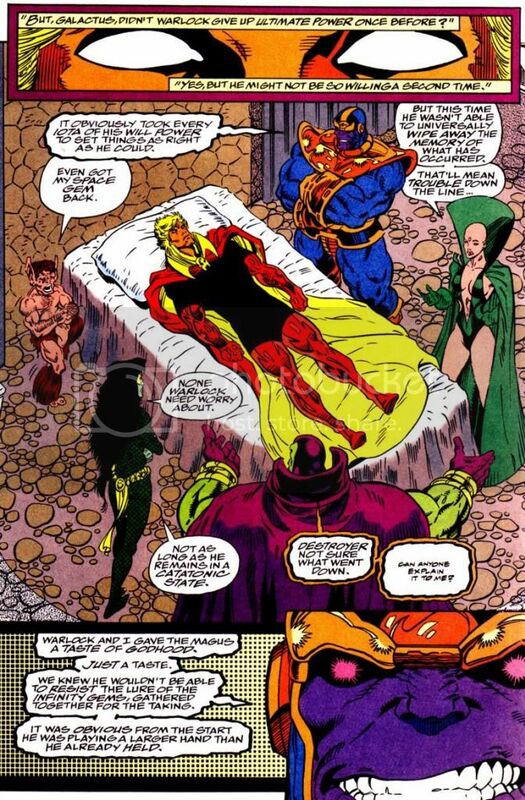 Even when he was just born, he could see into men’s souls, detecting that his creators are evil. 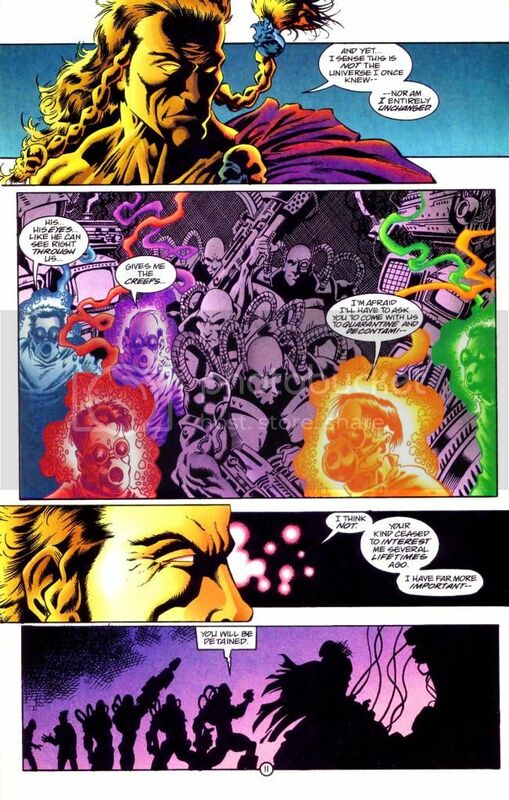 Uses his newly gained ultraperceptions. 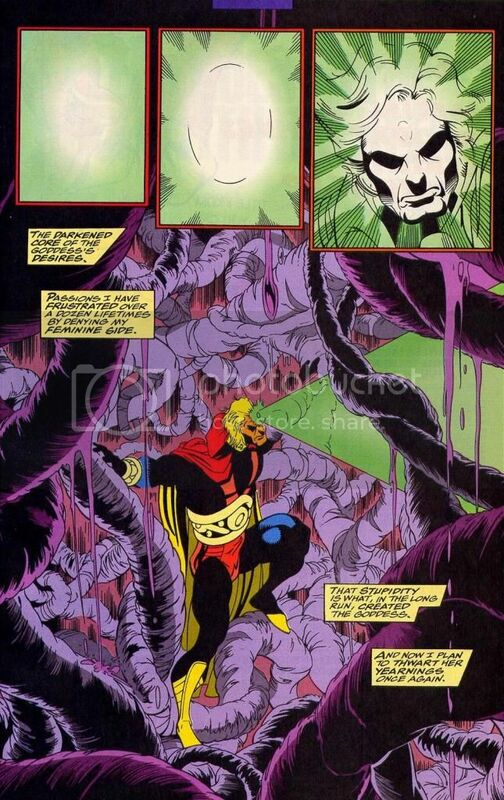 Can detect life and a breathable atmosphere. 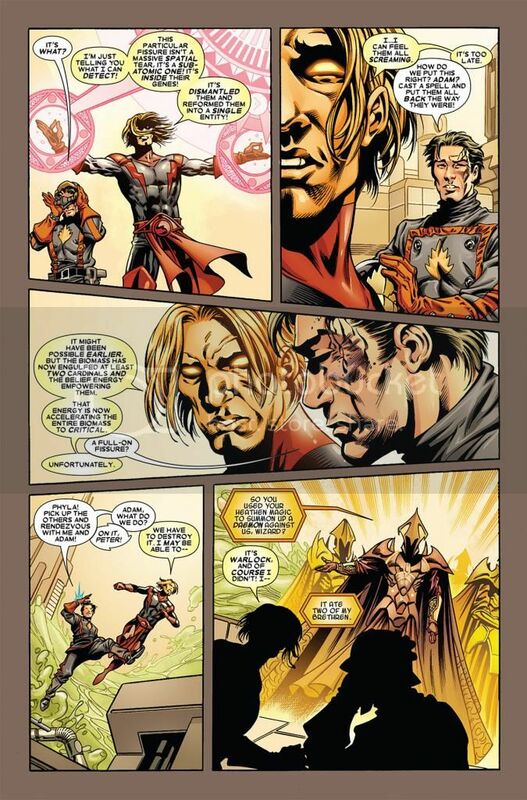 Senses that he is needed in the future. 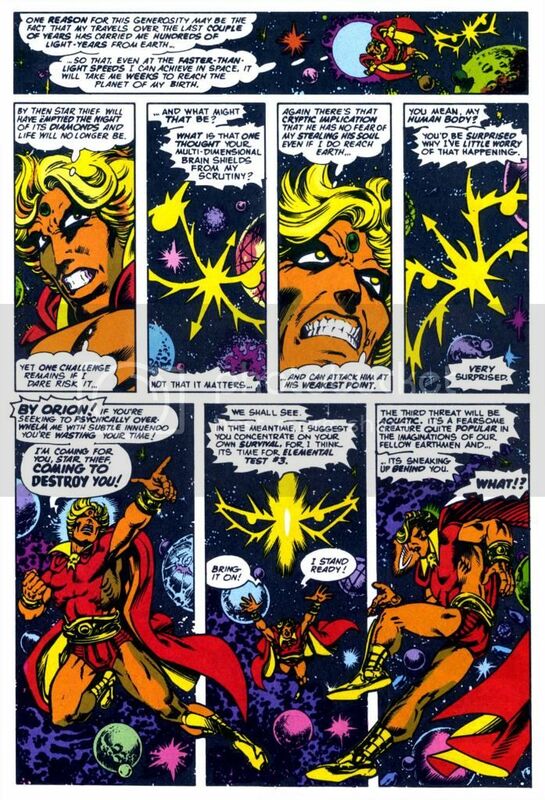 Communes with the remnants of a Celestial’s dead brain. 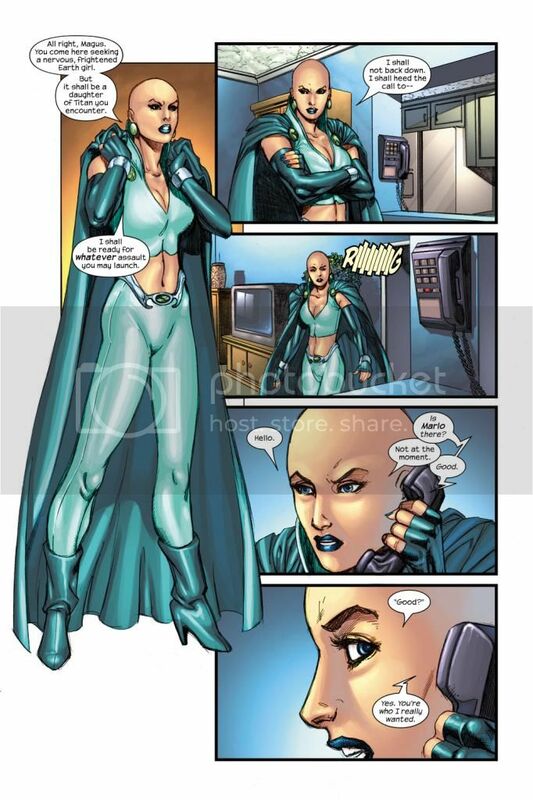 Contacts Dr. 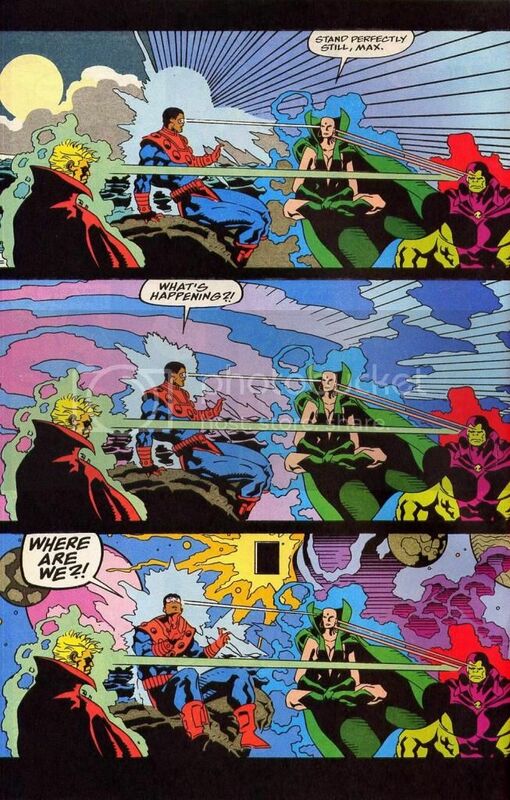 Strange by establishing a soul connection. 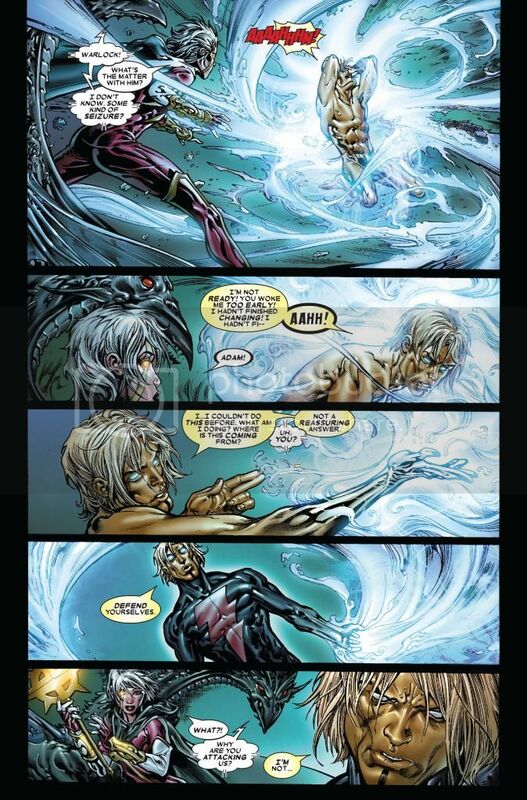 Is able to control the Surfer’s board because their souls have joined before. 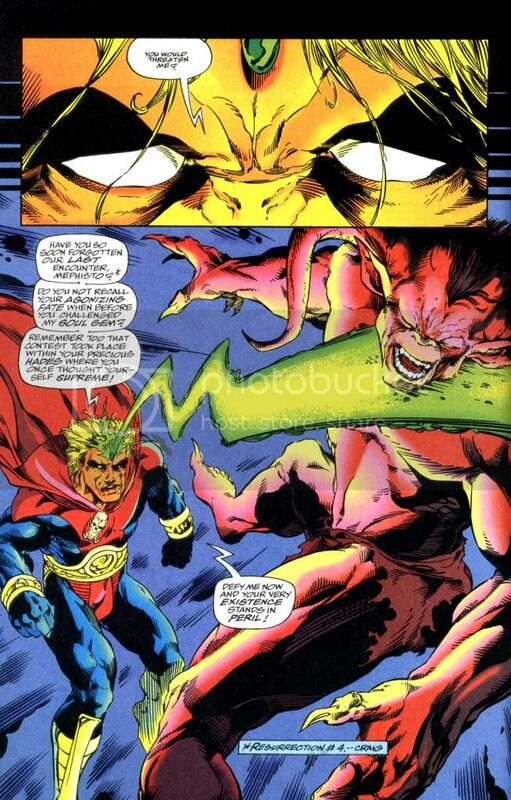 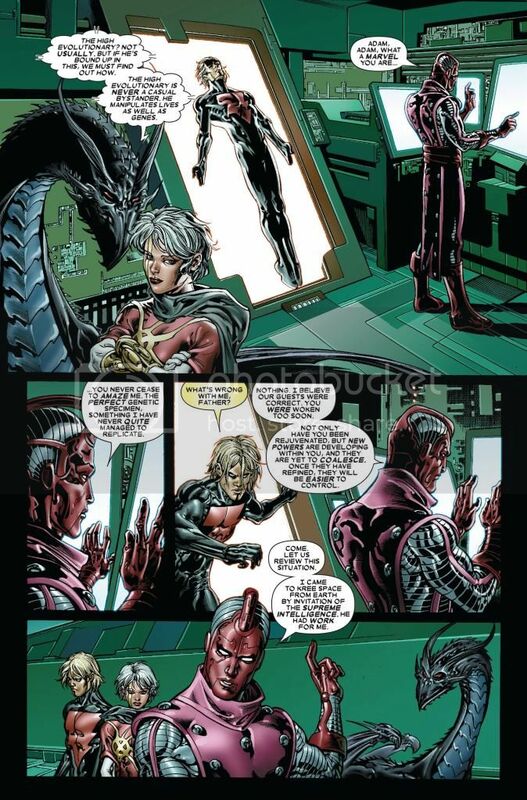 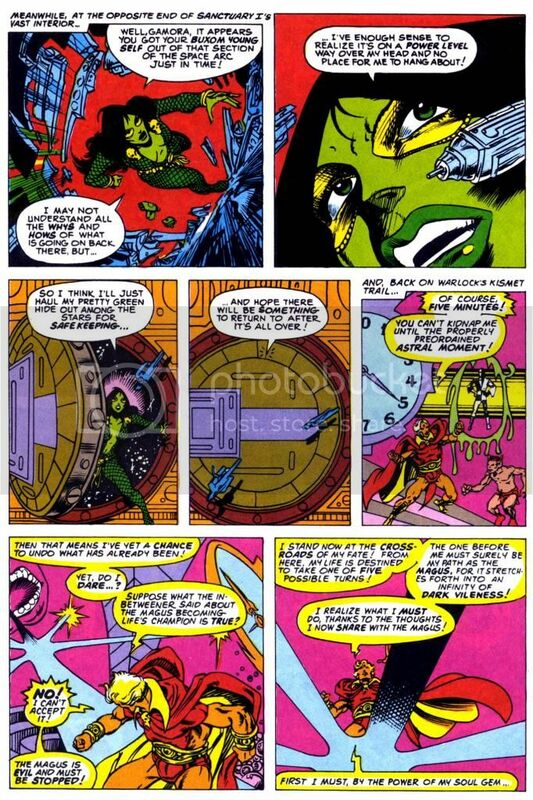 With the help of Moondragon and Drax, uses the soul gem to take Maxam to the psychic plane and they probe his mind and memories. 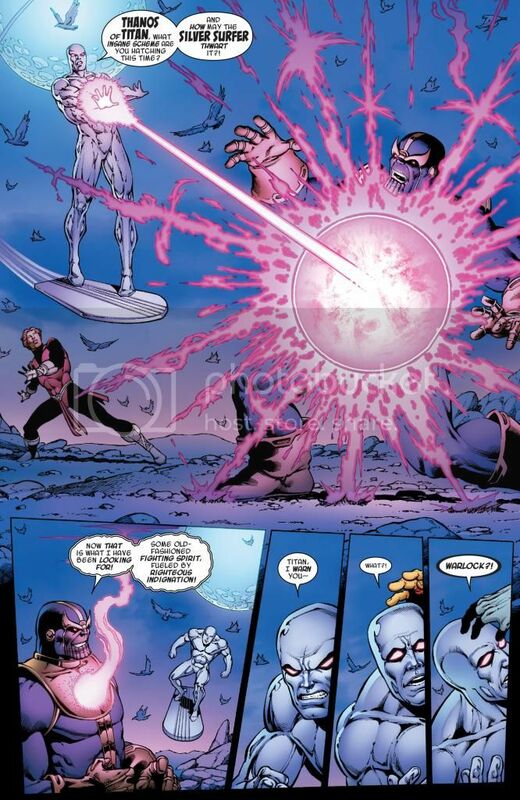 Probes the Silver Surfer’s soul using his gem. 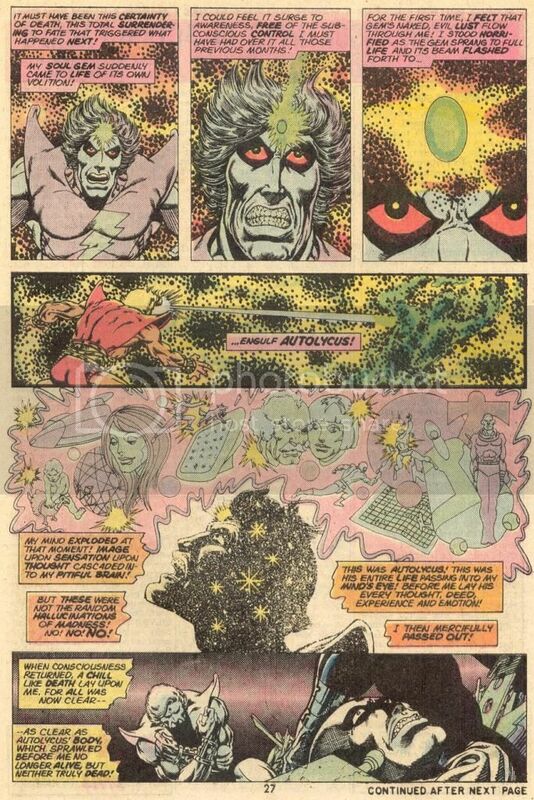 Explores the Silver Surfer’s mind. 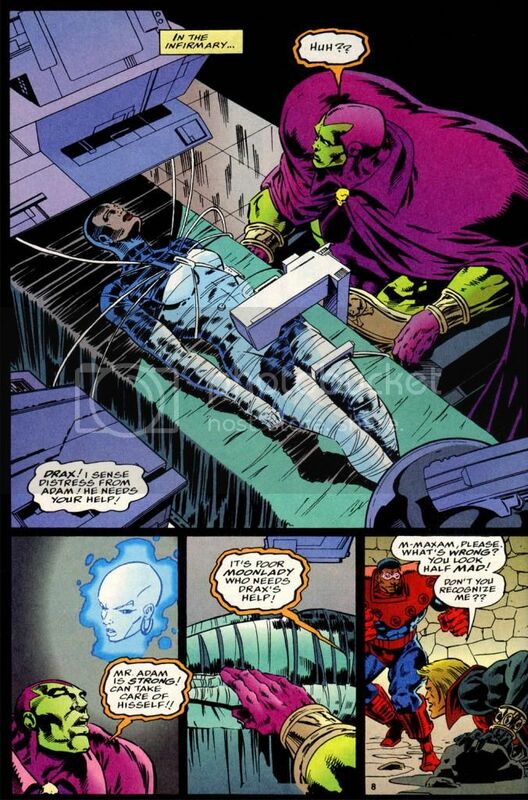 Scans some aliens’ souls using his gem to pass their language and vernacular to him. 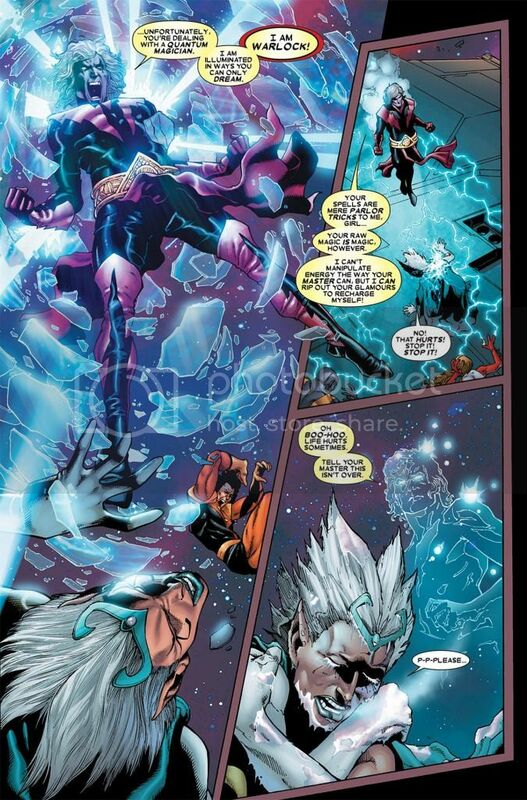 Uses the soul gem to locate Drax. 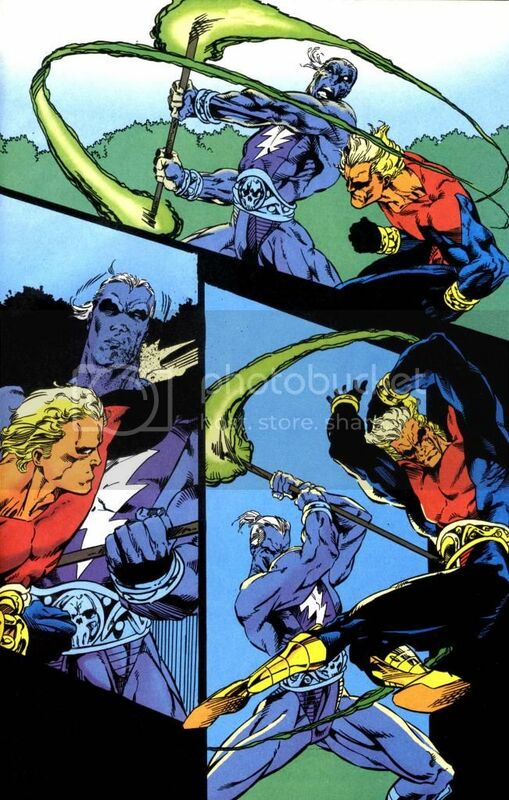 Looks into Mar-Vell’s body for his soul, which takes him to Syphonn in the Negative Zone. 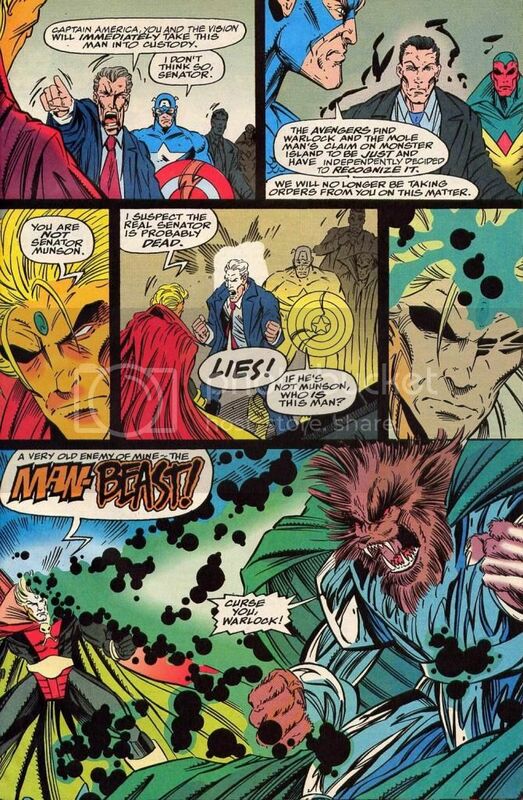 Uses the soul gem to reveal a senator’s true identity as the Man-Beast. 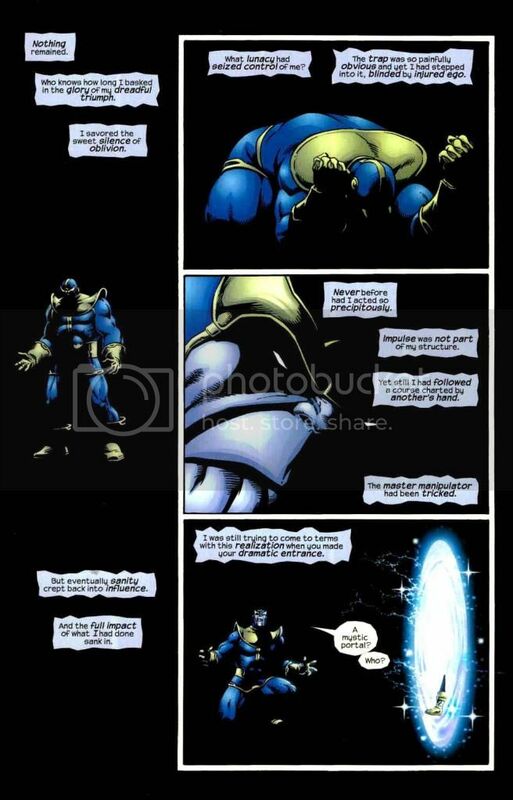 Uses the soul gem to convey the cold light of truth. 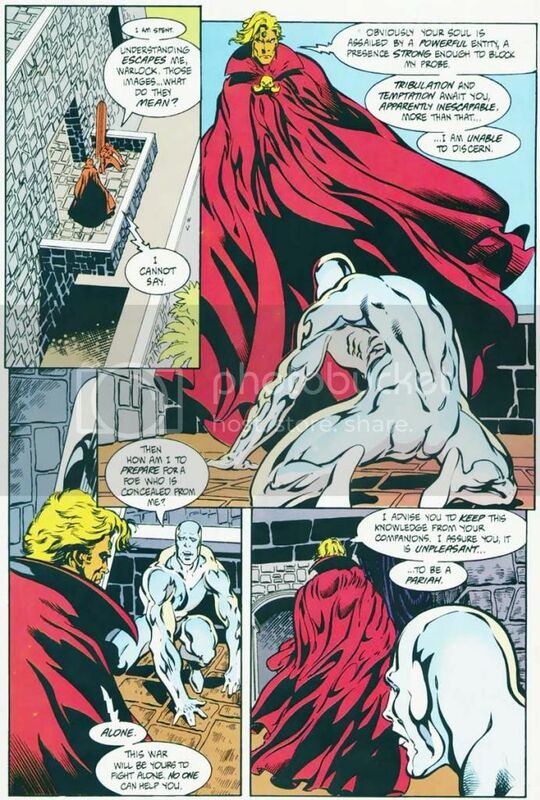 Uses the cold light of truth to defeat souless shadow creatures. 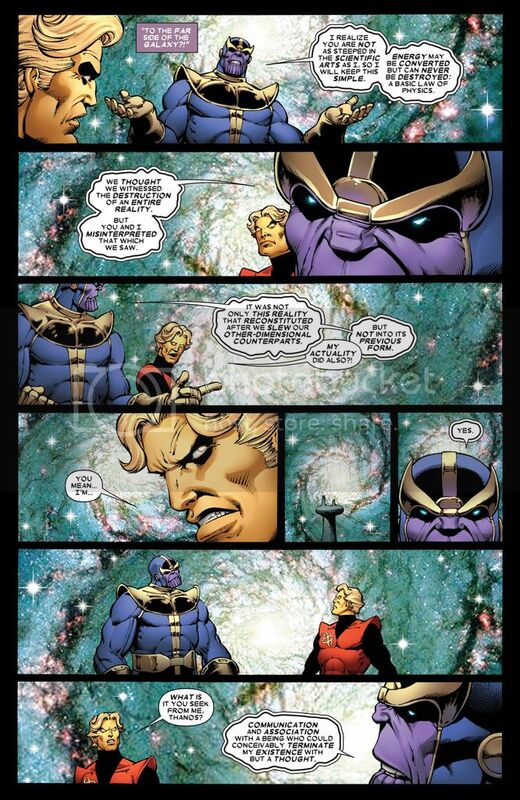 Transfers knowledge into Atleza’s soul. 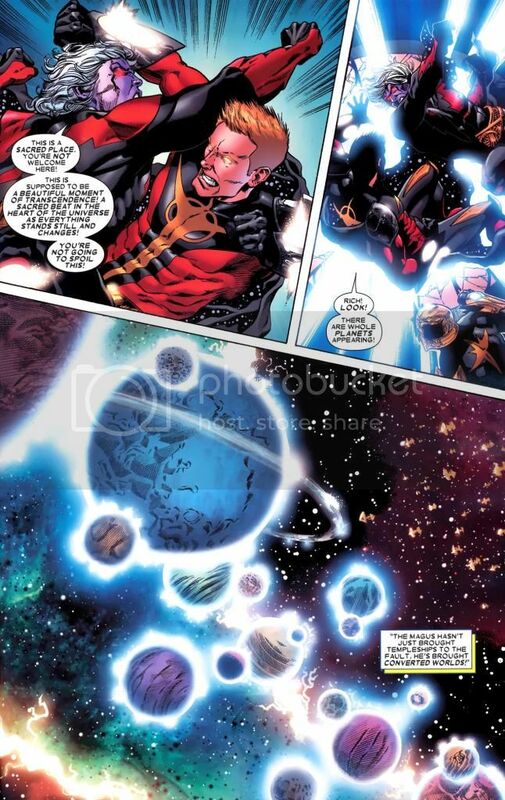 Sends out a extrapolatory beam of force to find out and get information about the Star-Thief. 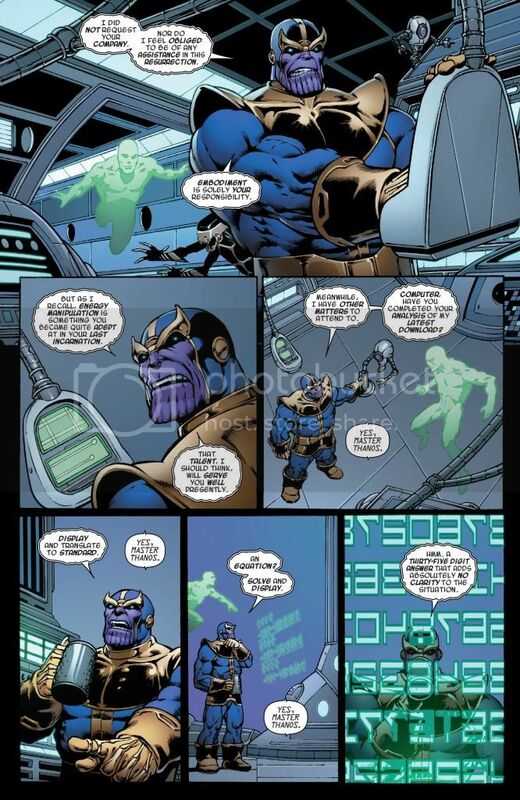 Easily reads the minds of the enclave. 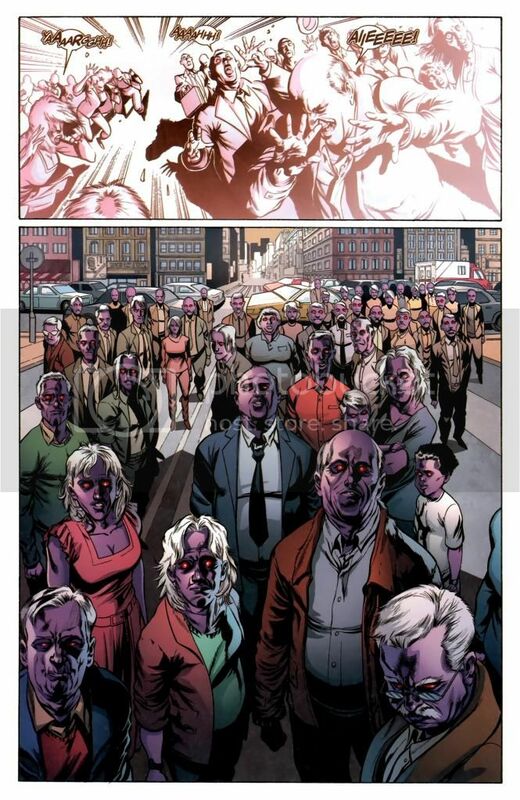 Shows mental images of the world to a group of people. 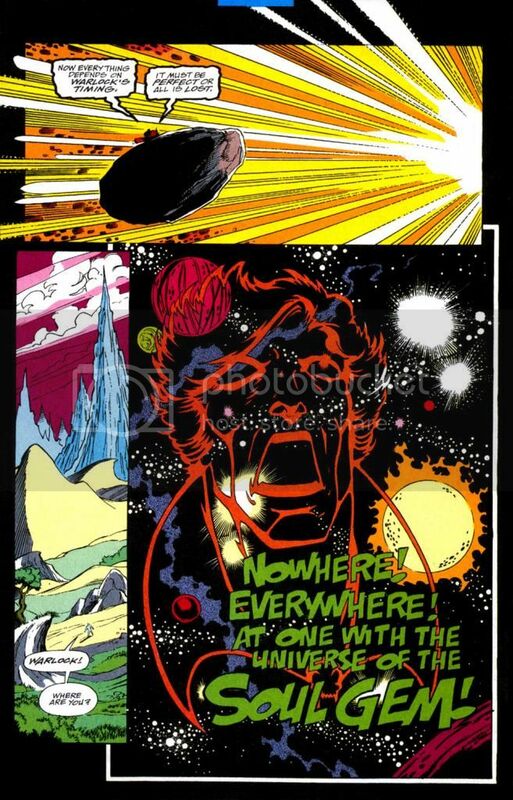 From space, senses the creation of a new cocoon being on earth like himself by the Enclave. 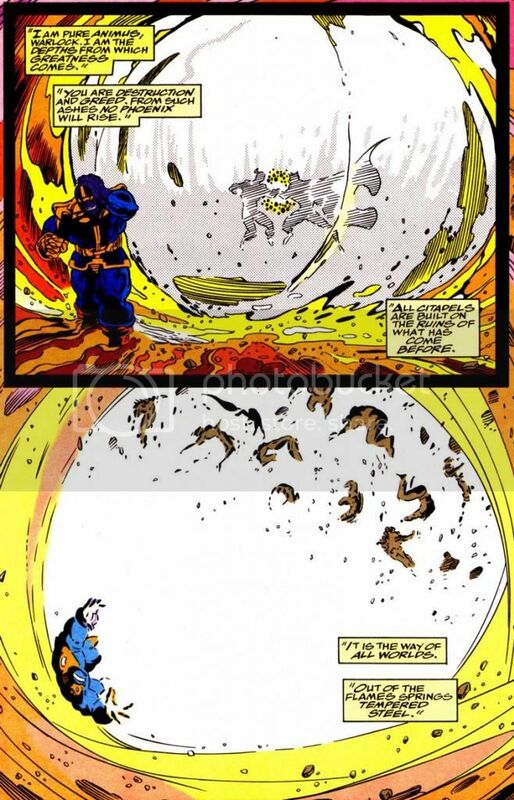 He travels there and uploads necessary data to train the being before it being born into this world. 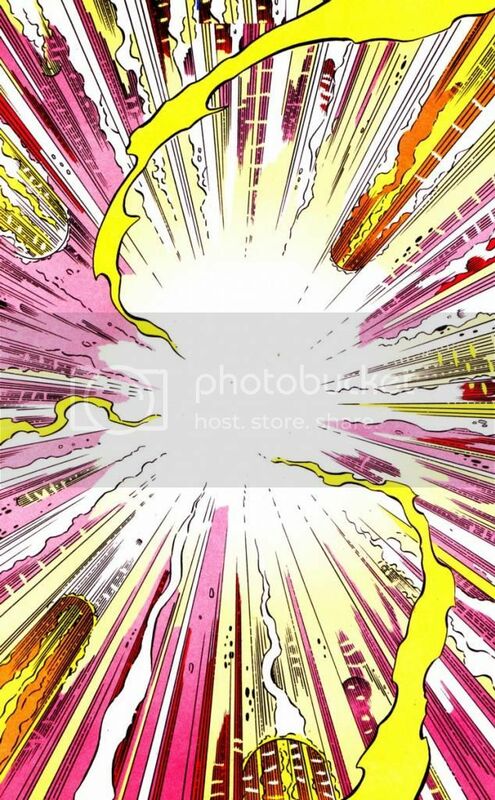 The karmic blast disrupts the anima centers of a soul. 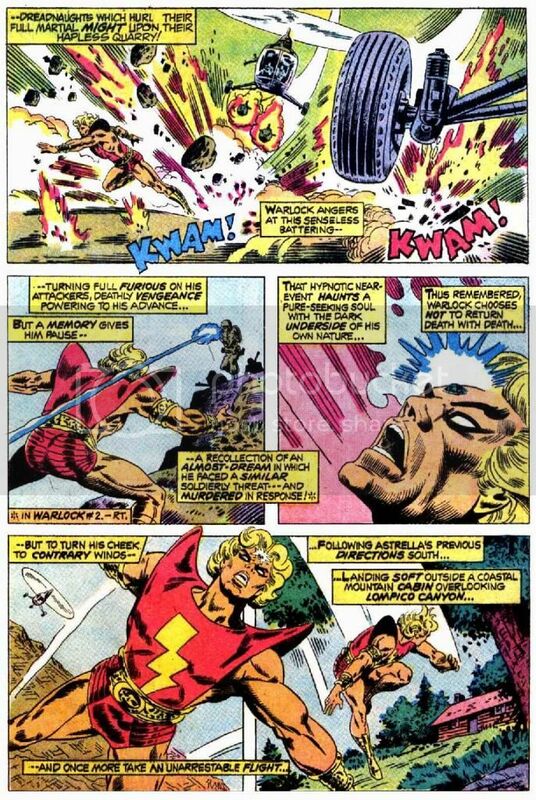 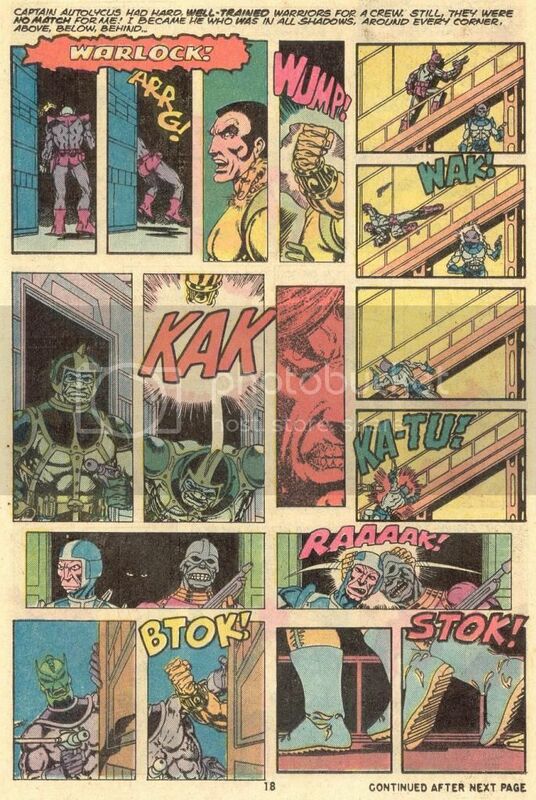 Please see the battles section as he has used this technique to defeat various opponents including Maxam, Giant-Man, Quasar and others. 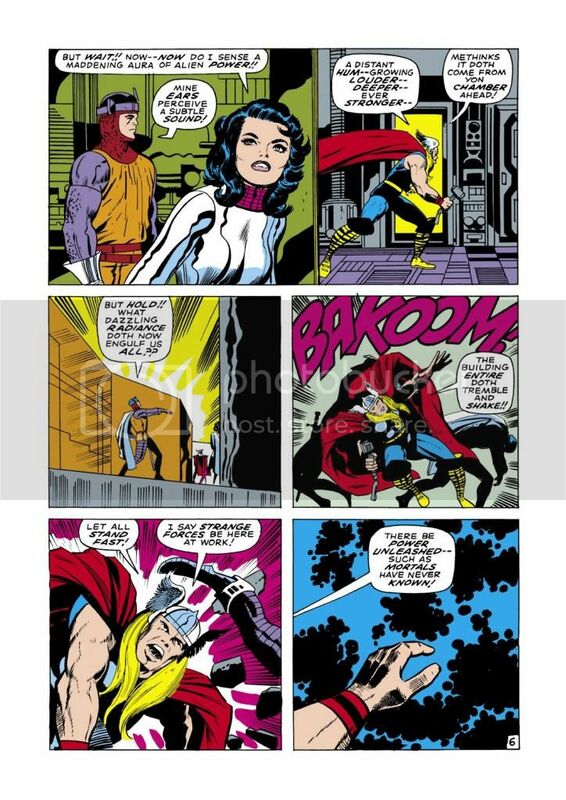 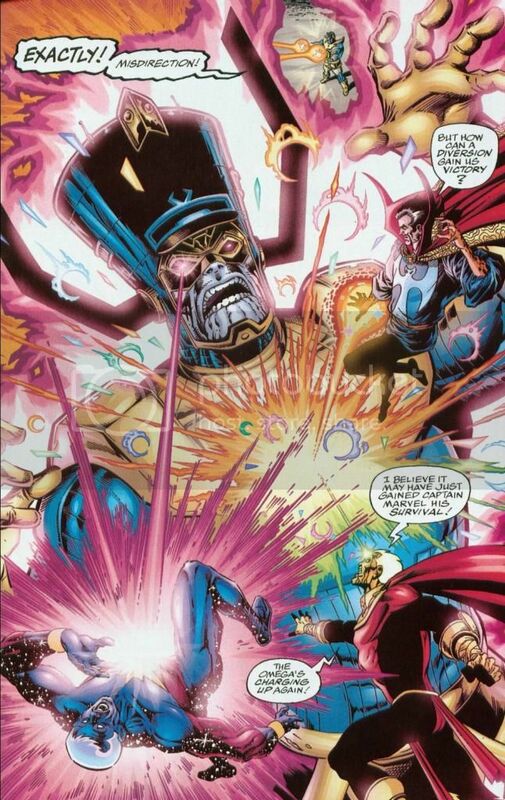 The karmic blast has also affected Asgardians or a servant of death, as shown below. 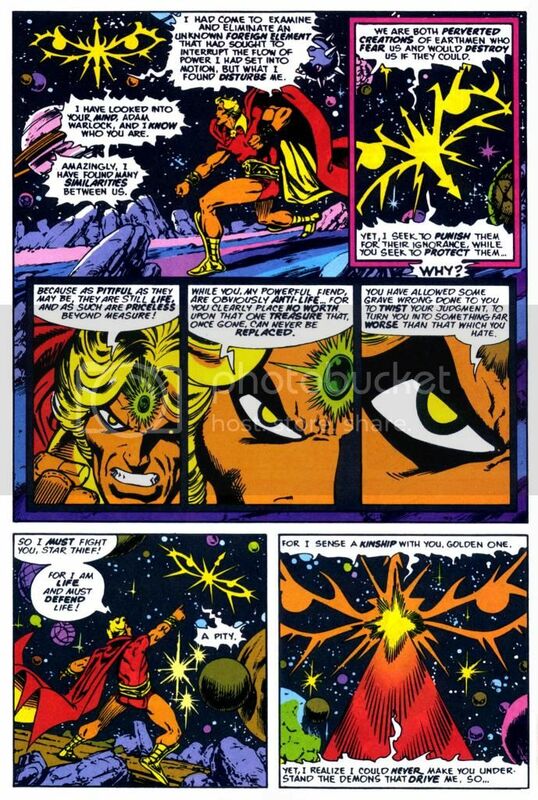 Takes Quasar to the psychic plane against his will after karmic blasting him and puts him through multiple mental tests. 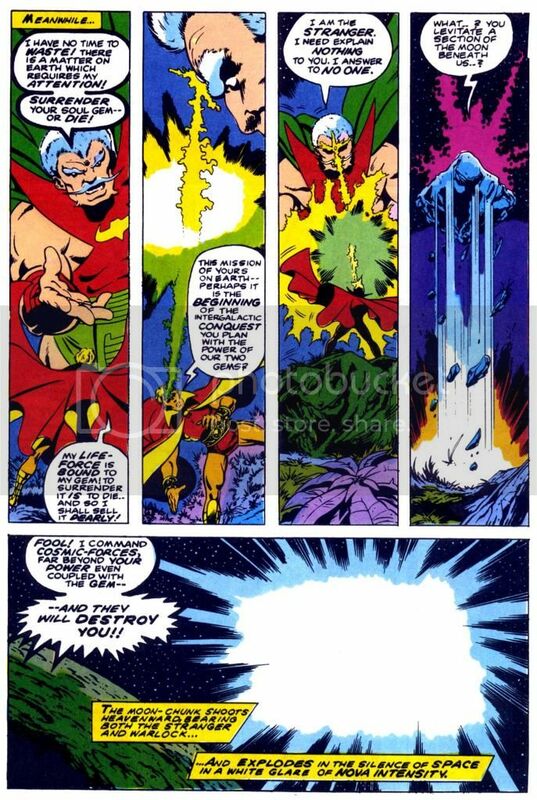 Expels Moondragon from his mind. 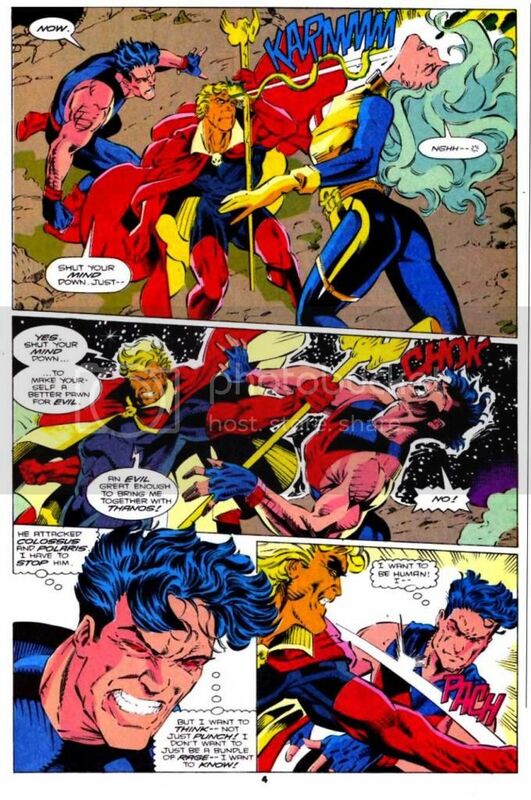 Gatecrashes Gemini’s mind and exorcises Erik from Gemini. 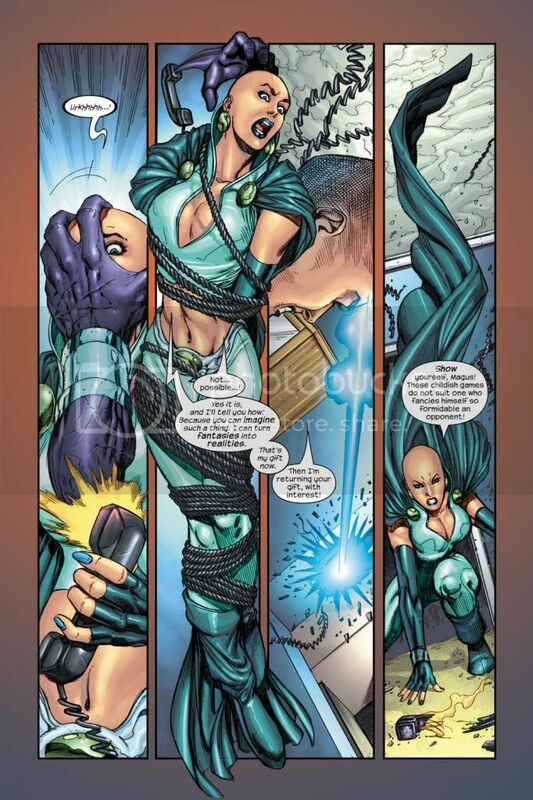 Travels through the Goddess’ psyche in an attempt to manipulate it and create an illusion in her head. 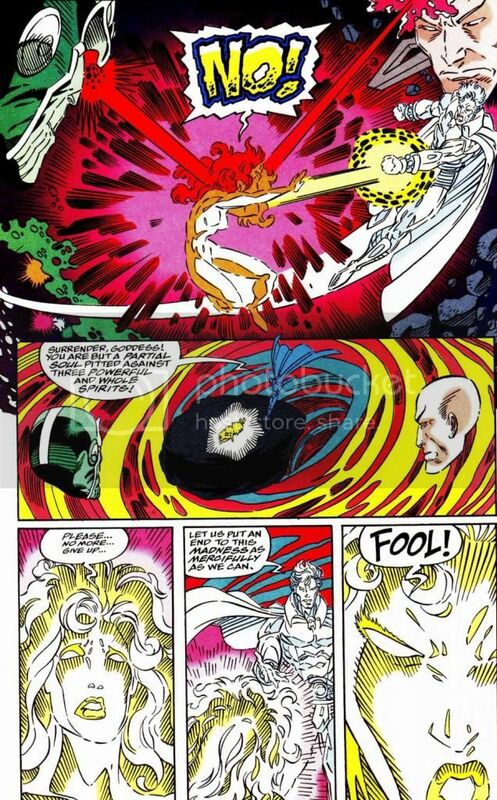 Bonds his spirit with the Cosmic Egg to control it and stop the Goddess. 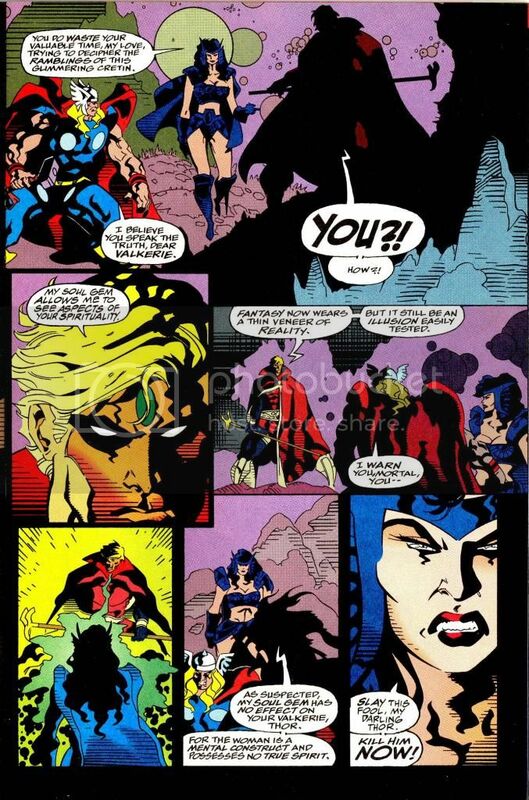 Enters a woman’s soul and battles inside her psyche. 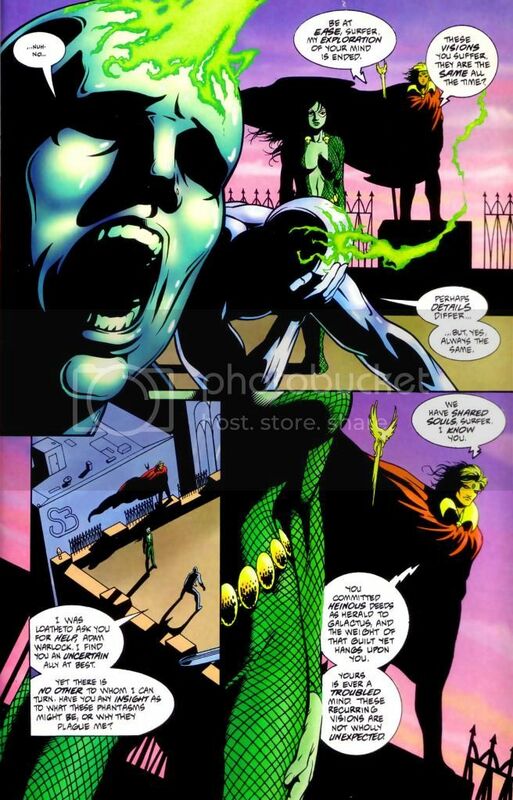 Psychically enters a man’s spiritual domain and casts out a demon of the mind. 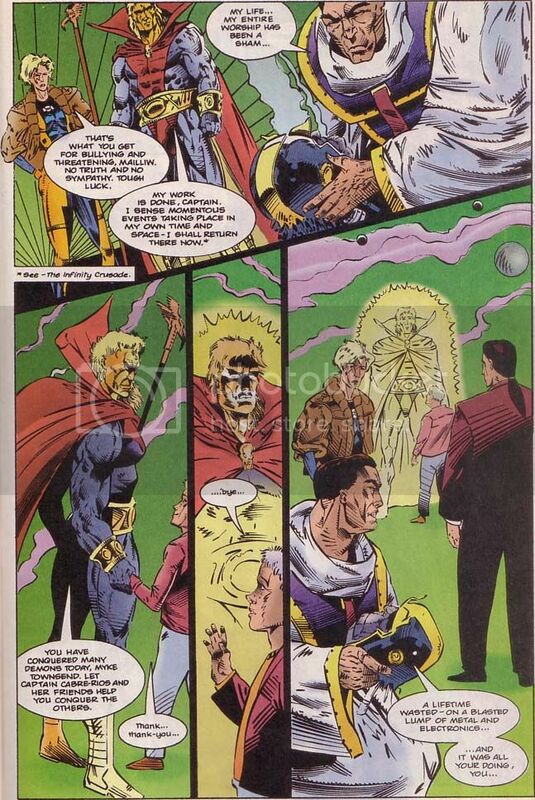 While in a coma in the present, his astral self travels to the future to help battle Gamble. 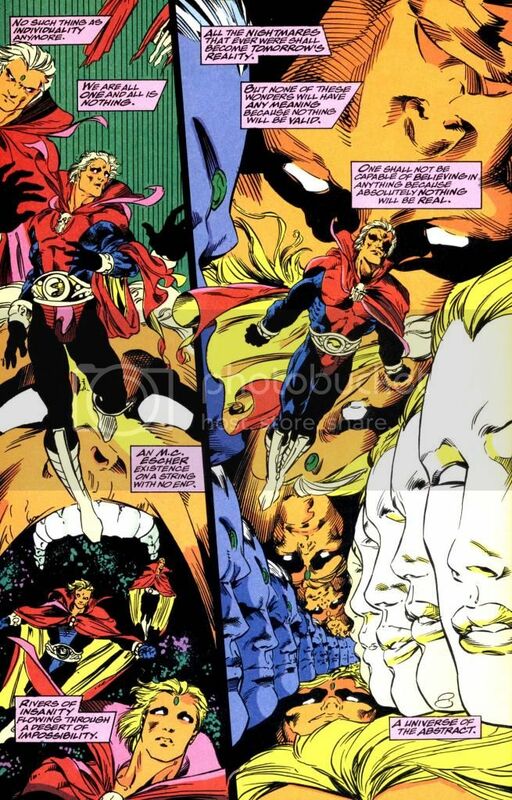 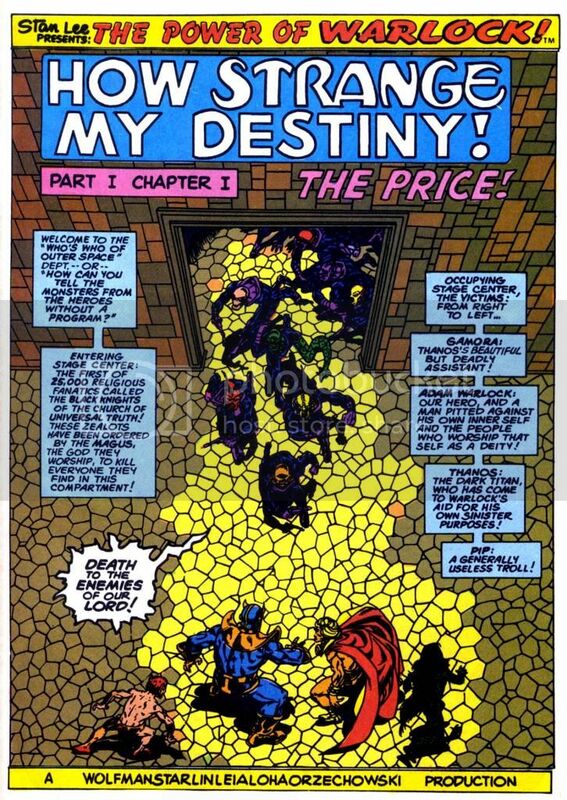 His astral self displays considerable mental powers as he goes to the astral plane, probes minds and travels to dreamscape to defeat a Thanos construct created by Gamble. 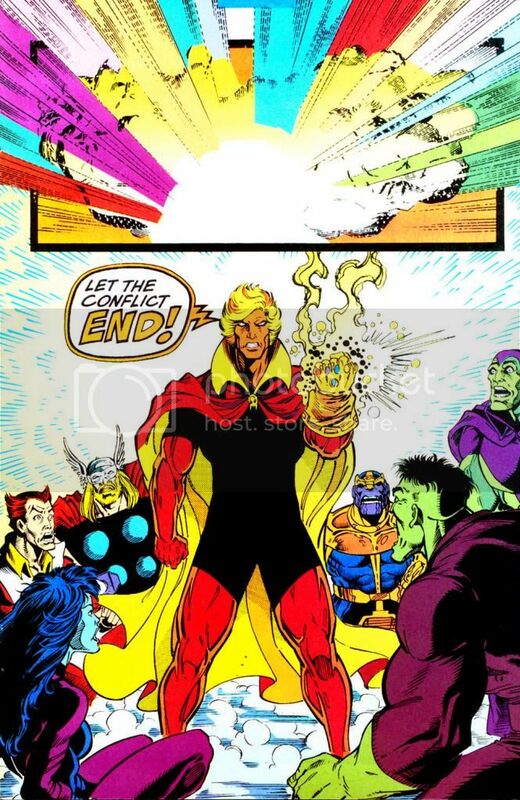 Breaks free after being imprisoned by the Magus (in the possession of 5 Infinity Gems) and grabs the incomplete Infinity Gauntlet. 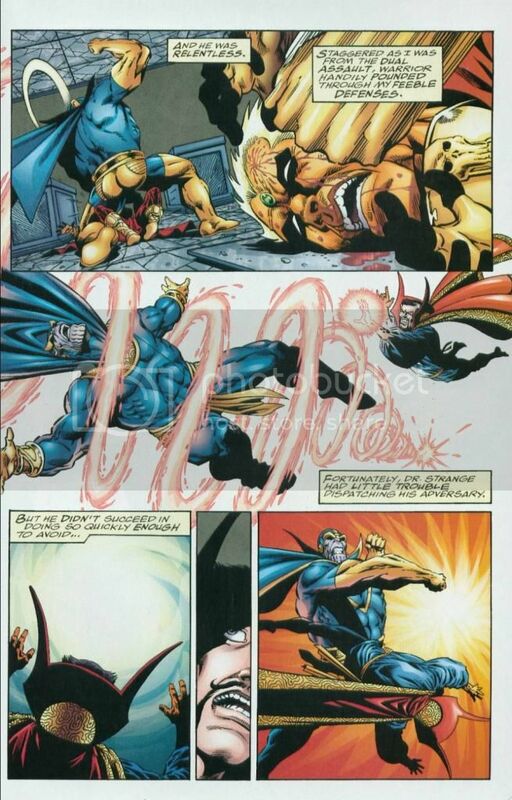 As it remembers his touch, he wins the battle using pure willpower, restoring the universe to how it was. 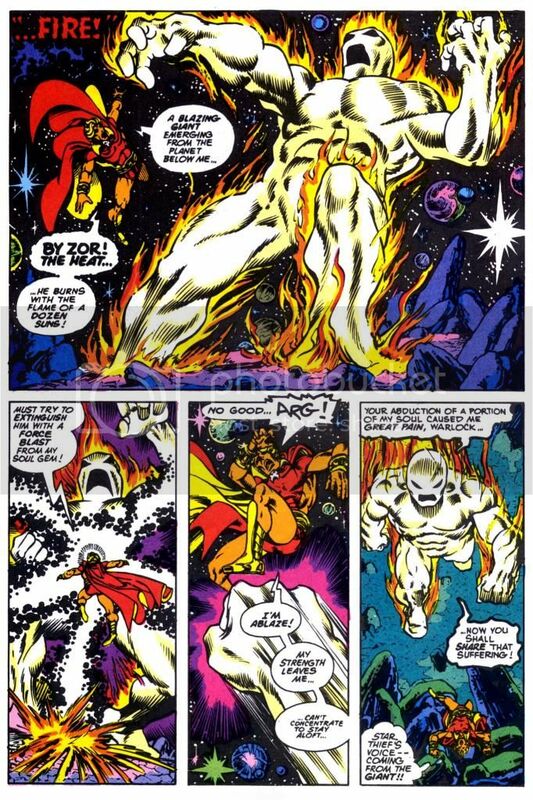 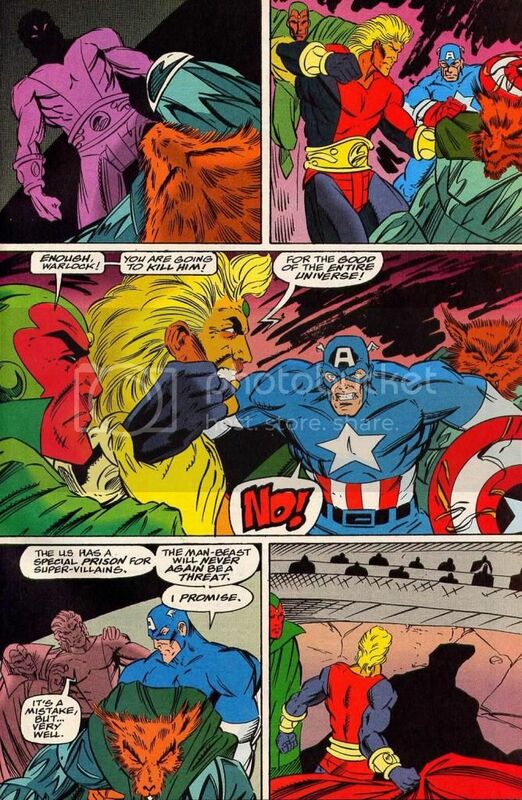 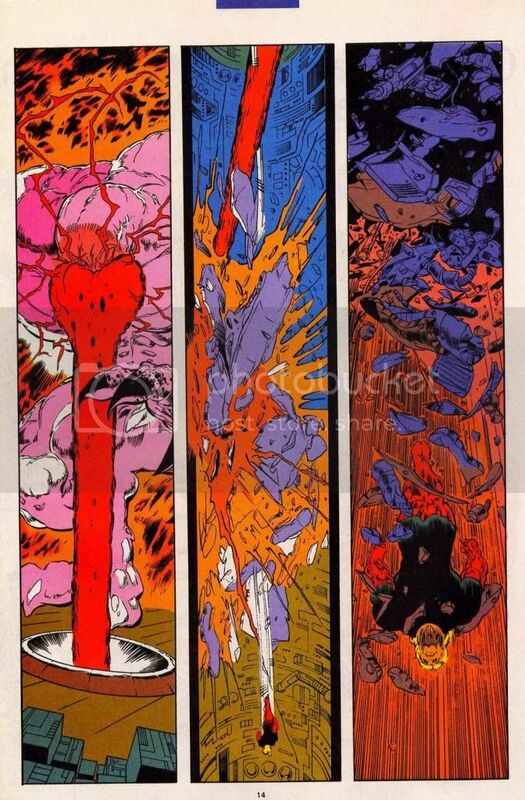 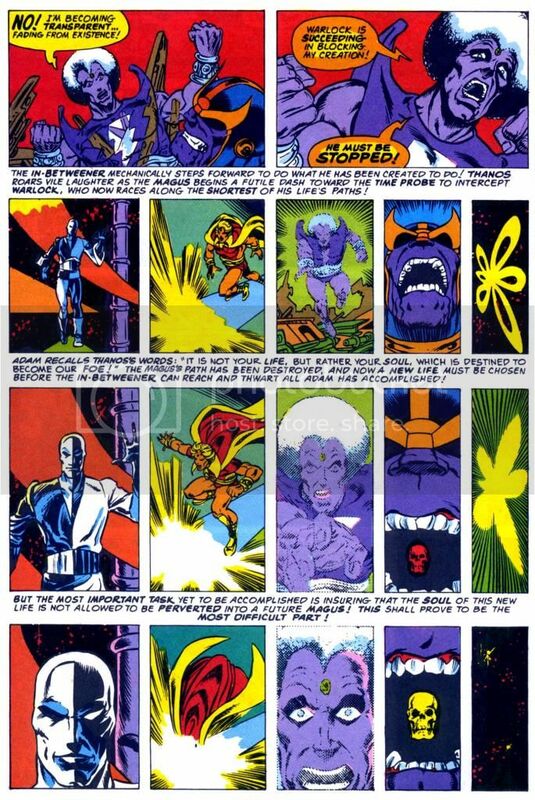 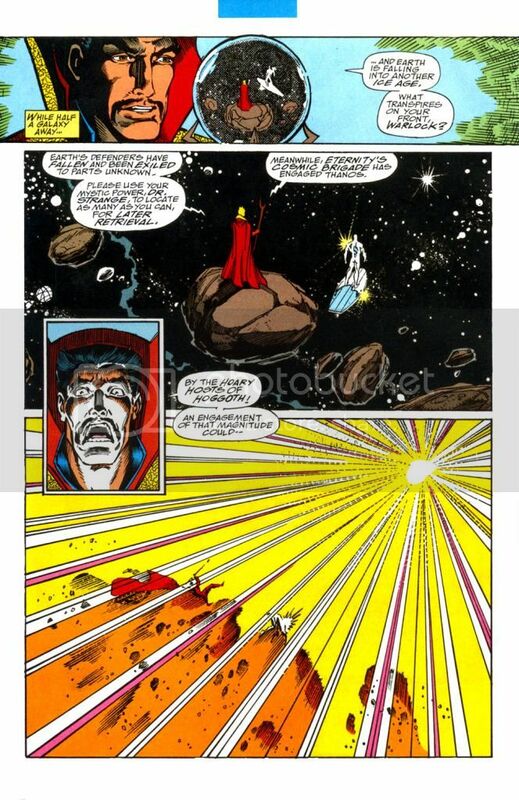 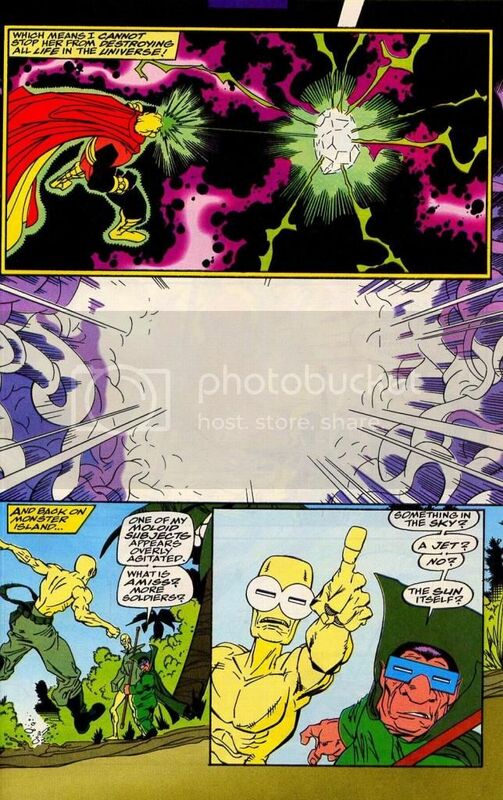 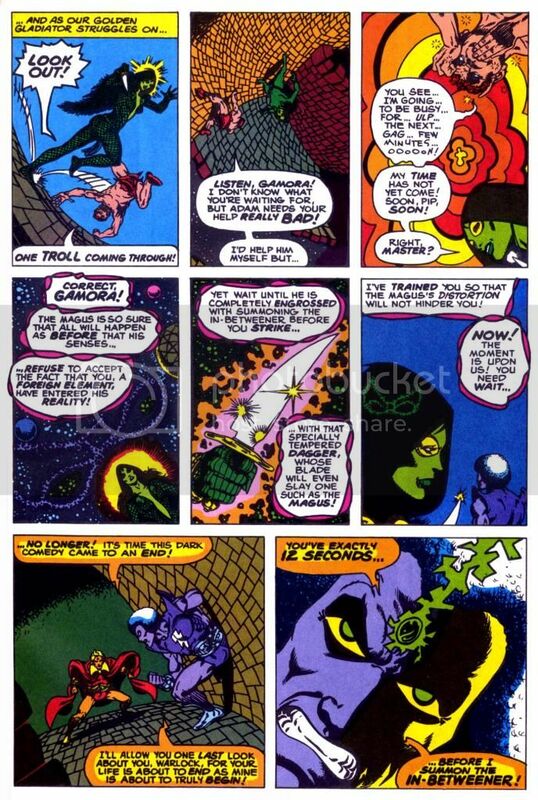 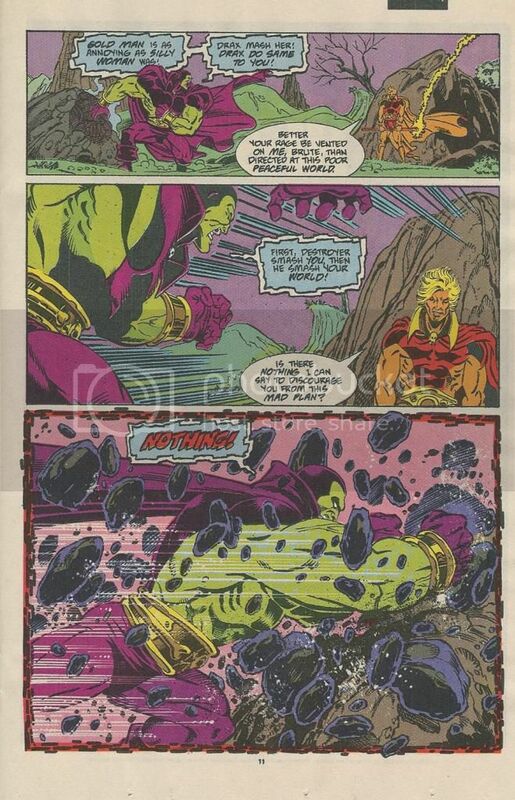 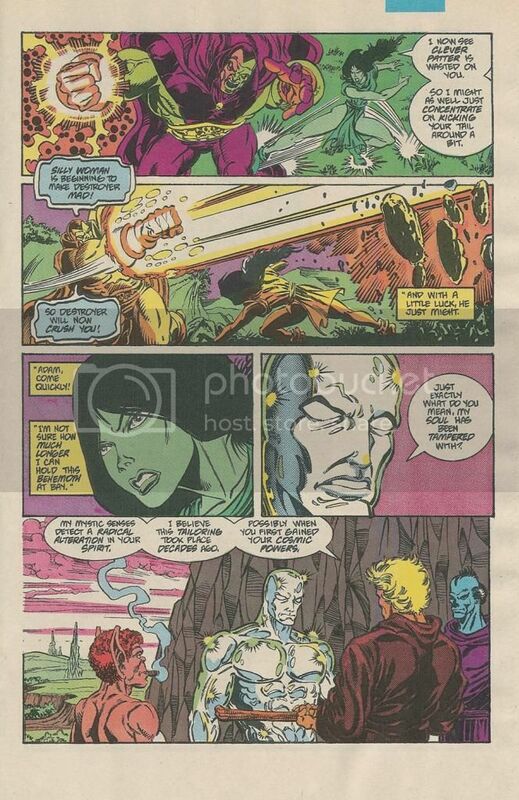 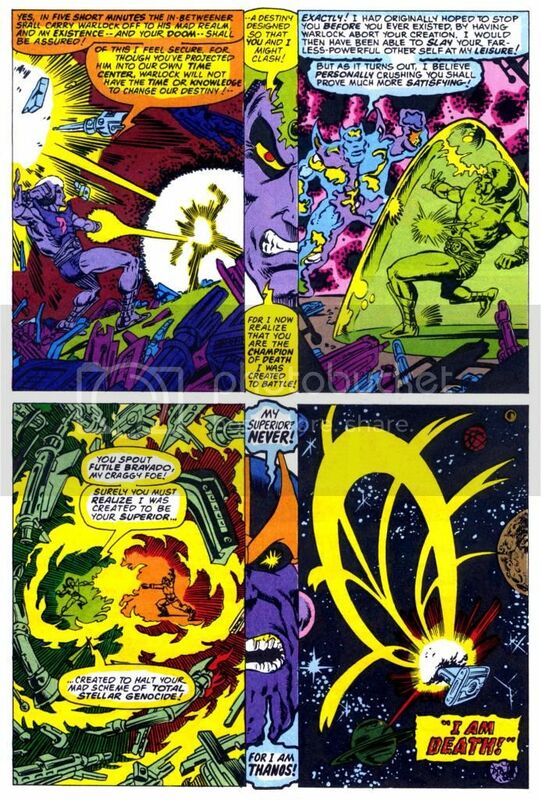 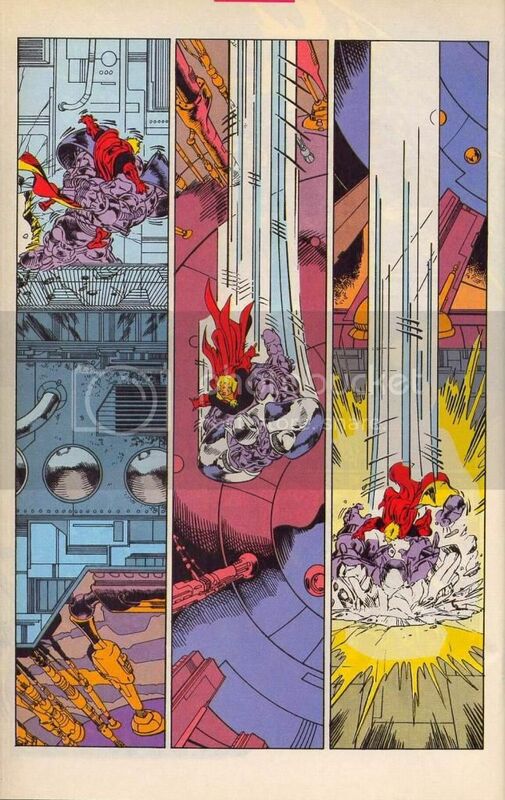 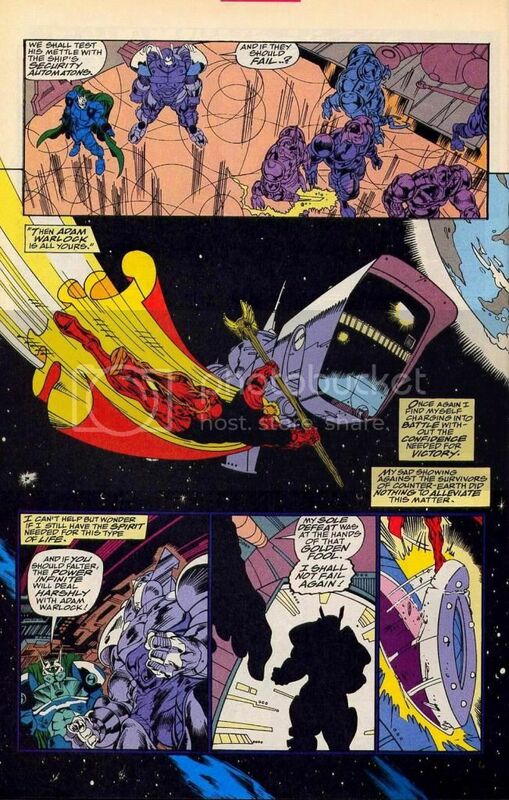 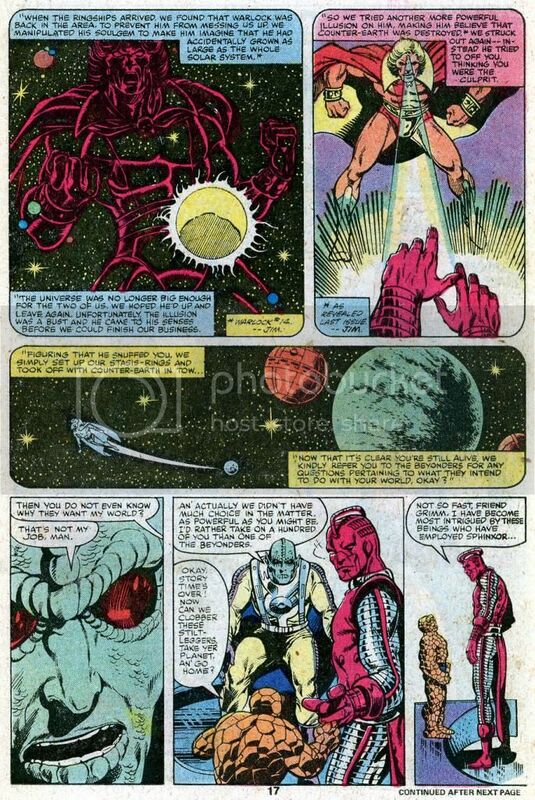 Goes to soul world where his power is at its peak and grows, becoming one with the soul world, as he calls out to the 5 other Infinity Gems in a successful attempt to stop Nebula (who had the Infinity Gauntlet at the time). 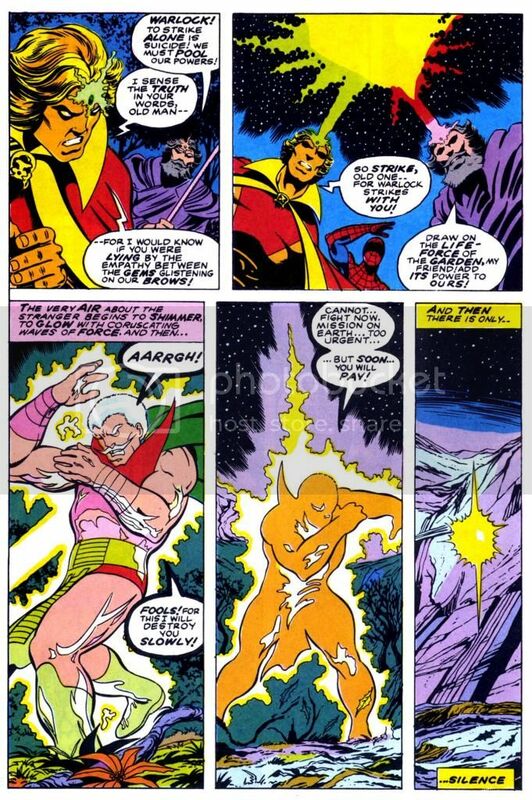 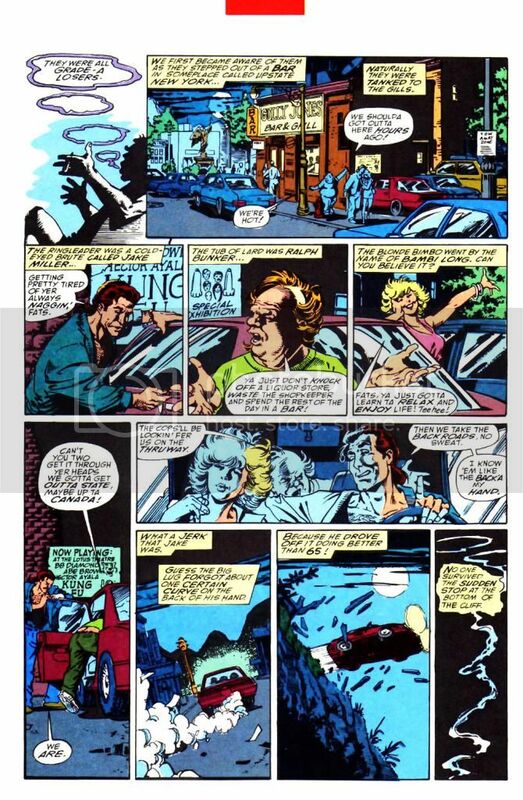 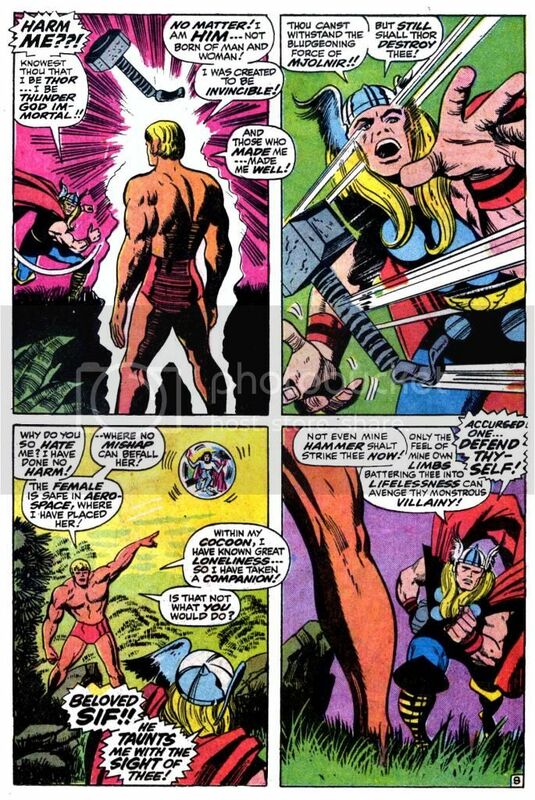 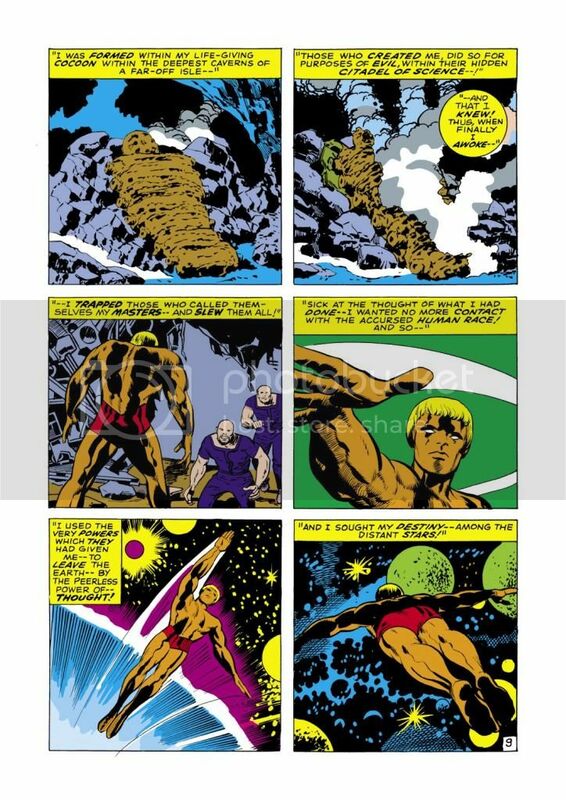 Adam transmutes reality and alters perceptions to trick the Guardians (who were in possession of a cosmic cube) to think they’ve won because he was weakened at the time. 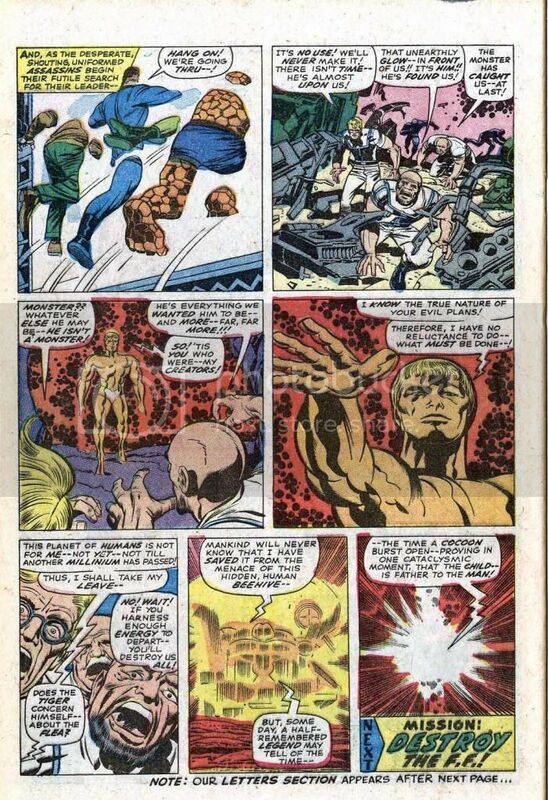 Adam could posssess people and transfer his own consciousness into others (possibly aided by the faith generator). 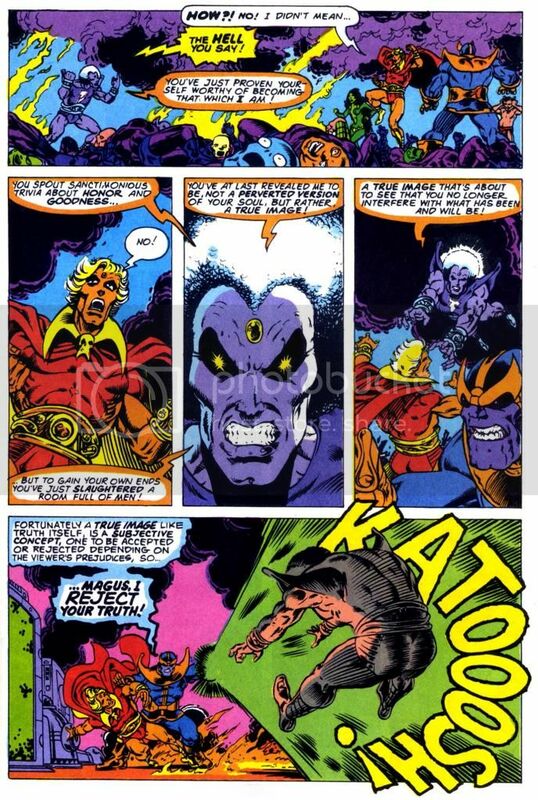 The future Magus displays his considerable mental power to Warlock. 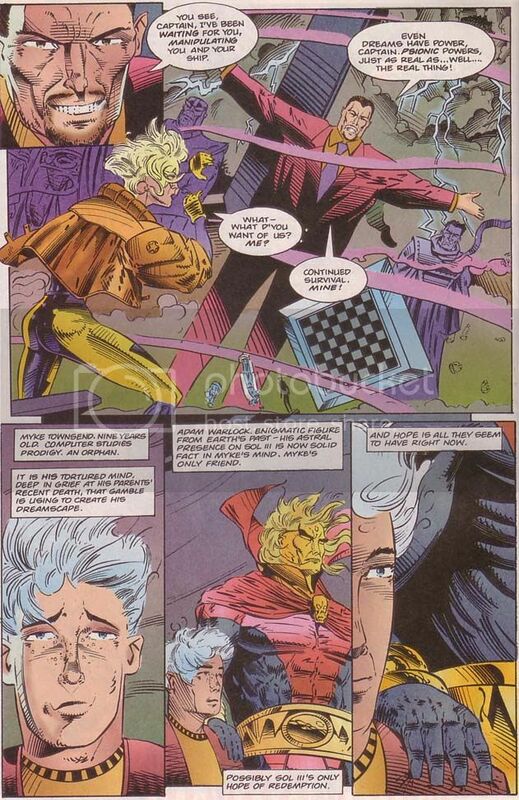 The future Magus could appearantly also manipulate reality to a degree (or high-level illusion casting). 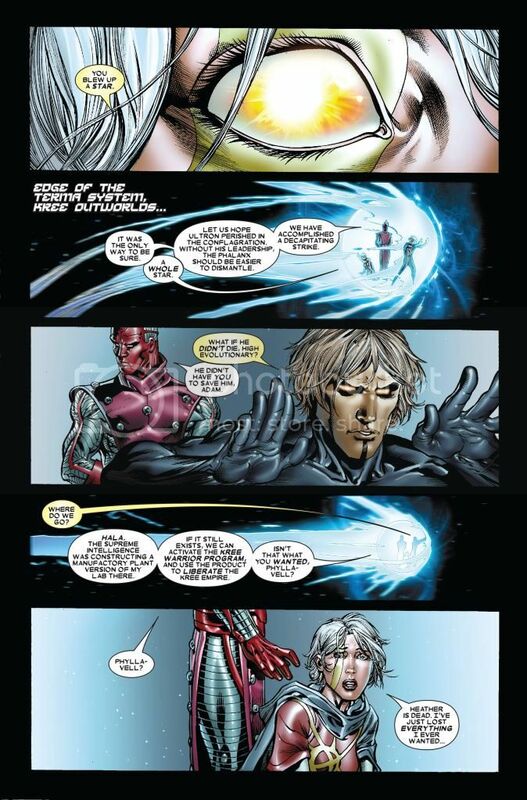 Neutralizes a high-tech weapon with just a thought from a distance. 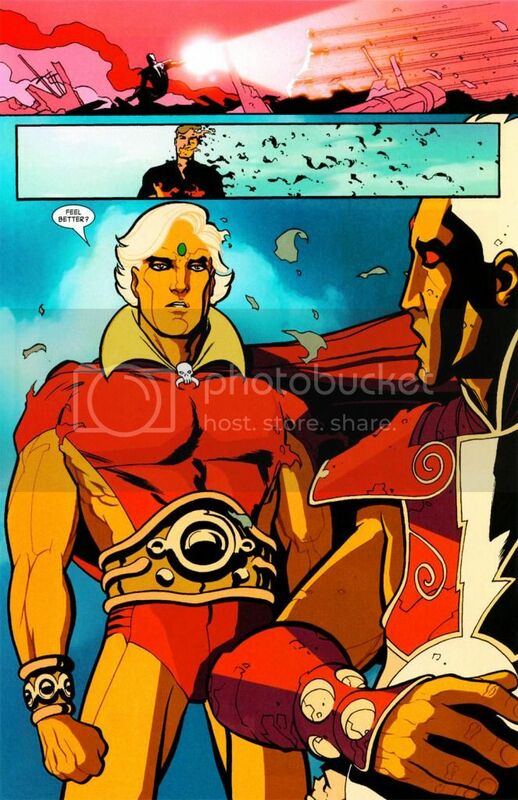 Can levitate and fly using the peerless power of thought. 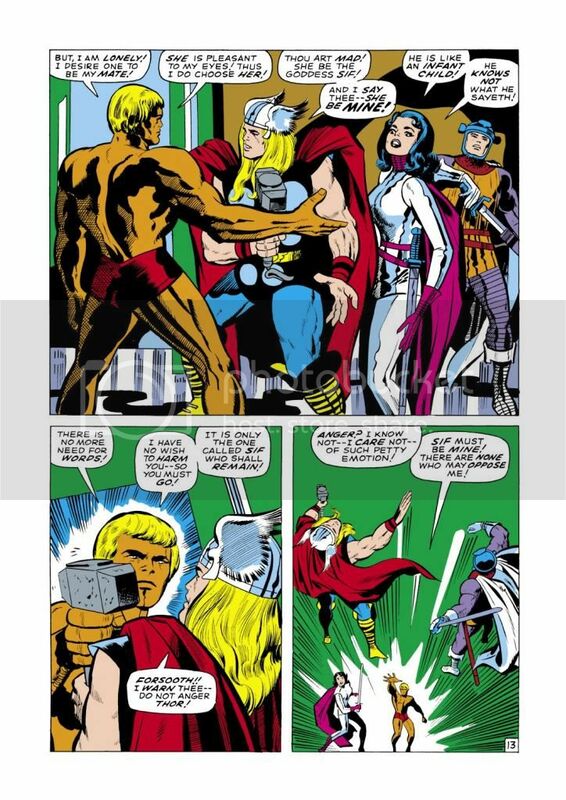 Creates a mind-shield that even Thor could not affect using his hammer. 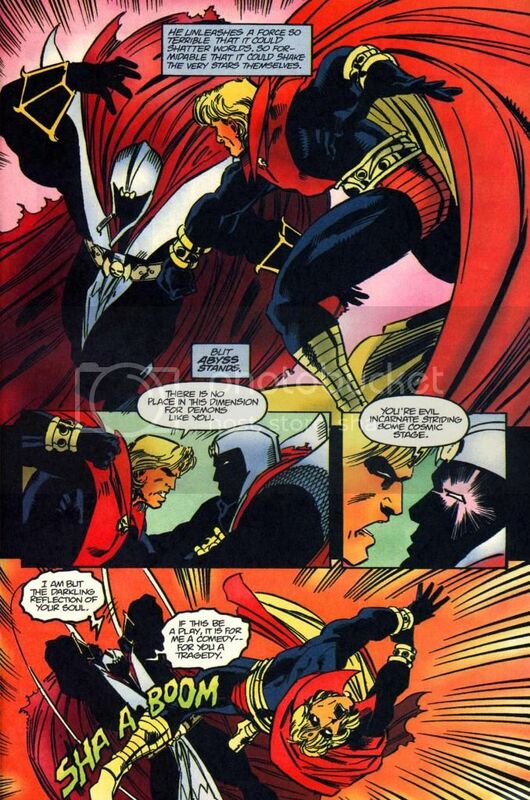 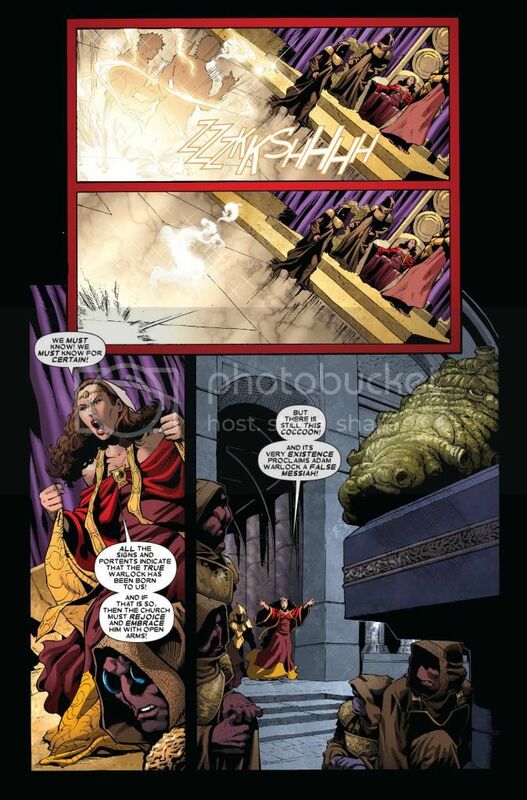 Pushes Thor and Balder away using telekinesis. 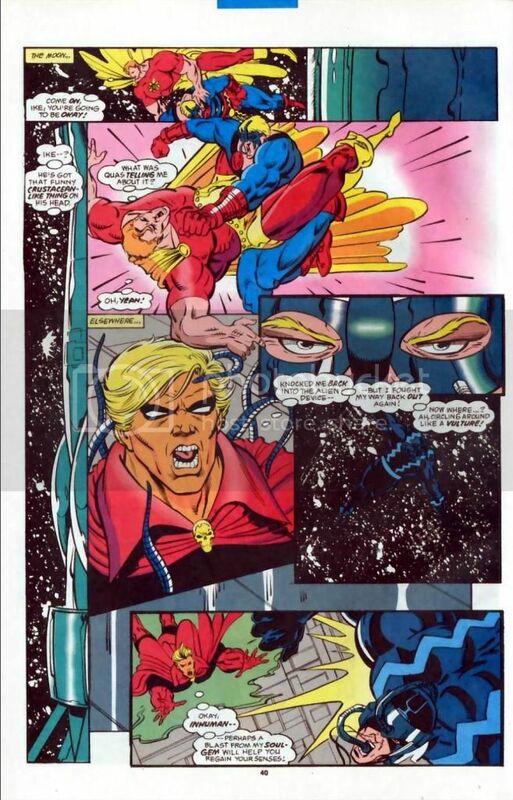 Takes control of Gemini's body and sends it into orbit to crash into a satellite. 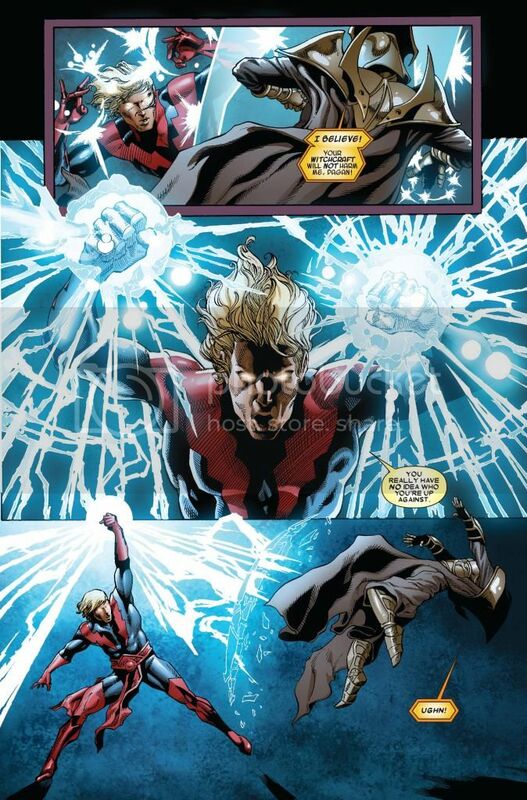 Uses his „deadly mindpower“ to propel boulders at Thor. 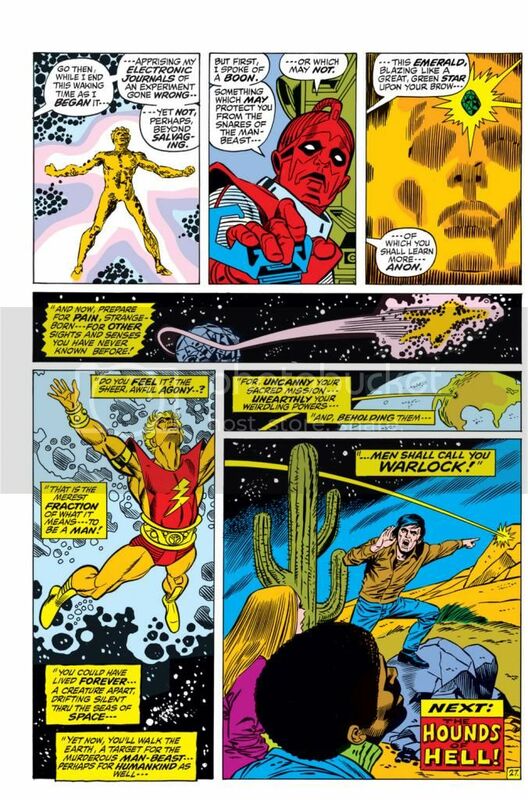 Has the ability to teleport himself and others. 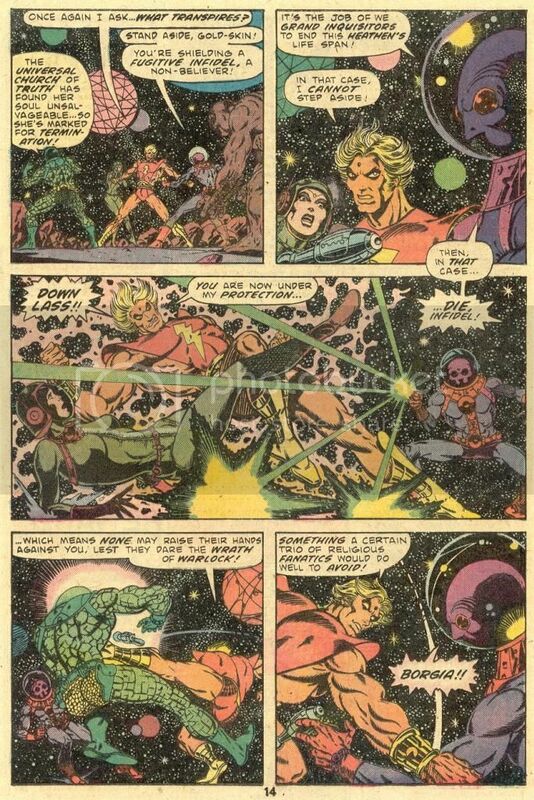 Teleports himself and a spaceship. 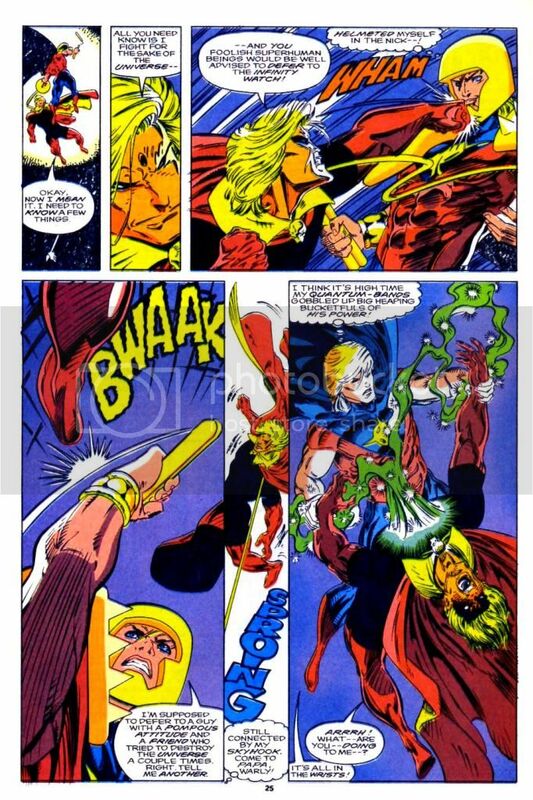 Teleports a sword from Phyla’s hand to his own hand. 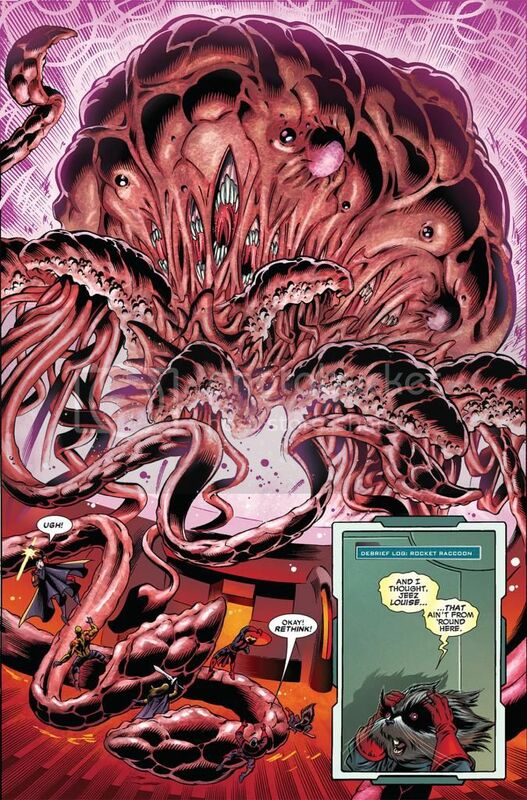 Teleports the whole giant scientific complex of the Beehive to another dimension. 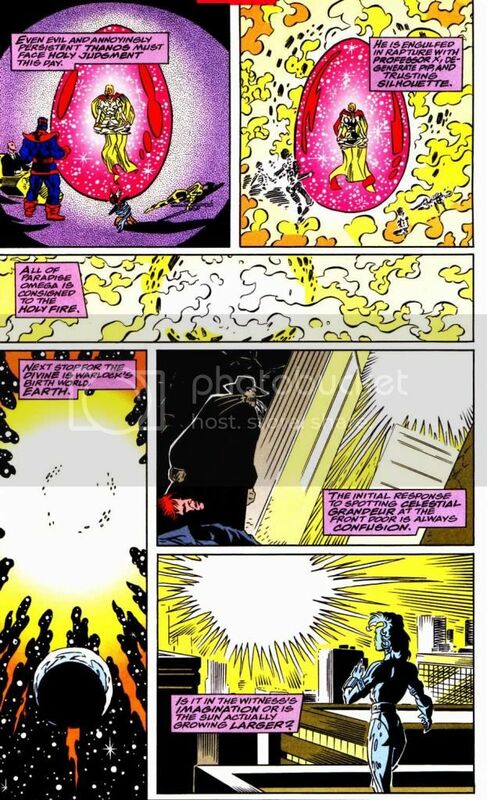 Opens a portal from another dimension using his soul gem. 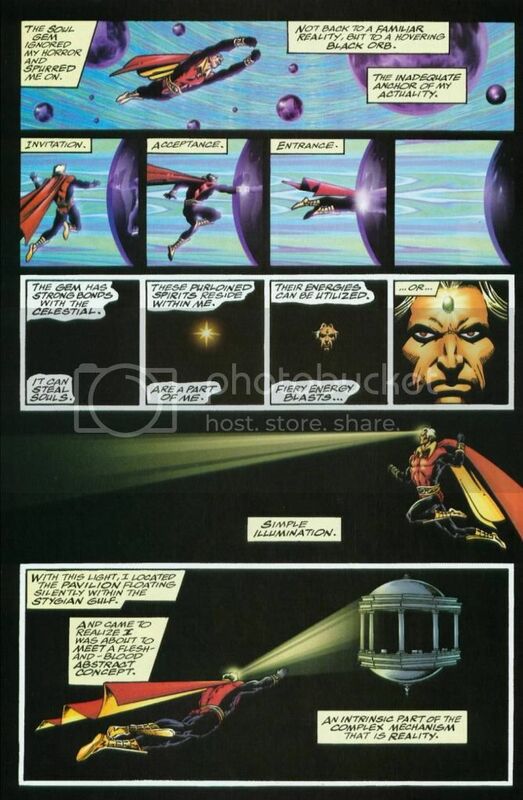 Creates a solar vortex to travel to a distant dimension. 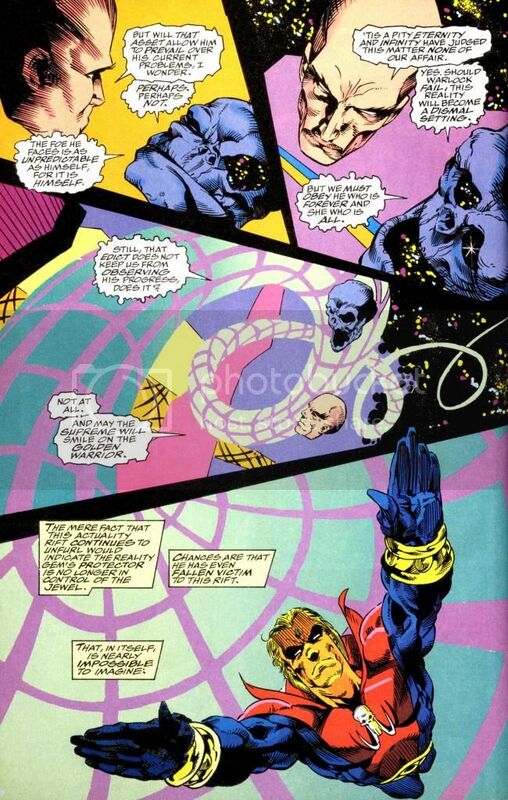 Travels to an alternate future universe in his astral form. 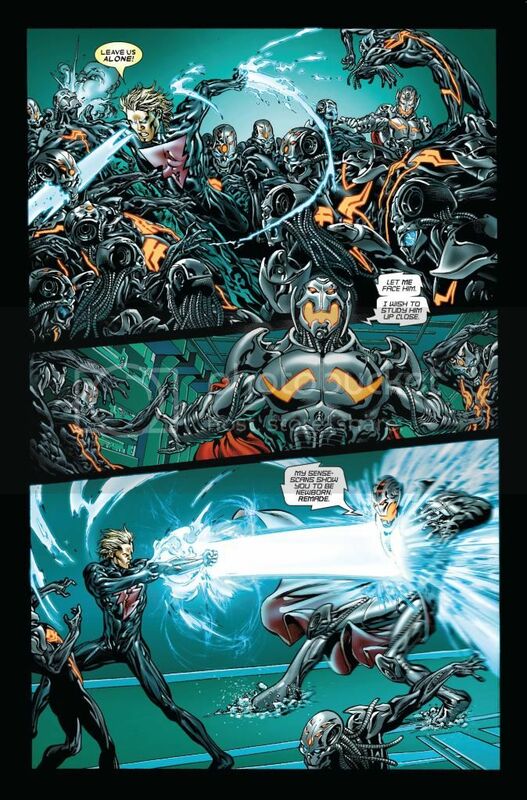 Creates a large portal for himself and his whole army of Black Knights to travel through. 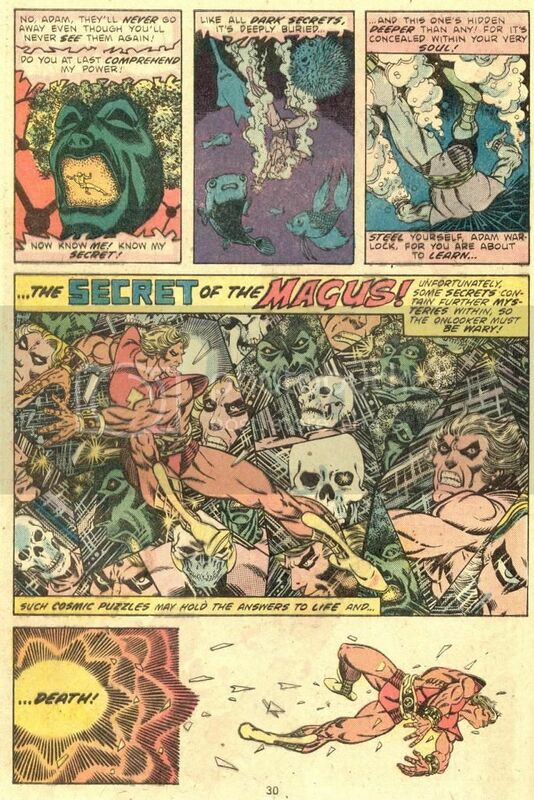 Note: future Magus. 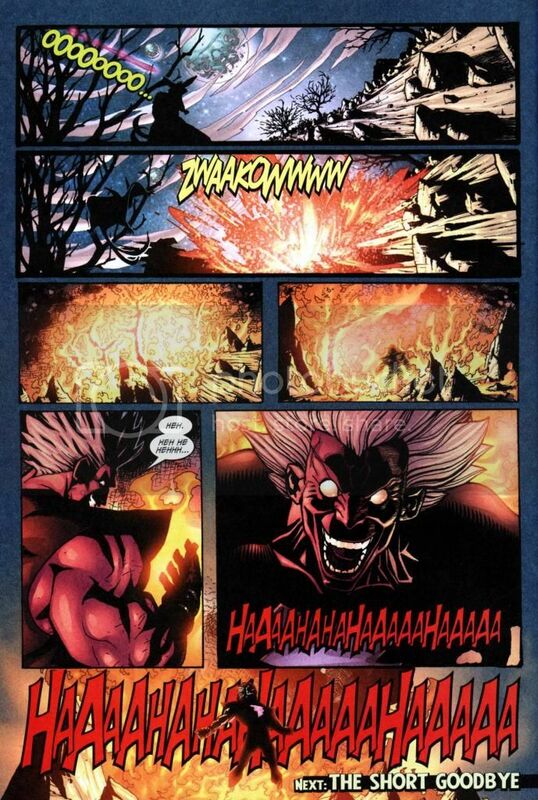 Adam has not received any formal training, but is an accomplished self-taught fighter and martial artist. 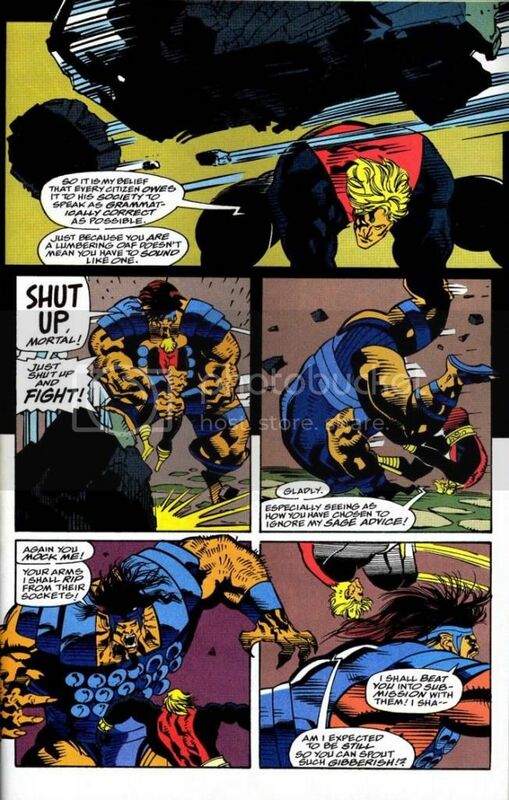 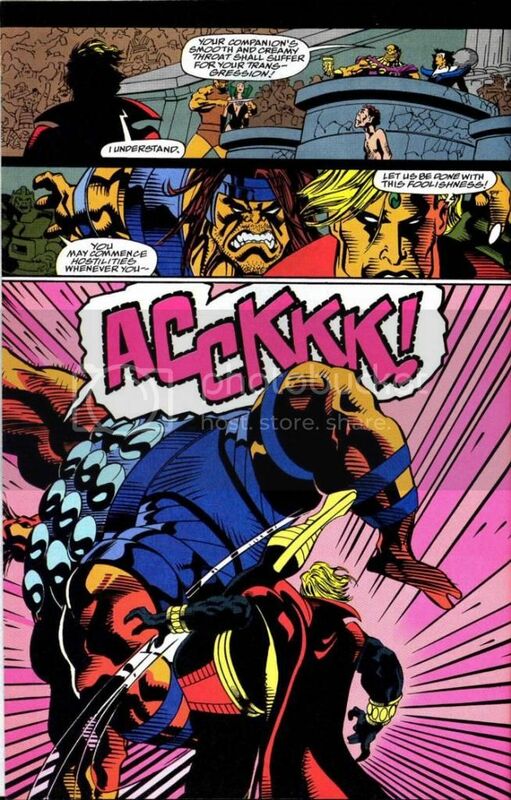 His fighting skills are evident in the battles section (especially in battles against Magus, Wonder Man, Olik, Drax, Warrior, Nobilus, Ikon and many others). 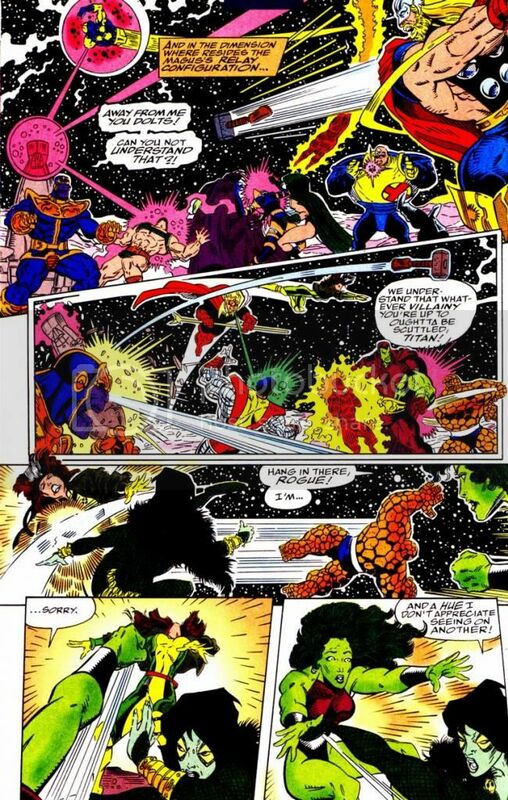 In addition, he has also defeated one of the greatest fighters in the universe (Gamora) in melee combat. 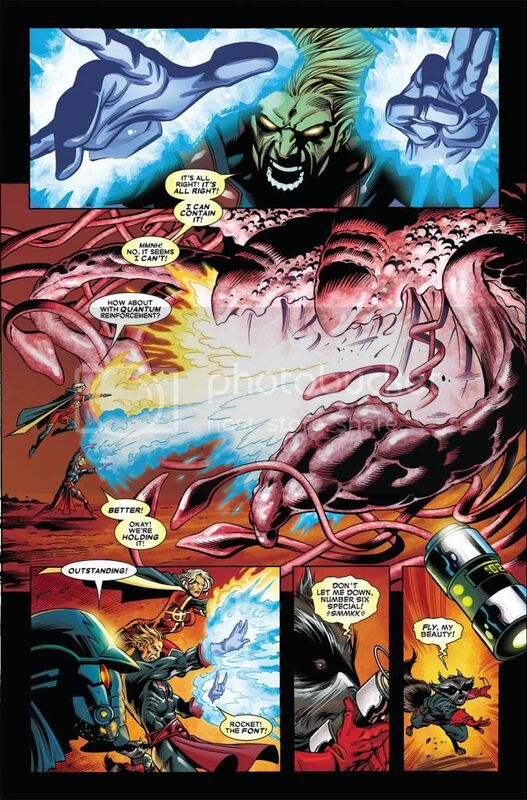 As shown by another cocoon being created by the Enclave (just like Adam), Adam likely has a capacity for amazingly fast learning including martial arts. 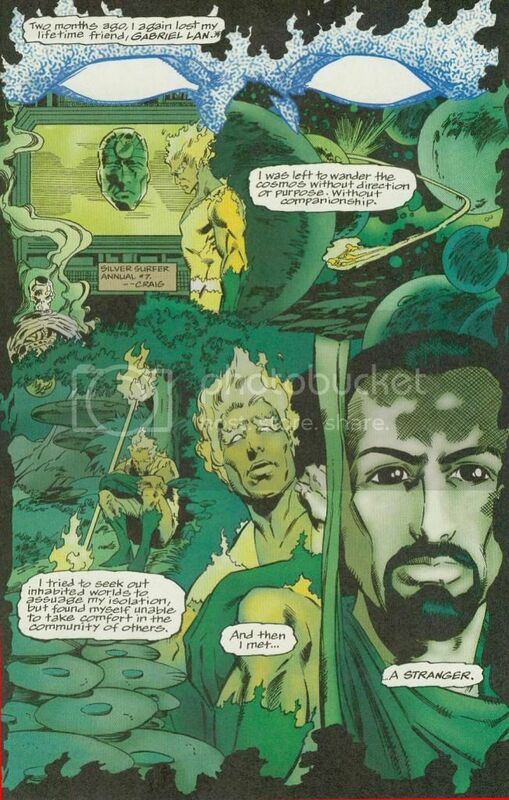 Adam has also absorbed the skills of those warriors whose souls he stole, for example captain Autolycus. 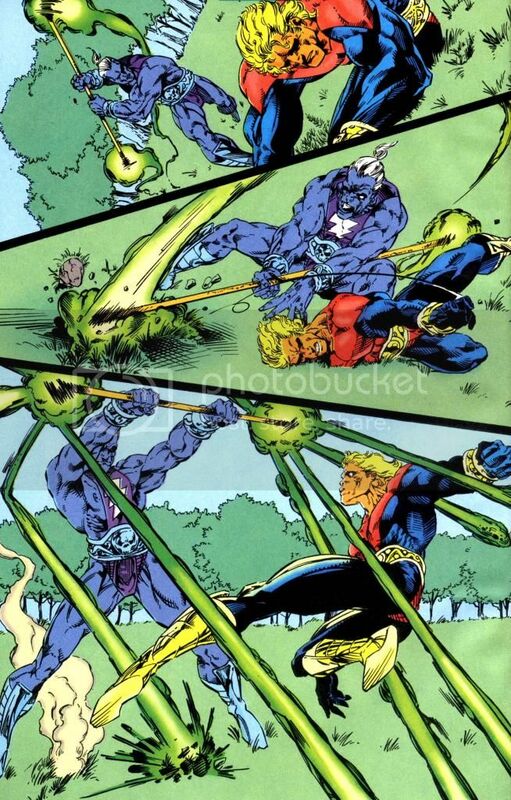 Has used nerve pinches against opponents to take them out. 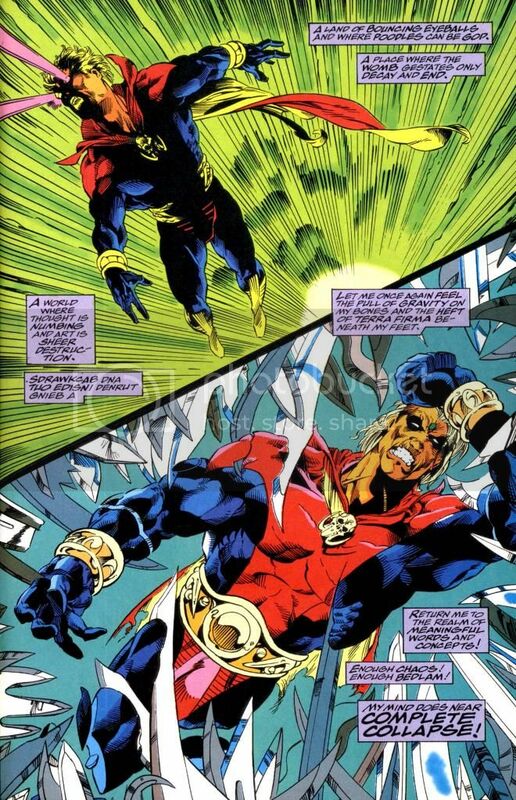 - Quasar notes that the soul gem’s energies are outside the EM spectrum and he cannot manipulate them. 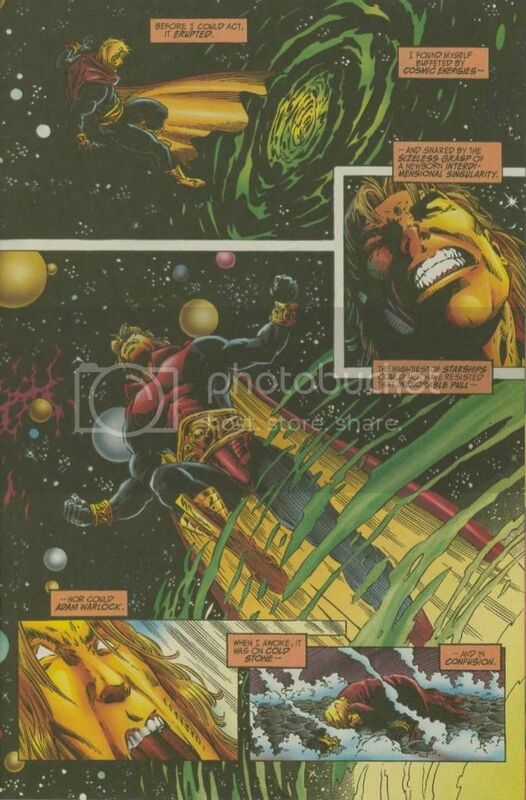 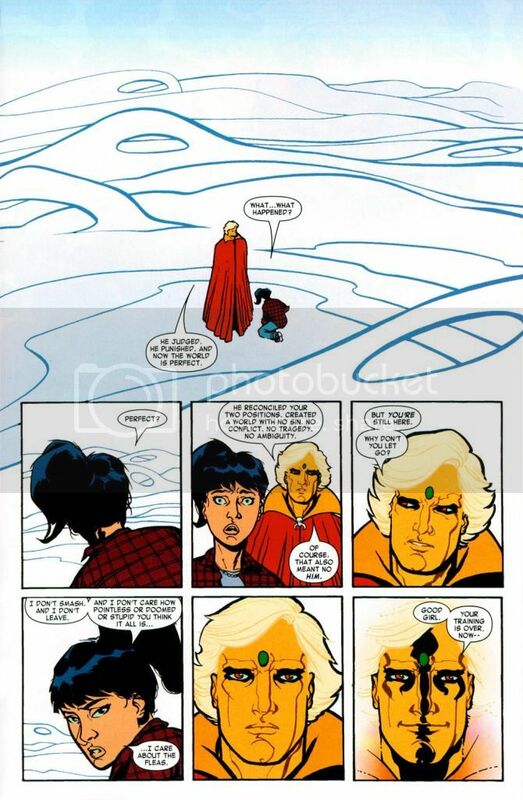 - Takes down Quasar with a karmic blast and takes him to the psychic plane. 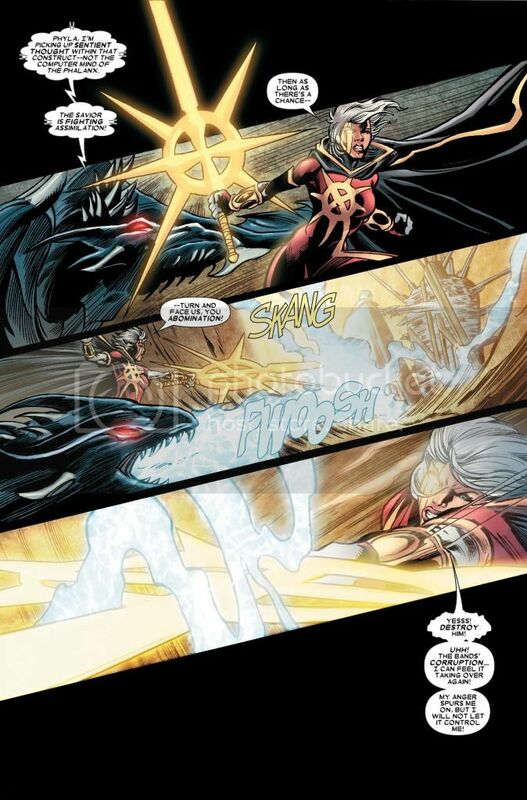 - Adam Magus takes on and easily dominates the duo. 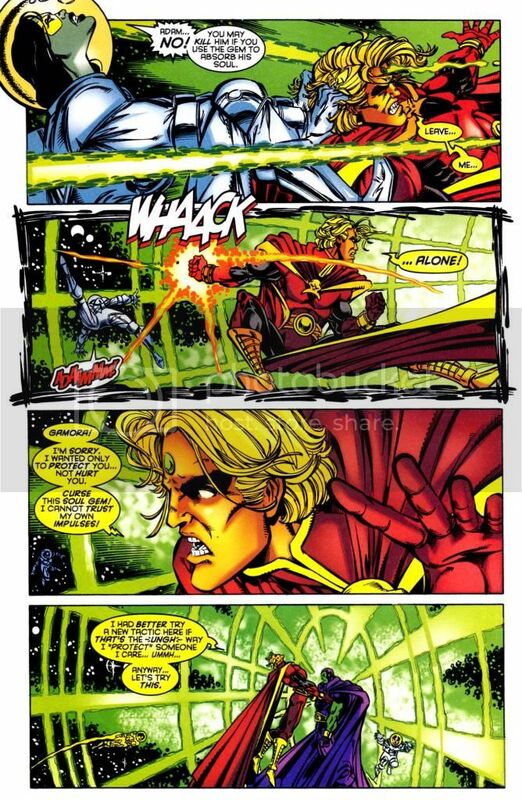 - Defeats Quasar by shortcircuiting his system. 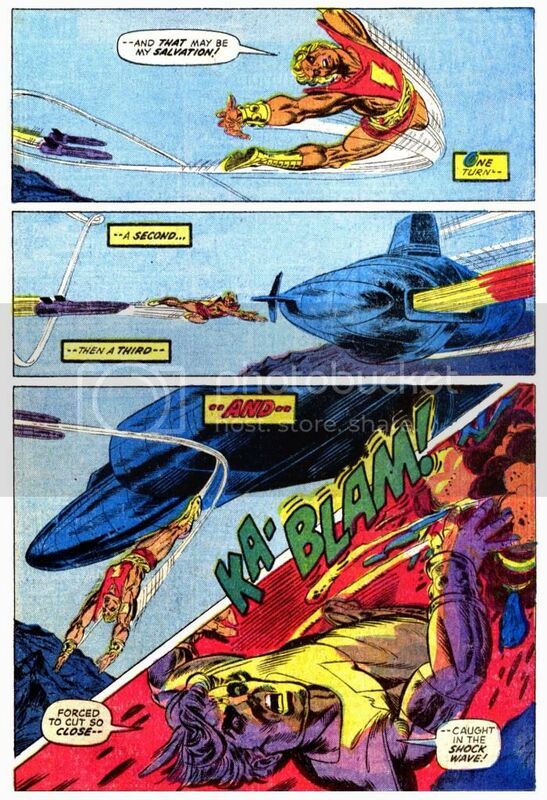 - Brief encounter with the Surfer. 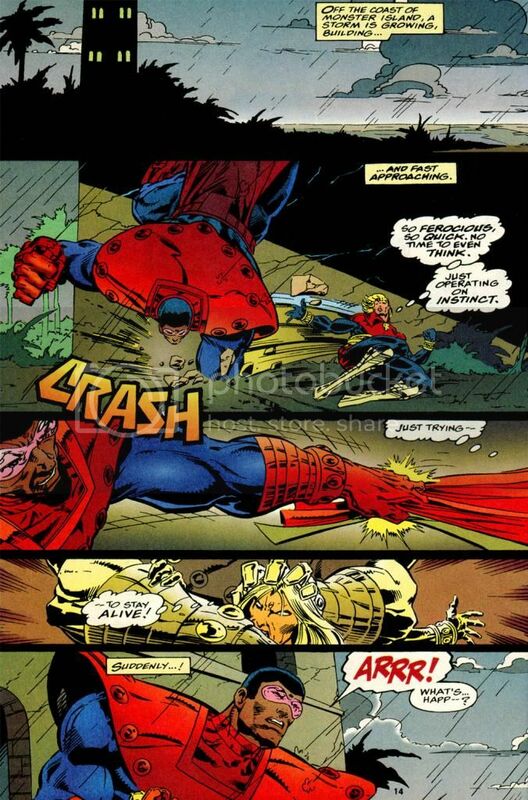 - Takes down Surfer with a surprise attack. 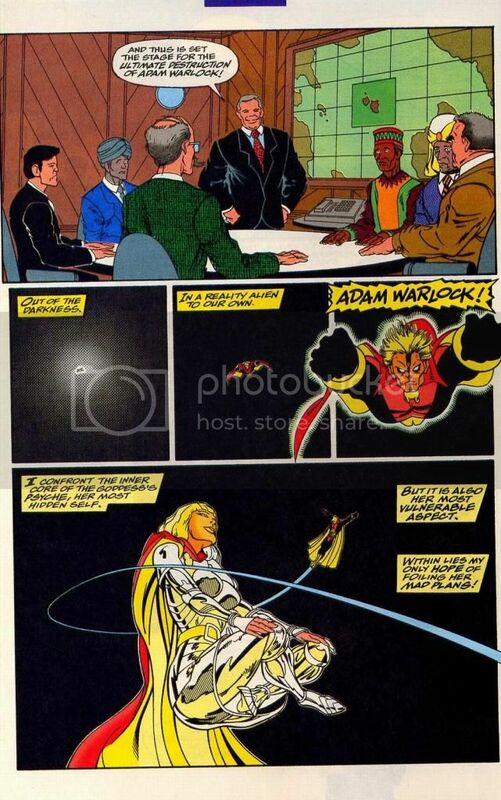 - This is Adam shortly after being born as Him, without of any skills and experience. 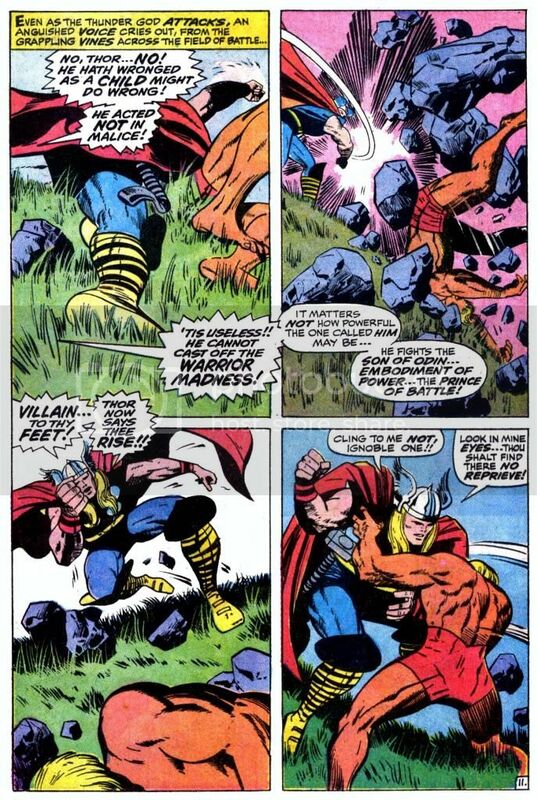 Thor was in Warrior Madness at the time. 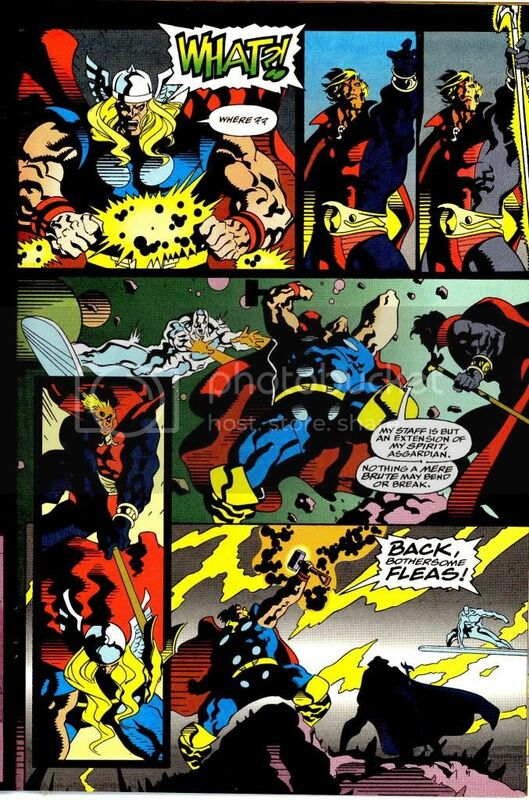 - Nobilus is a Thor clone who has been shown to be physically equal to the thunder god. 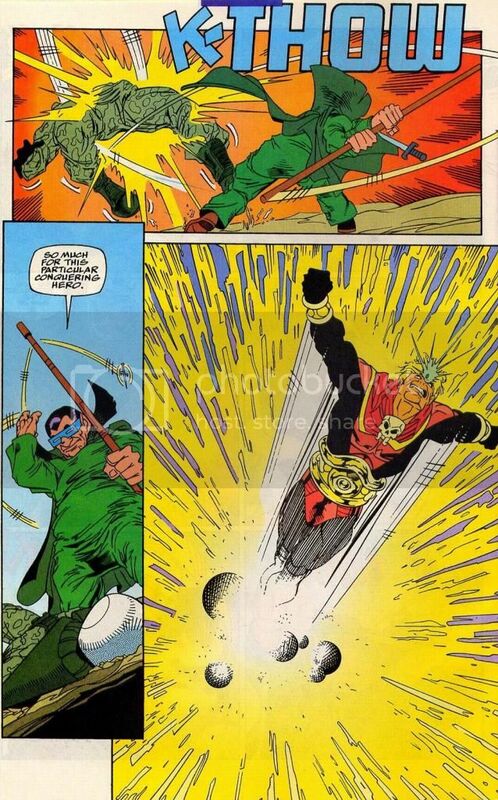 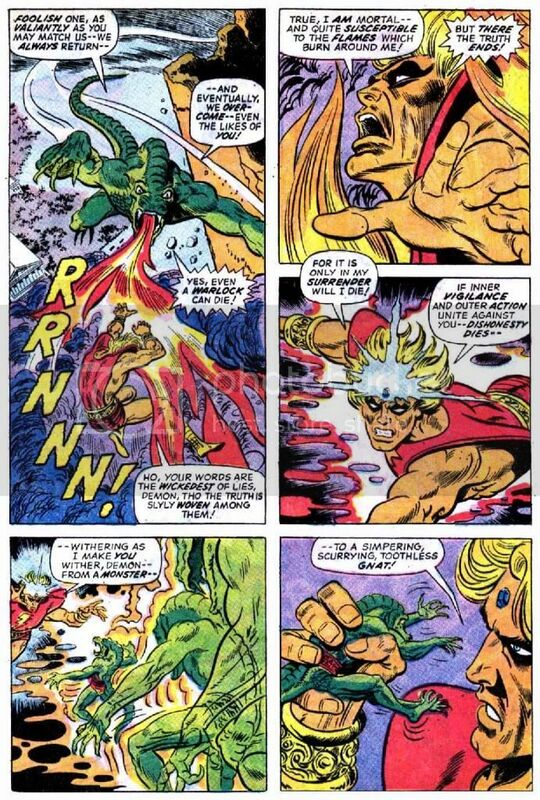 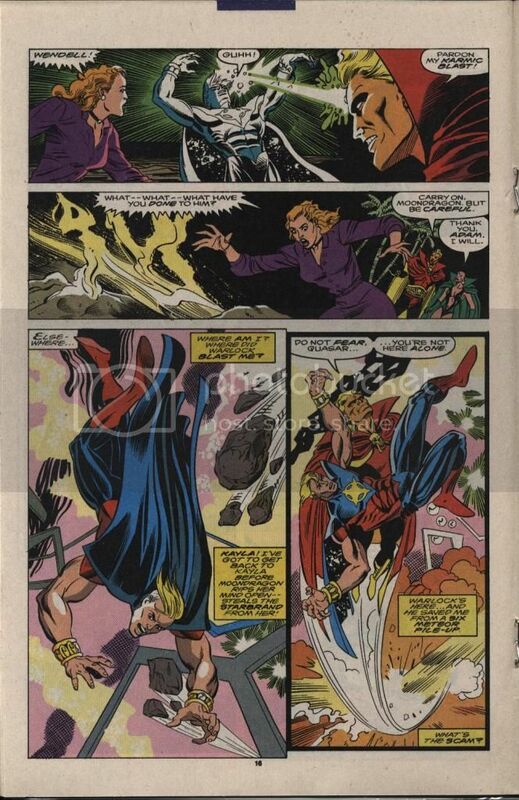 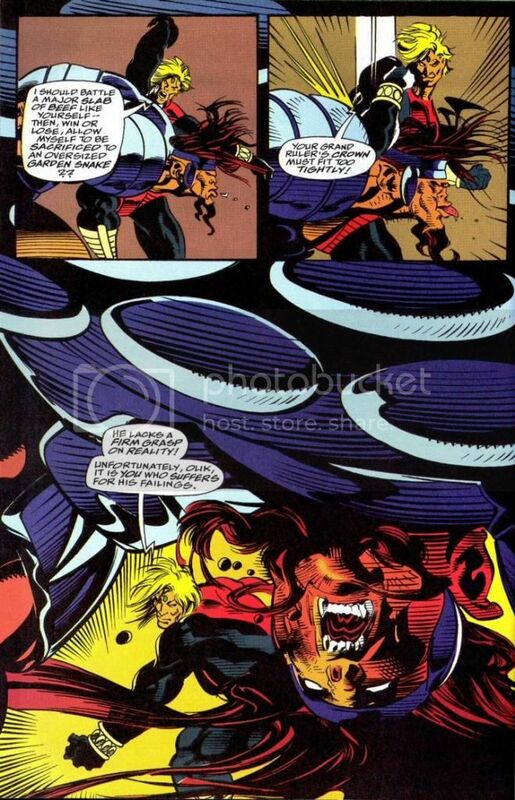 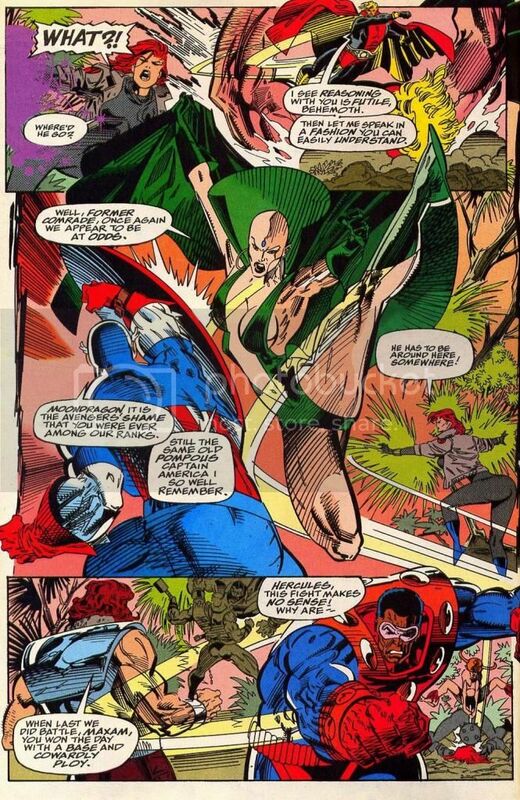 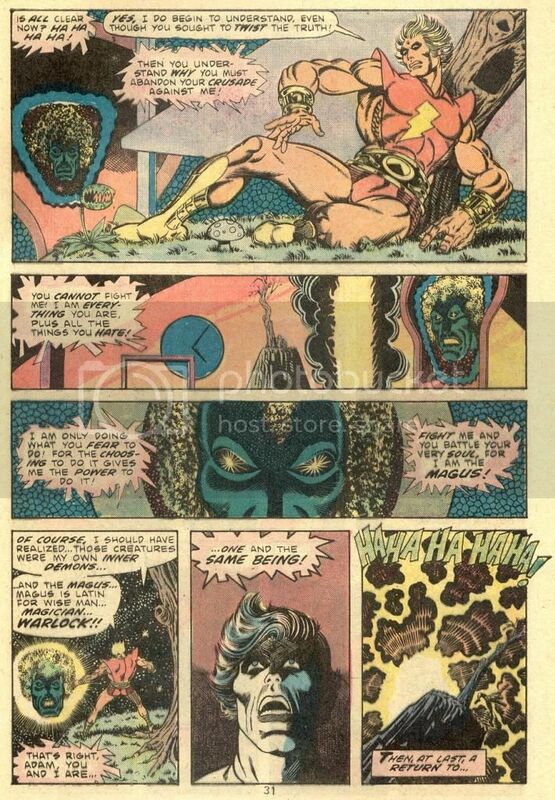 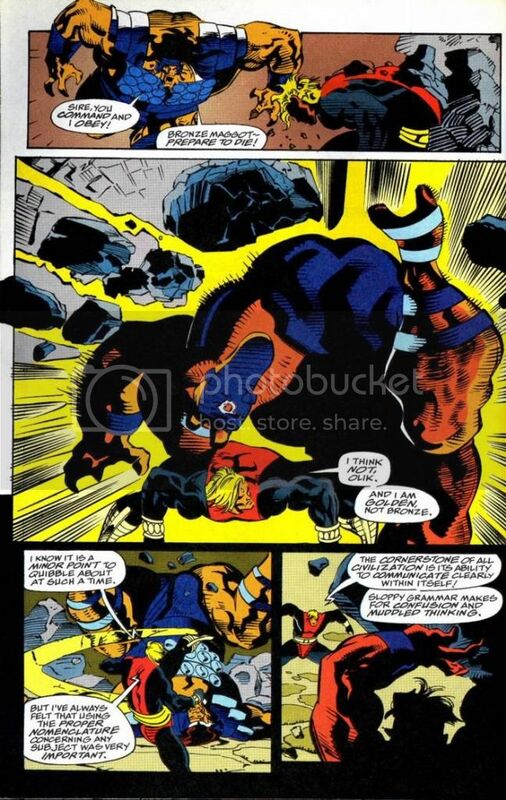 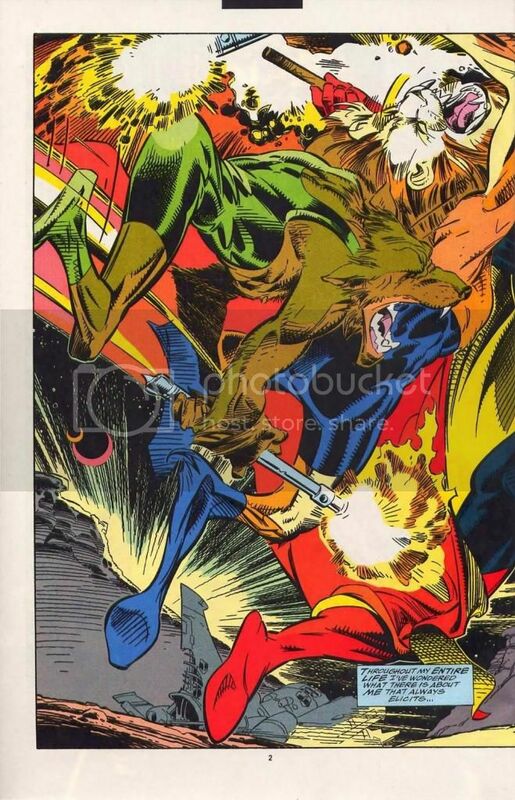 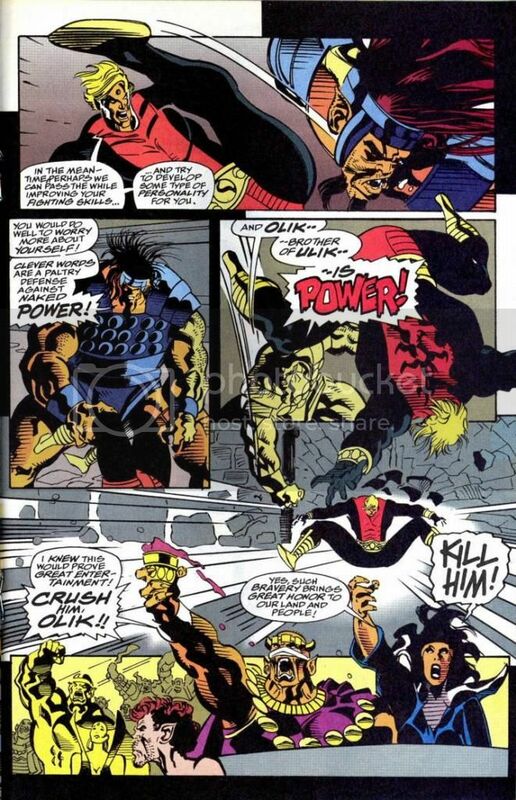 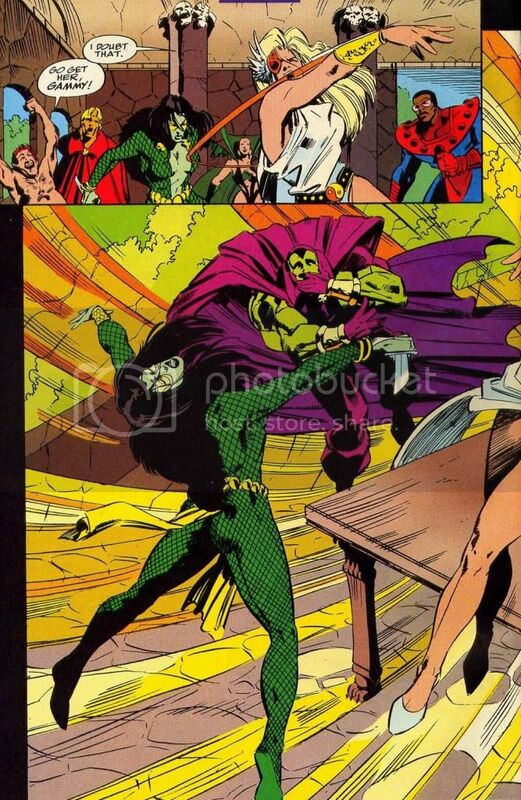 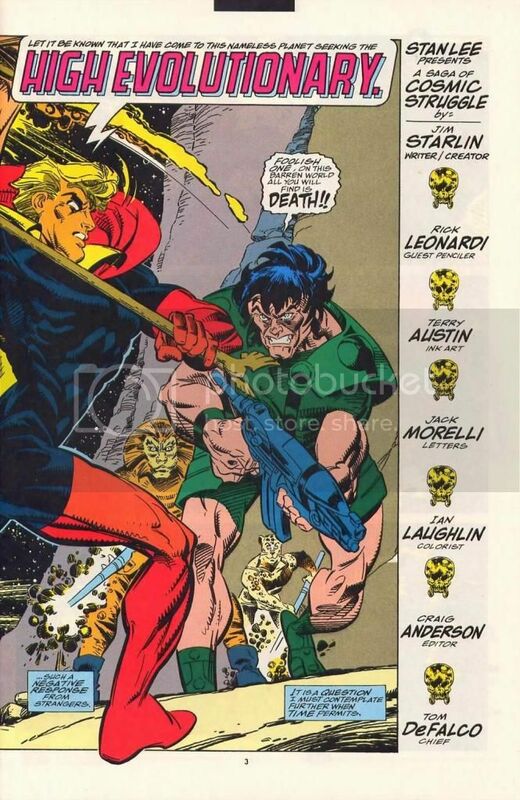 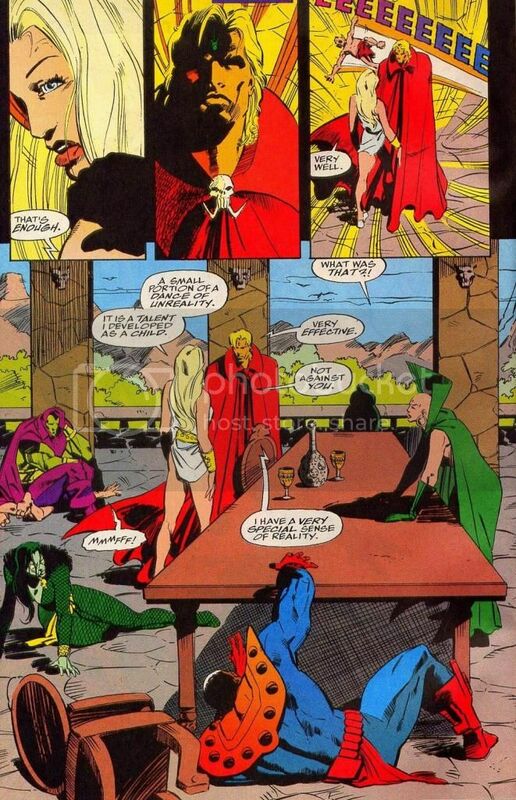 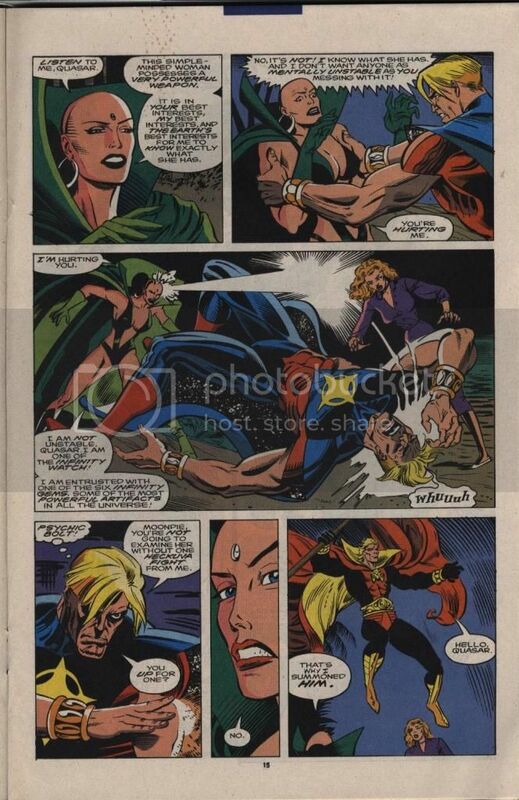 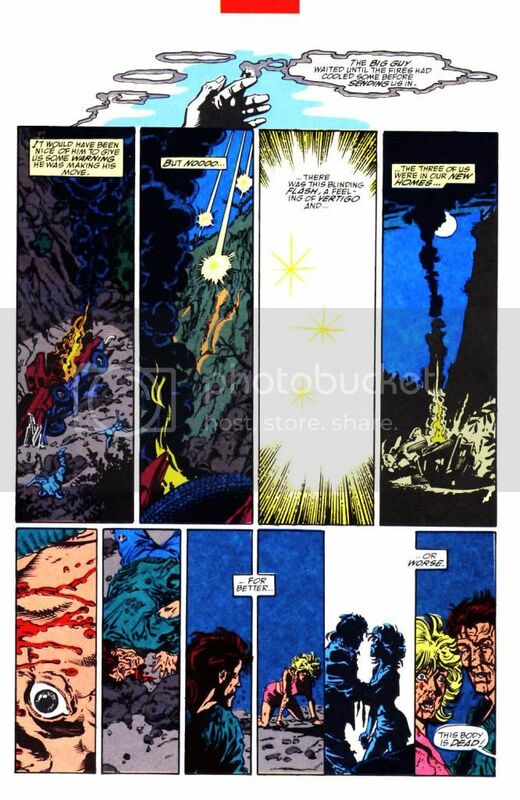 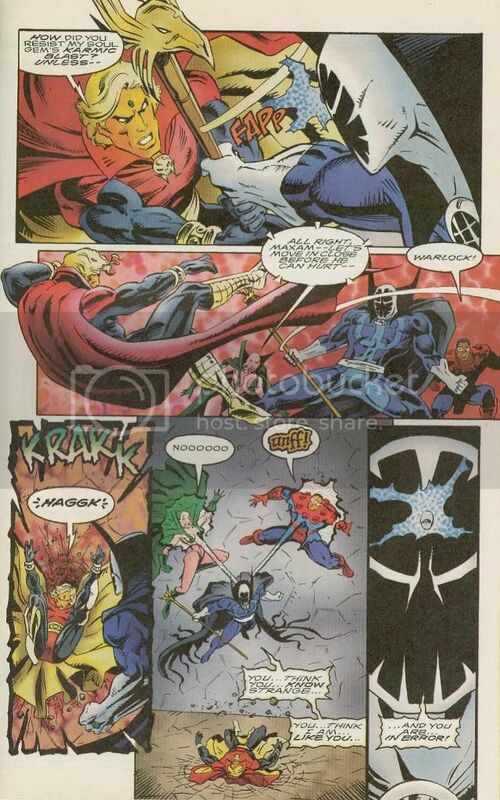 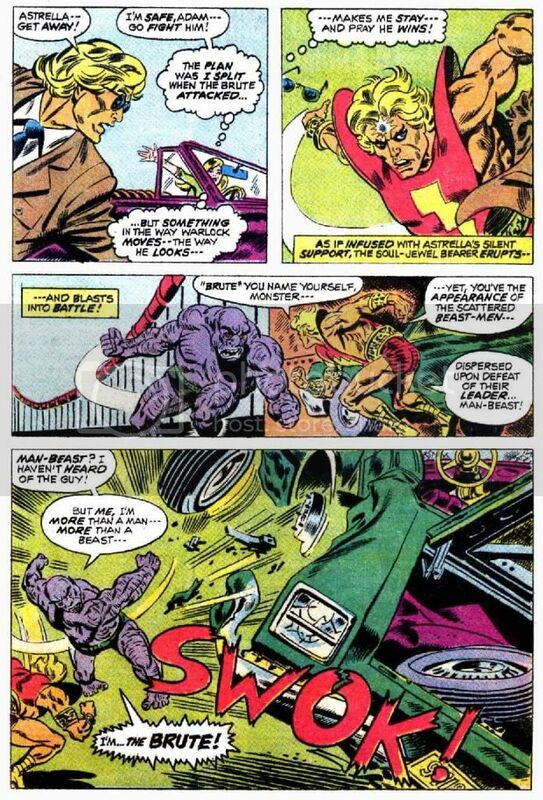 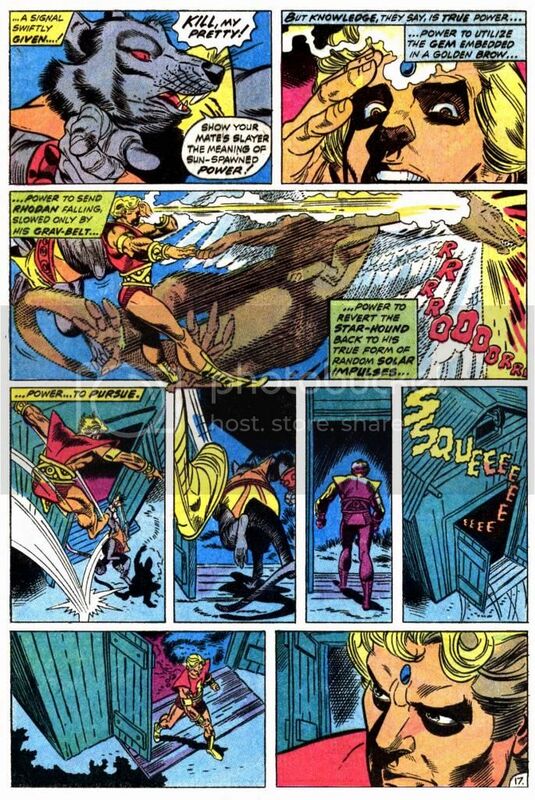 - Warlock defeats the heroes, but it should be noted that Wonder Man’s powers were unstable at the time. 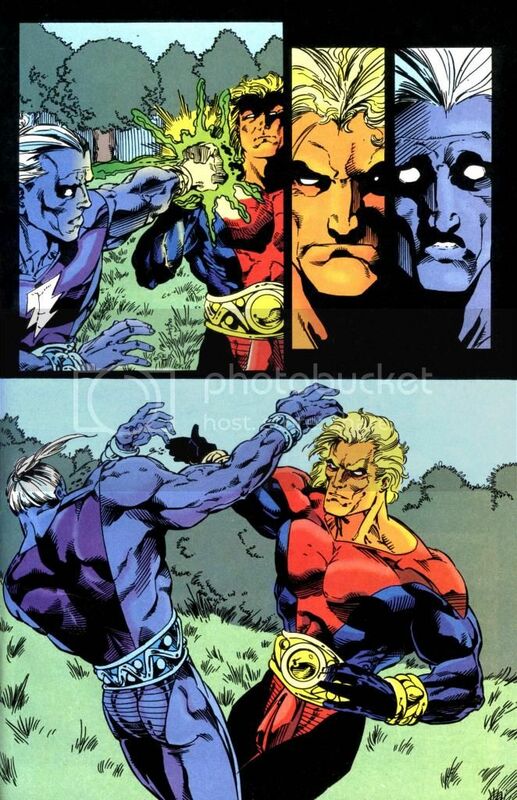 - Fight takes place inside soul world. 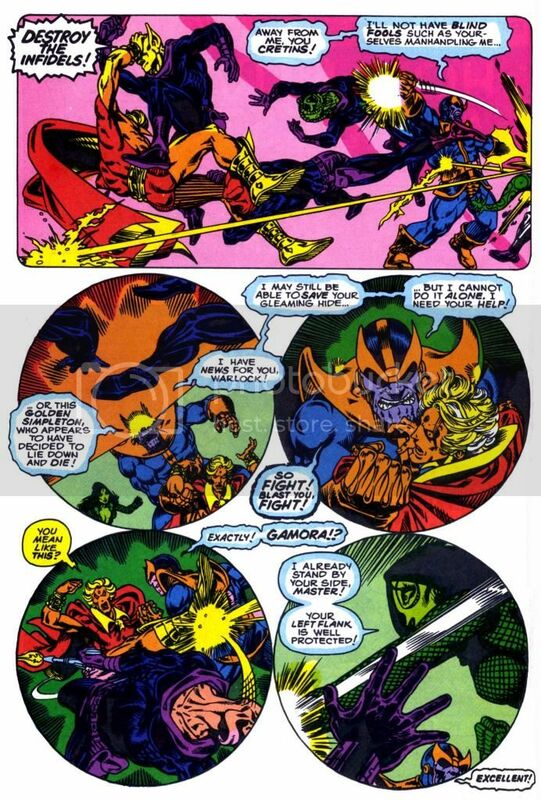 Their physical might seemed to be the same as outside the soul world, but Drax actually forgot he did not need to breathe in the soul world, which allowed Adam to choke him. 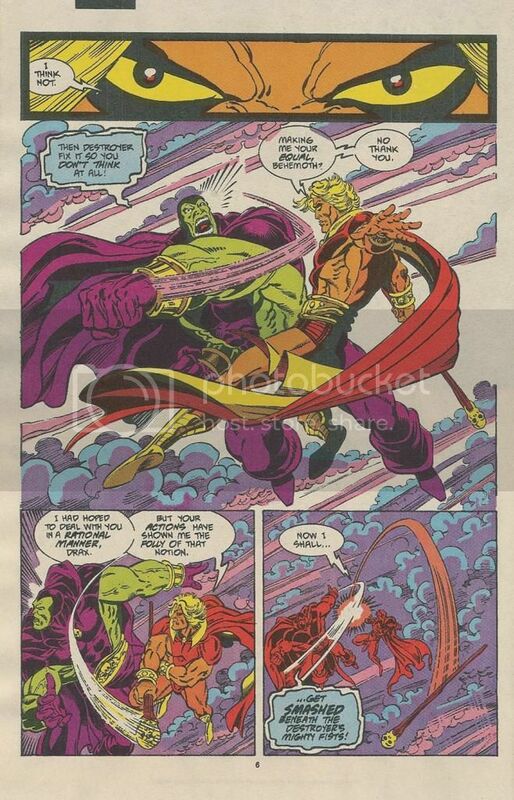 - This version of Drax was intelligent and not as strong as the dumb version, but strong enough to tear apart stars and planets with his bare hands. 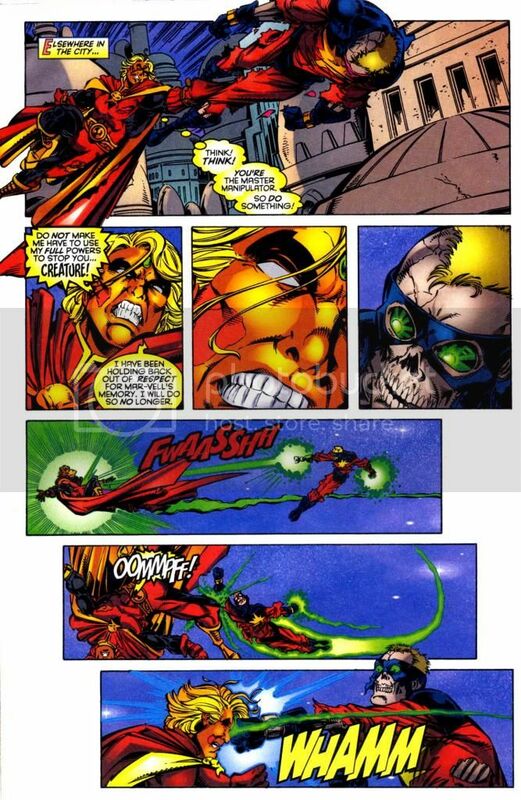 - Uses karmic blast to defeat Maxam again. 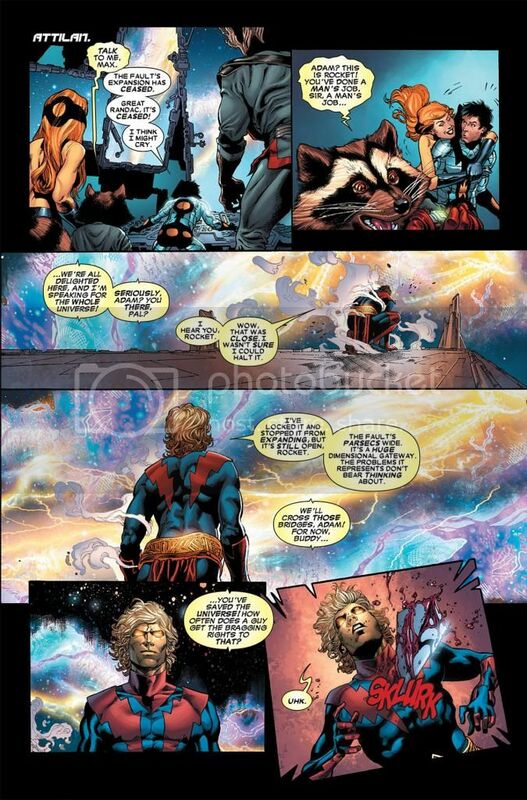 - Adam faked his death at the hands of Star-Lord, as he was newborn and still weakened from stopping the fault before the fight. 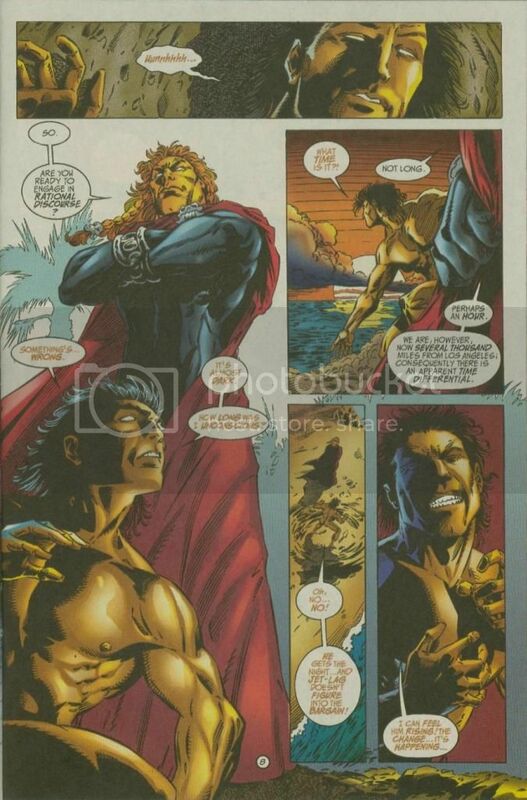 Note: Adam was not killed as he faked his death. 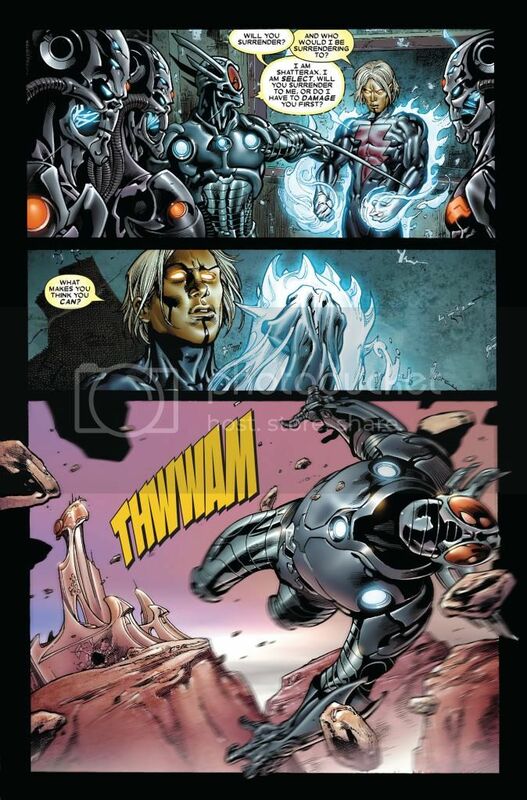 - Adam’s body possessed by Ultron. 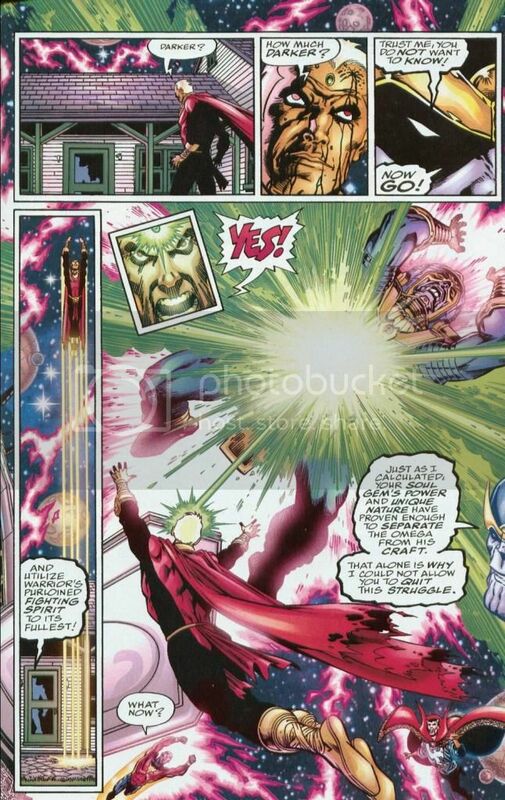 - Takes him down with a karmic blast. 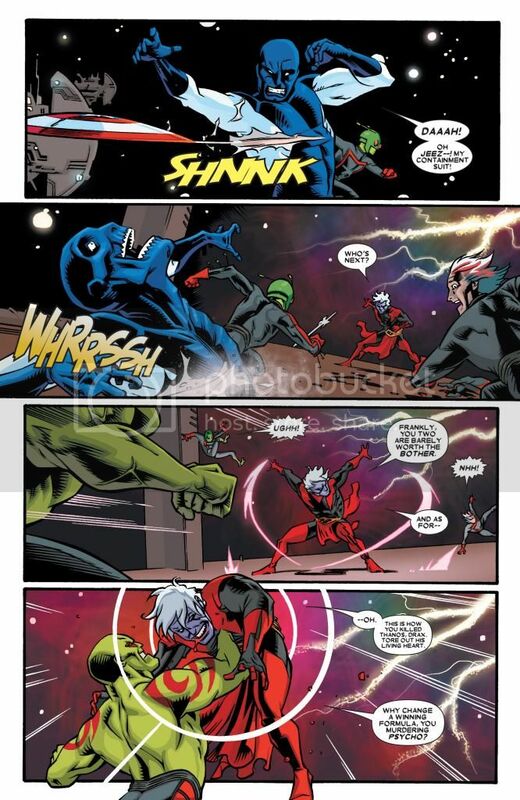 - Punches a whole through Moondragon, heals her and mentally enslaves her. 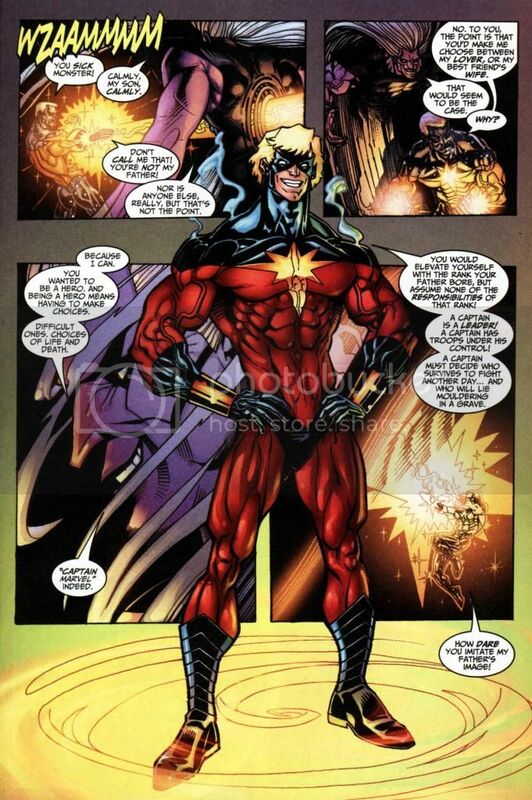 - Mar-Vell resurrected with the Nega-Bands. 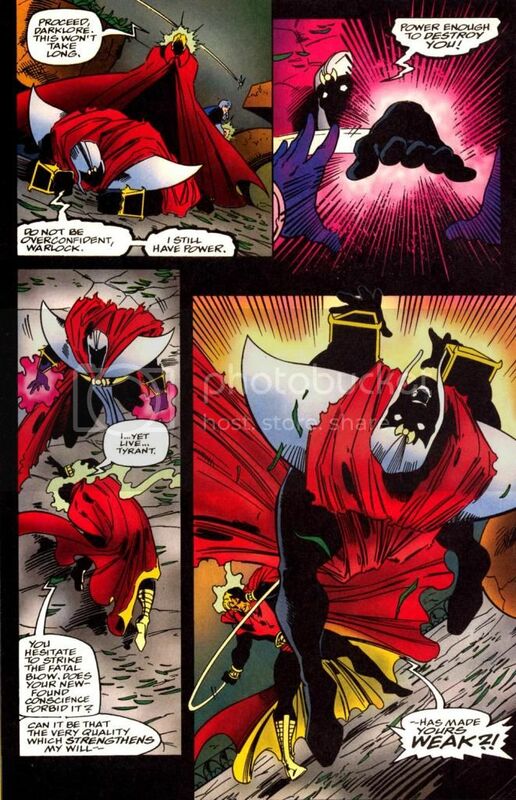 - Magus in the form of a wraith (as he was not a whole being at the time). 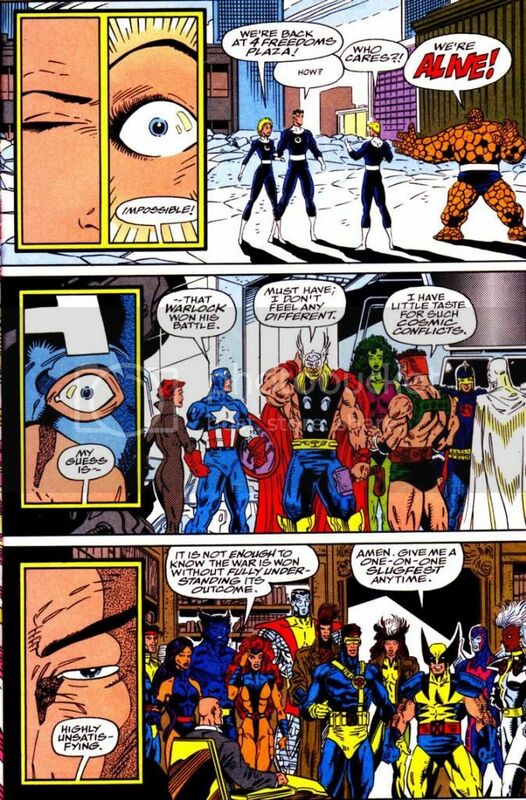 - Black Bolt is mind controlled. 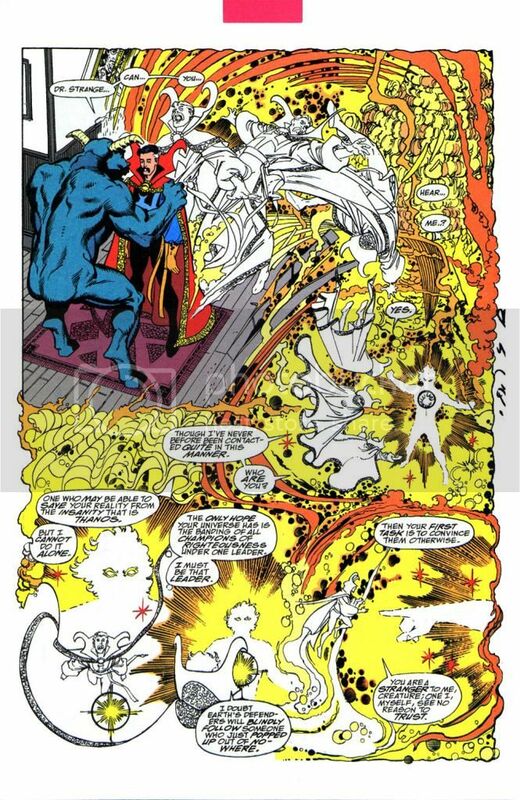 - Strange is a magical construct with magical powers. 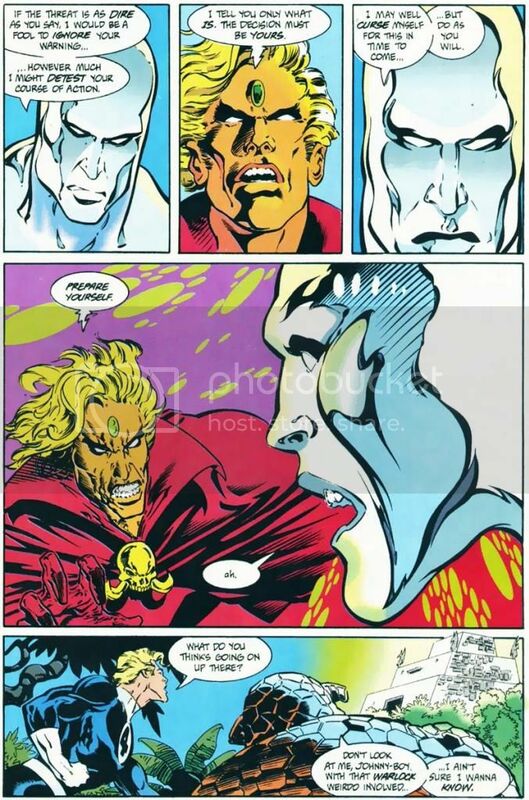 Adam uses the cold light of truth to stop it. 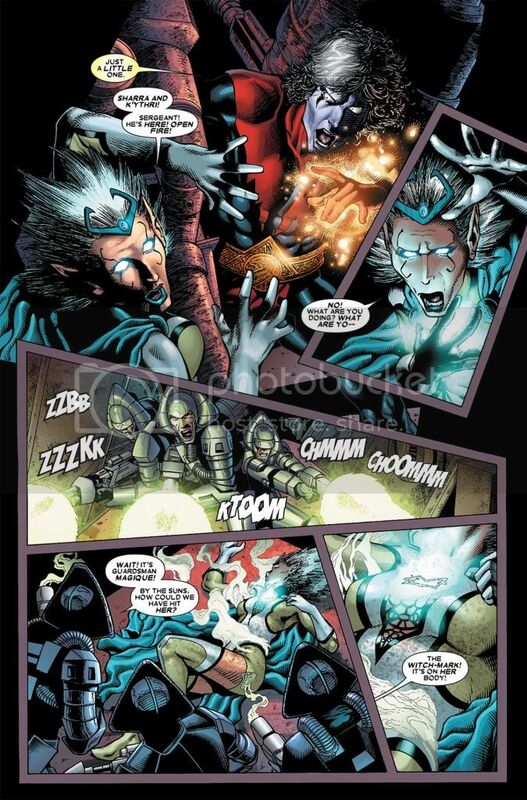 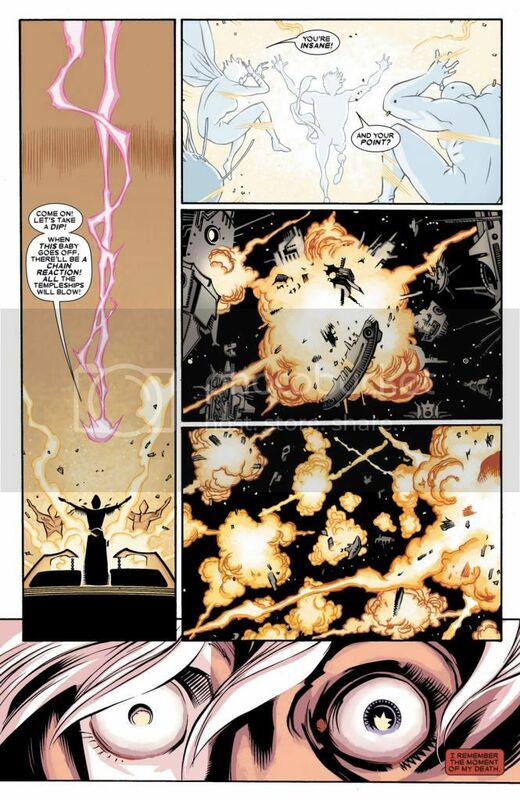 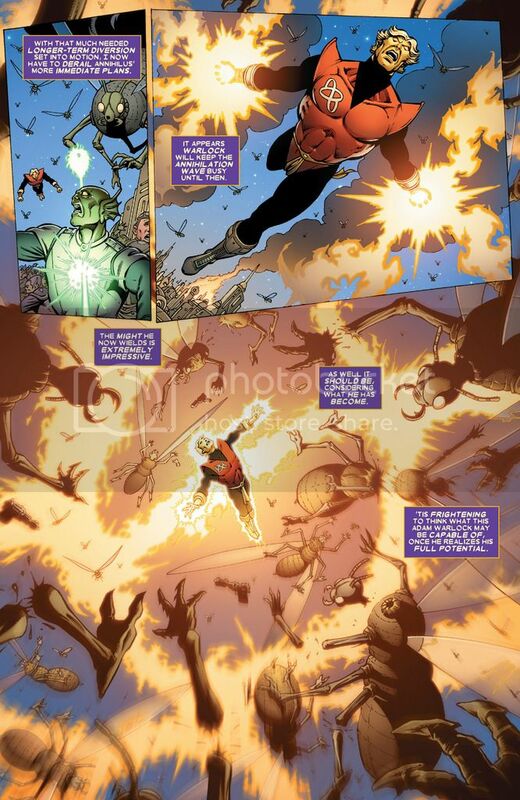 - Is sucker attacked by Vulcan and most of his power drained, but still manages to stun Vulcan for long enough to fight off the Imperial Guard, recharge himself and teleport away. 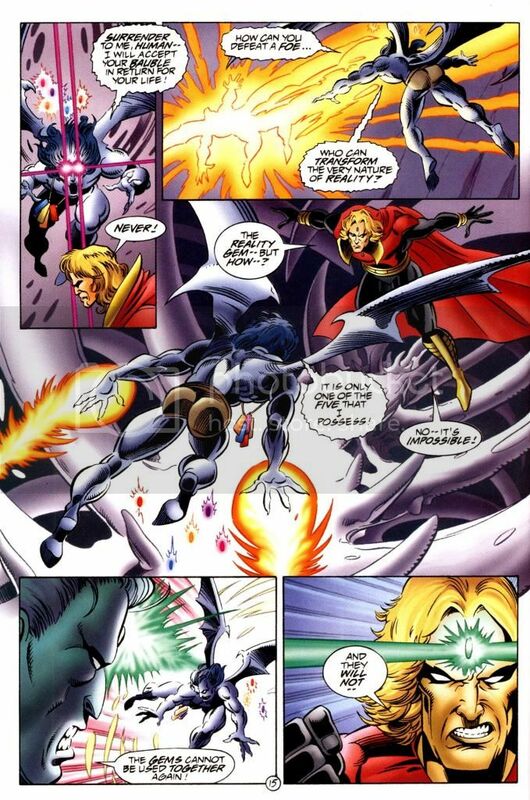 - Defeats Magique with a clever and difficult spell. 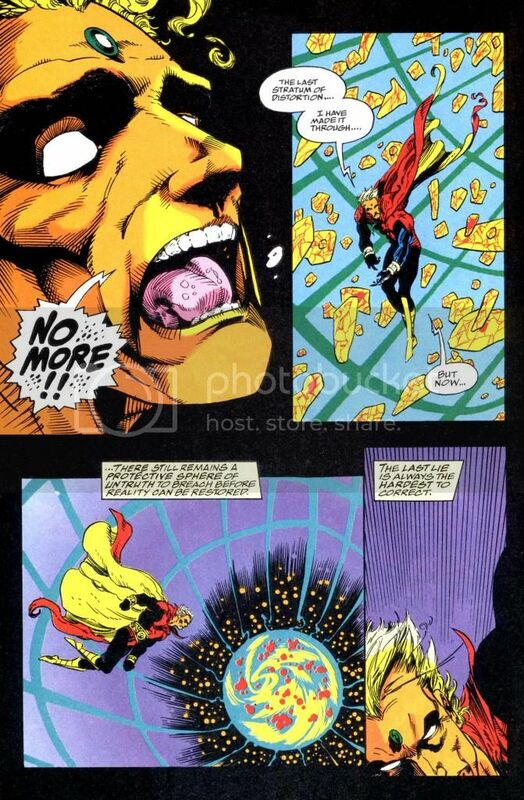 - Holds his own until his new powers act up and betray him. 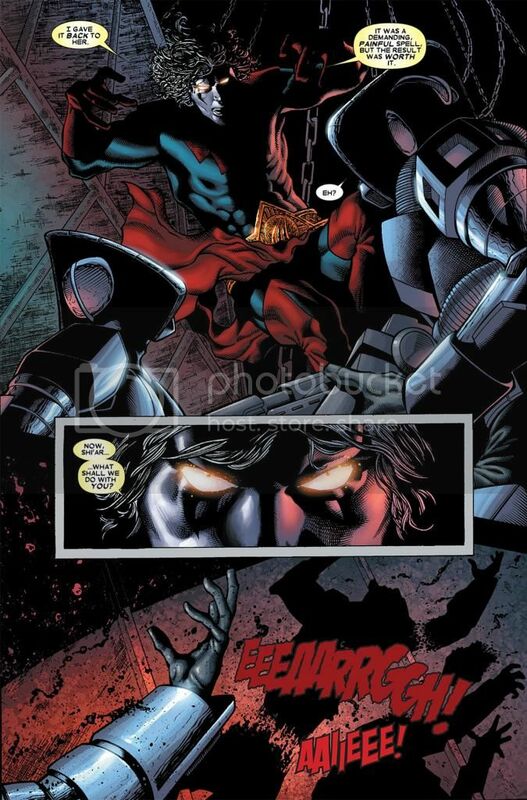 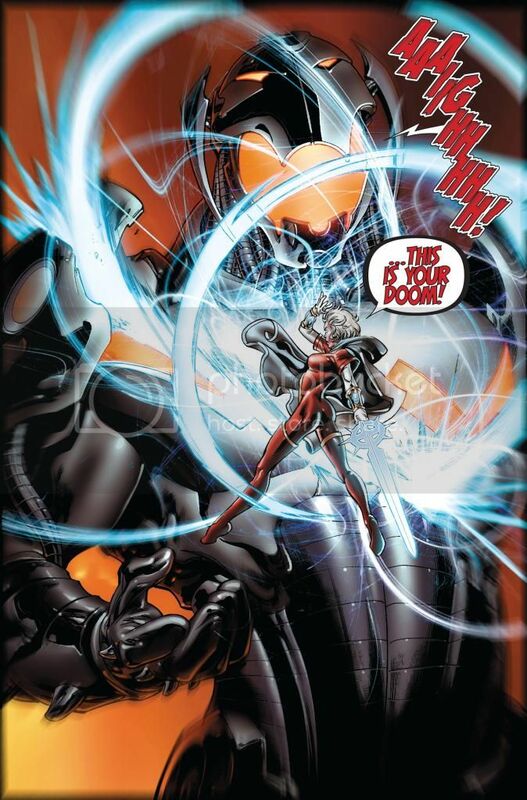 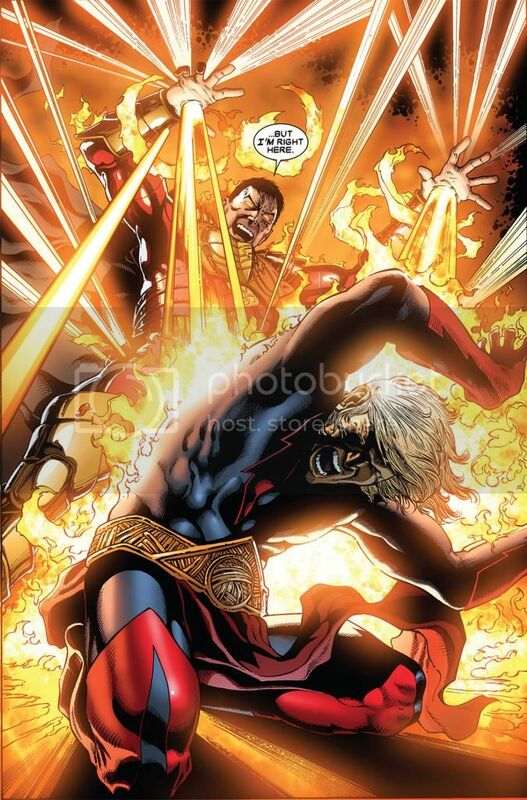 - Along with Phyla-Vell defeats Ultron. 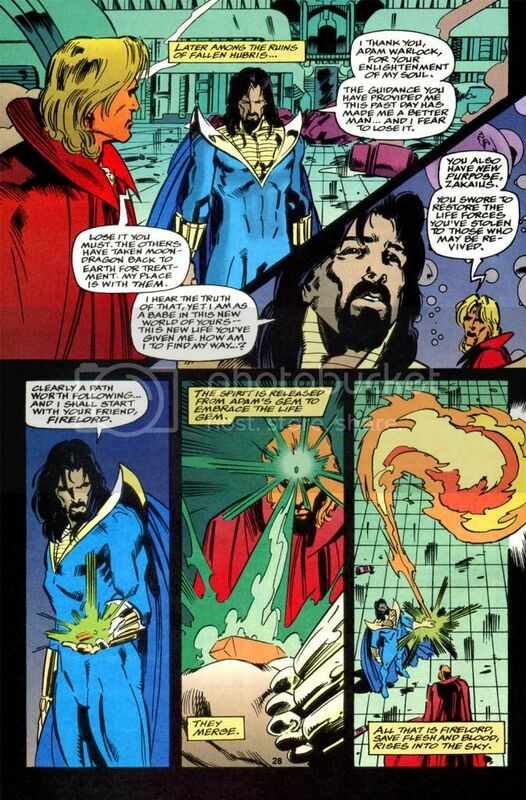 - Warlock notes that he would have defeated the two individually, but together they were overwhelming. 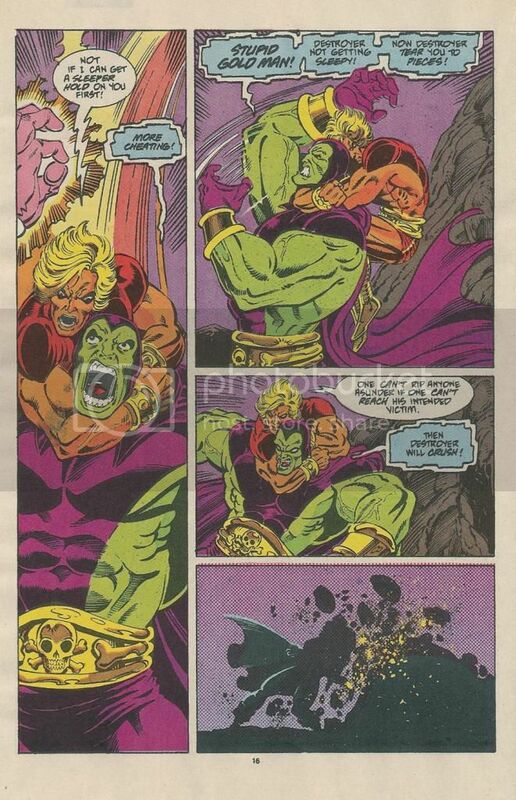 Warlock then goes on to defeat Warrior by absorbing his soul. 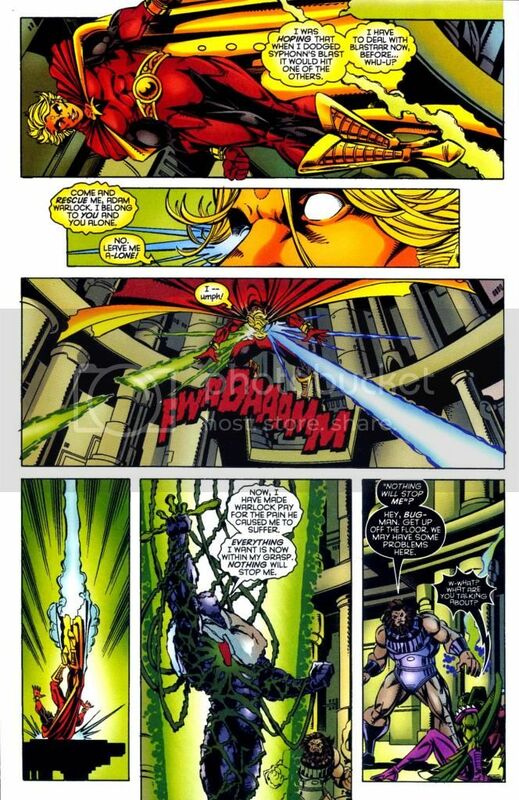 - Along with Genis-Vell, Dr. 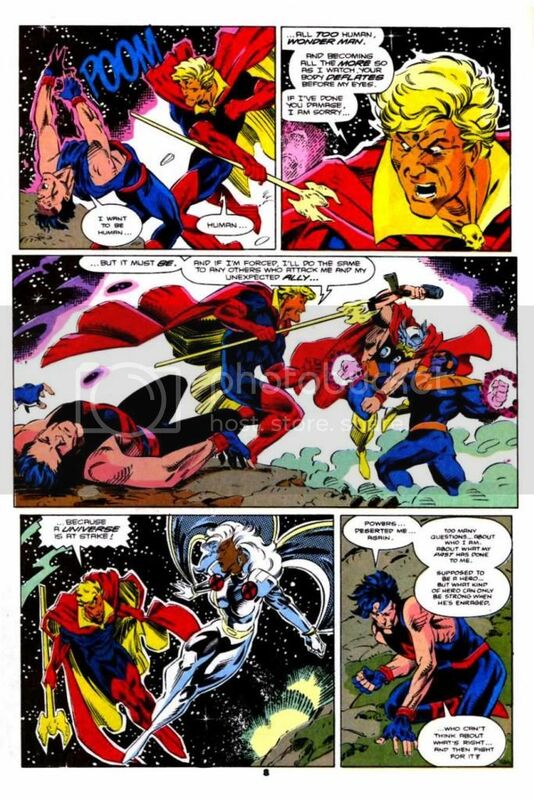 Strange and others helps defeat Omega. 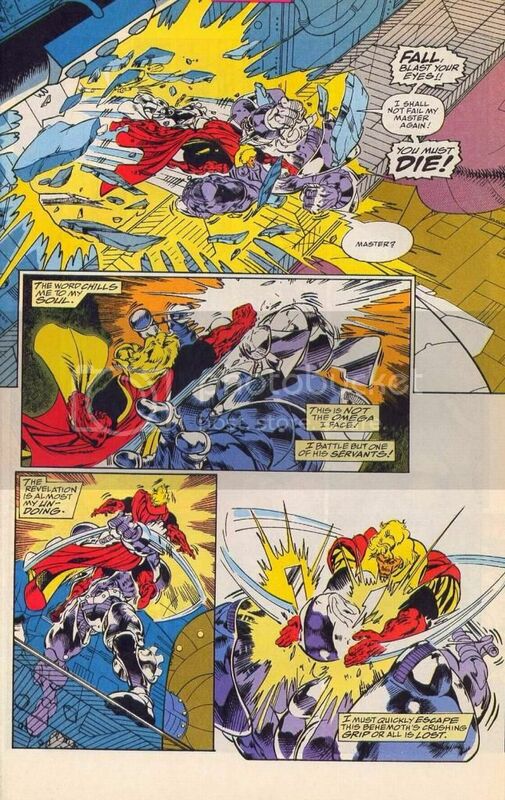 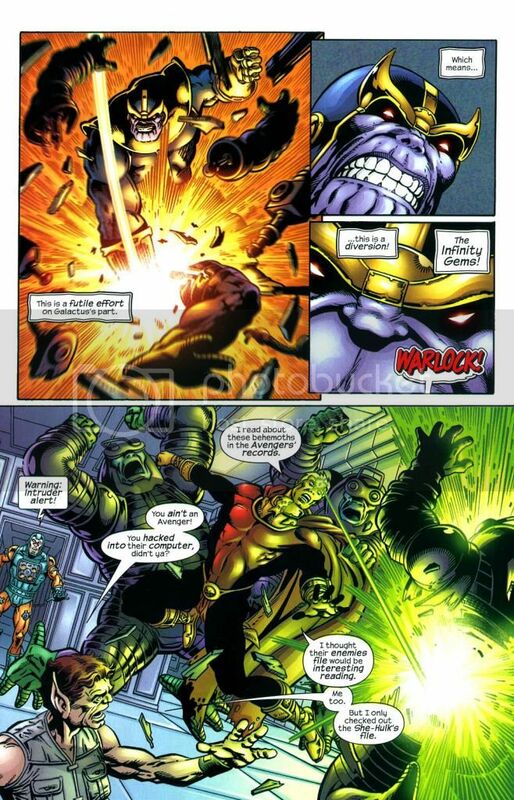 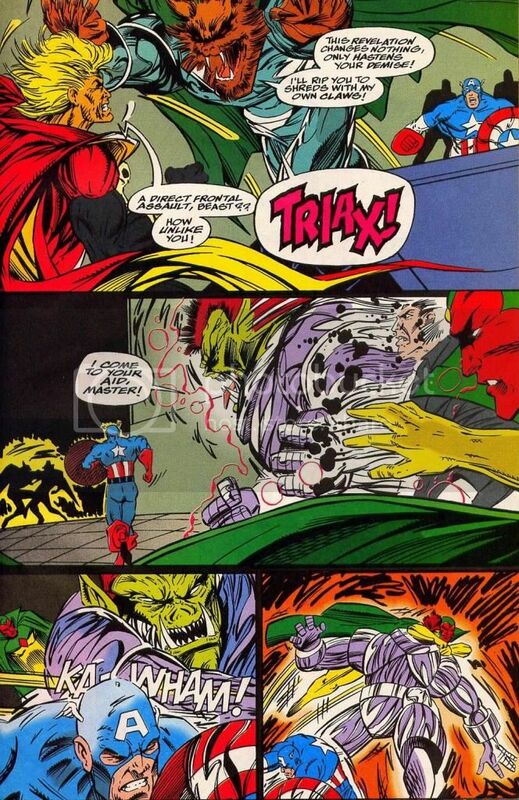 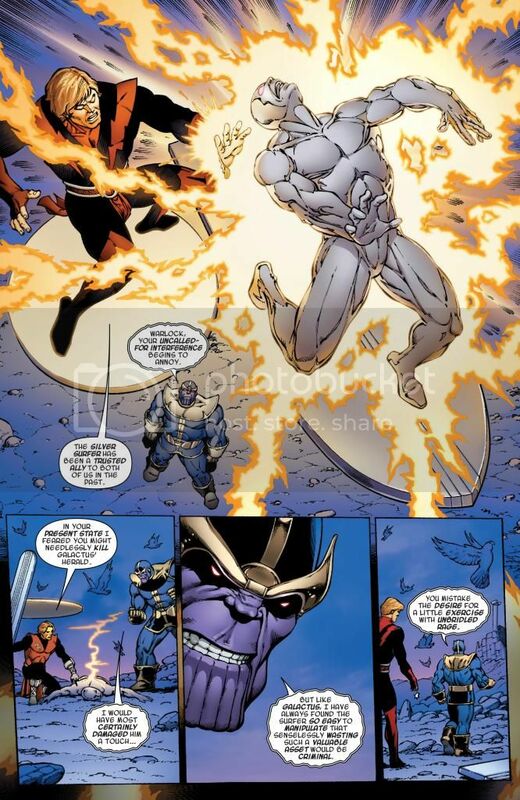 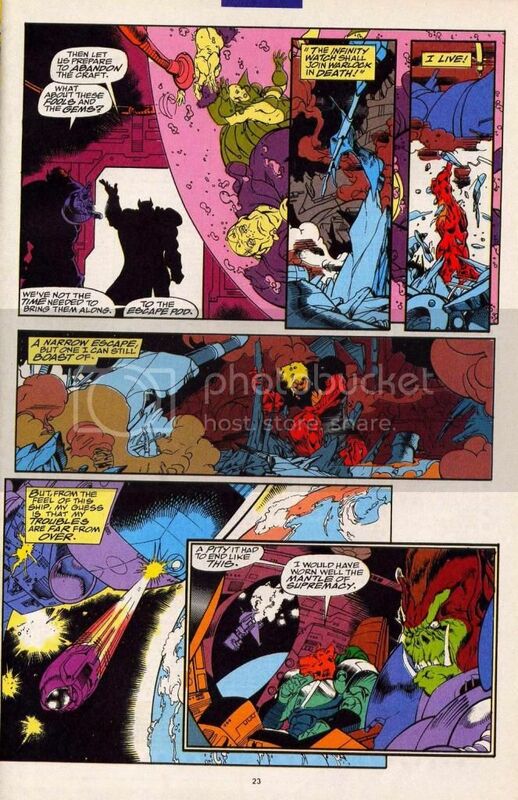 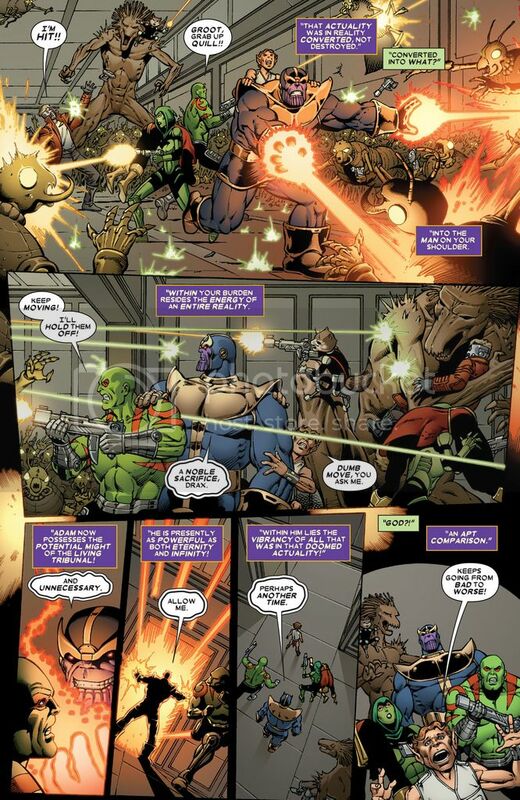 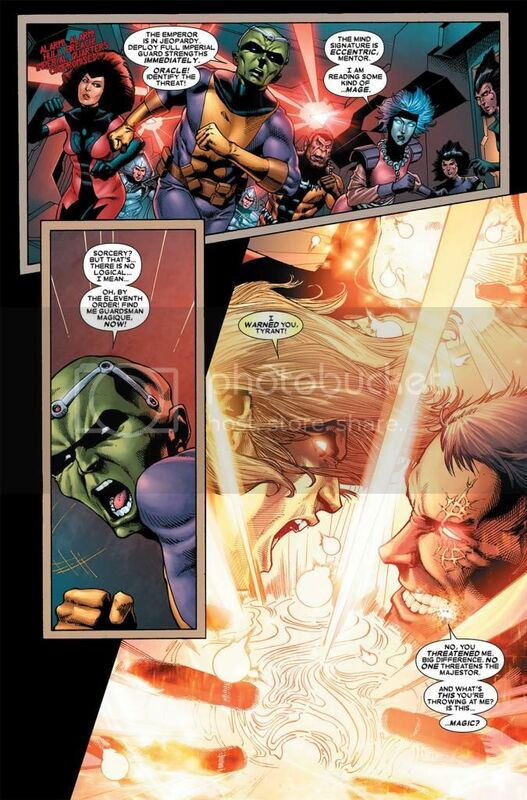 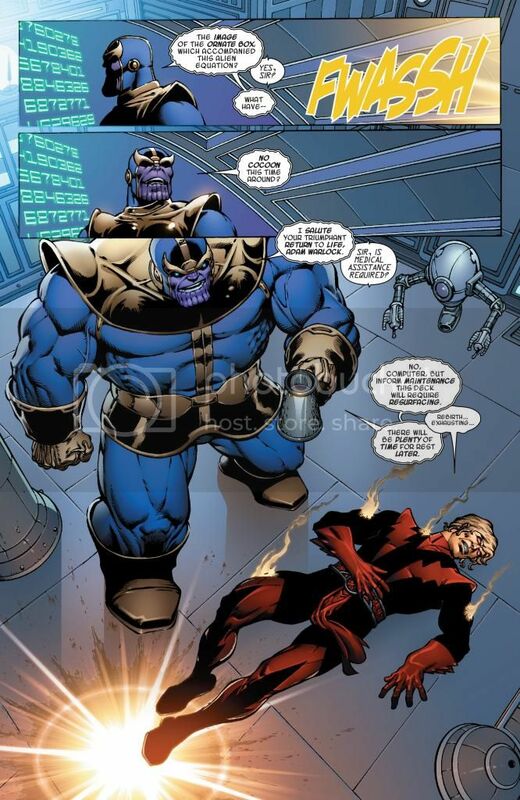 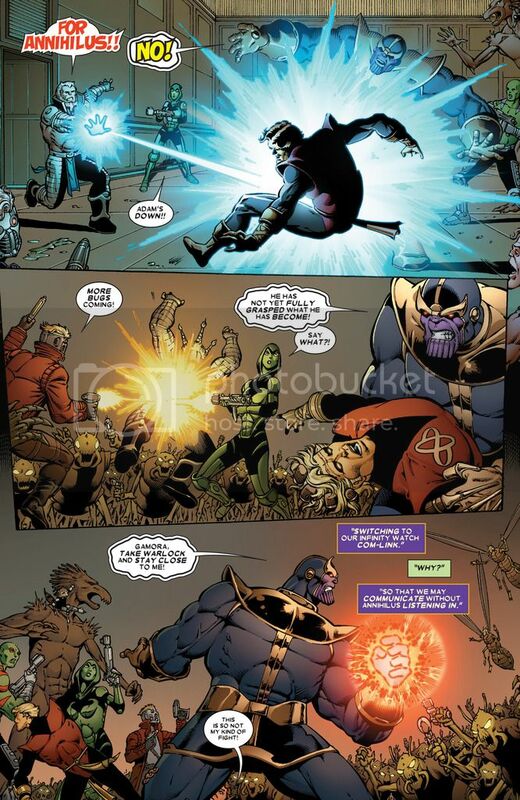 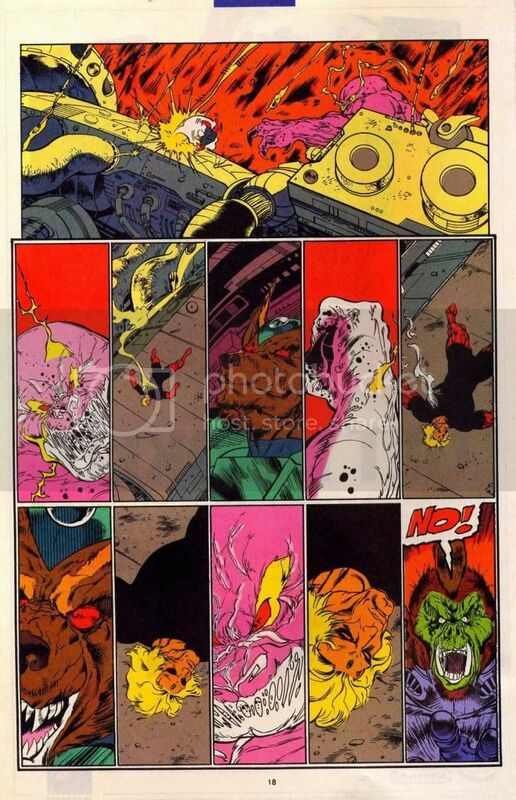 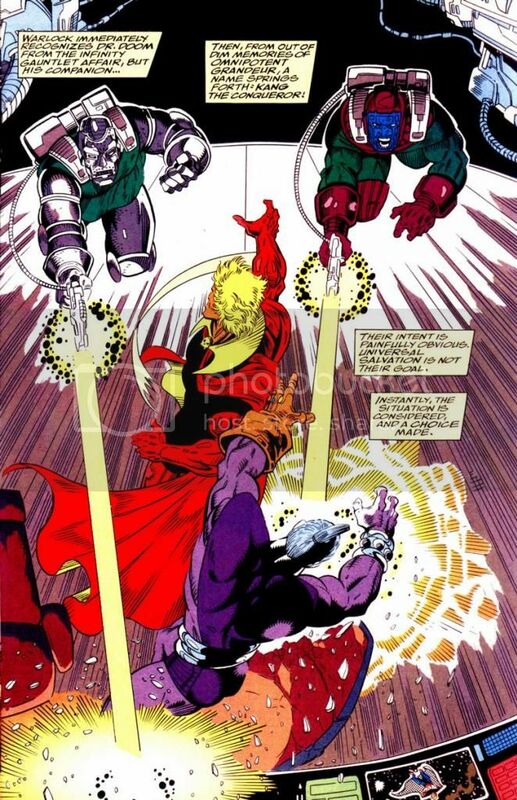 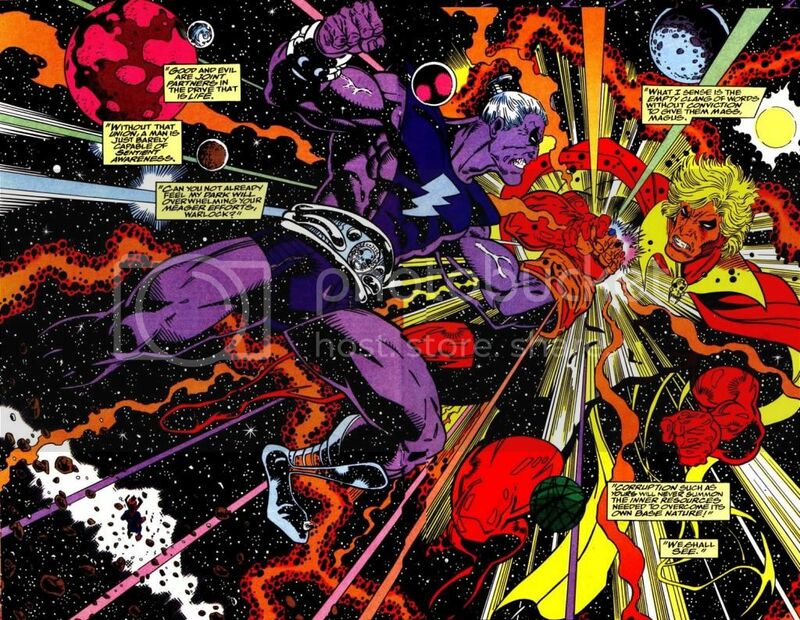 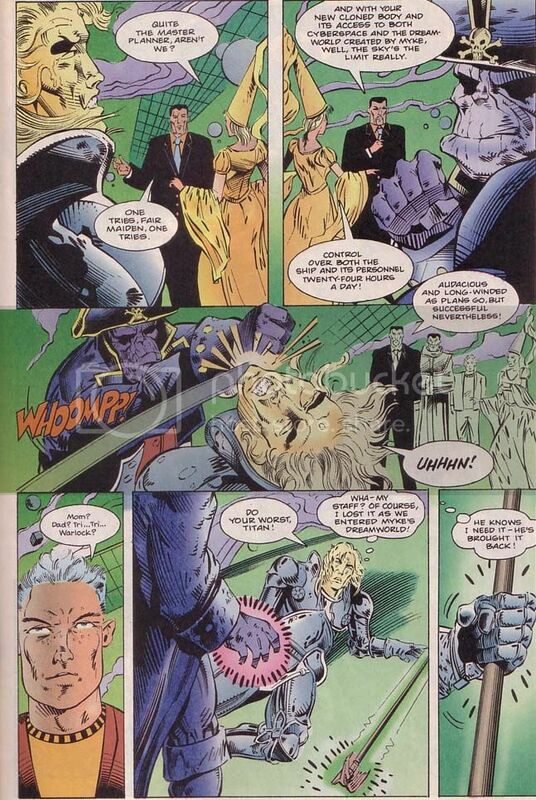 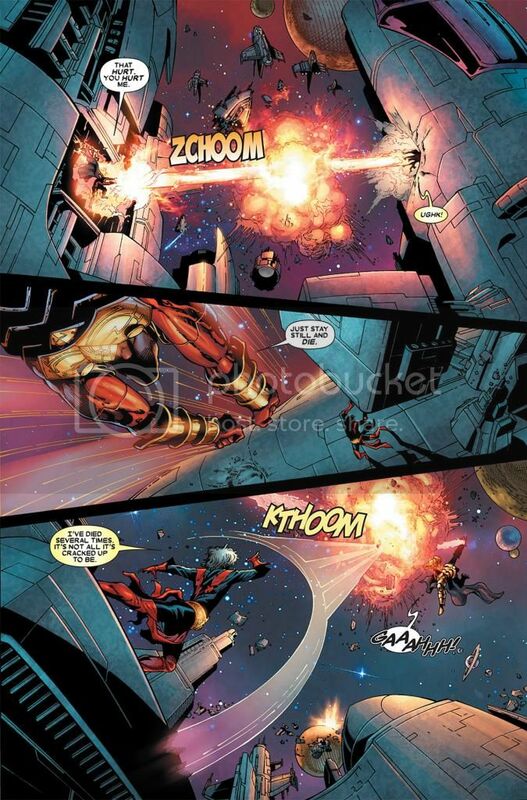 - Warlock defeats an alternate Thanos, but it seems that Thanos agreed that it had to be done. 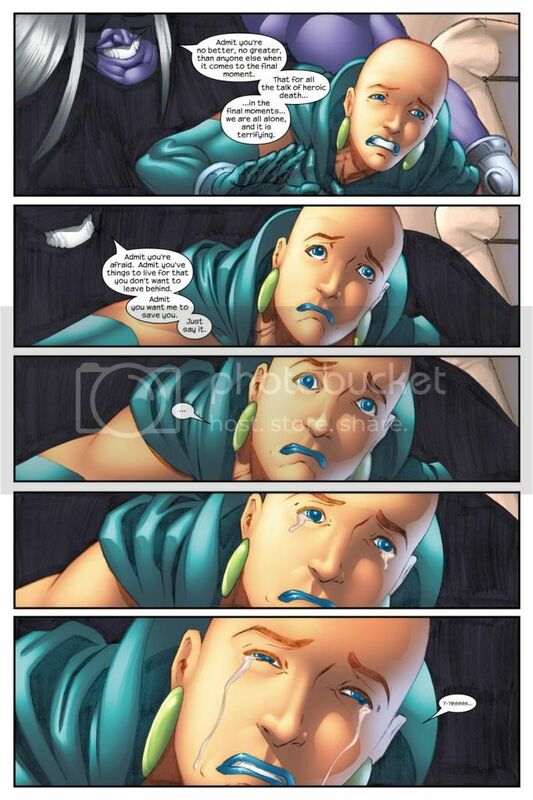 Very ambigious and unquantifiable. 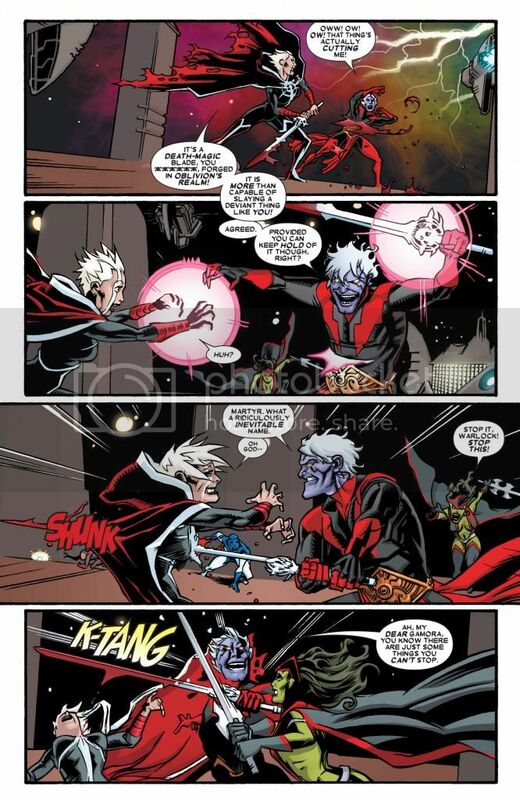 - future Magus fights Thanos. 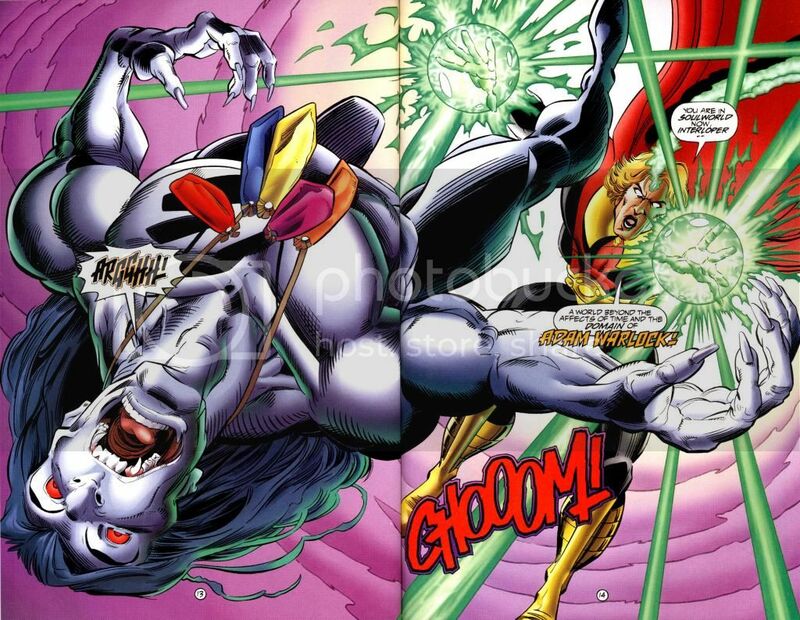 - Takes out Champion with an attack from the soul gem. 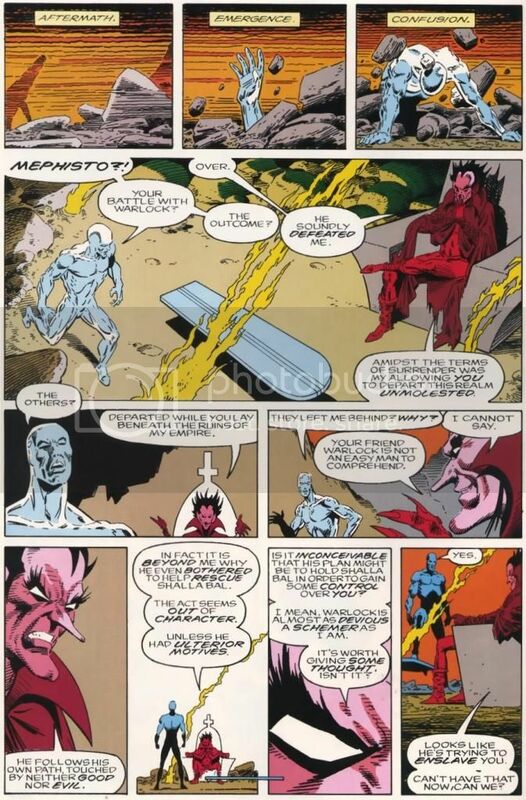 - Fight takes place in Mephisto’s realm where his power is supposedly supreme. 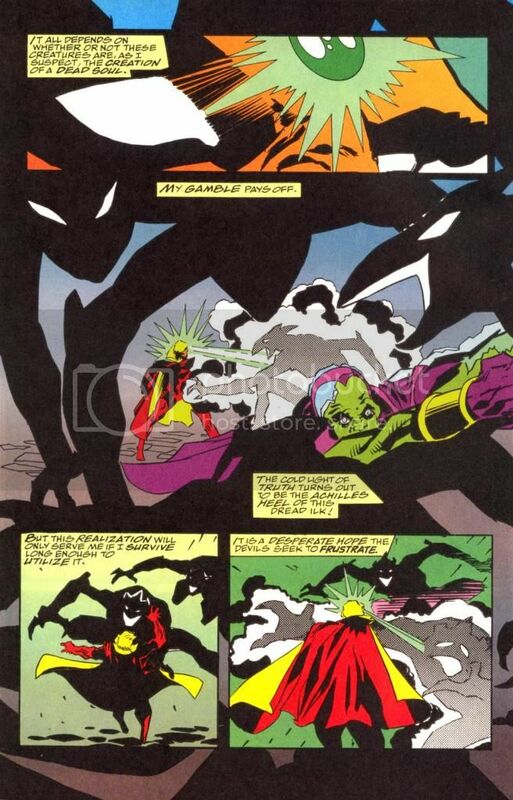 - Fight takes place in Abyss’ realm where his power is supposedly supreme. 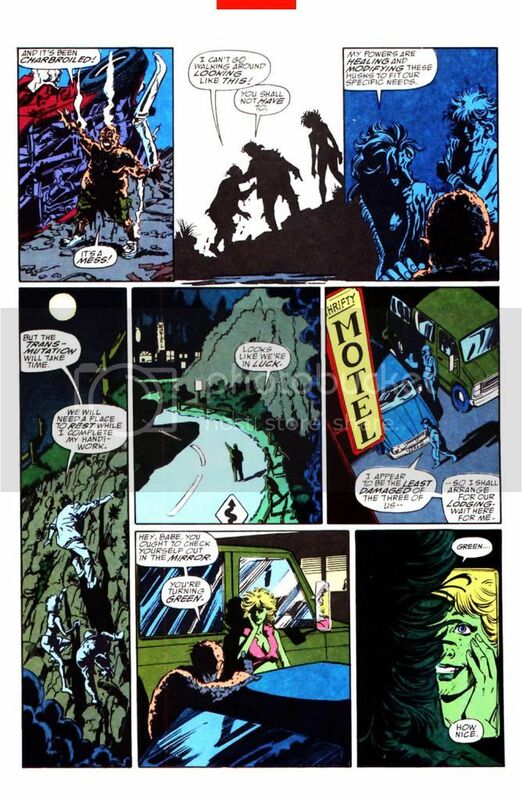 - After losing to Stranger the first time around, he and the Gardener manage to drive Stranger away. 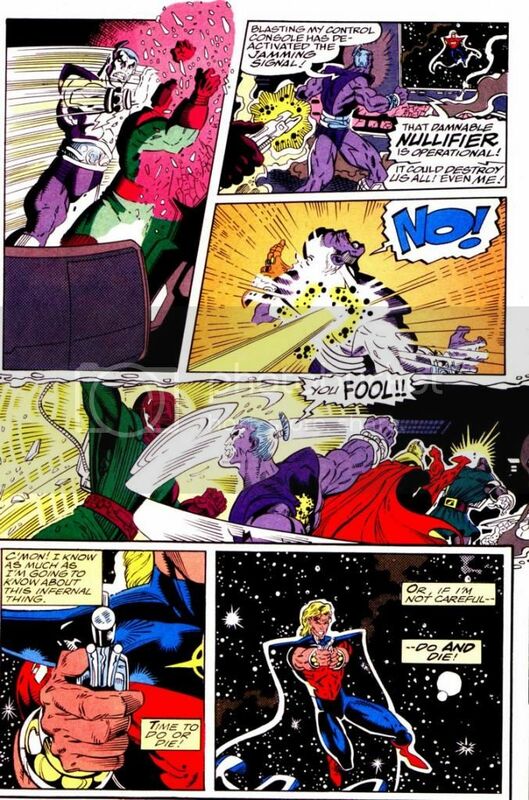 - Star-Thief is a being of enormous mental power, capable of effortlessly snuffing out stars. 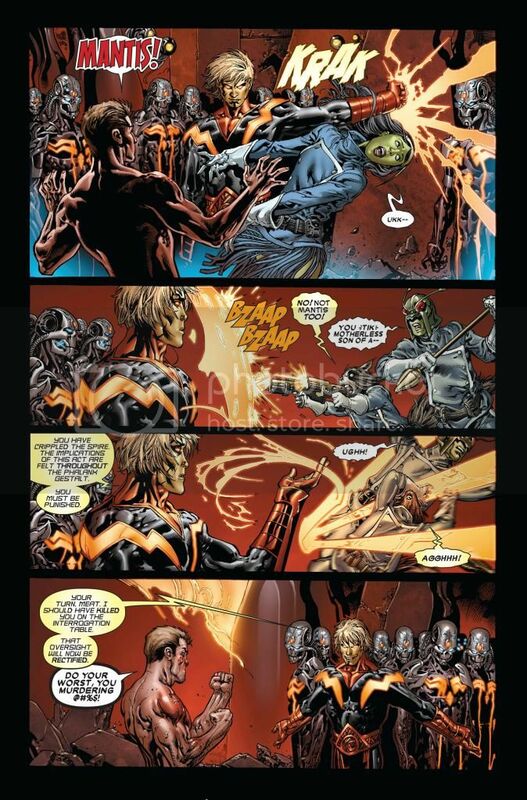 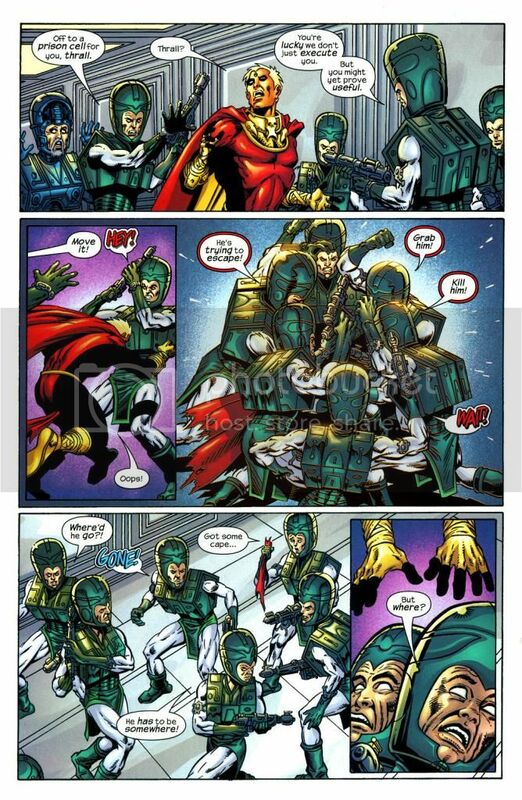 - Shatterax is a Kree cyborg warrior that has fought Iron Man to an inconclusive stalemate in the past. 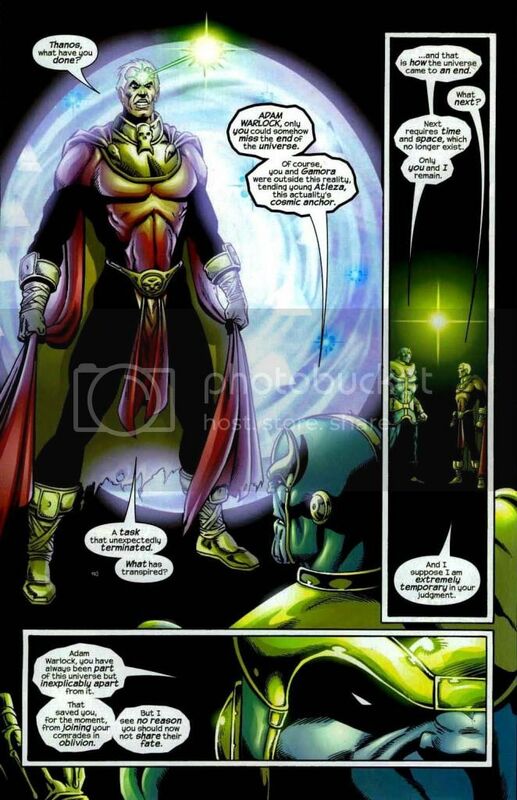 - Syphonn is a Negative Zone ruler with cosmic powers who at the time possessed the Conqueror Wheel which gave him the powerful energies to invade the posi-verse. 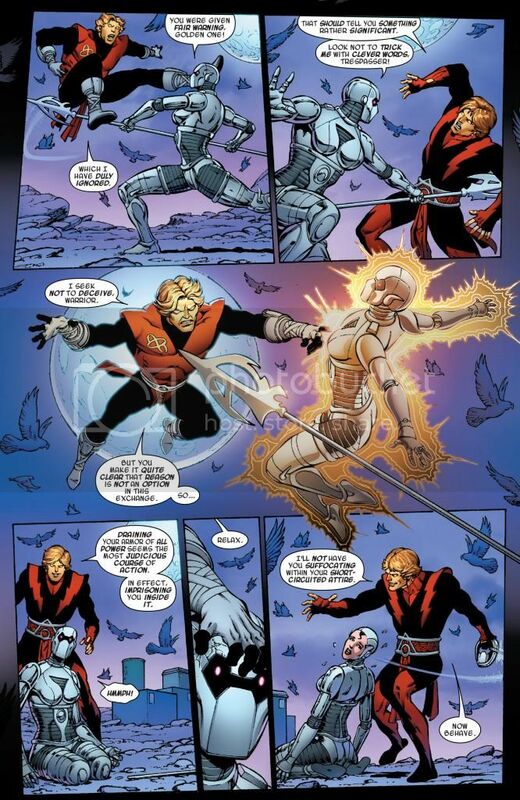 - High Evolutionary manages evade having his soul sucked out by applying a precaution in his armor. 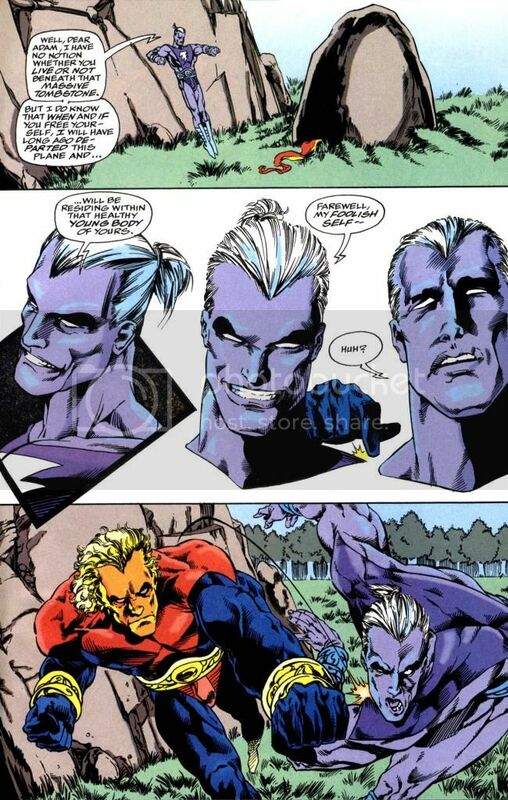 - Gemini is a being that was stated to be similar in power to when Adam was born as Him. 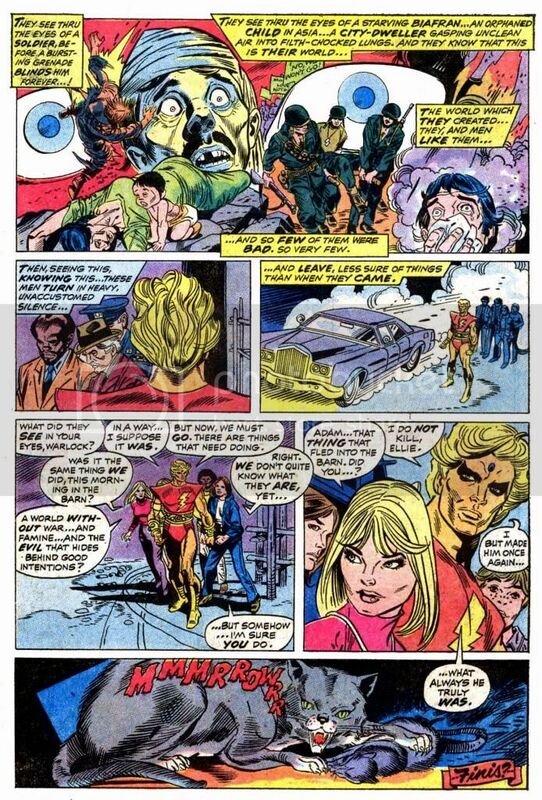 - Borgia is a member of the same race as the class 100 Blood Brothers. 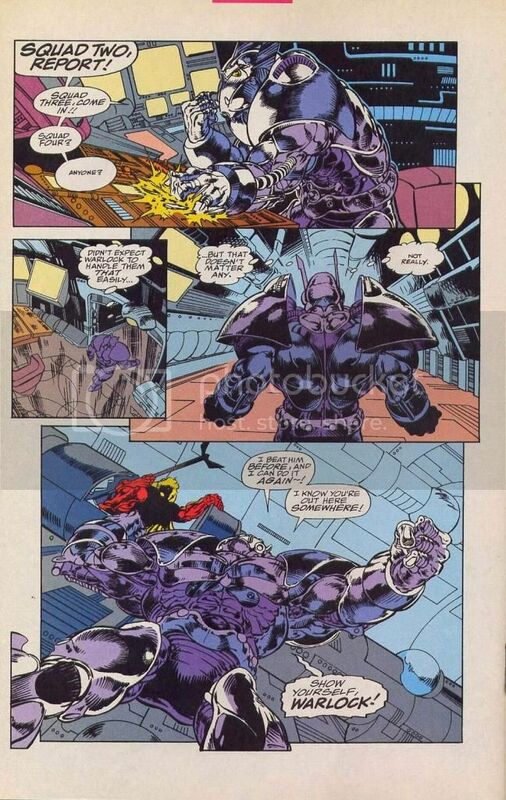 - The Brute is shown and supposed to be approximately class 100. 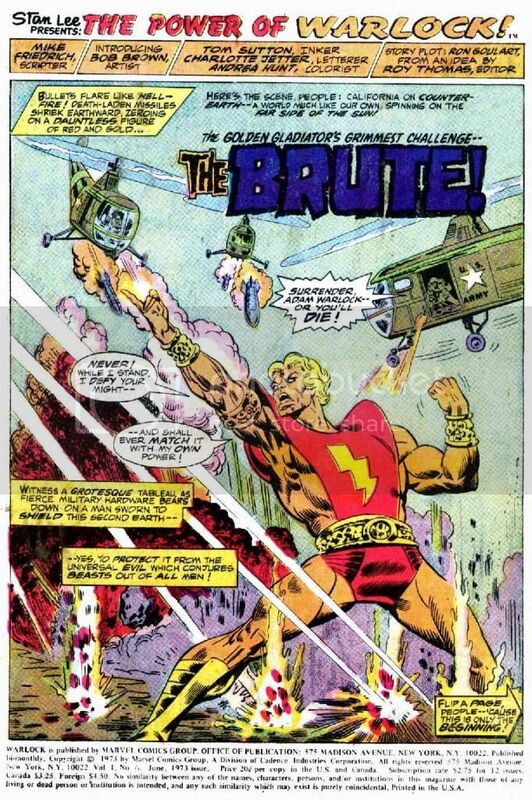 - The Brute’s power has increased over tenfold. 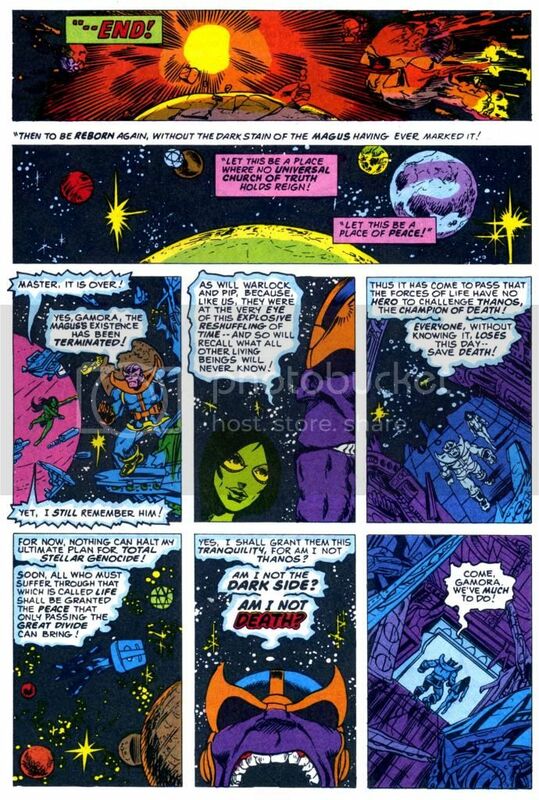 - Along with the Guardians of the Galaxy drives the creature away. 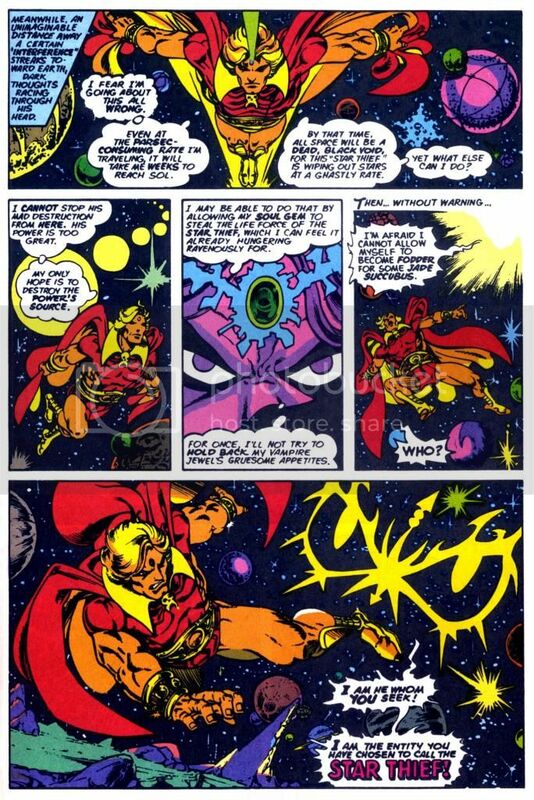 - The Infinity Thrall was a being composed of the harnessed energies of 4 Infinity Gems combined and controlled by the Man-Beast. 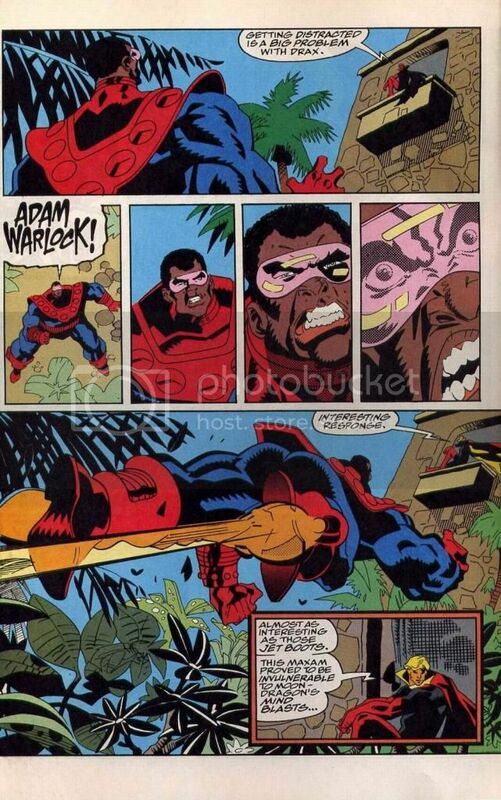 Adam defeats it via brilliant tactics. 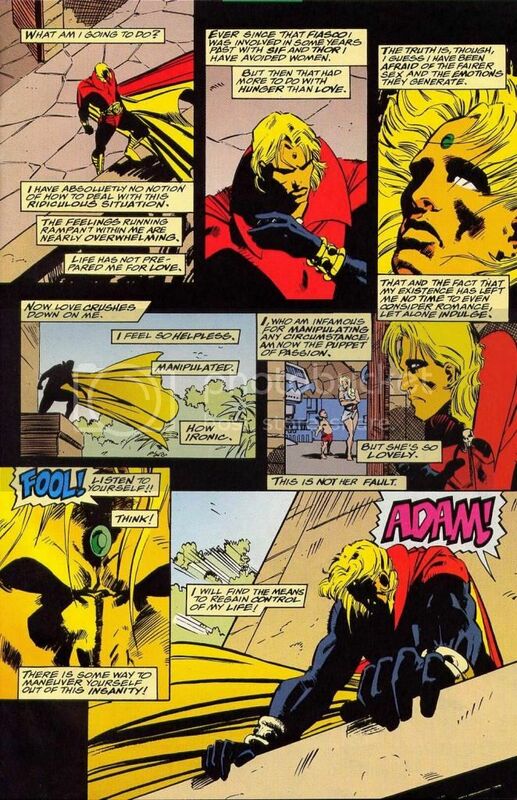 - Rune stopped time before attacking Adam to avoid any resistance, but Adam still took him to the soul world and engaged him until the soul gem itself betrayed Adam. 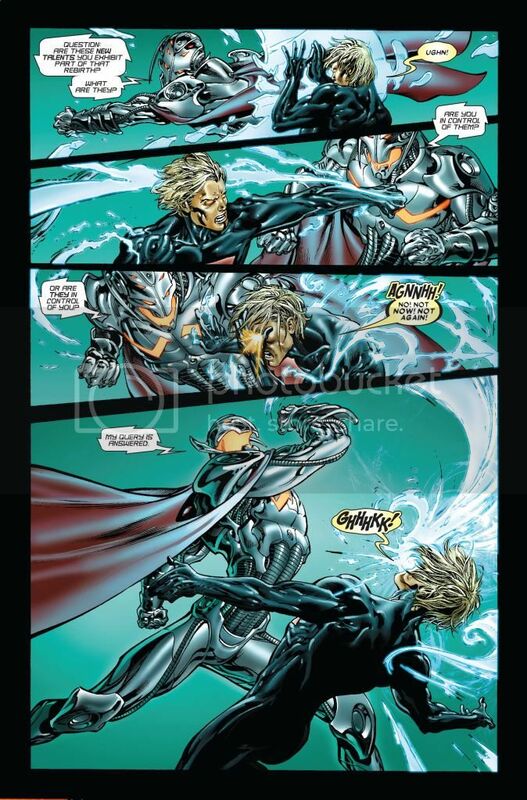 - Defeats Magus in the soul world in hand to hand combat. 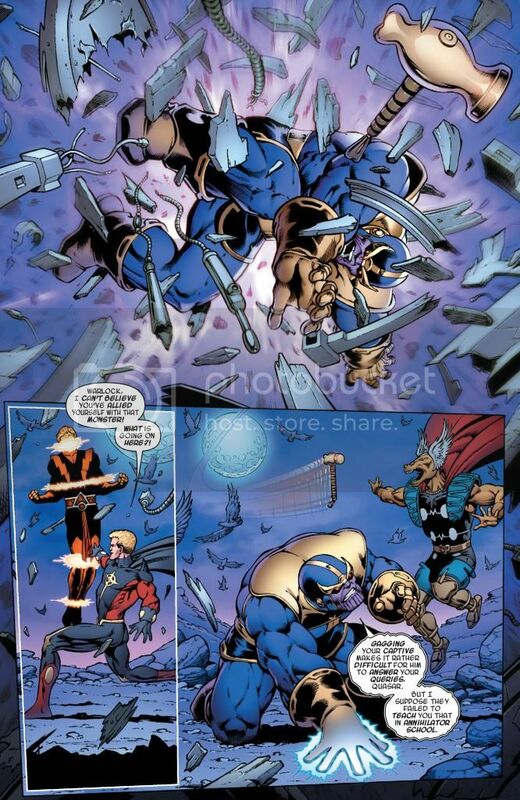 - Is completely outmatched by the future version of himself who he is destined to soon become. 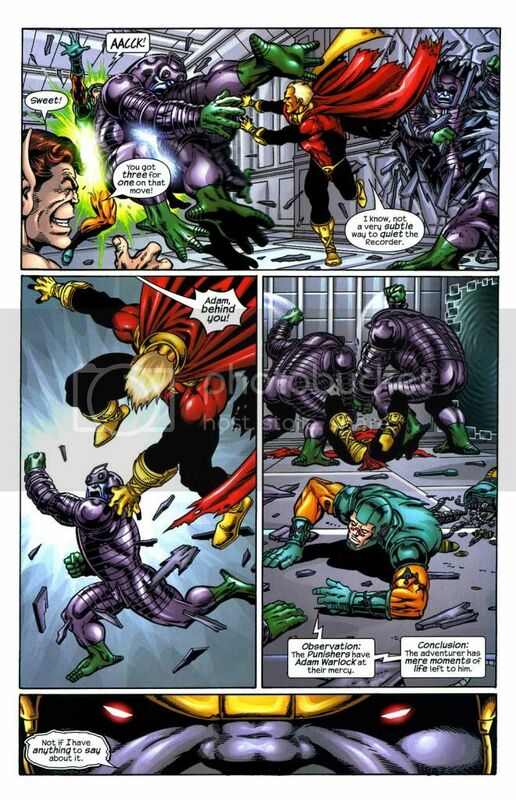 - Magus takes down Kang the Conqueror. 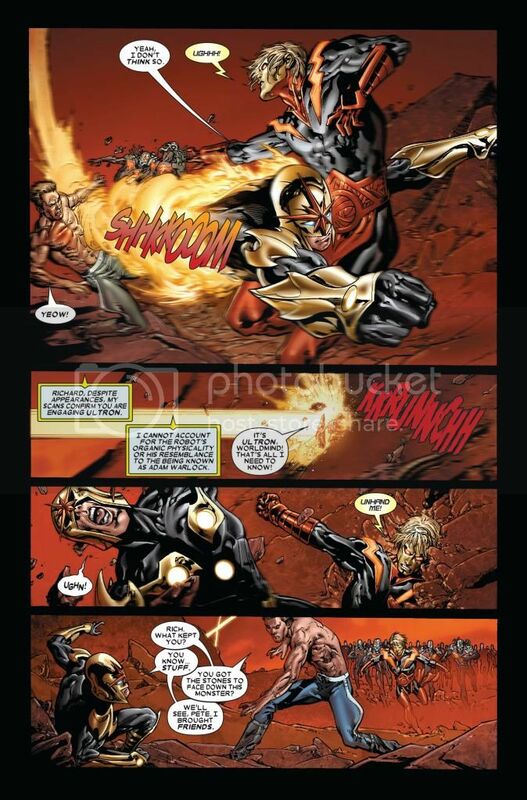 - Punishers are rated to be class 100 in strength. 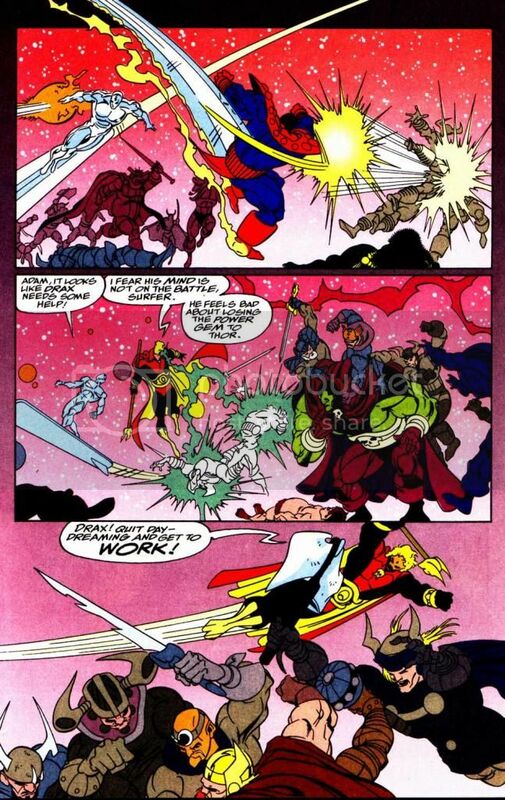 Warlock defeats multiple Punishers before succumbing to their numbers. 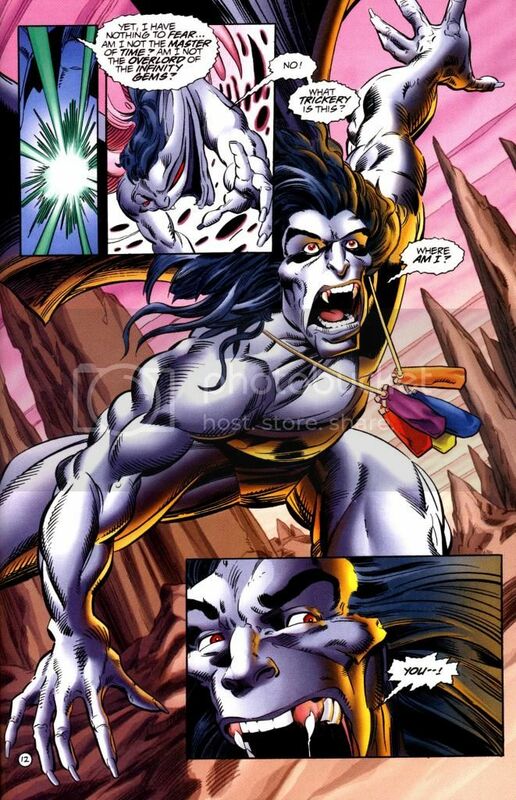 - Older brother of Ulik the troll. 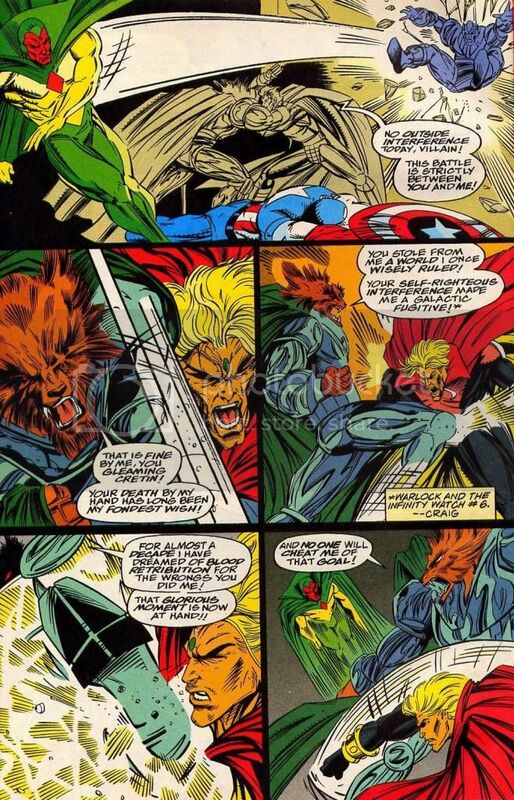 - Drives off Man-Beast and his lackeys. 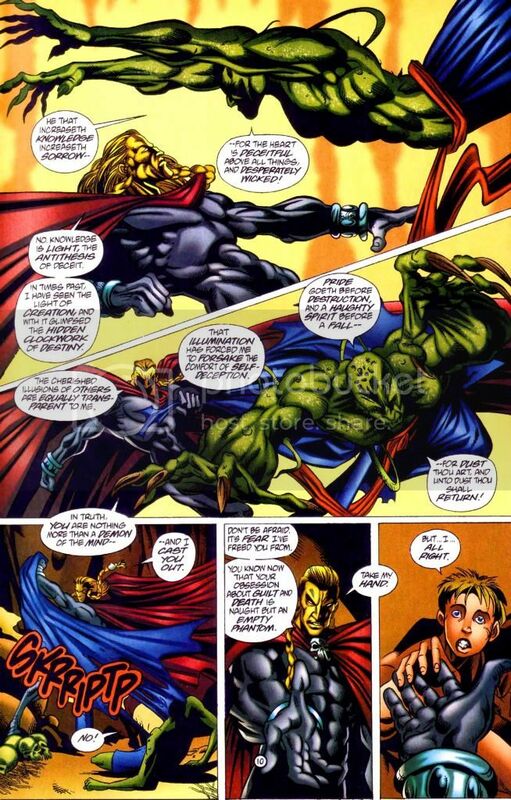 - Overpowers the Man-Beast and devolves him. 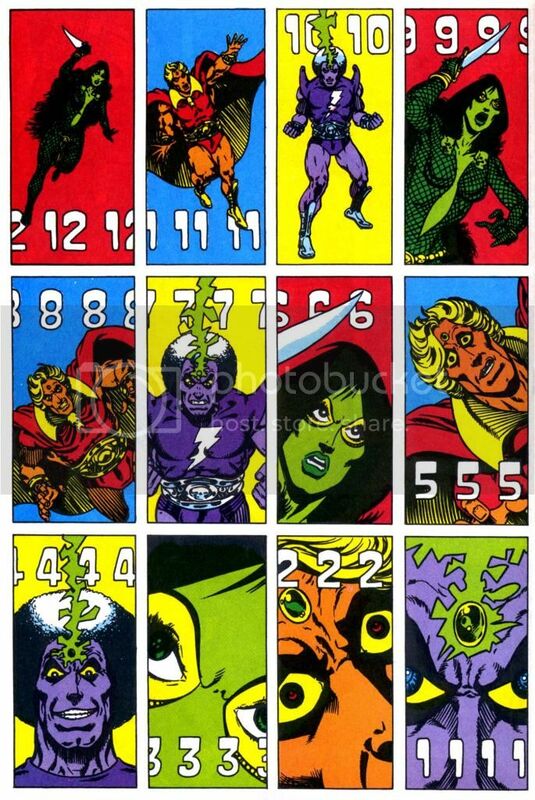 - Easily devolves them all. 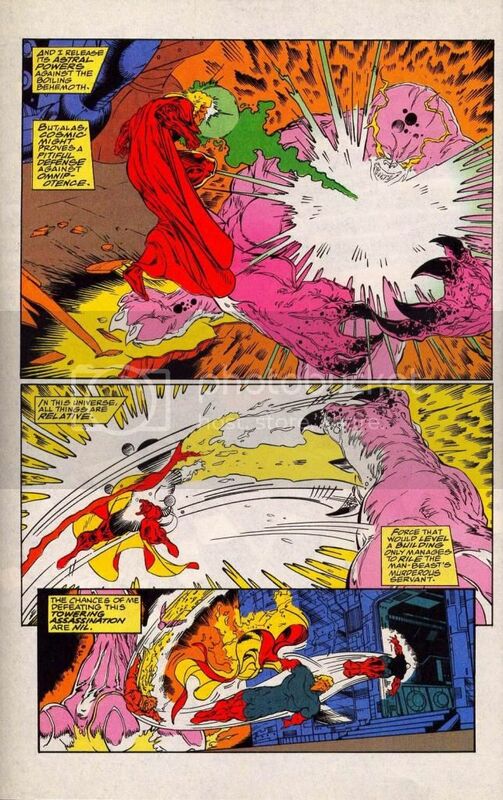 - Defeats Triax with a karmic blast and then defeats Man-Beast in hand to hand combat. 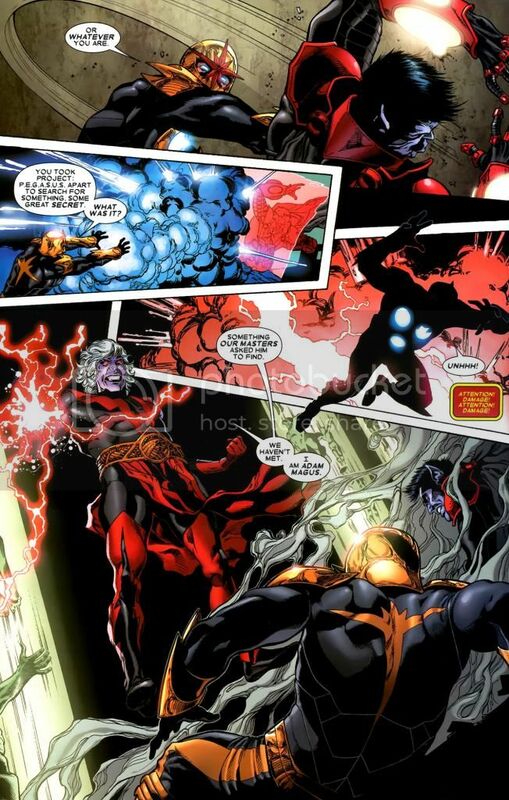 - Defeats armored Triax in hand to hand combat. 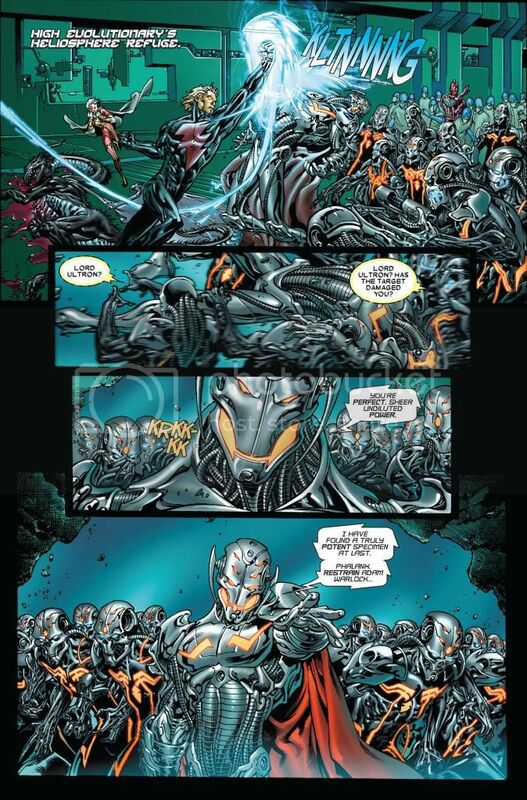 - 25 000 of superhumanly enhanced soldiers. 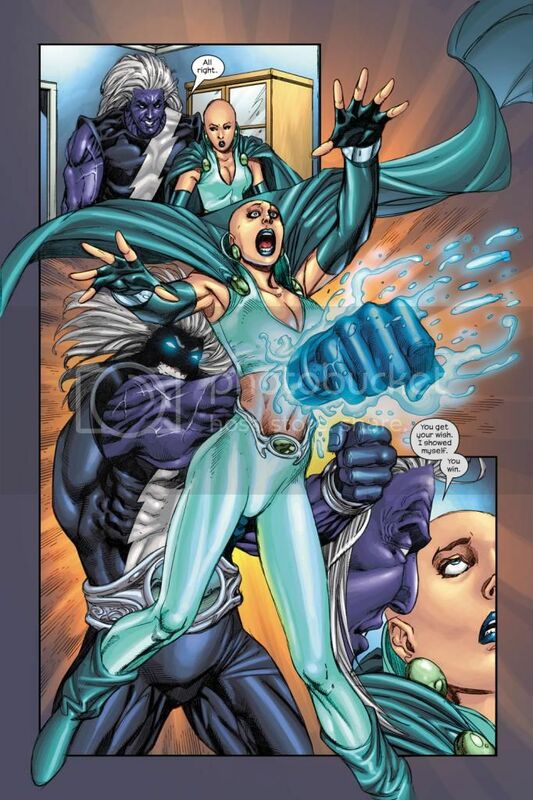 - Rigellians can enhance their strength level to class 100. 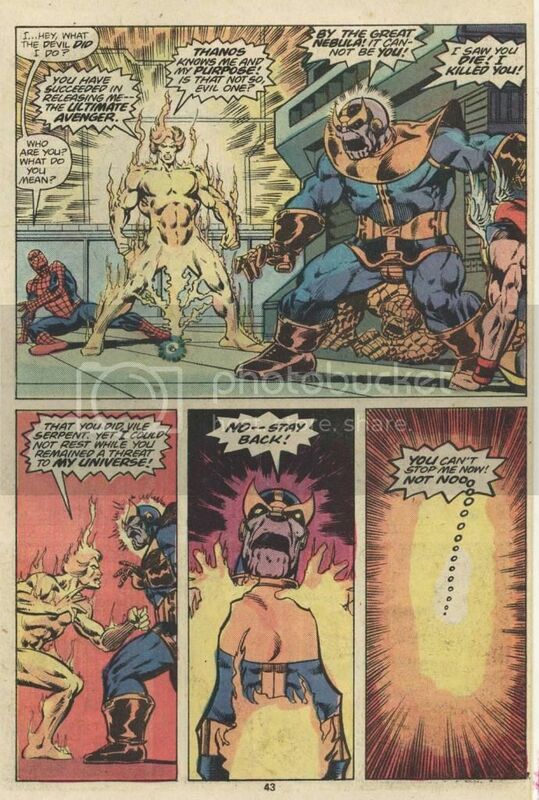 Let me know if any of the links don't work. 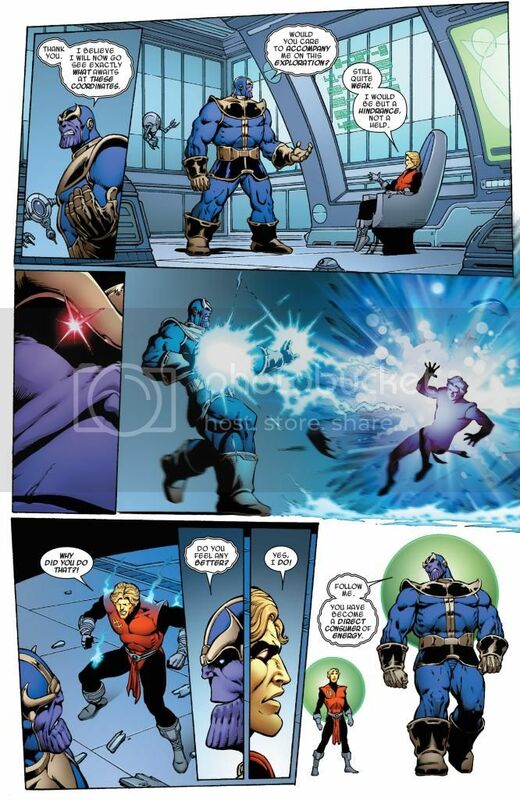 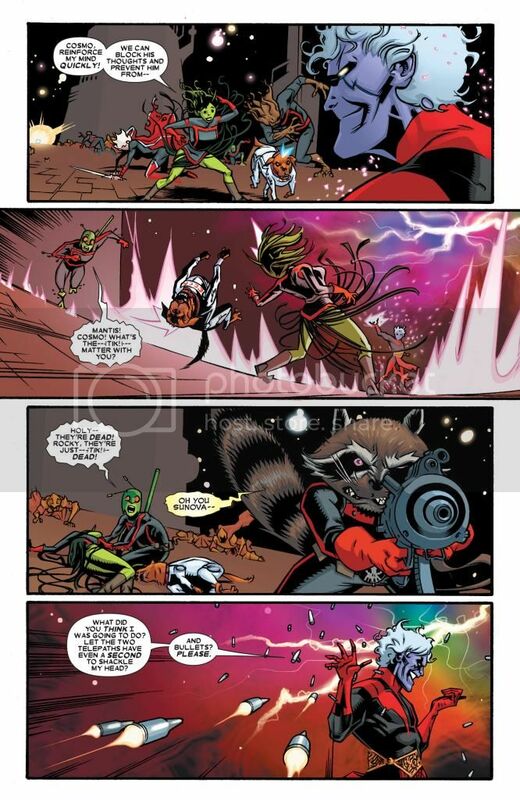 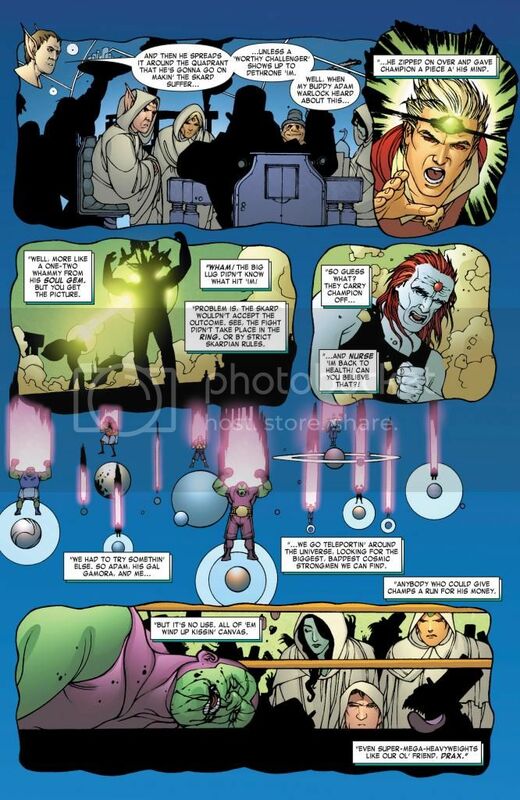 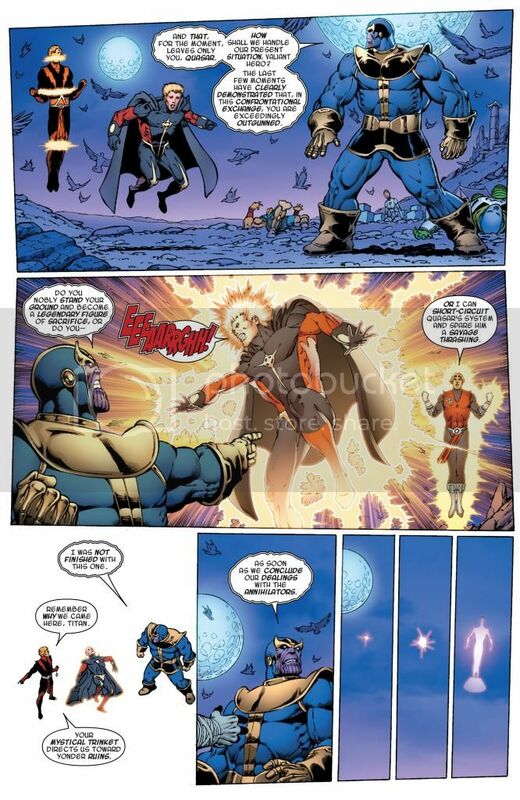 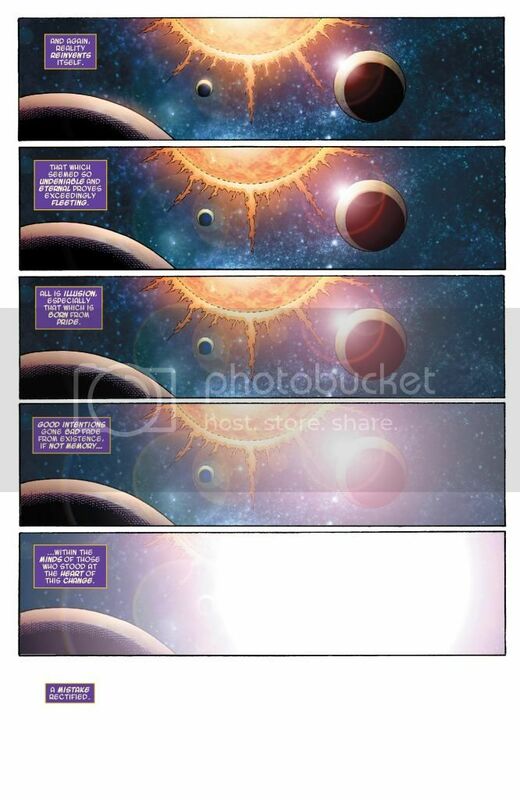 Some stuff from the new Thanos: Infinity Relativity Graphic Novel. 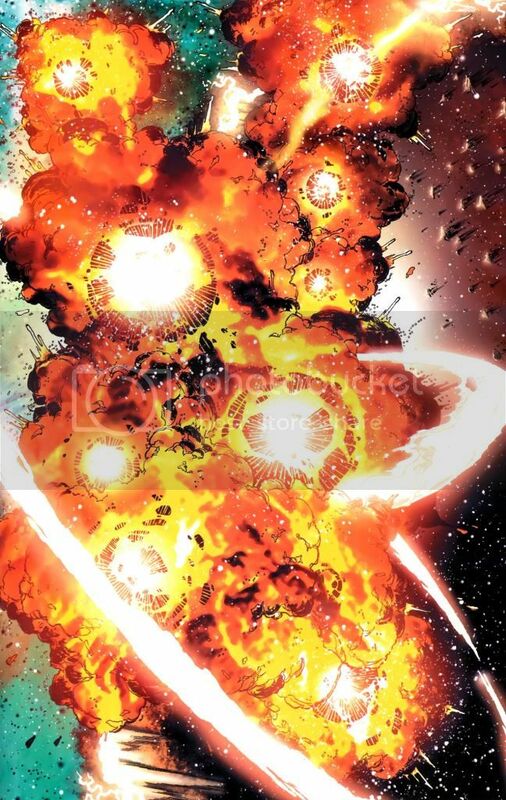 Easily destroys a giant fleet. 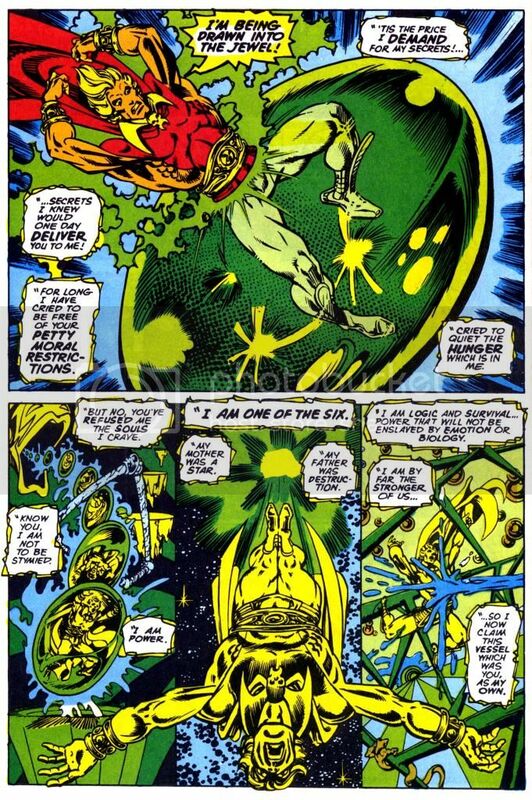 It is then revealed that after Adam killed his alternate self (who was the supreme being of that reality), he now houses the energies of an entire universe and is now as powerful as Infinity and Eternity combined with the potential to be the Living Tribunal's equal. 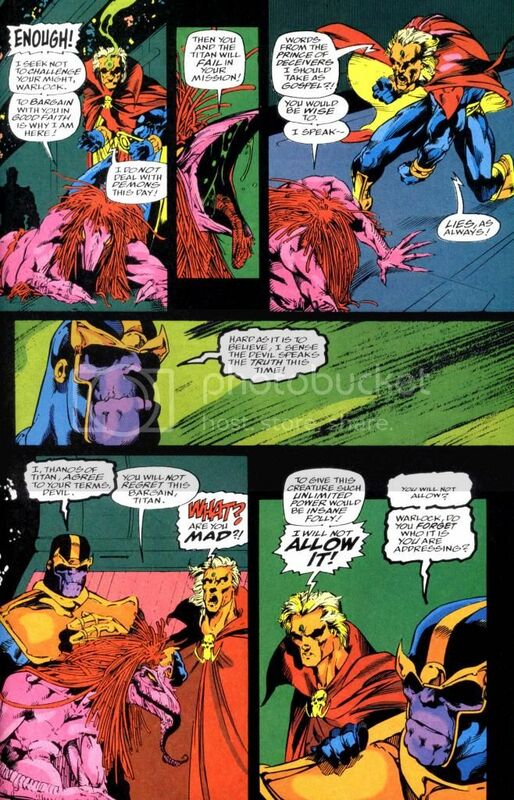 Thanos says Warlock could destroy him with a thought. 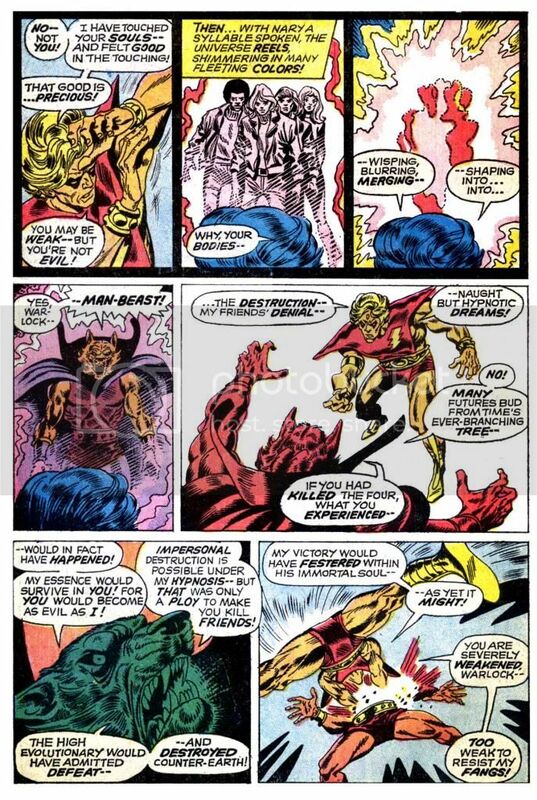 But his mind does not grasp the power within him and puts on himself the limitations as if he was the Adam of old. 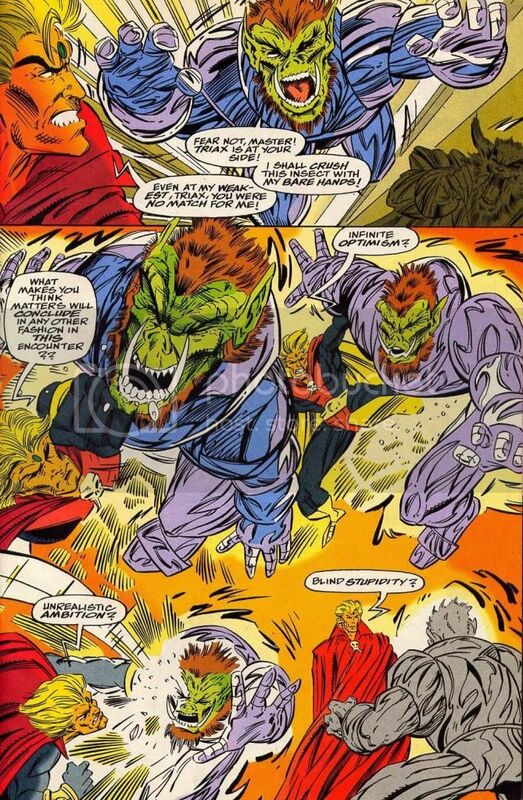 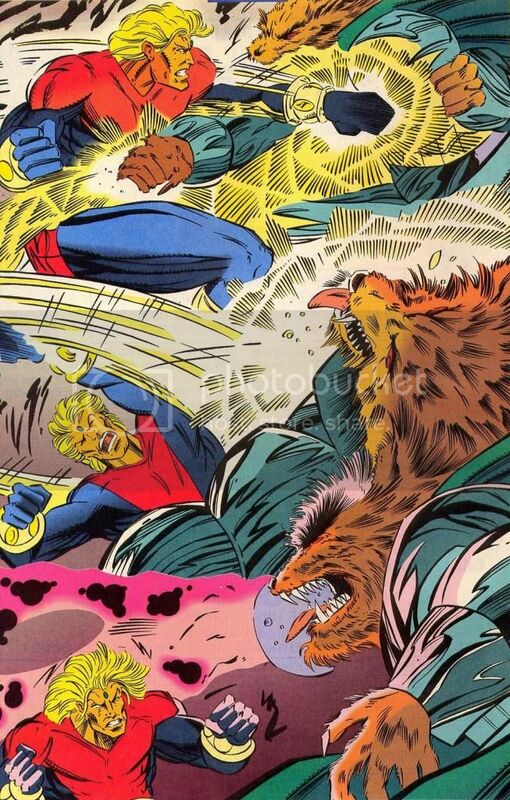 Therefore, he is similarly affected by Annihilus' and Blastaar's attacks just like the old Adam was. 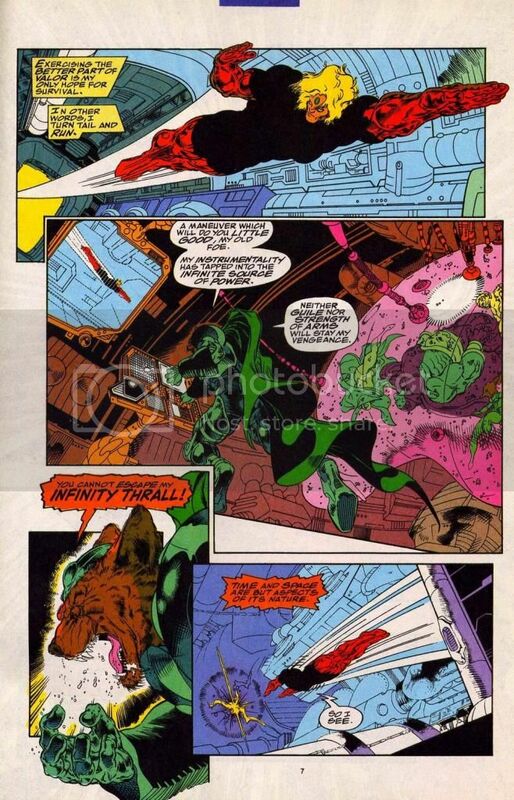 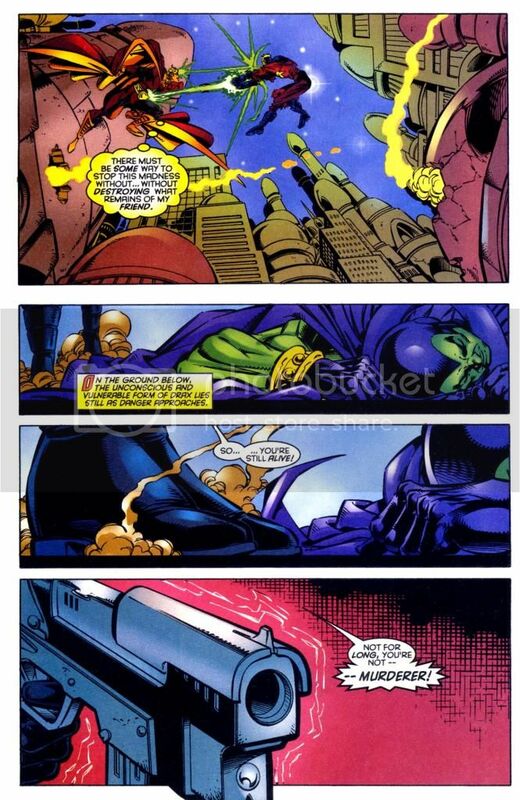 In the end, Annihilus starts tapping into the infinite power within Adam's body.